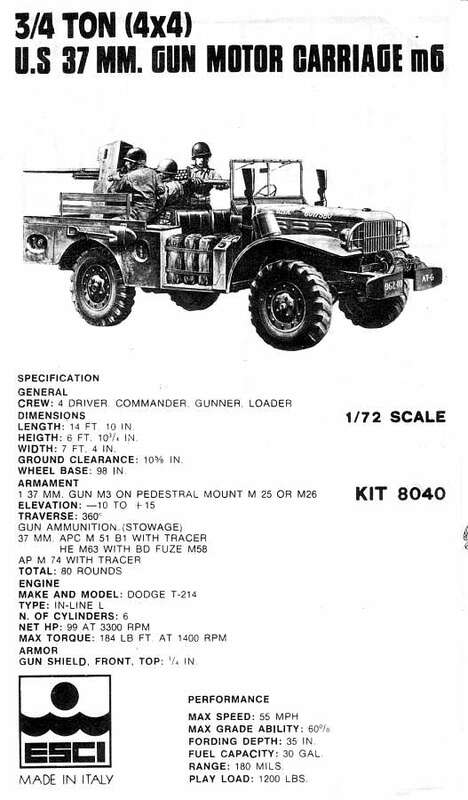 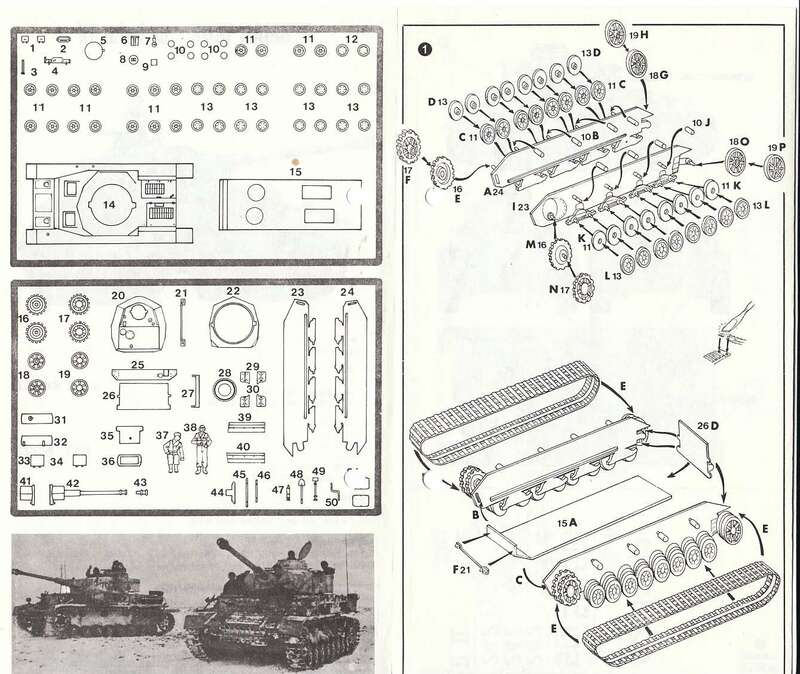 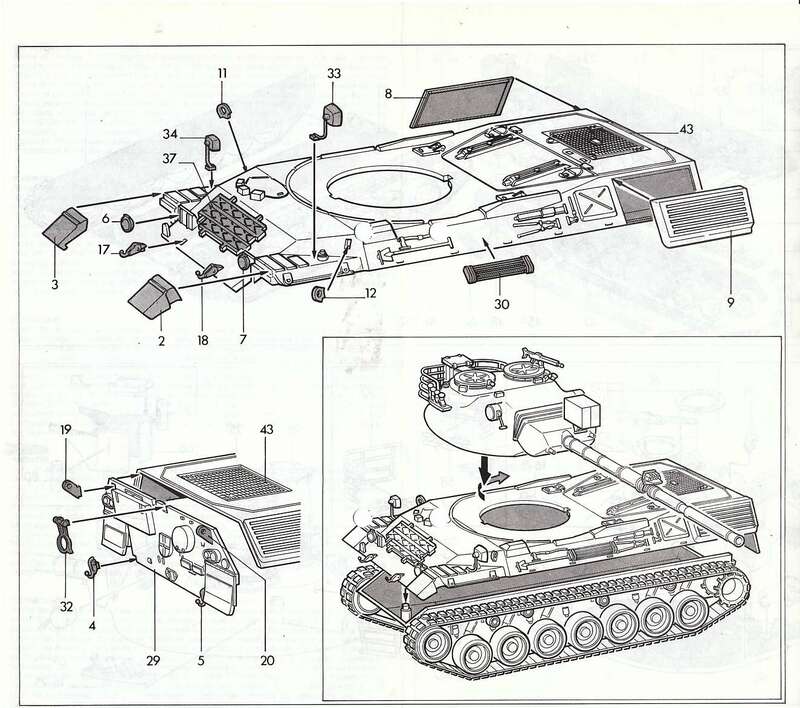 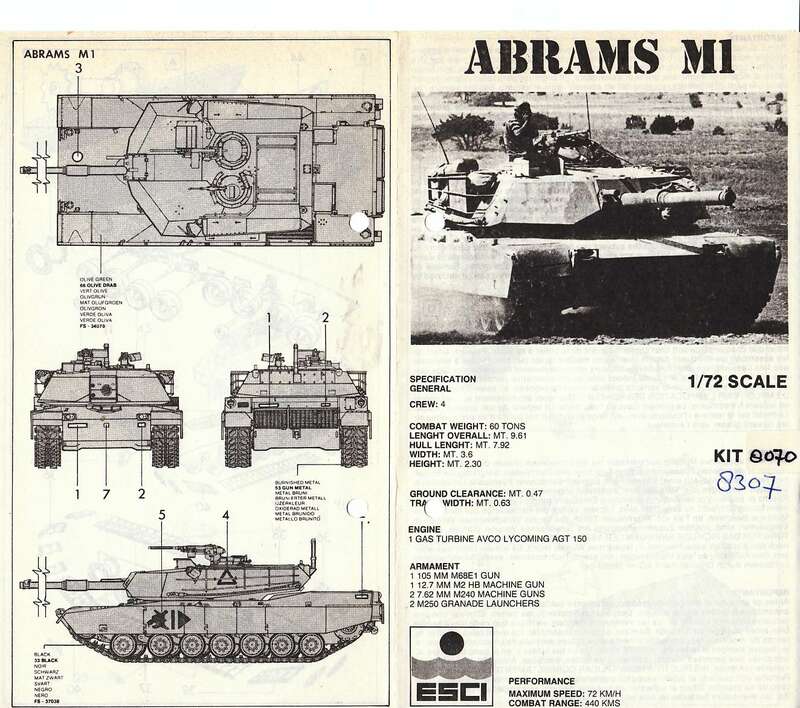 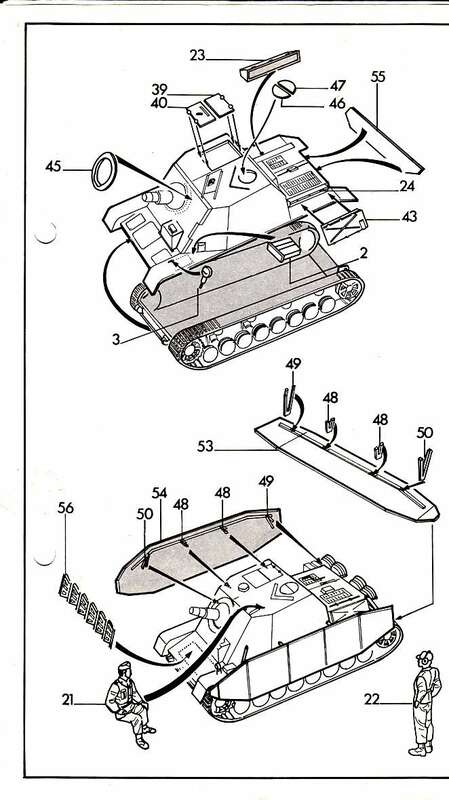 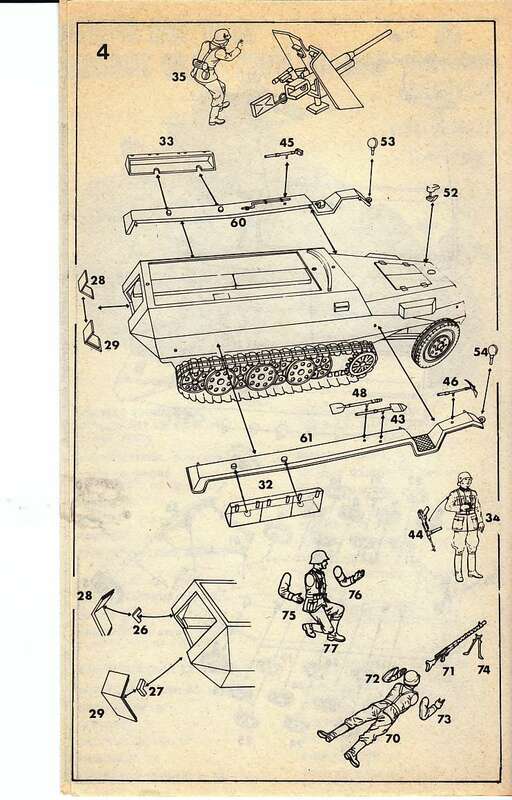 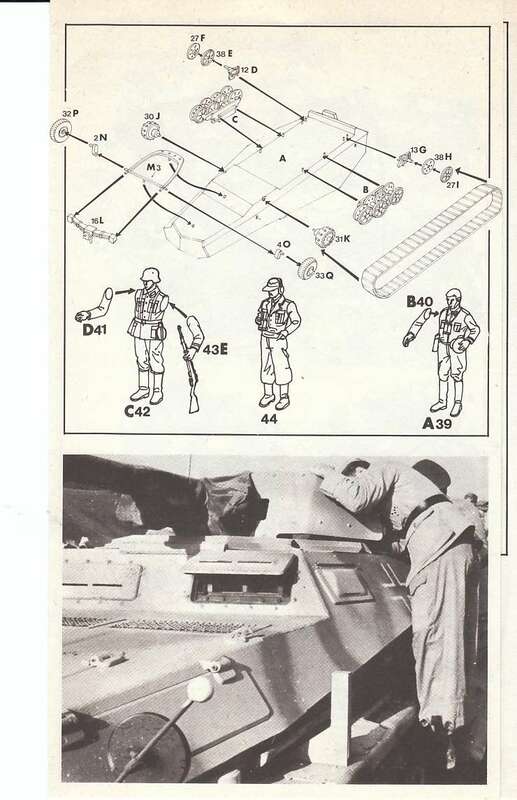 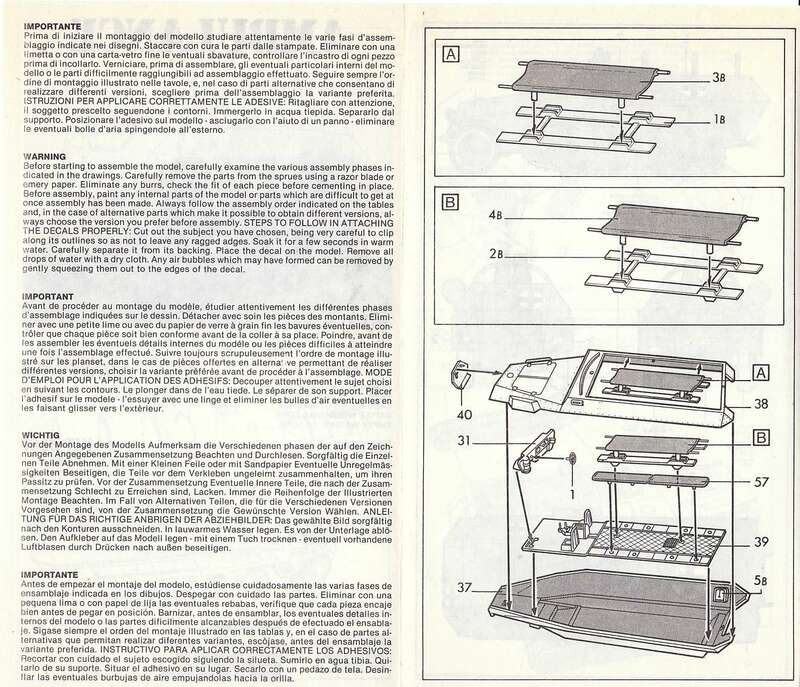 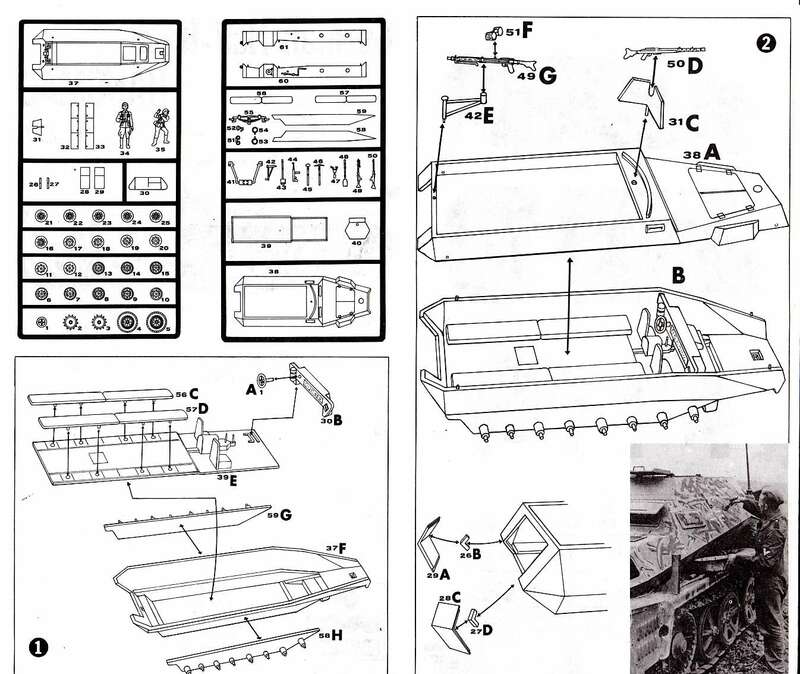 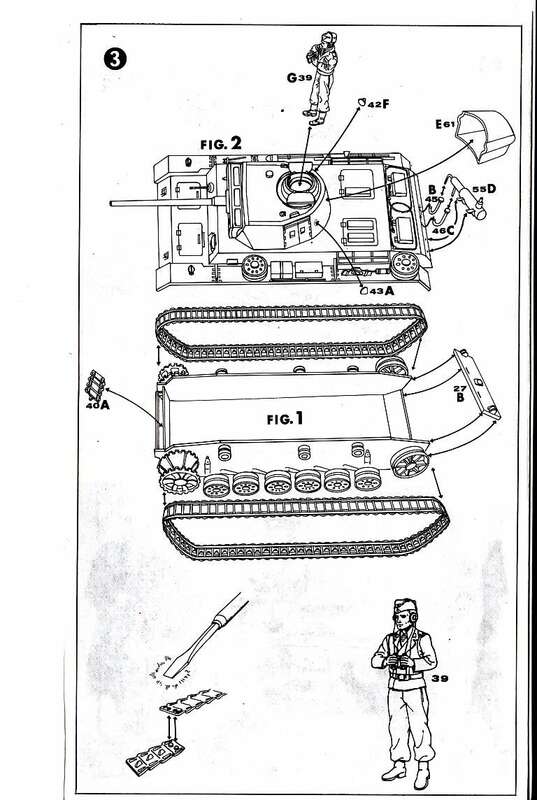 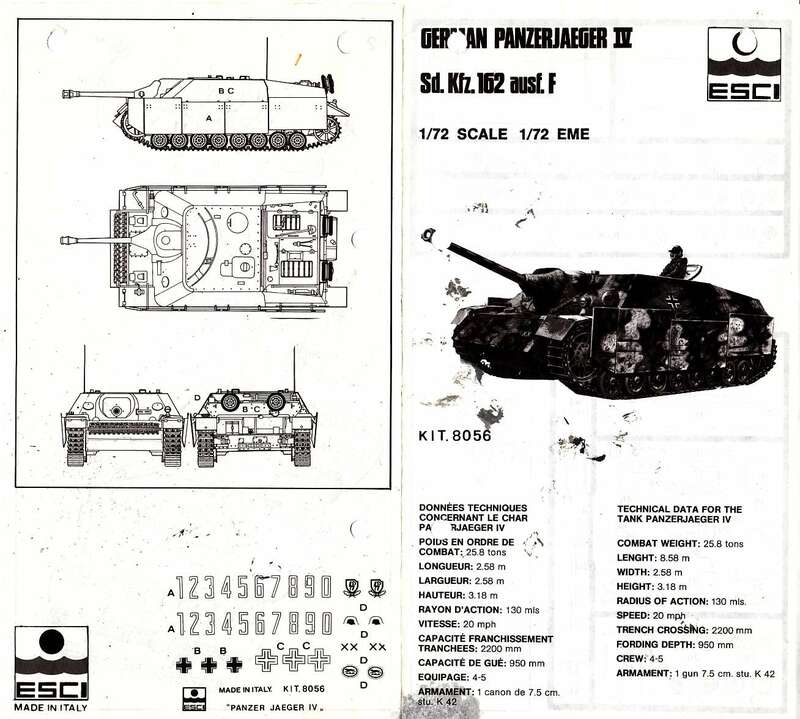 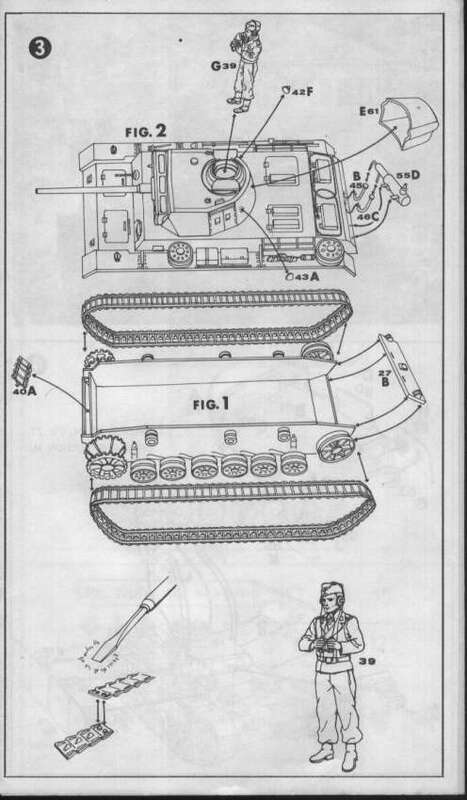 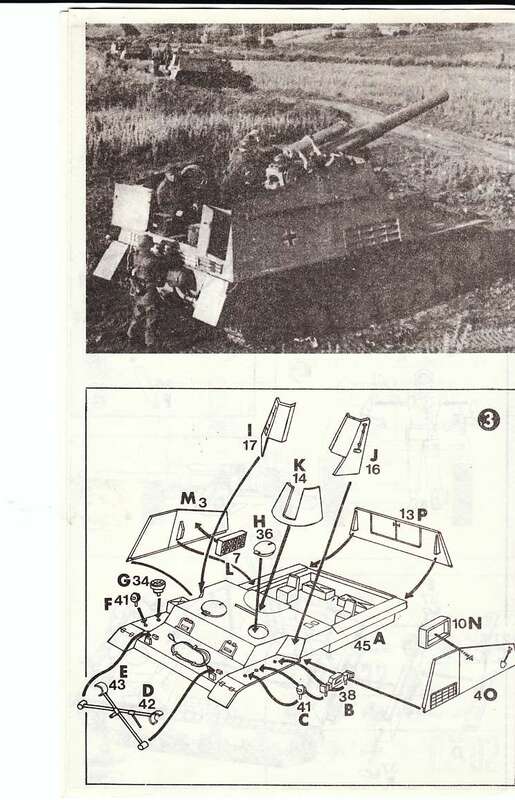 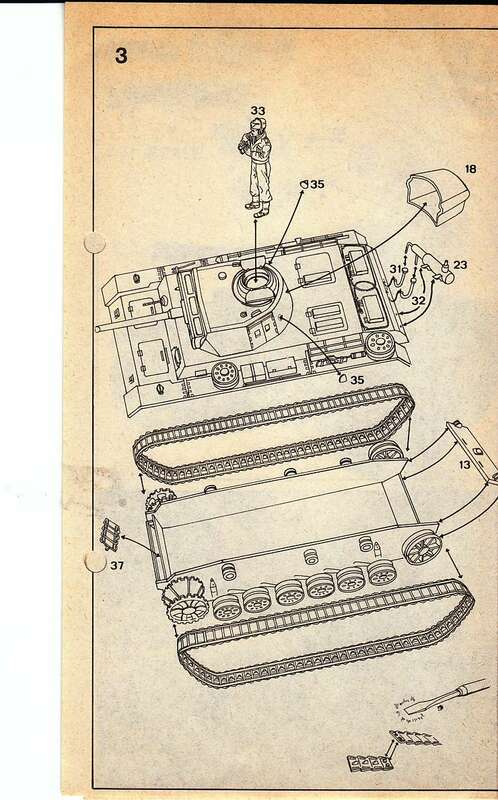 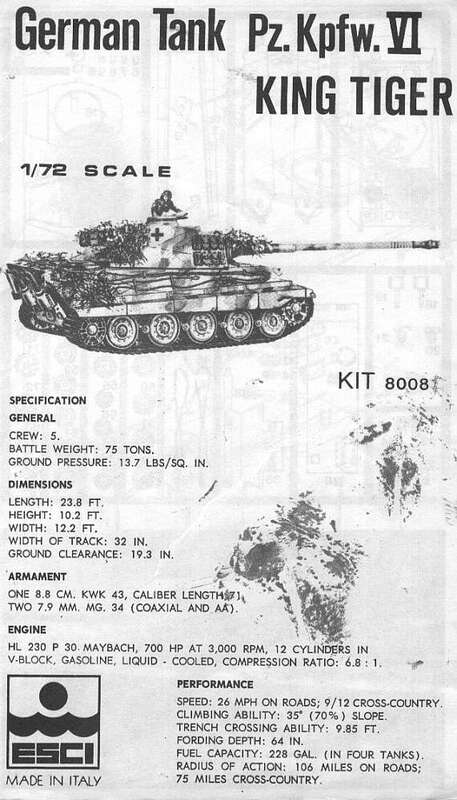 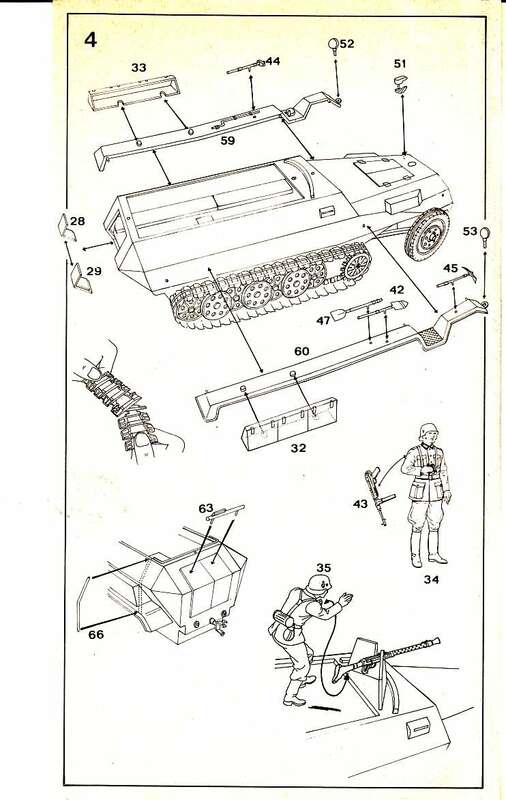 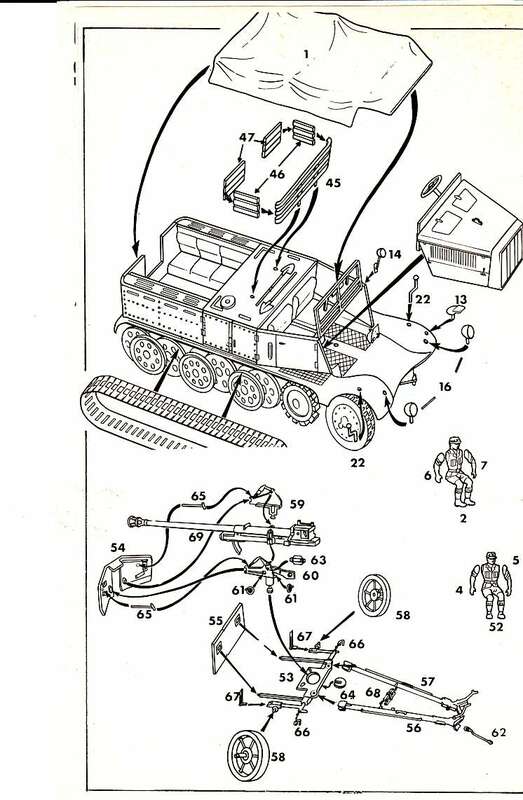 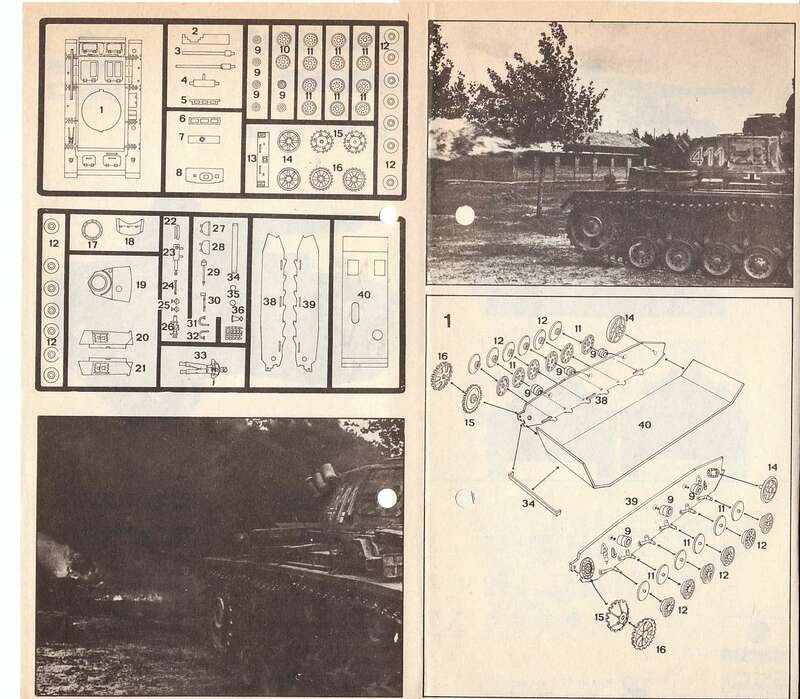 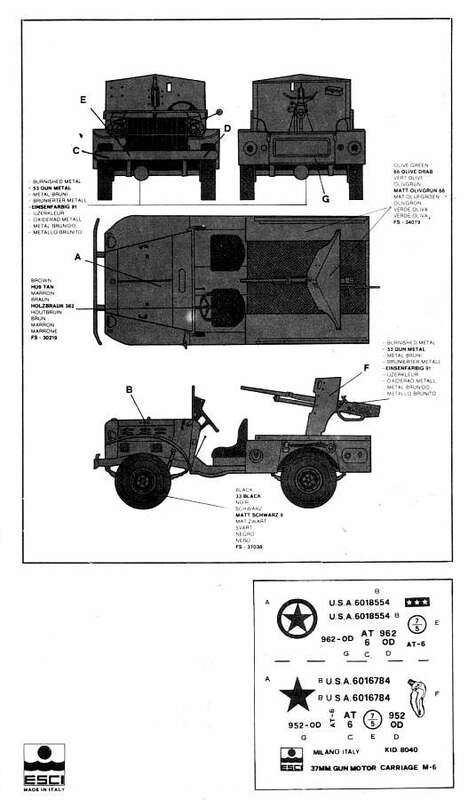 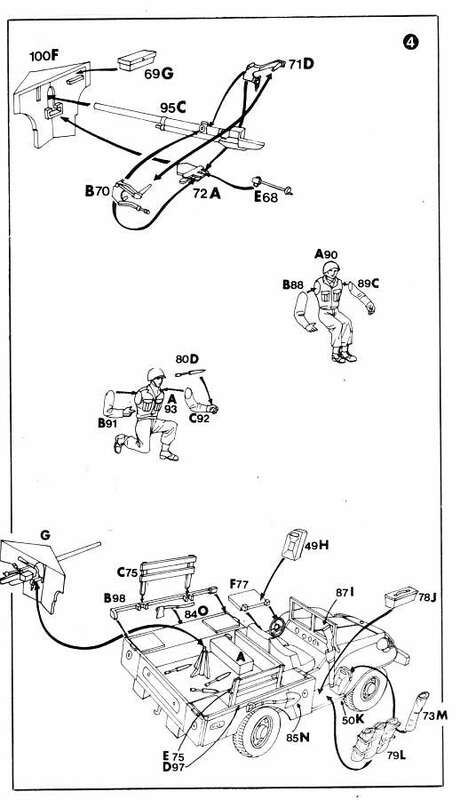 The Esci Whitebox 8000 series (1974 - 1978) To make things a little complicated the Esci Armor white box 8000 series and the Polistil variants should be seen as seperate series. 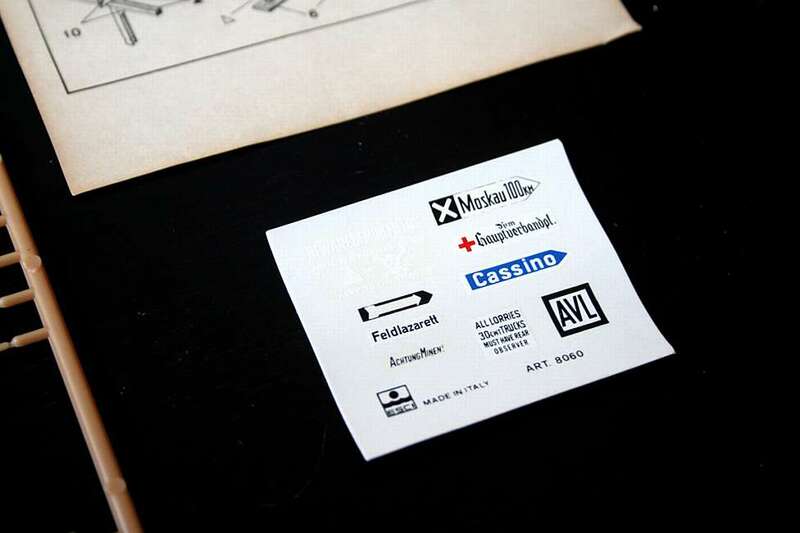 They ran parallel to eachother but the ones with the Polistil prints and/or stickers were produced mainly for France. 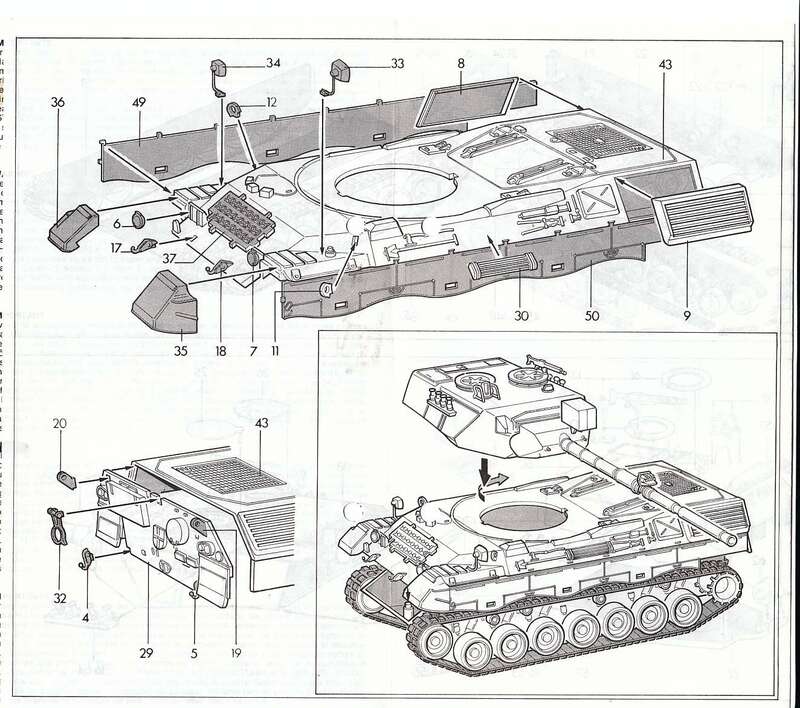 The Polistil issues will be discussed in another part. 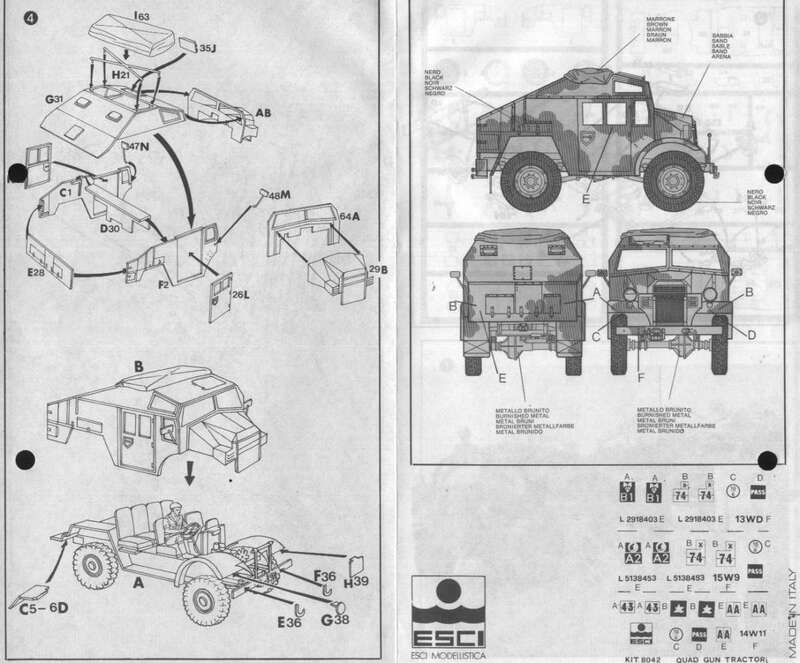 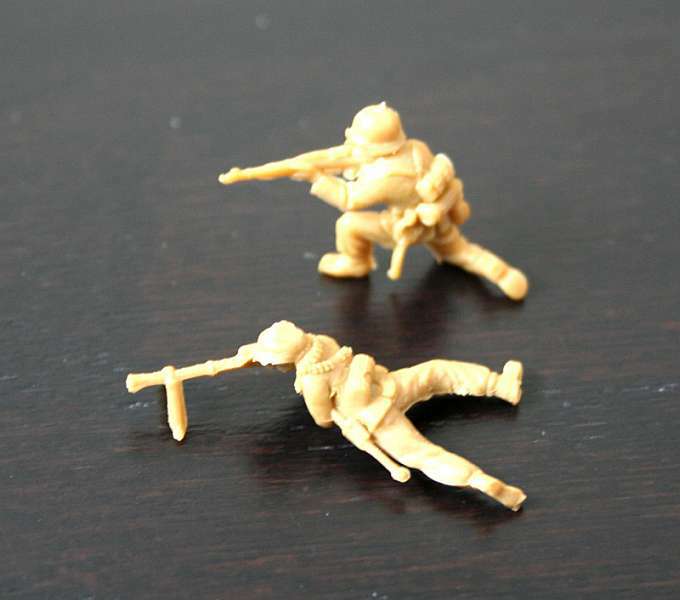 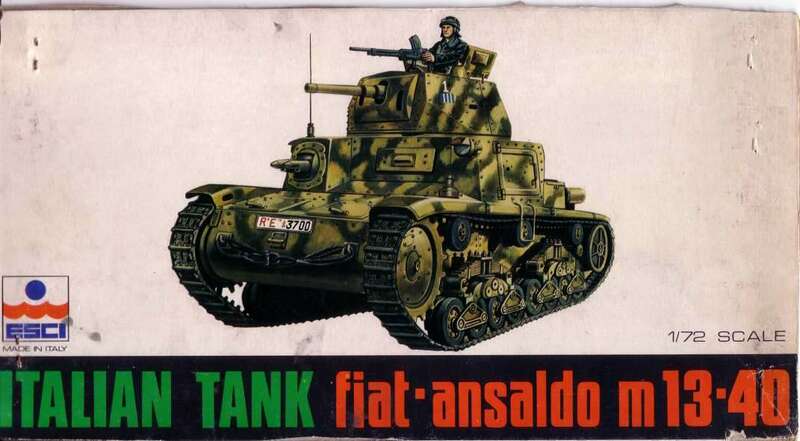 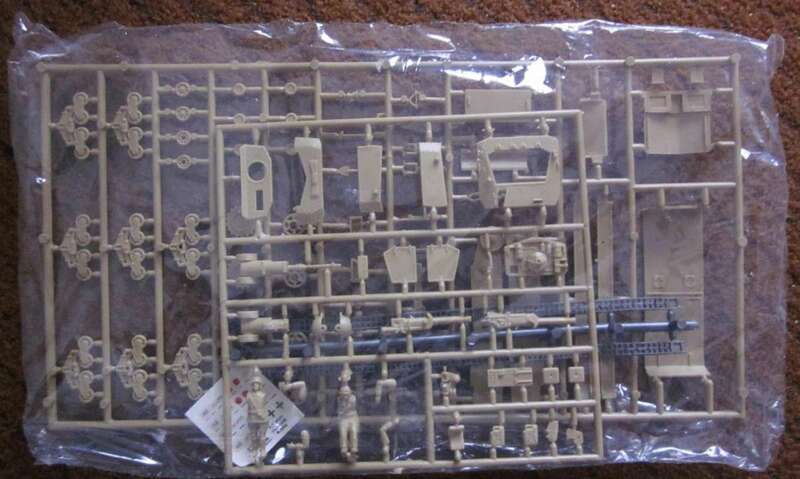 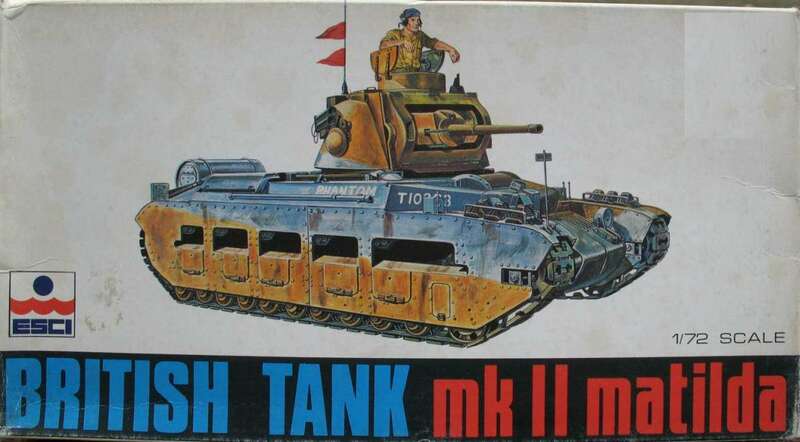 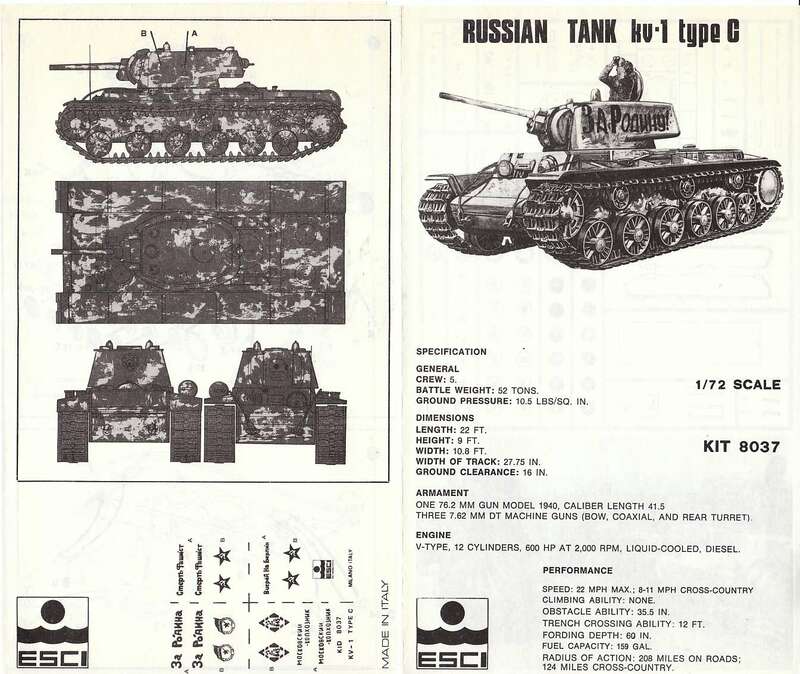 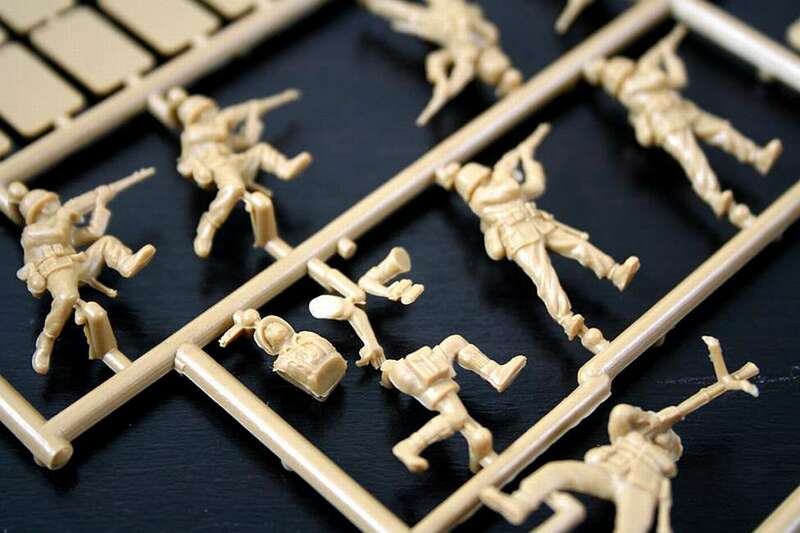 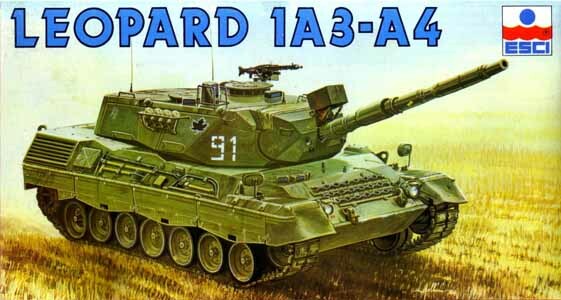 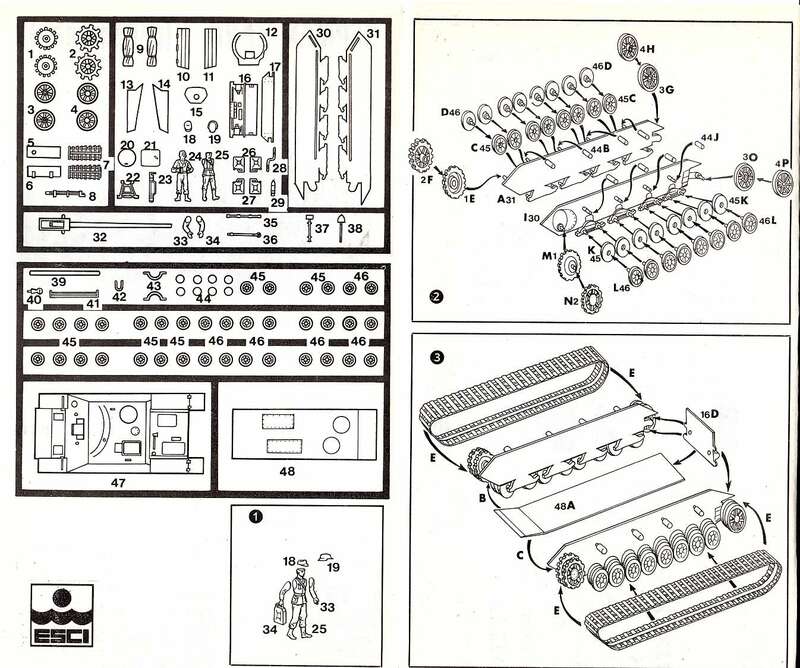 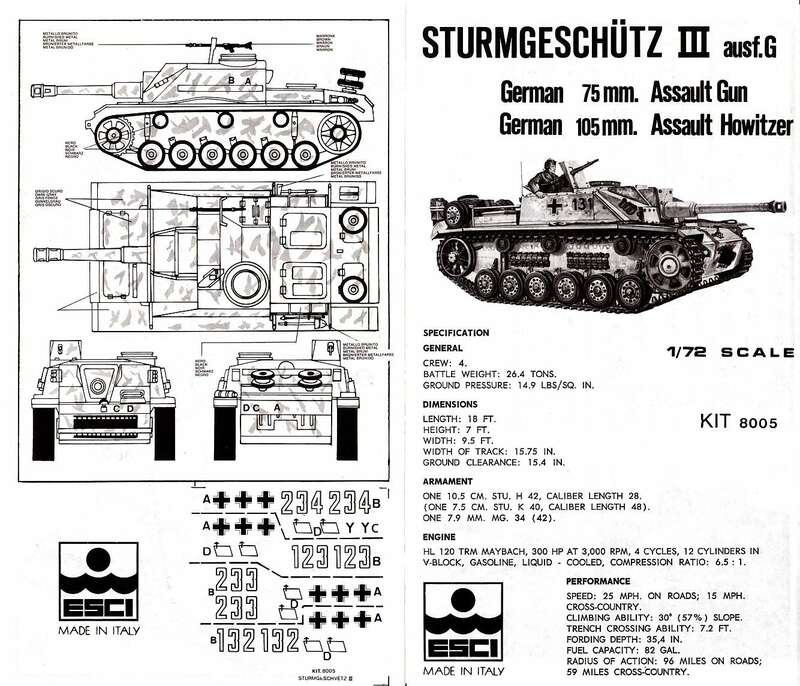 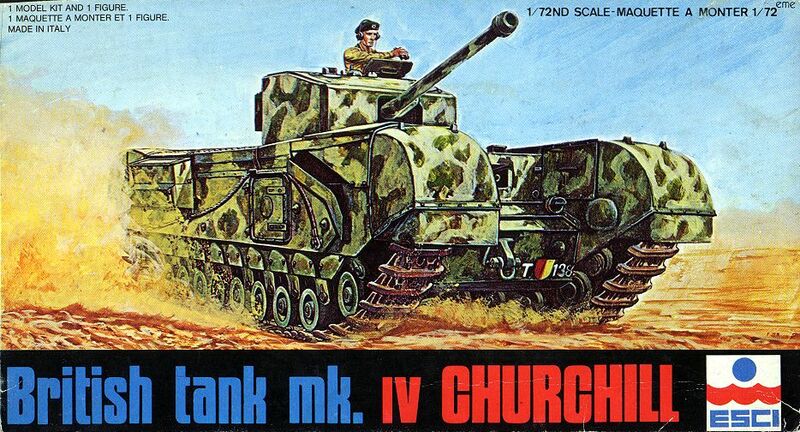 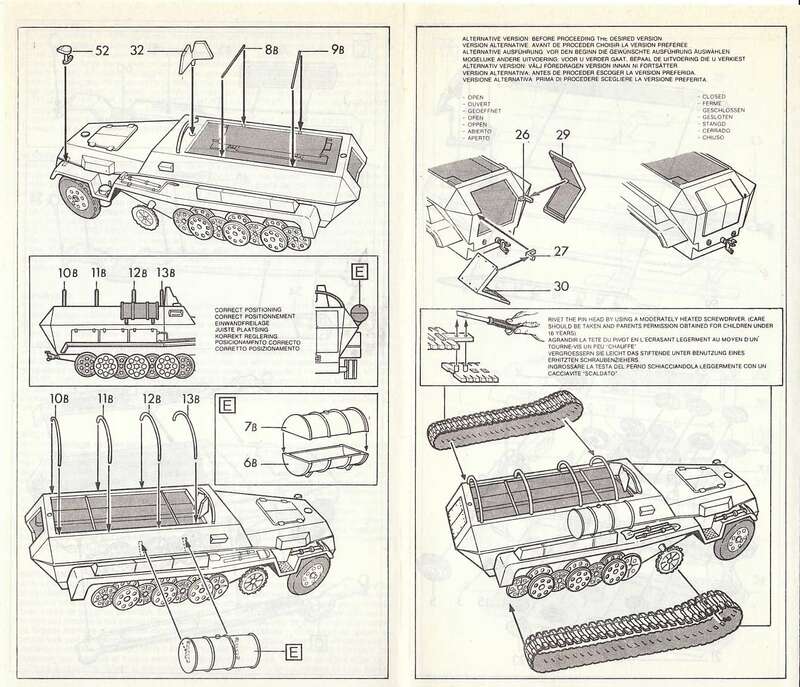 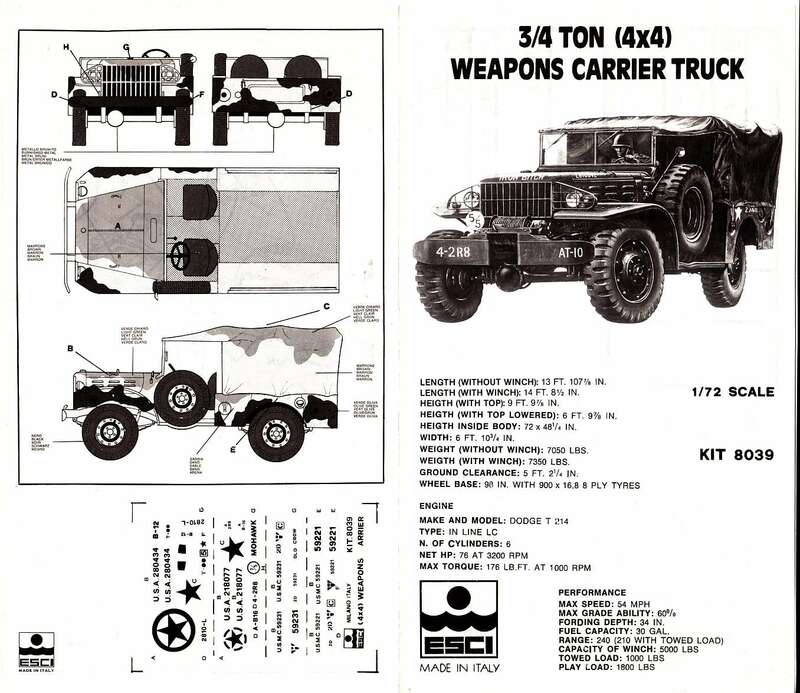 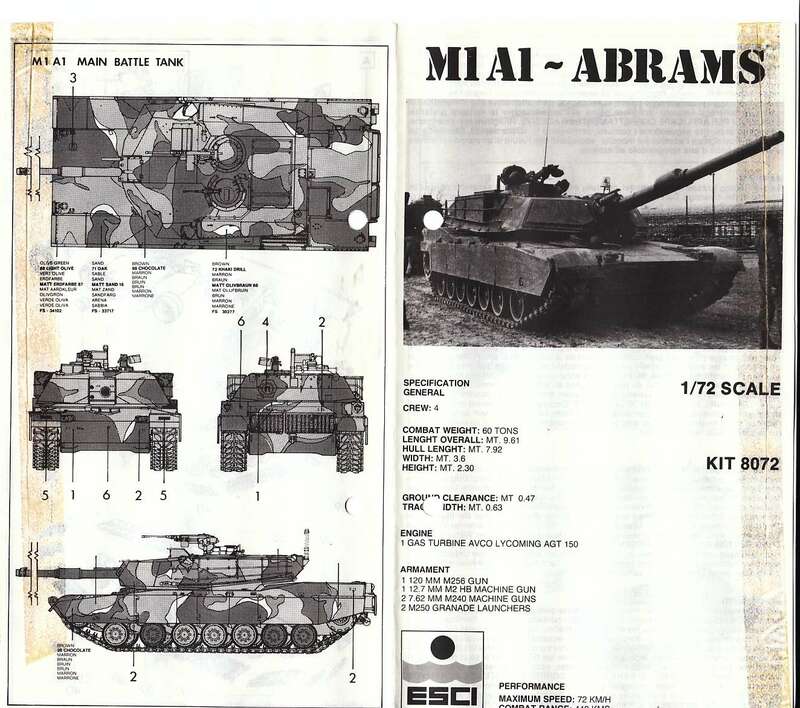 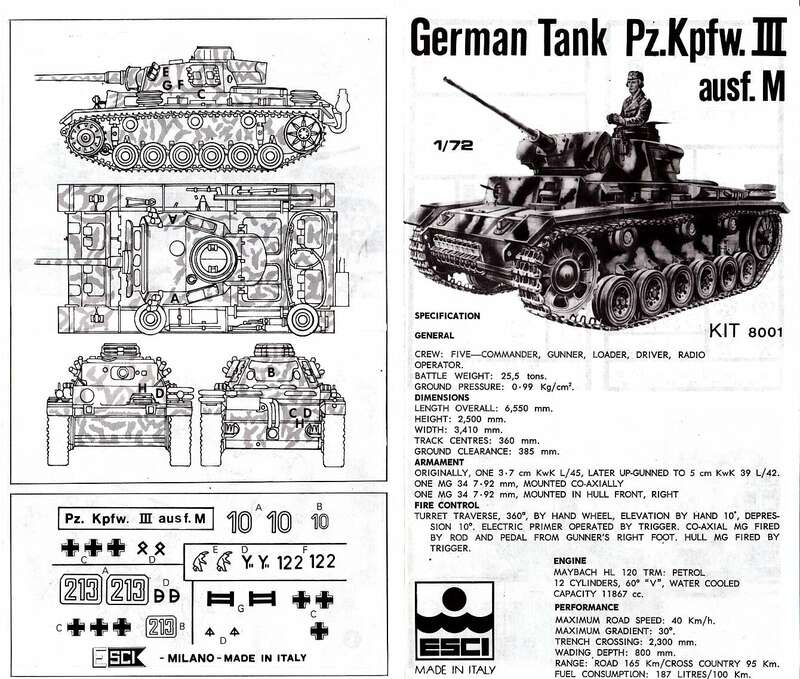 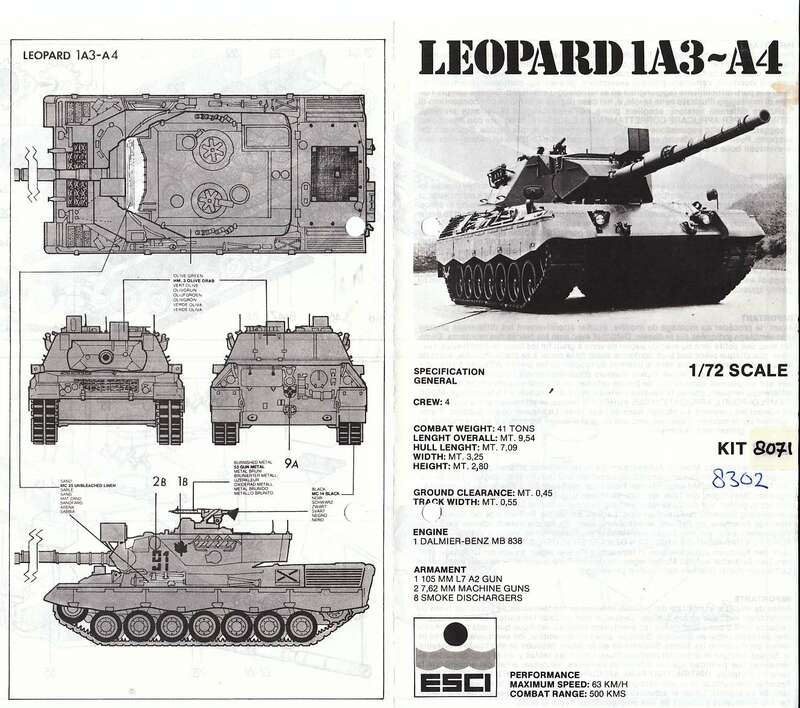 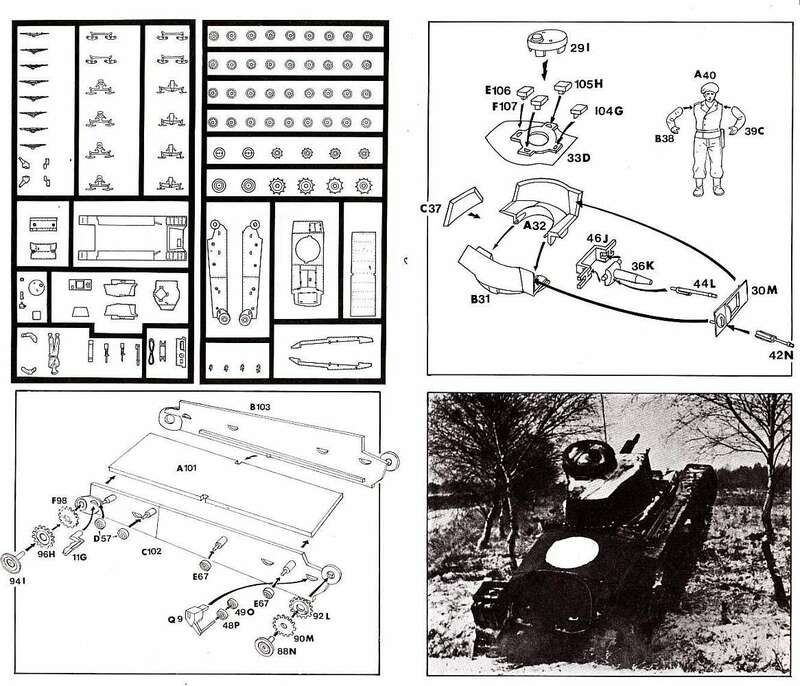 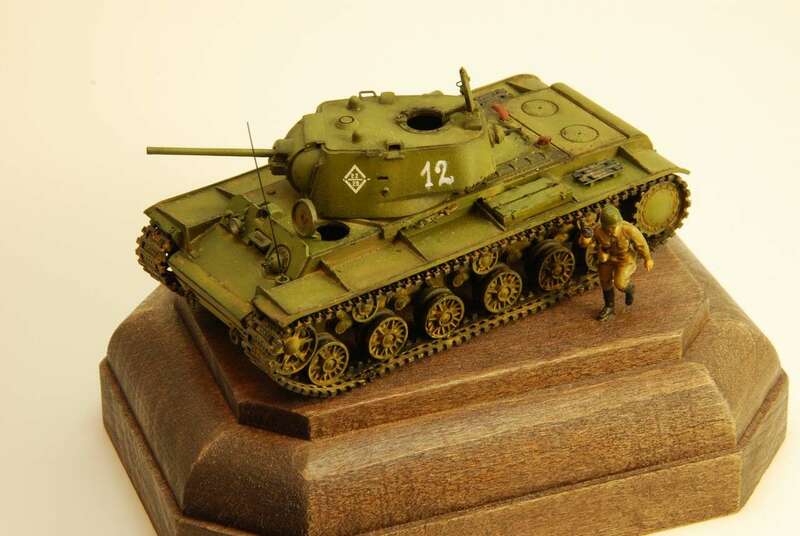 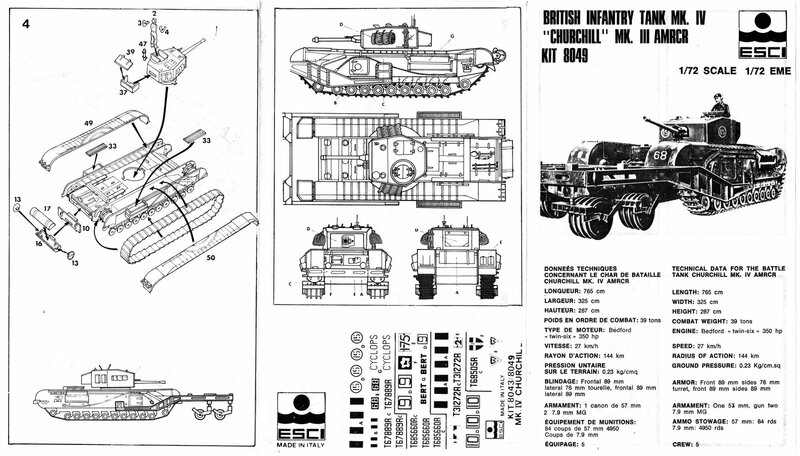 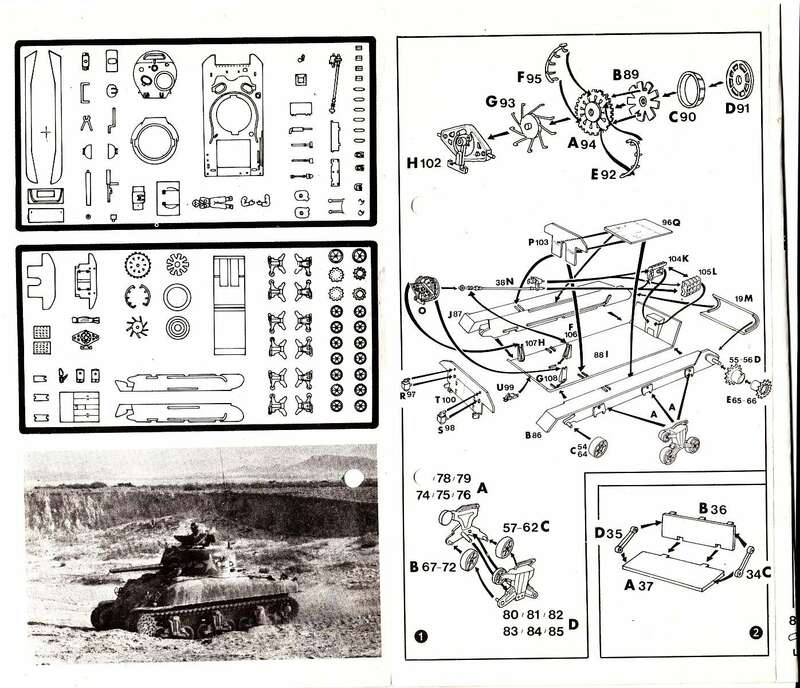 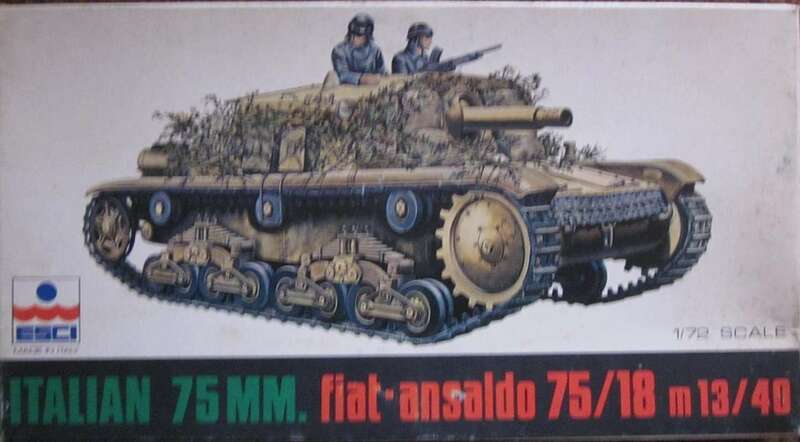 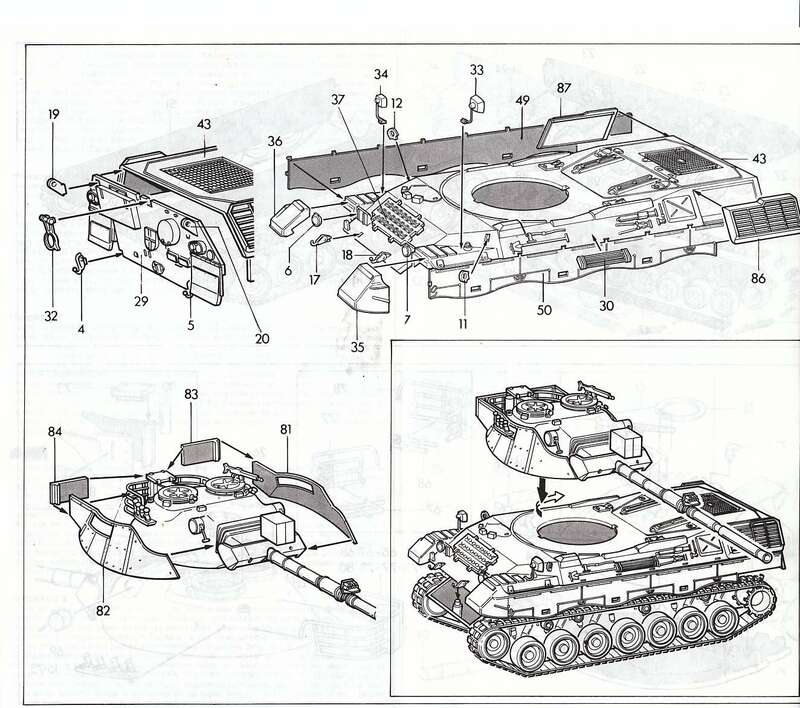 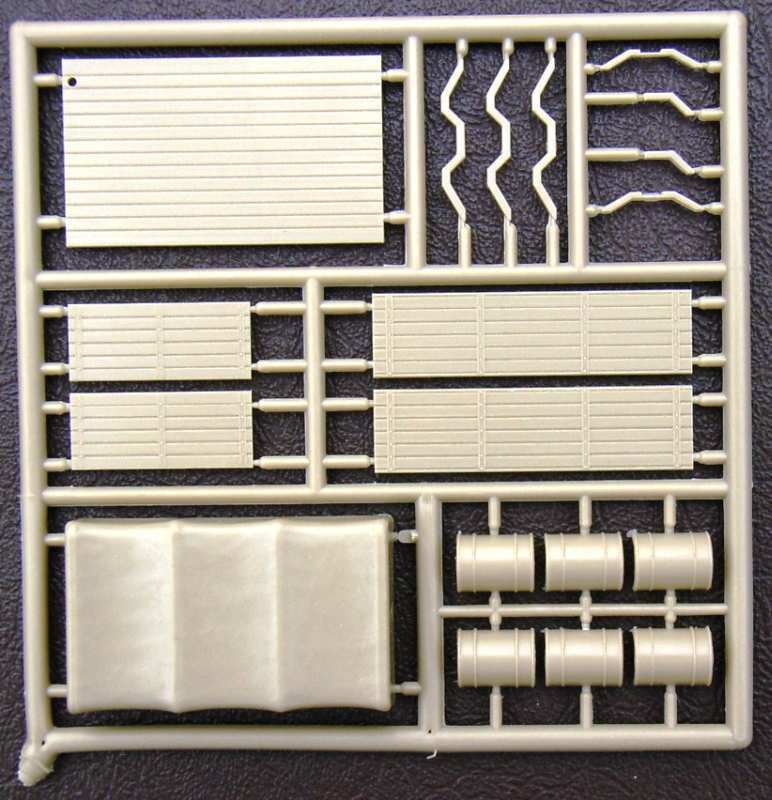 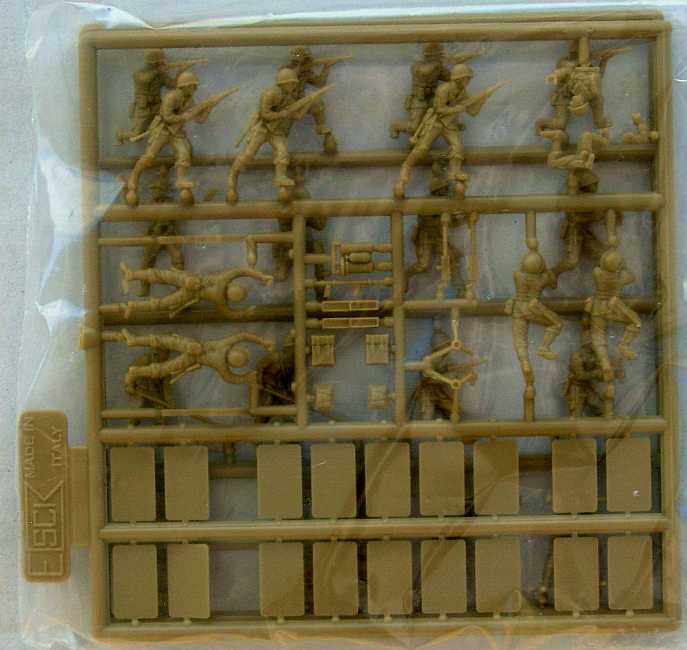 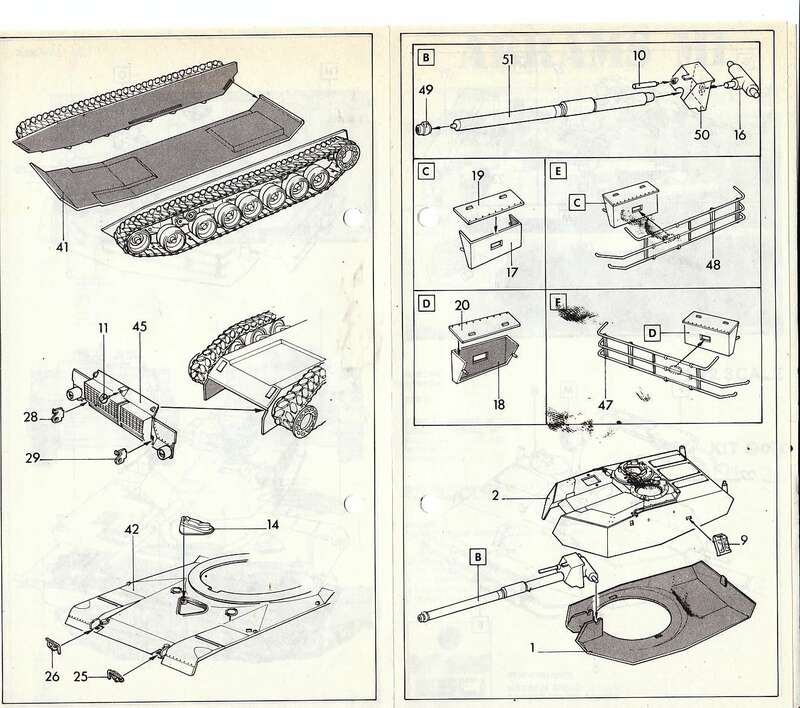 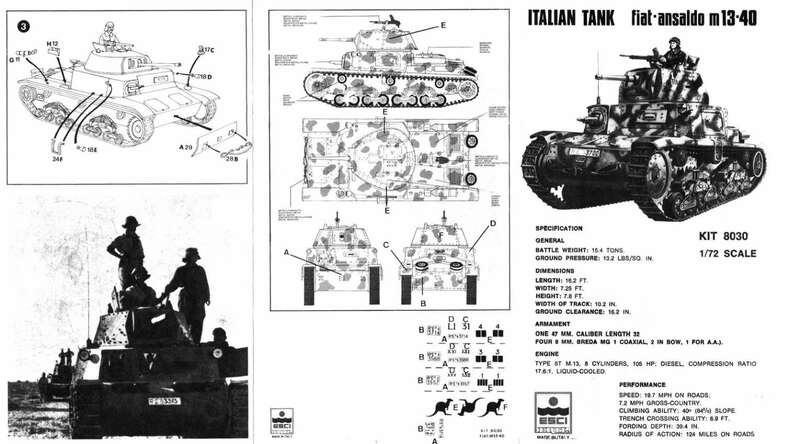 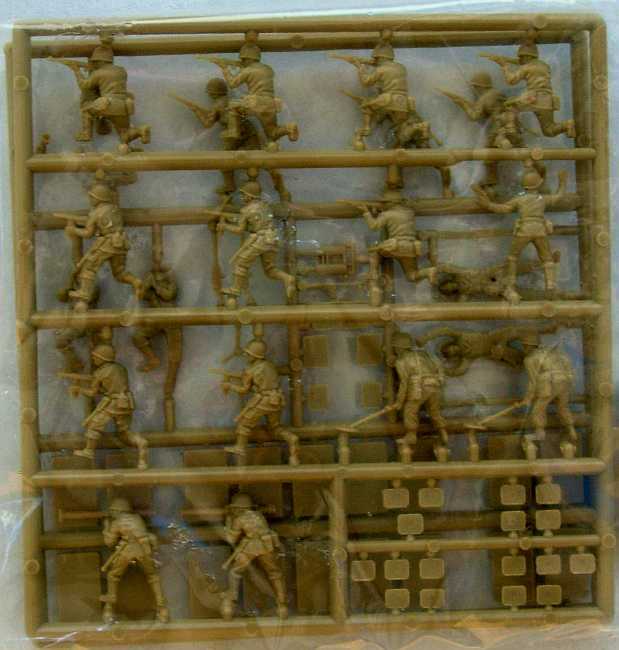 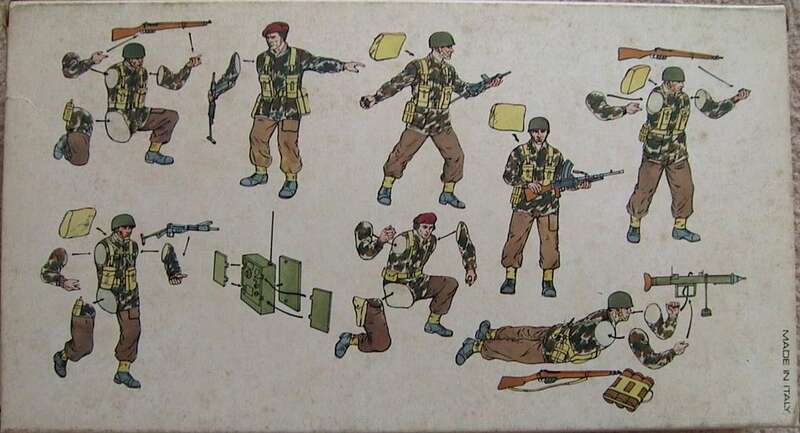 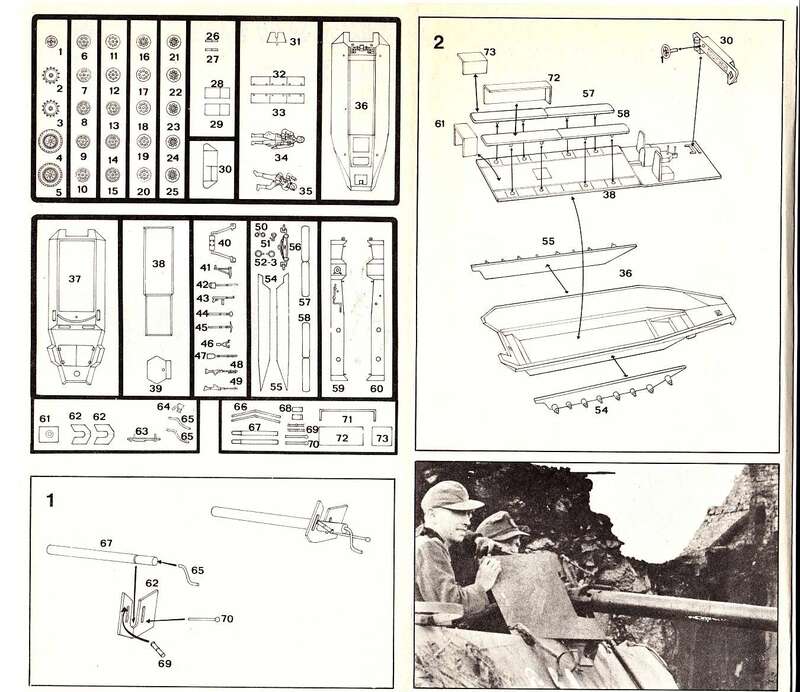 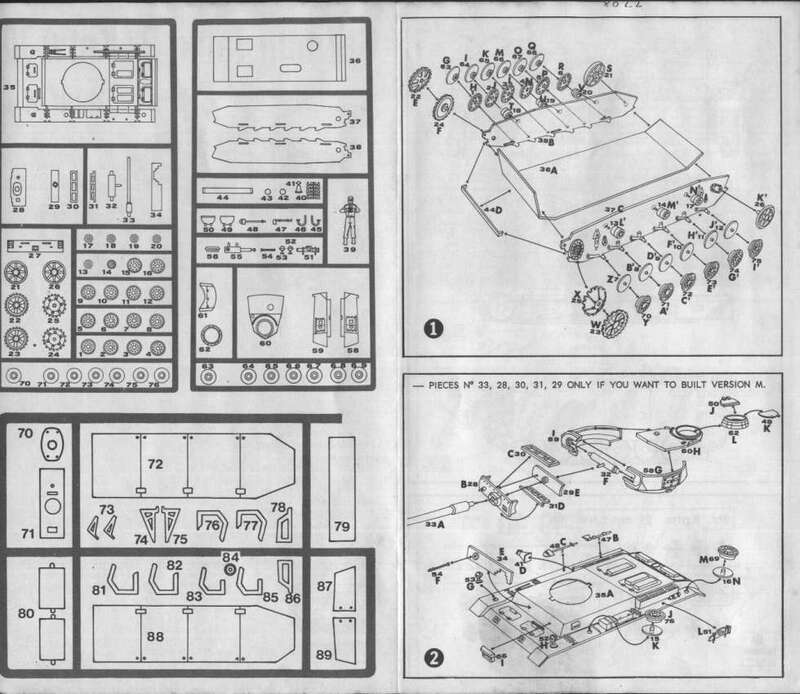 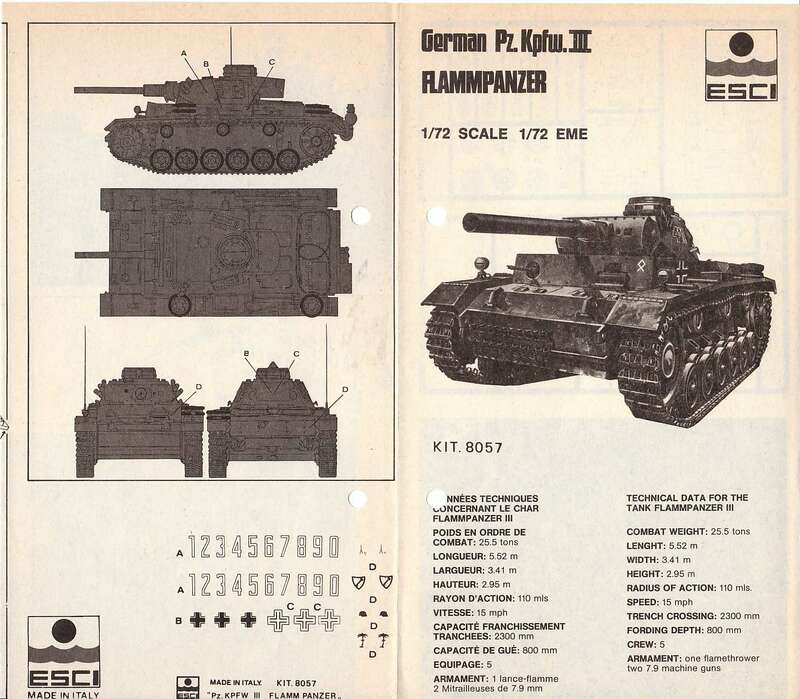 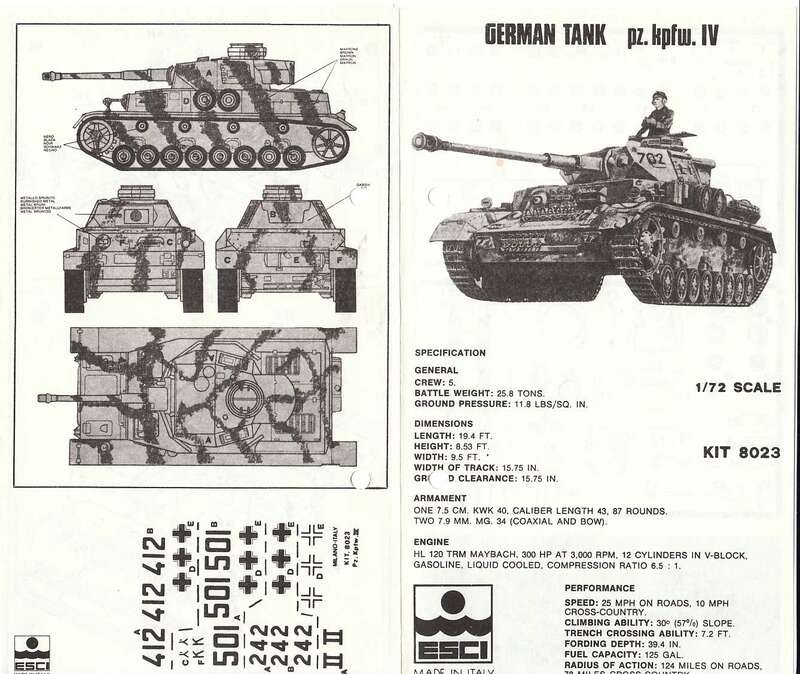 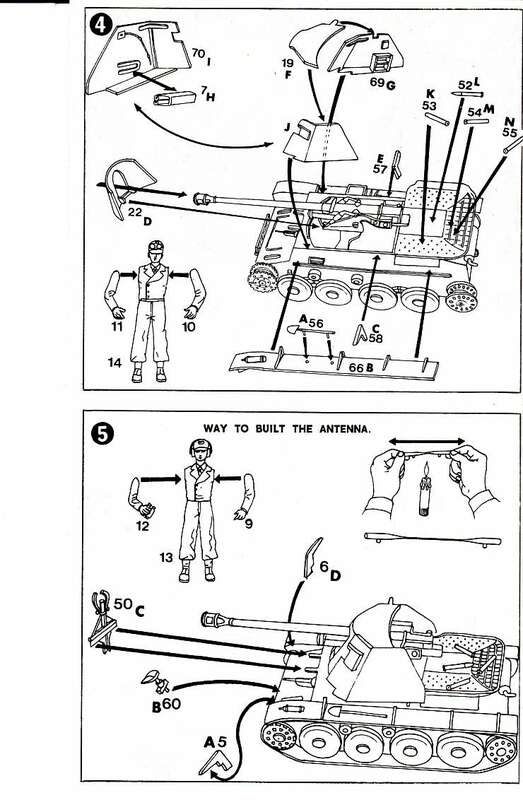 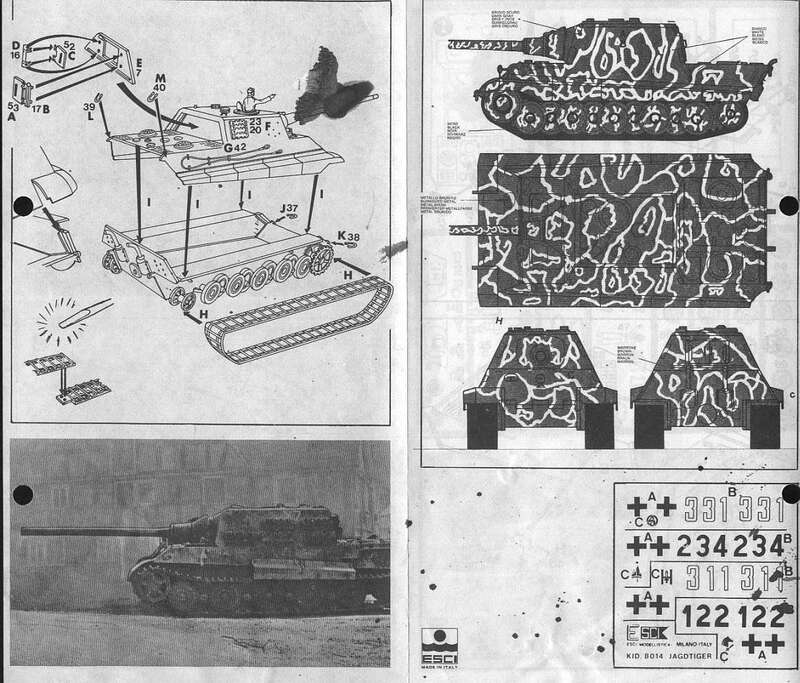 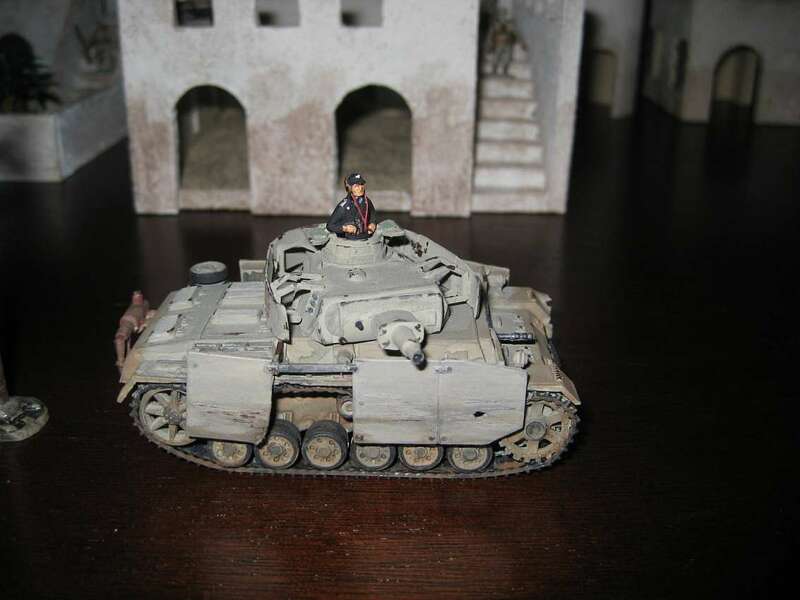 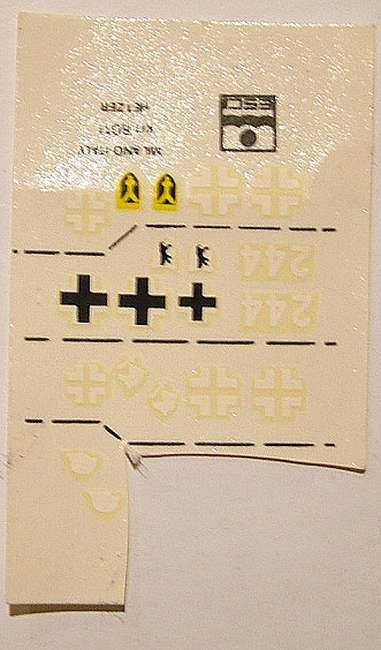 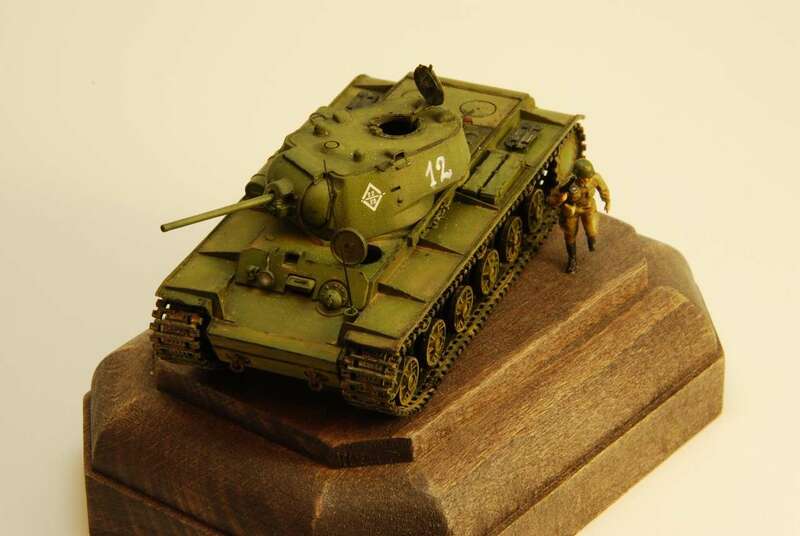 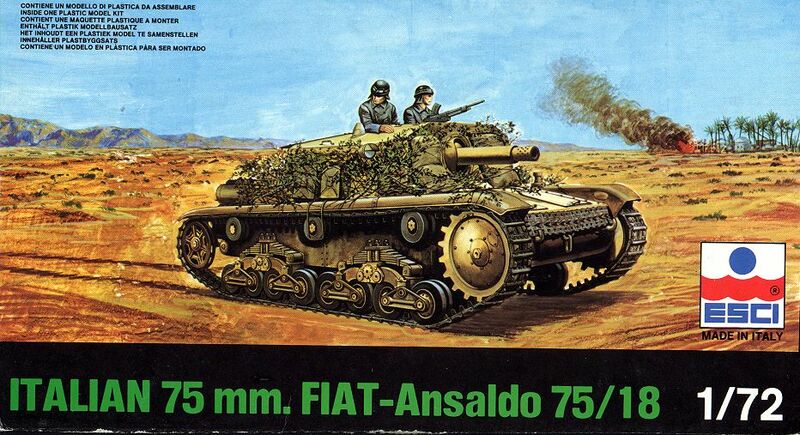 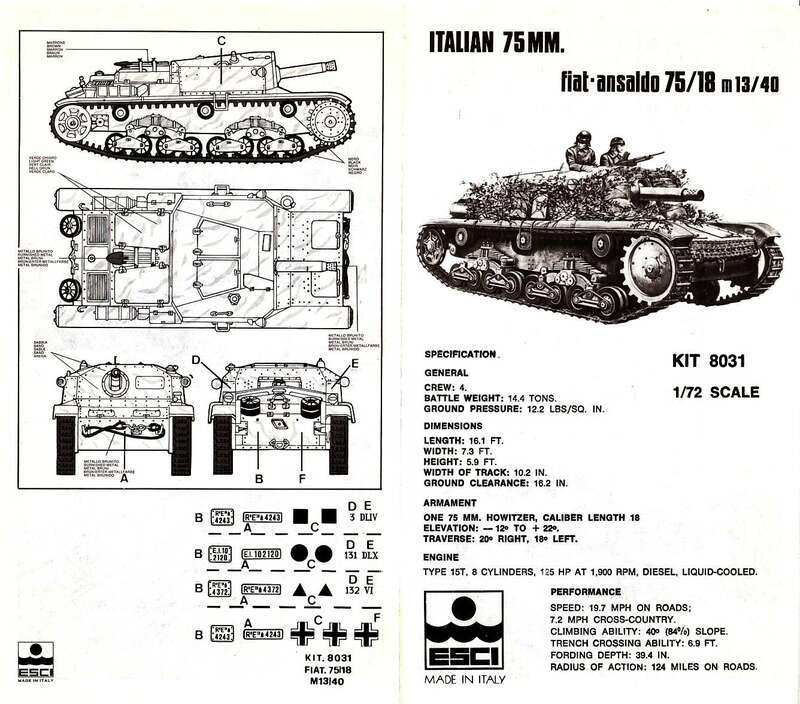 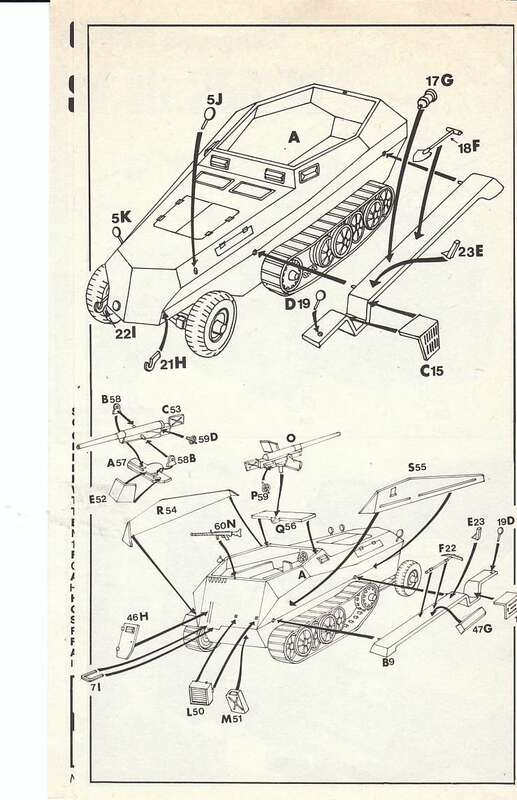 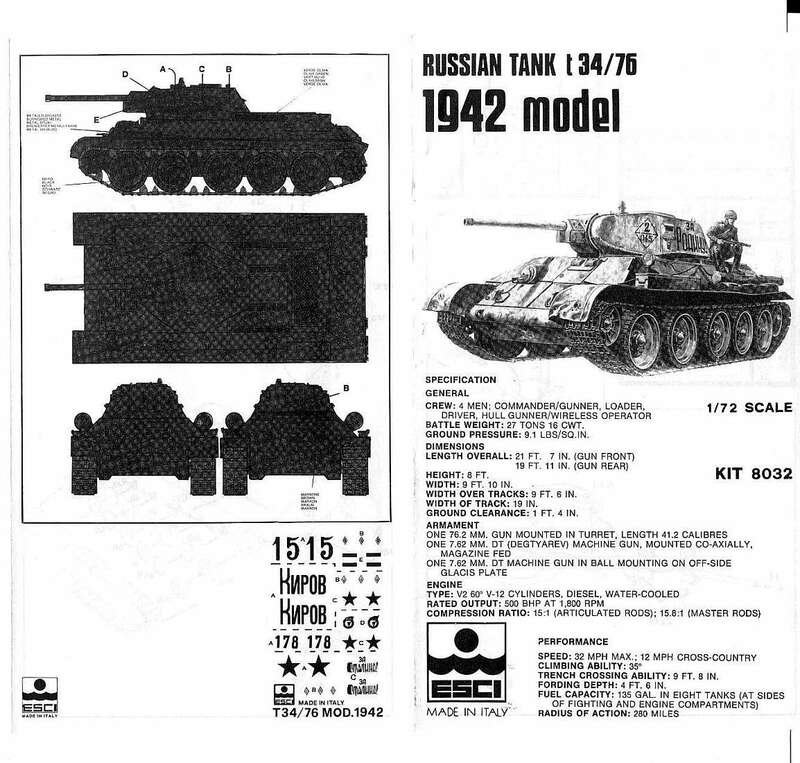 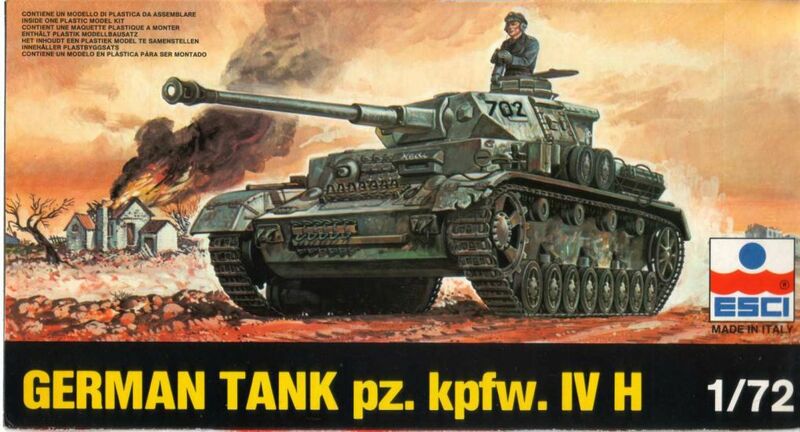 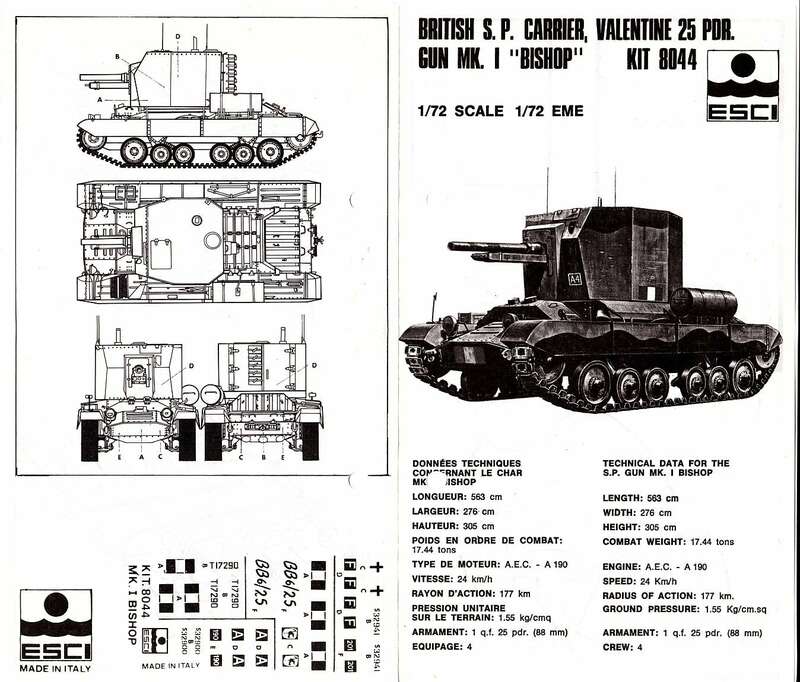 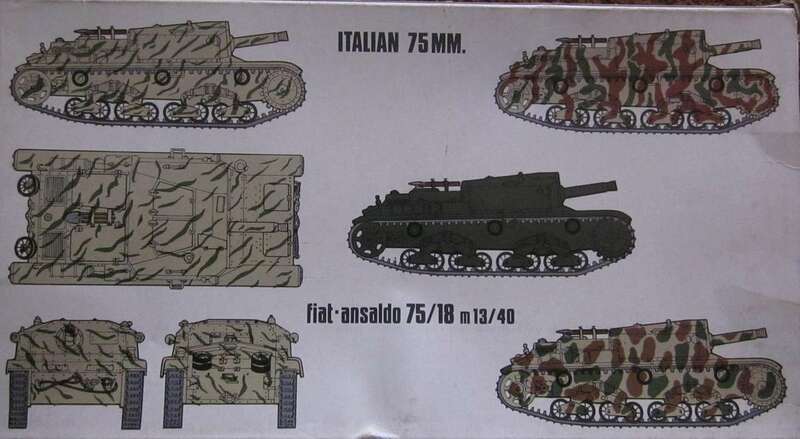 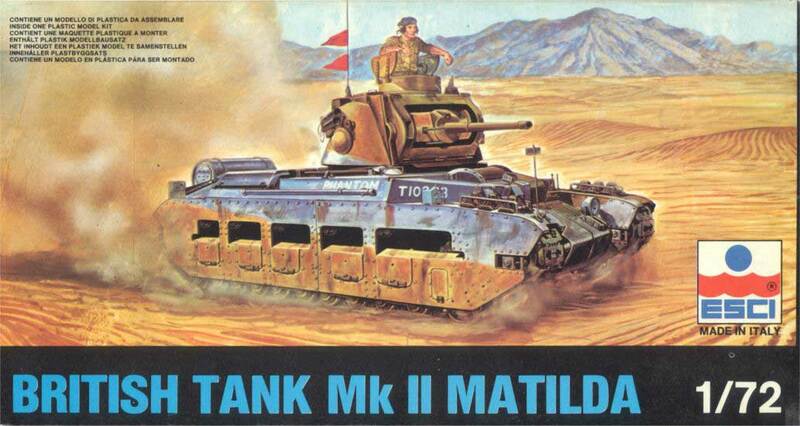 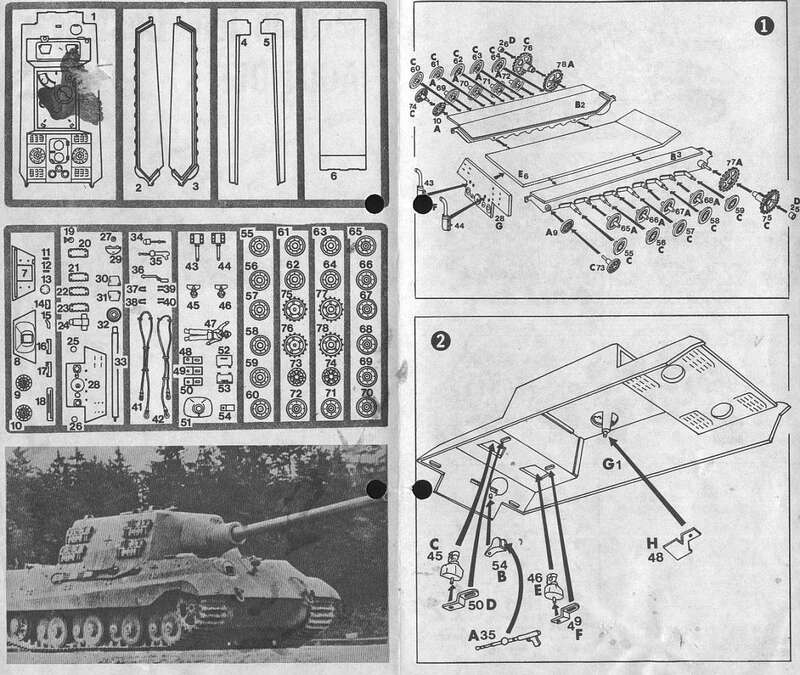 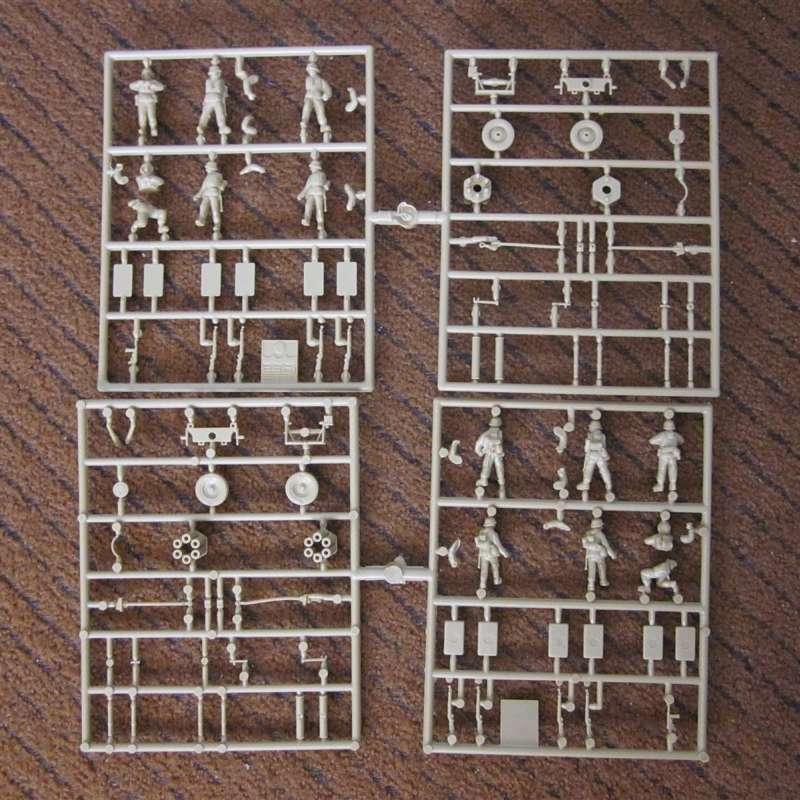 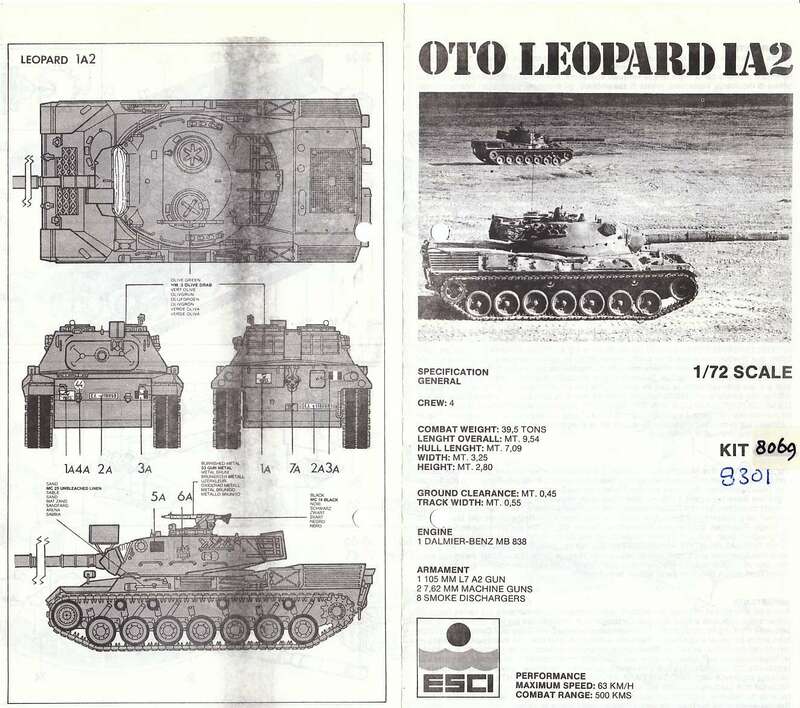 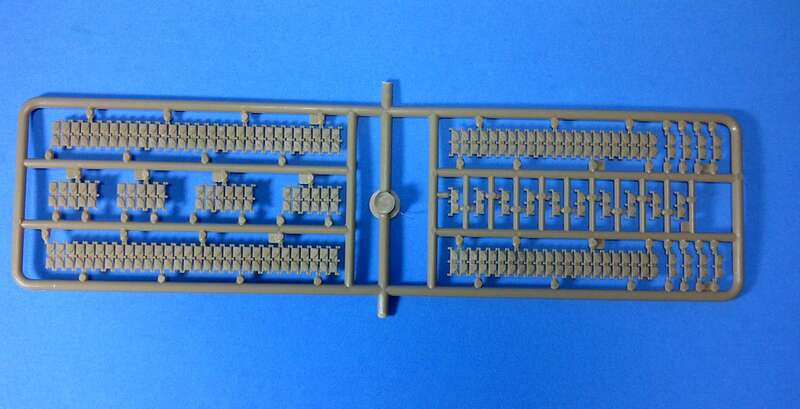 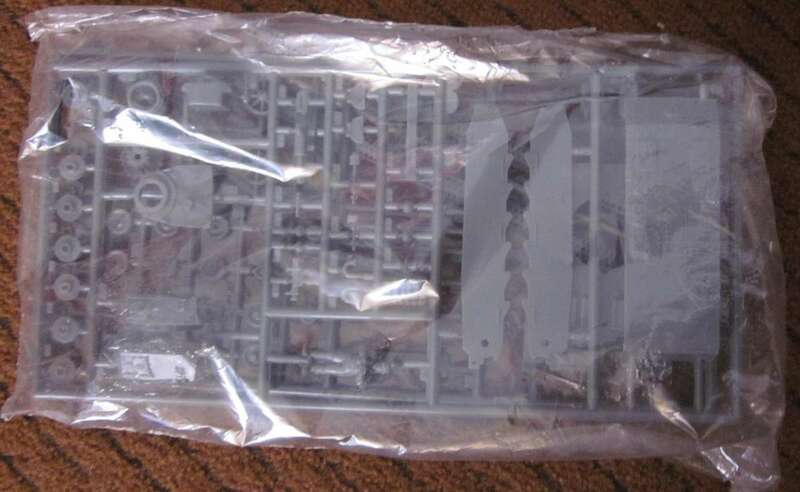 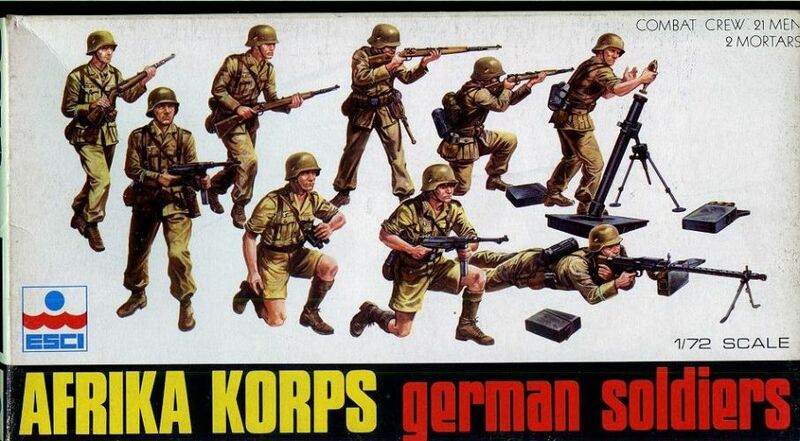 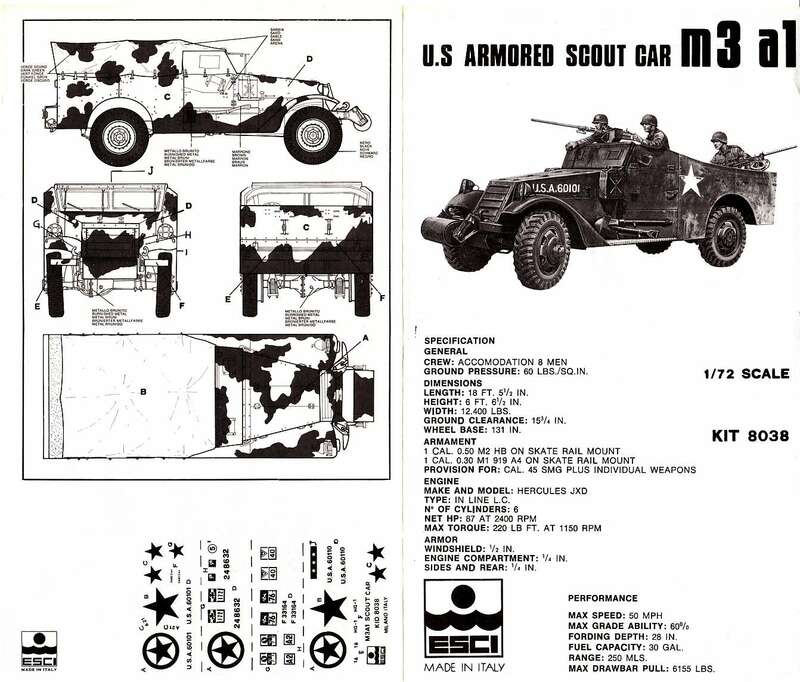 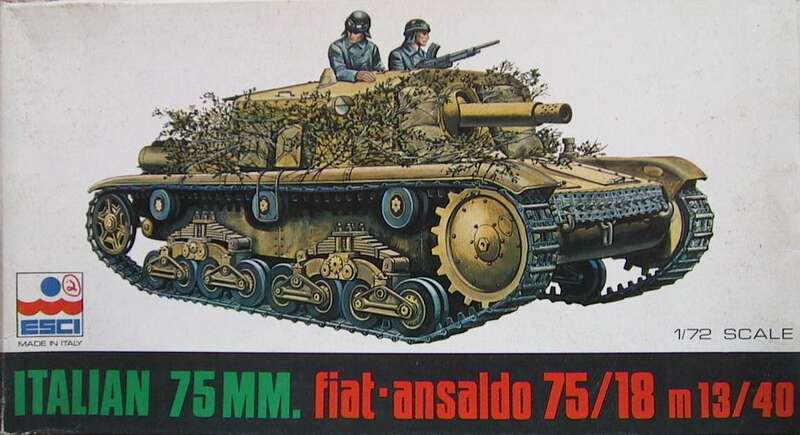 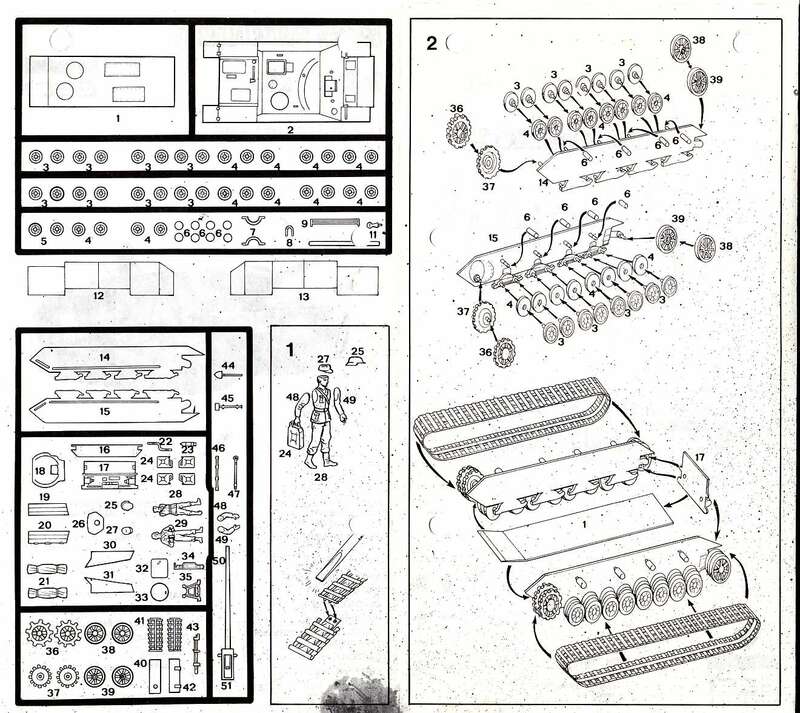 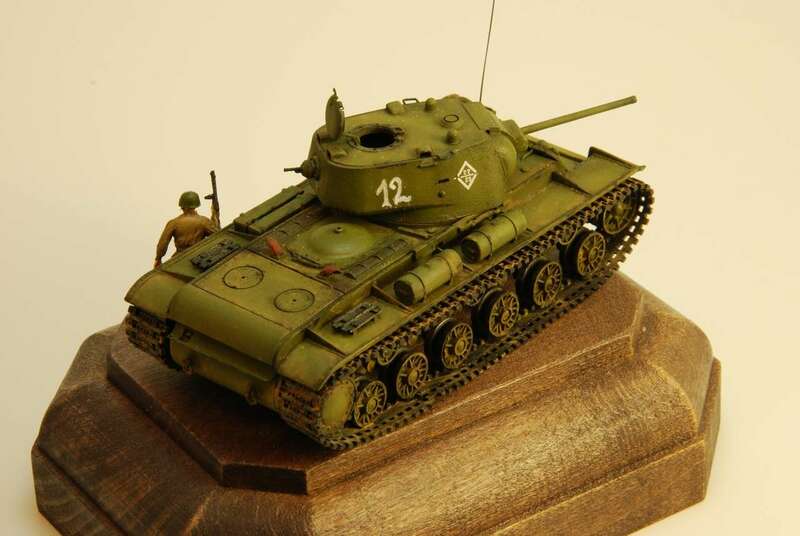 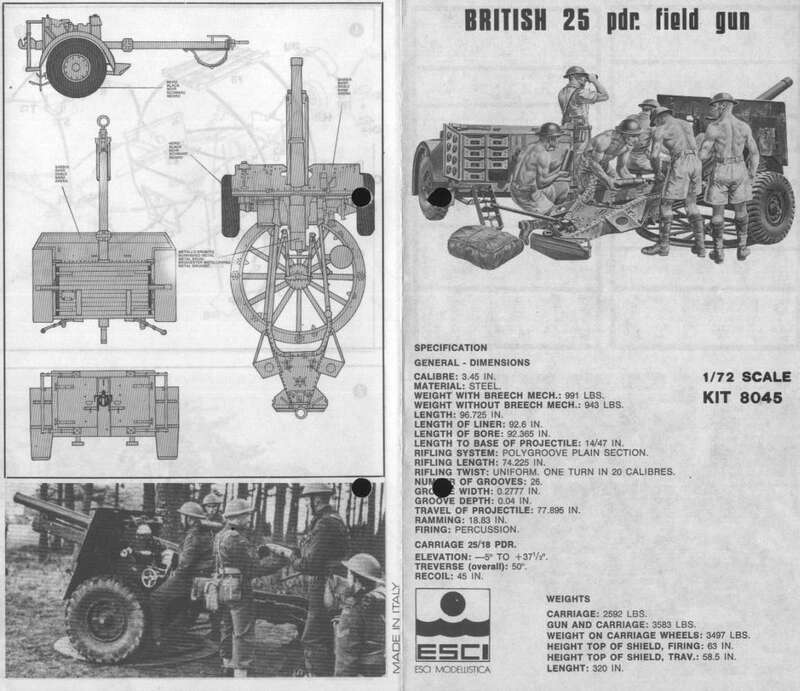 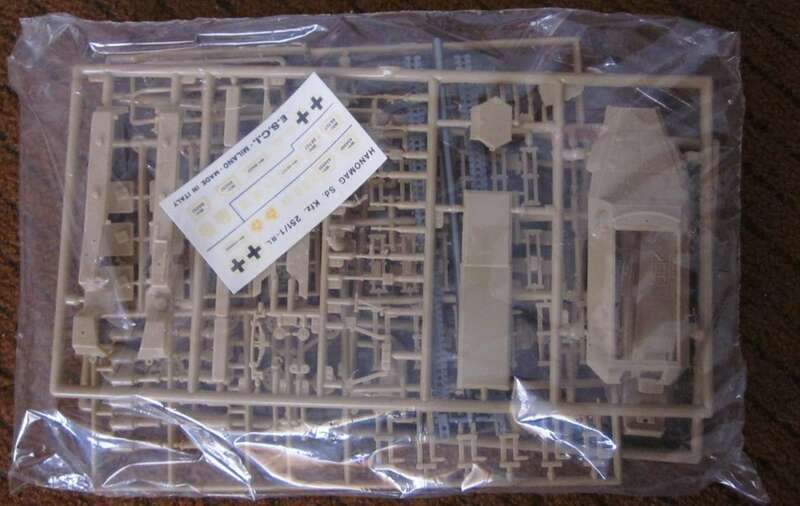 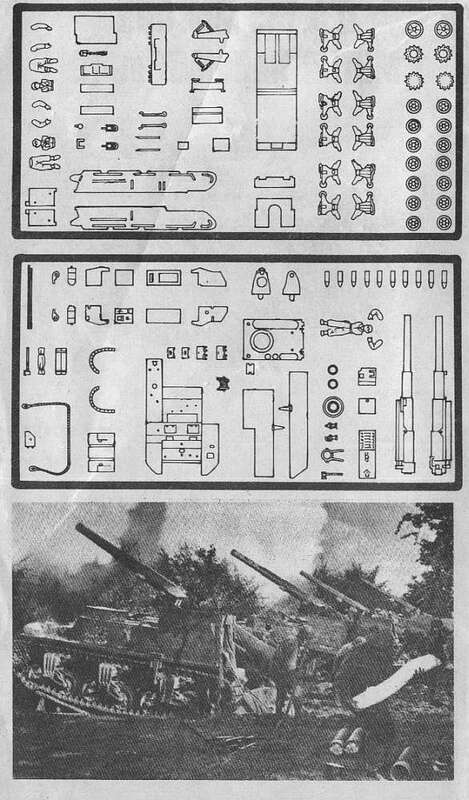 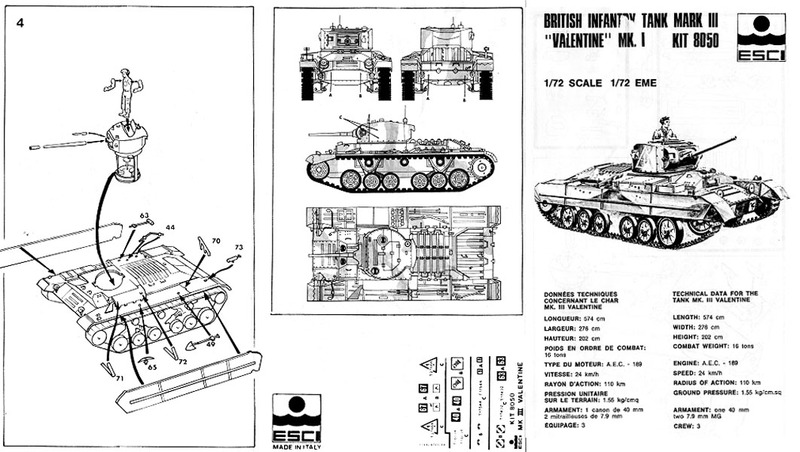 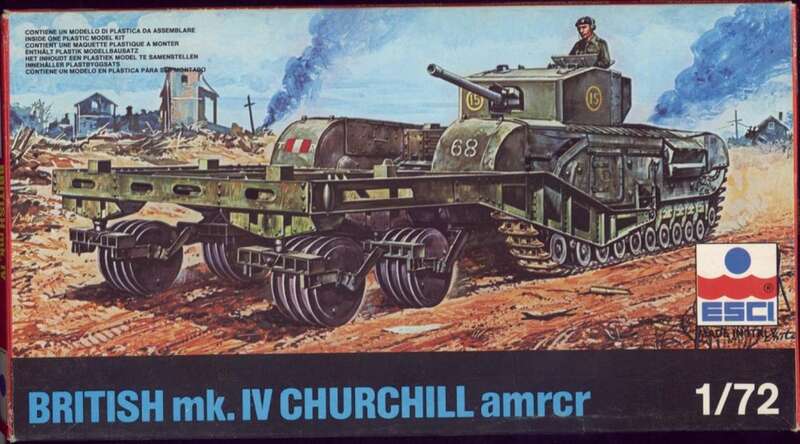 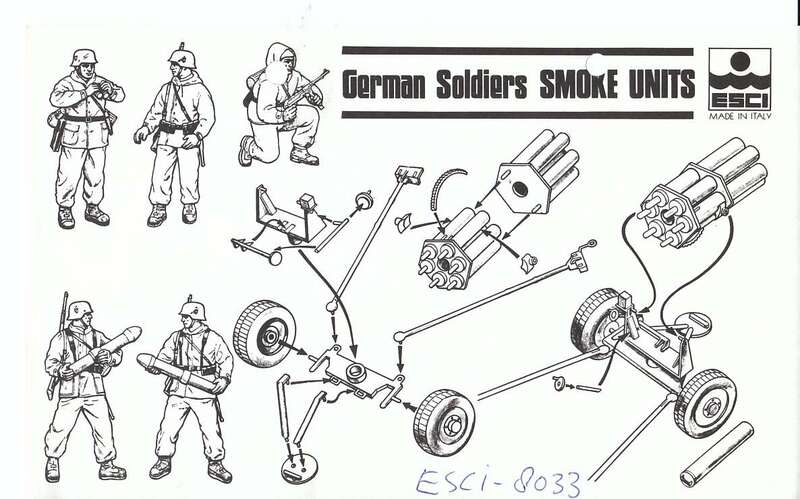 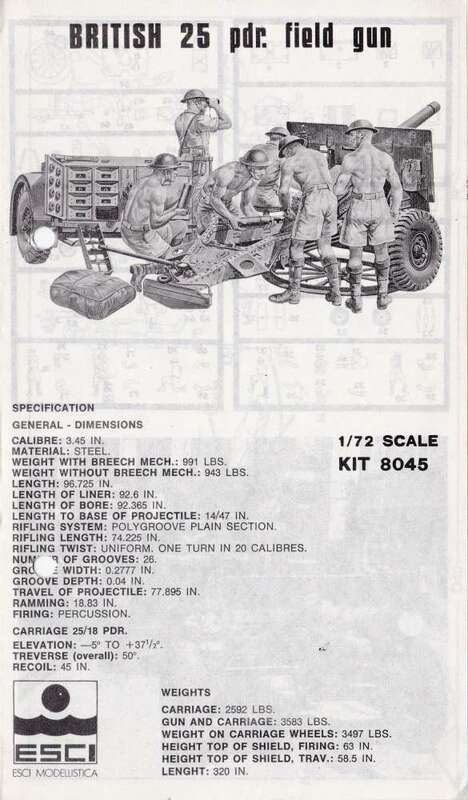 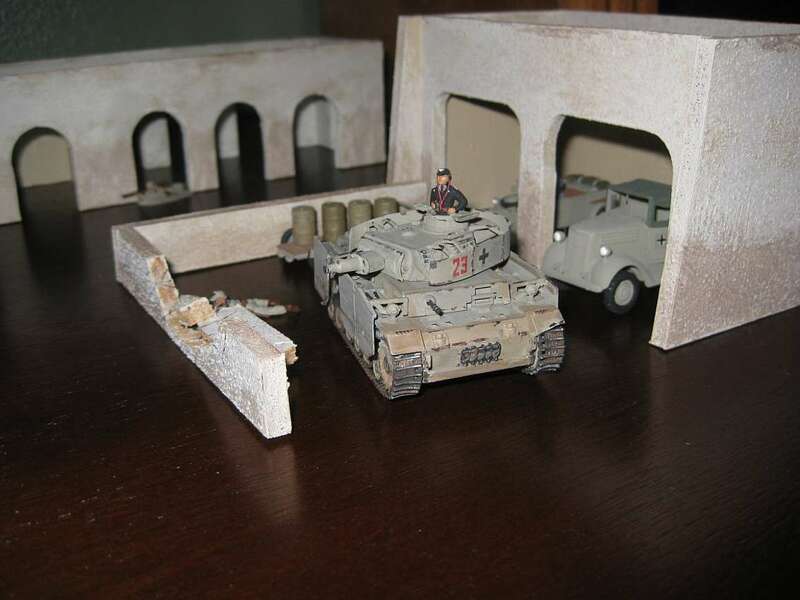 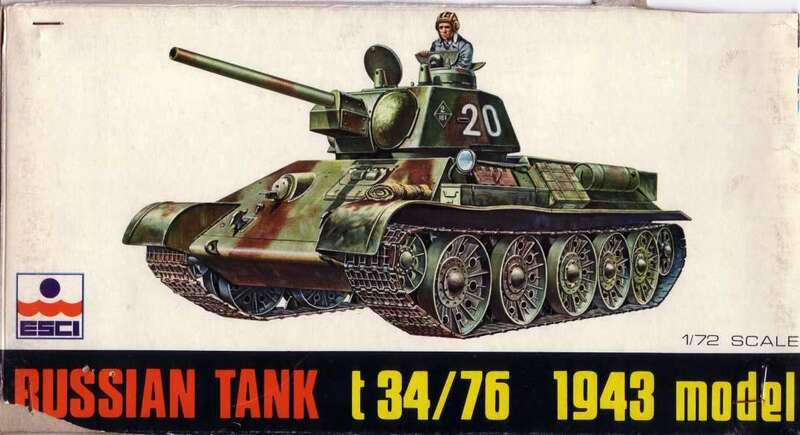 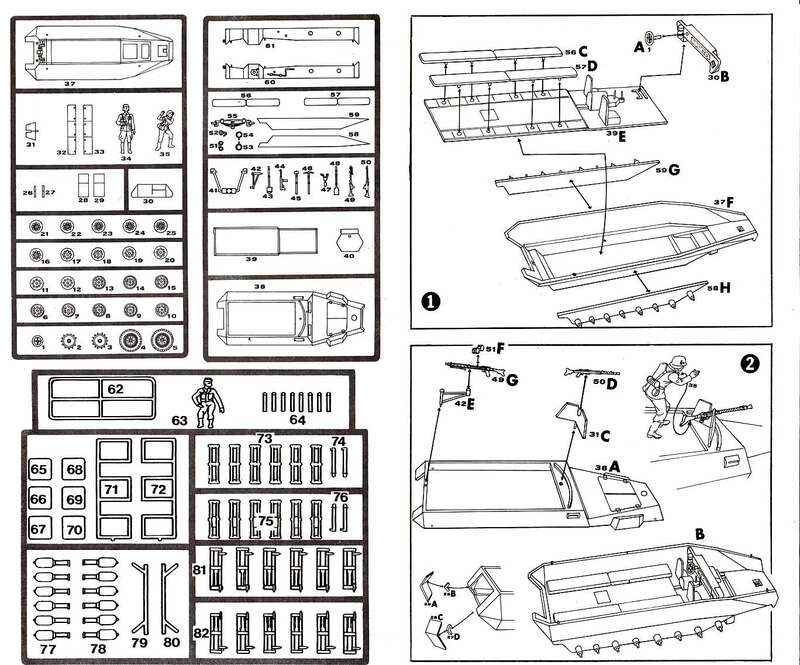 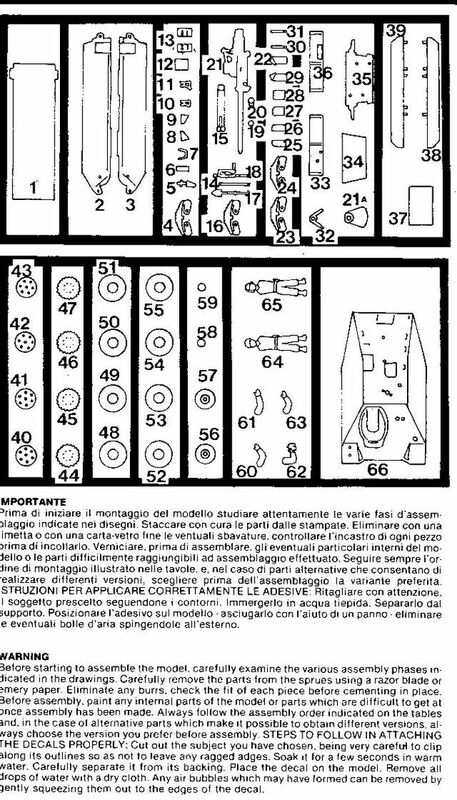 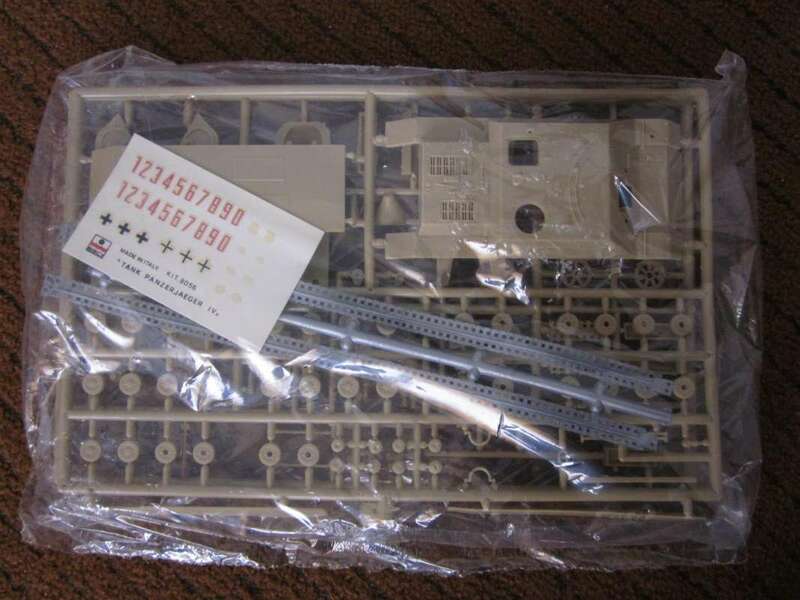 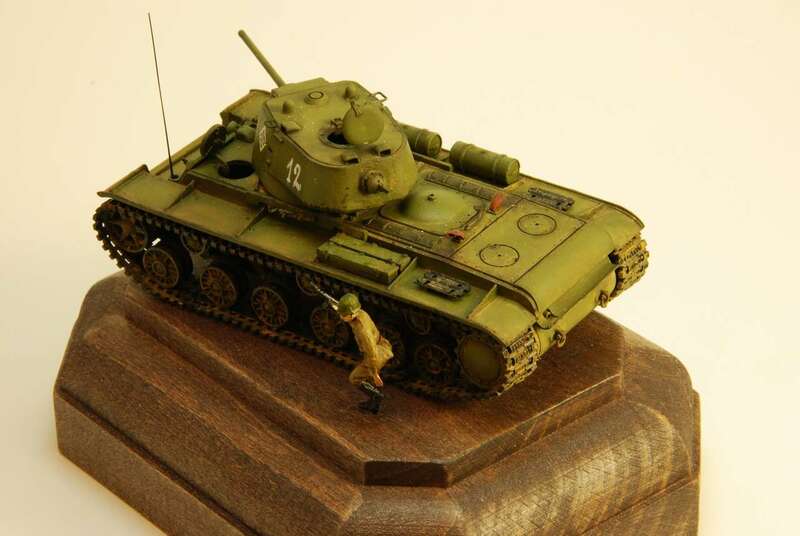 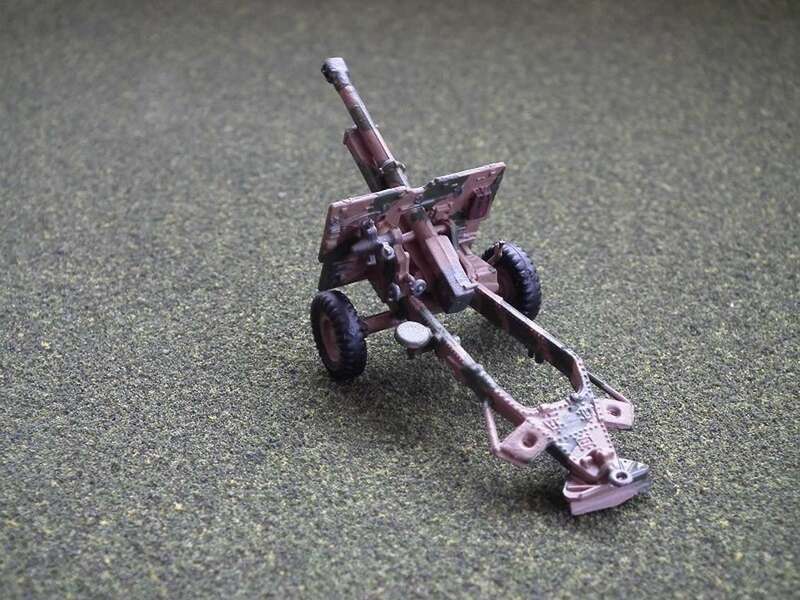 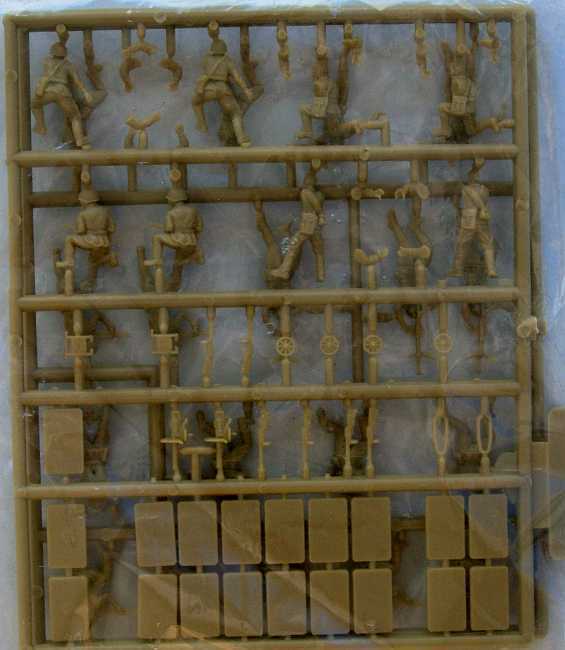 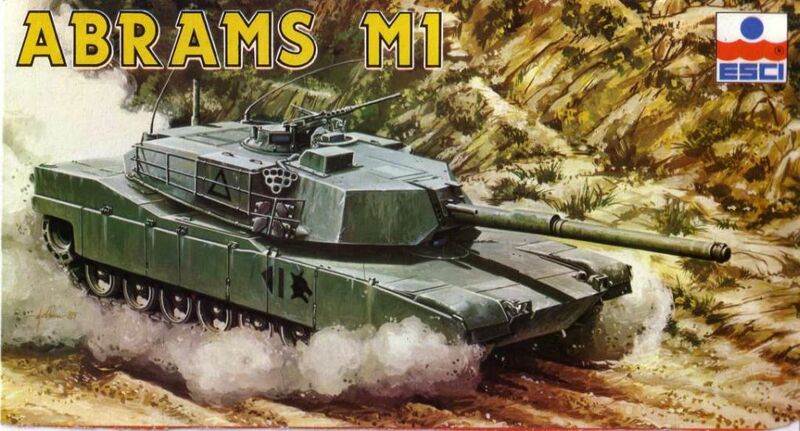 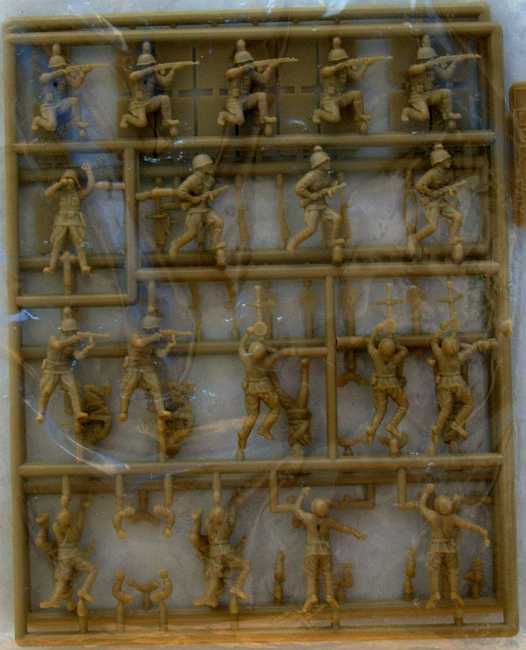 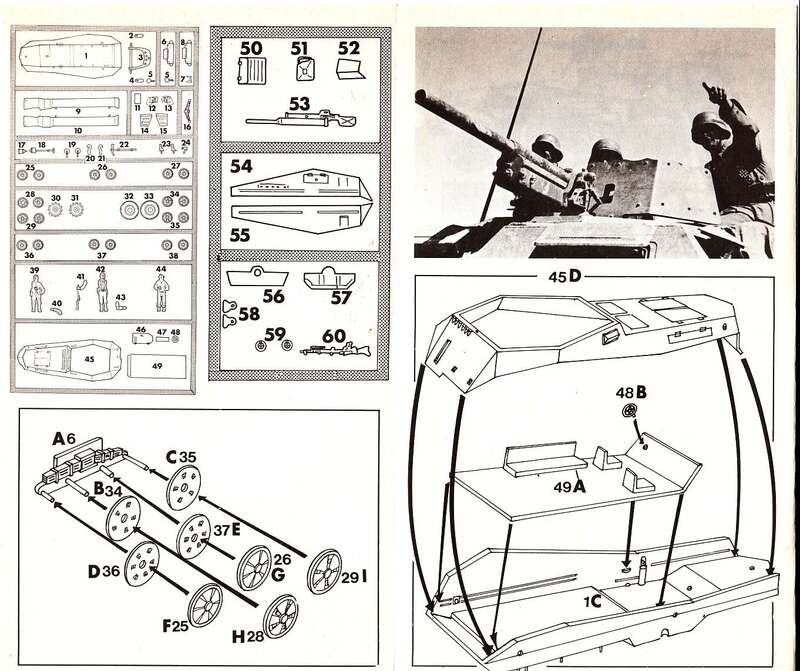 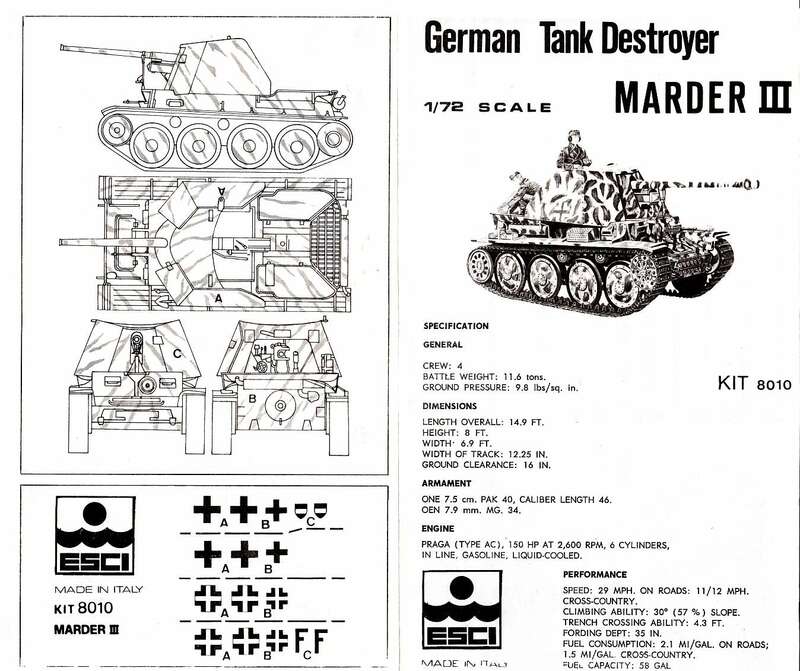 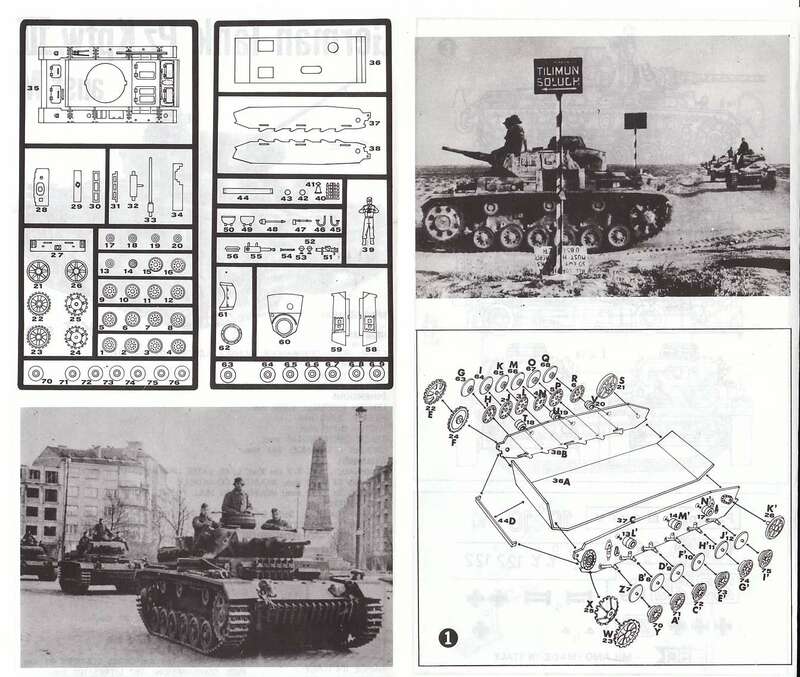 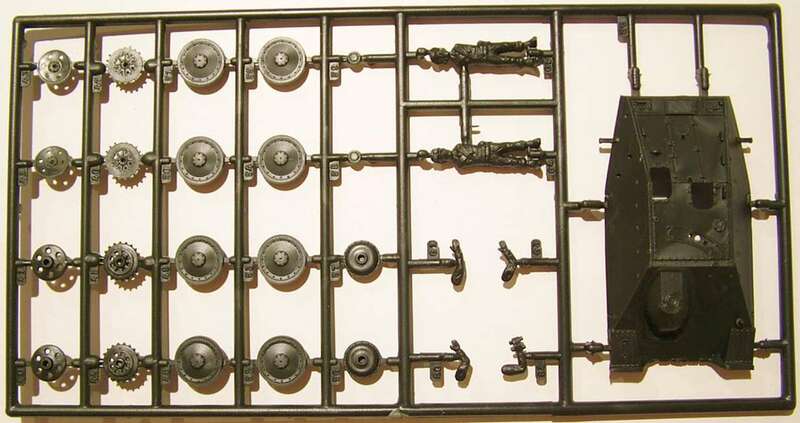 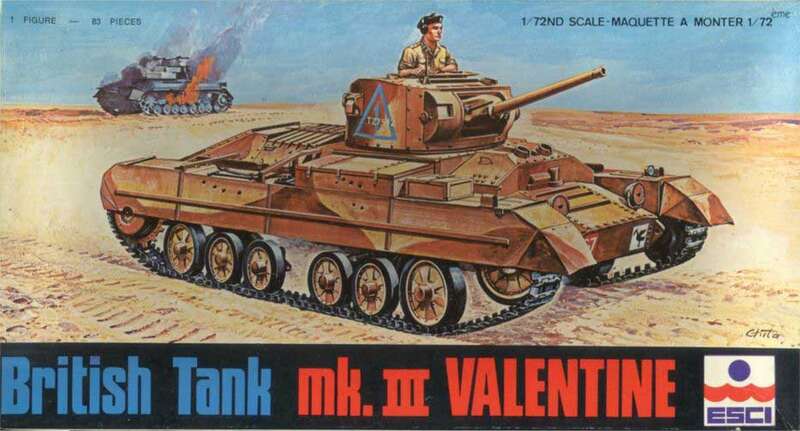 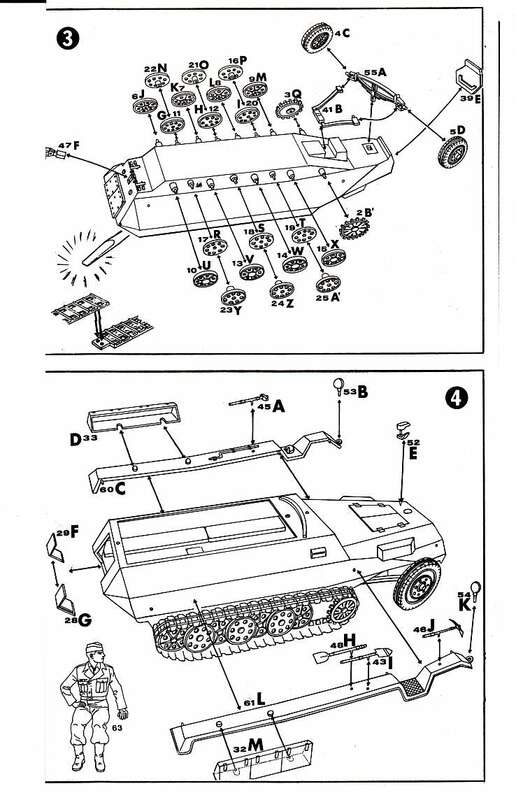 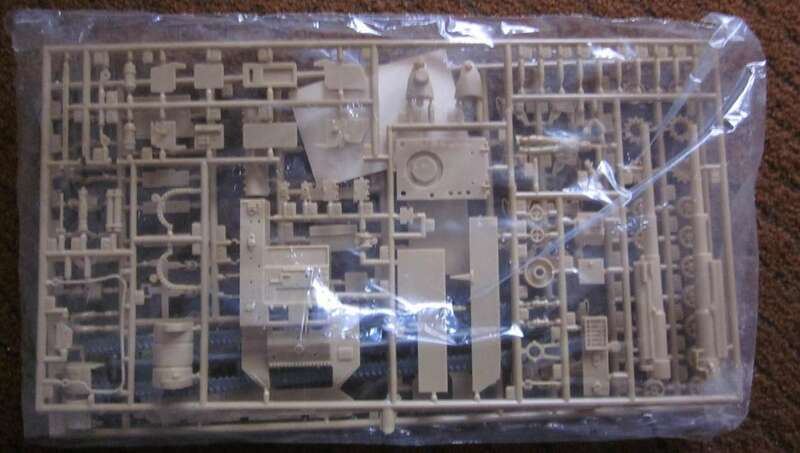 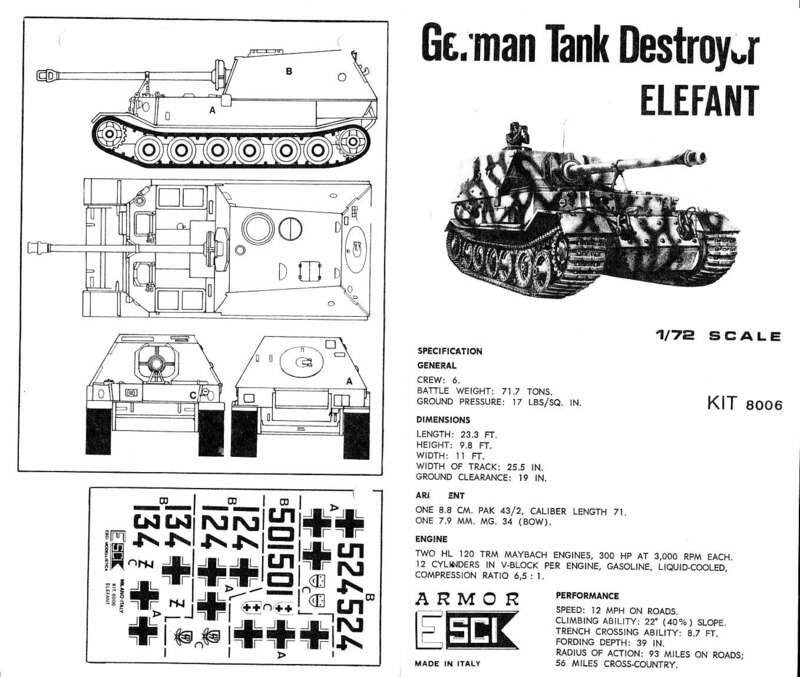 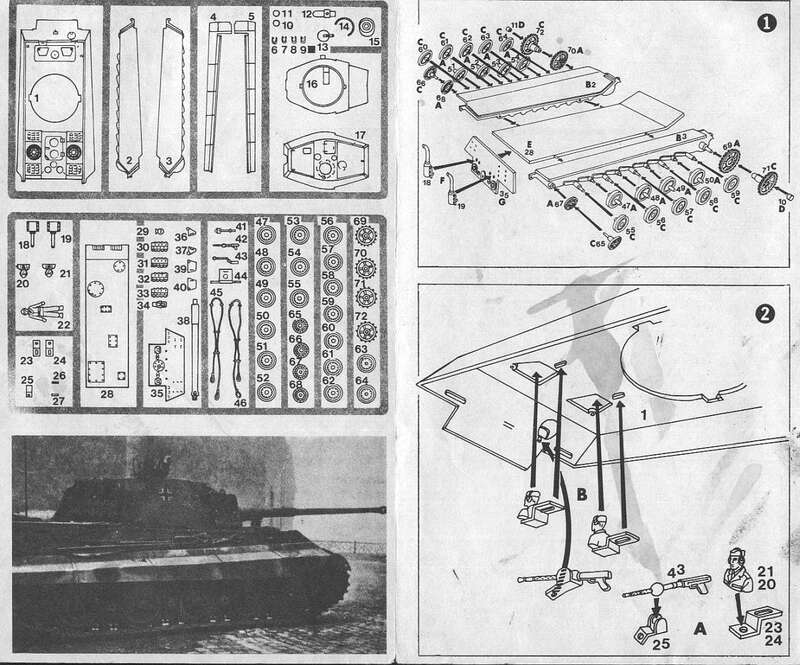 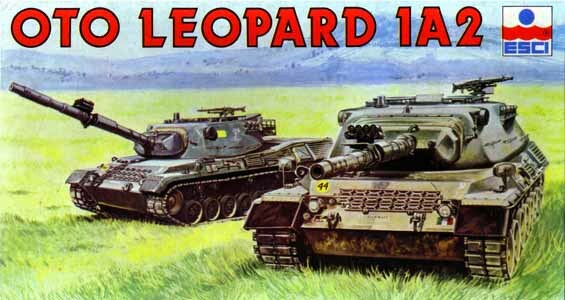 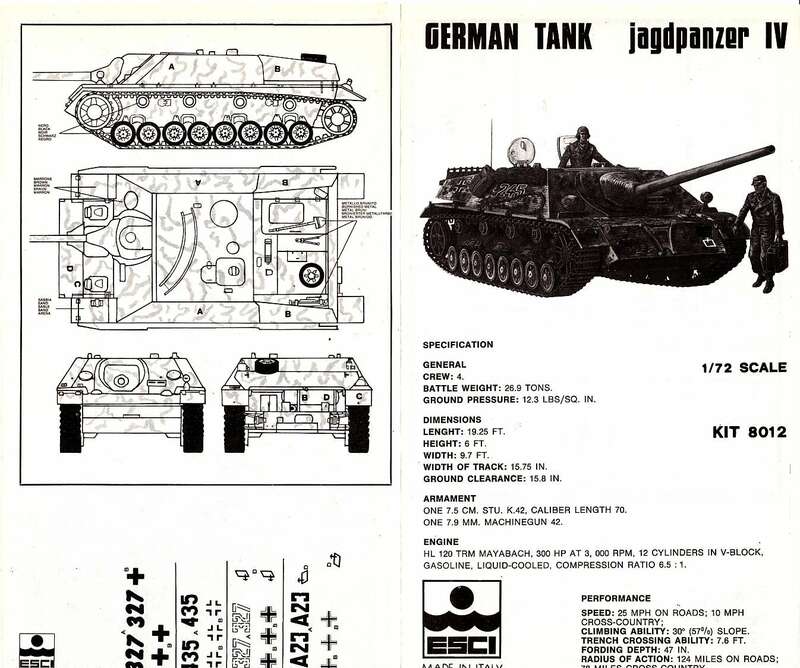 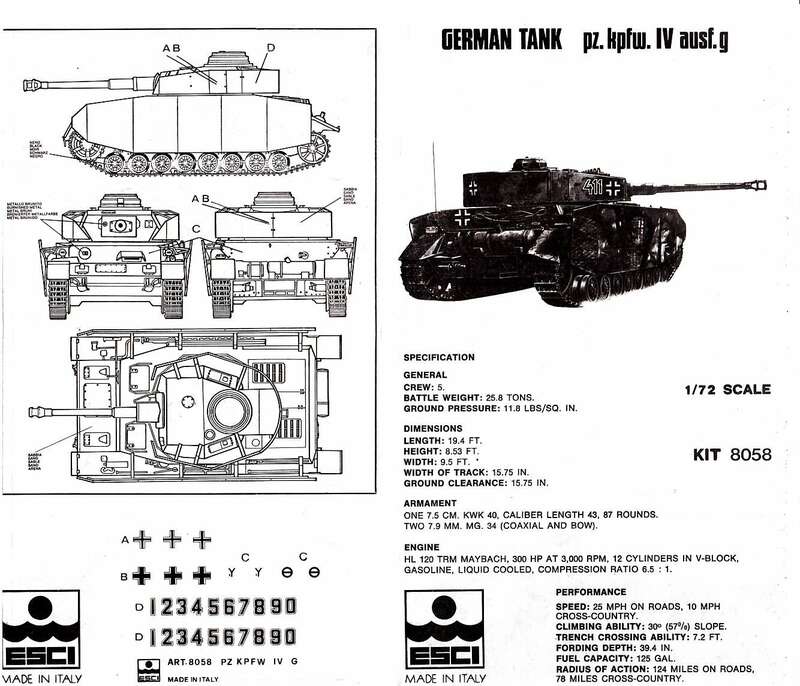 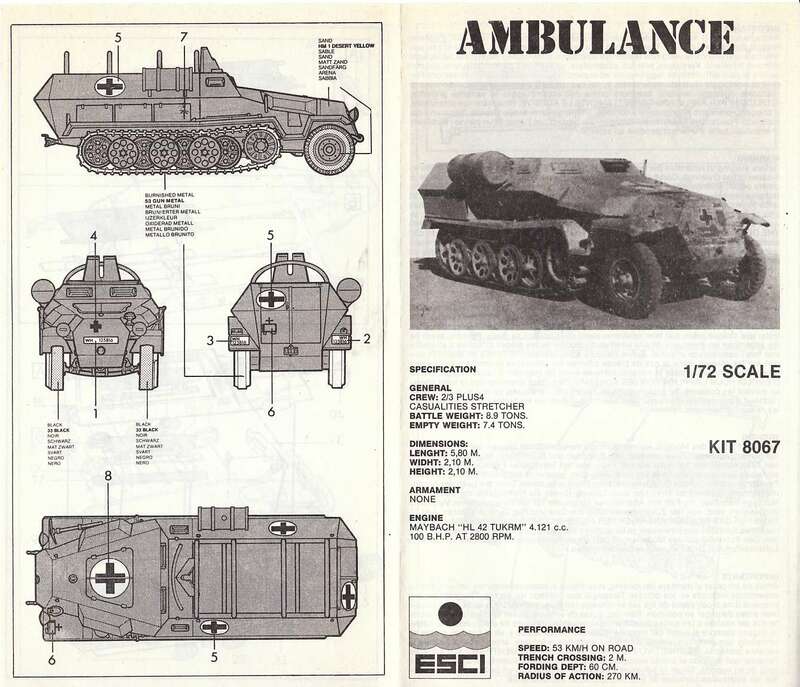 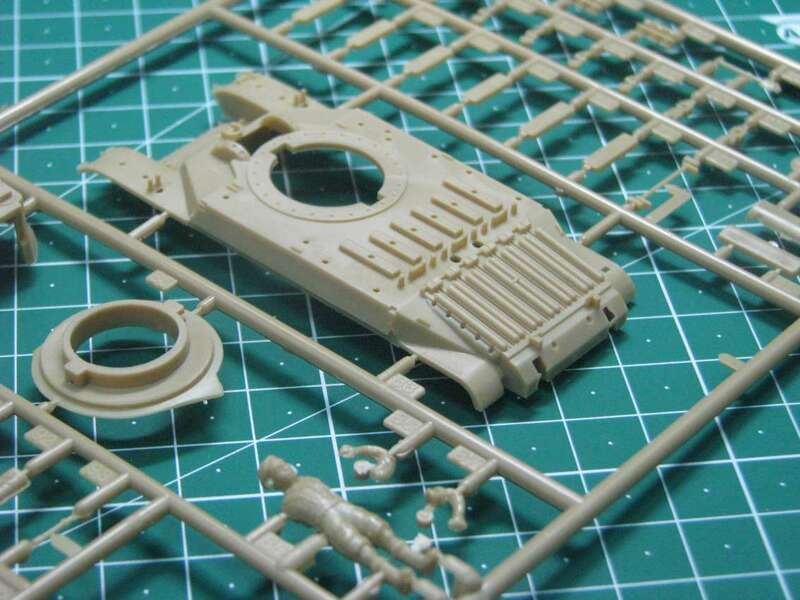 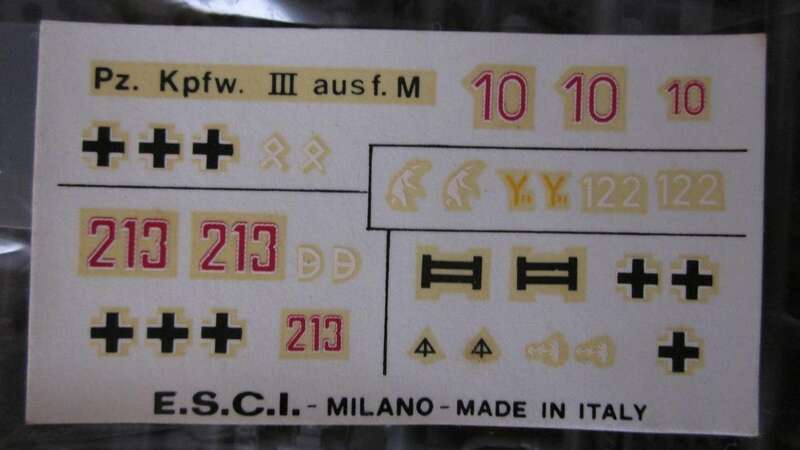 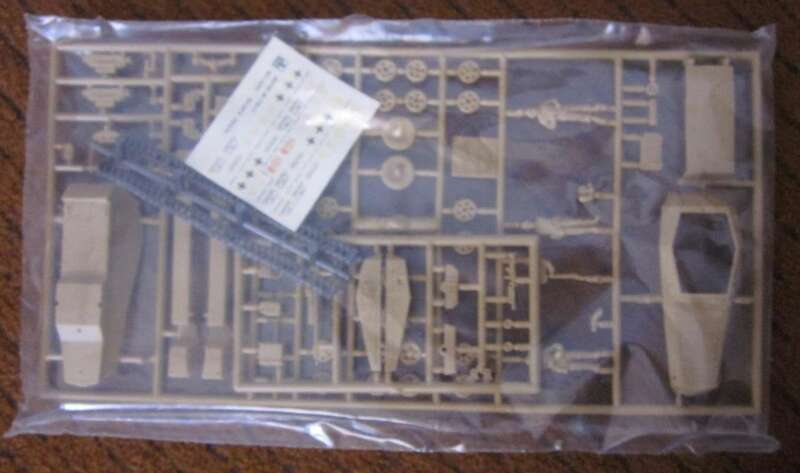 The original Esci Modellistica Armor 1/72 series starts its life in 1974 numbered 8001 and on. 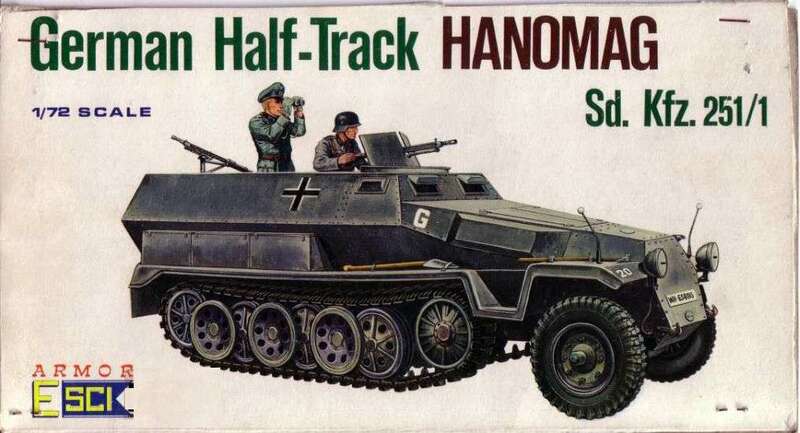 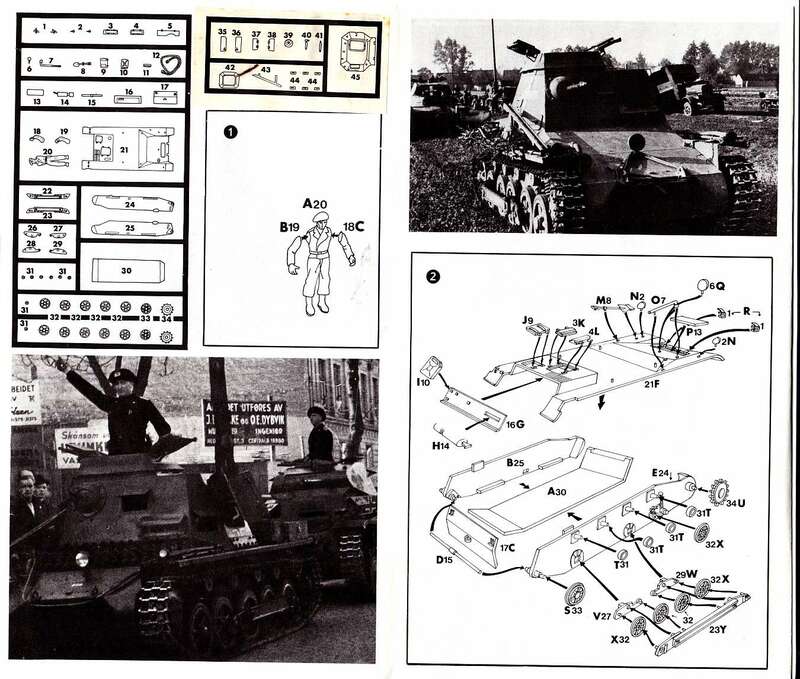 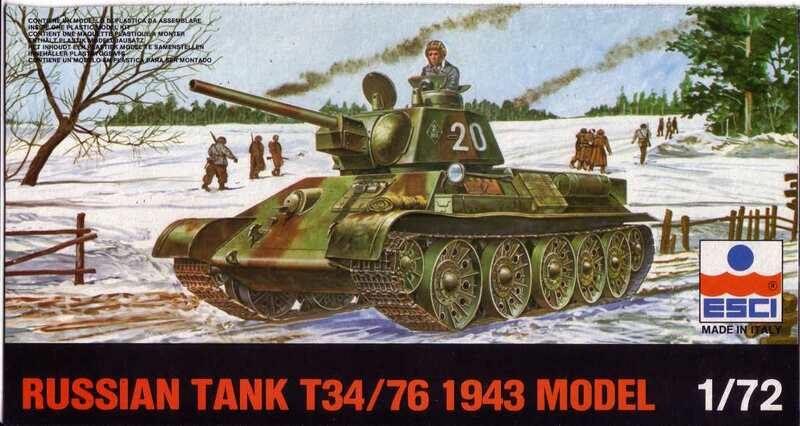 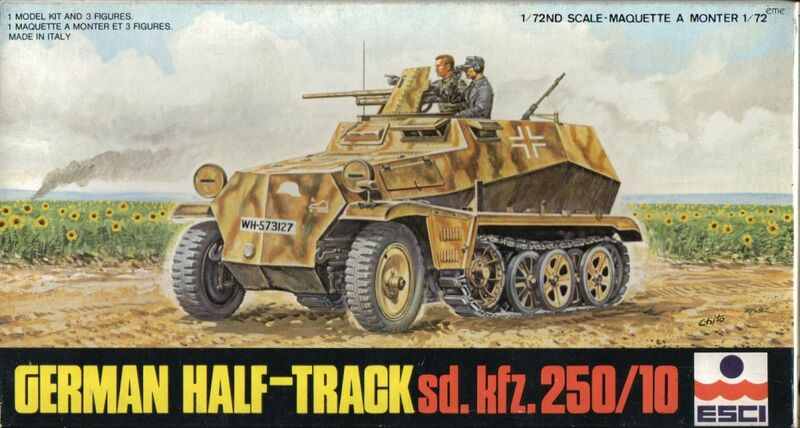 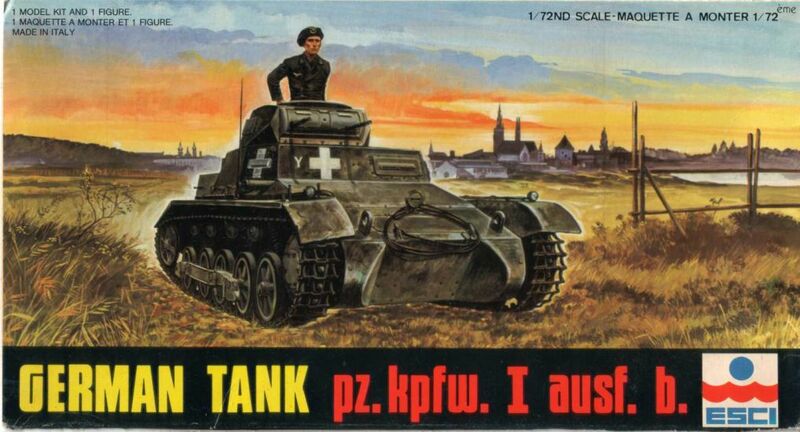 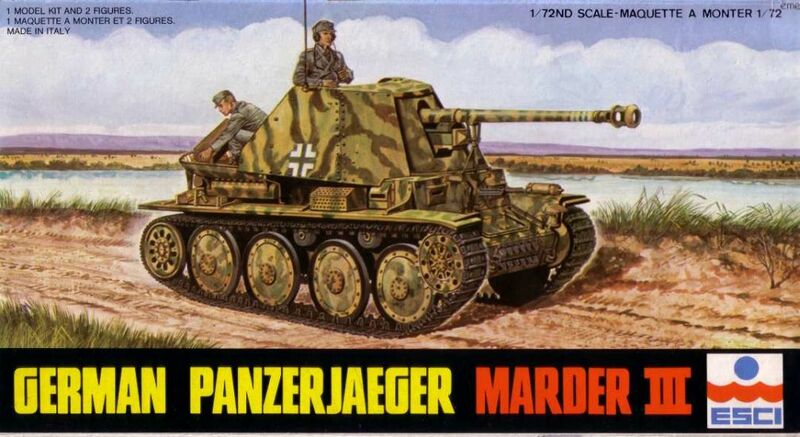 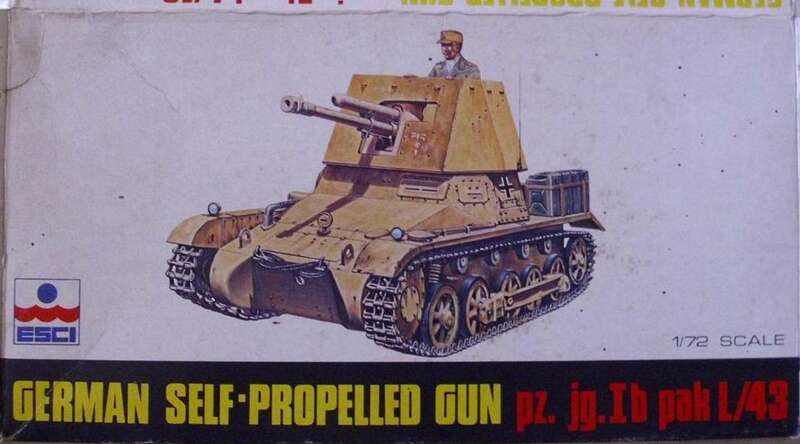 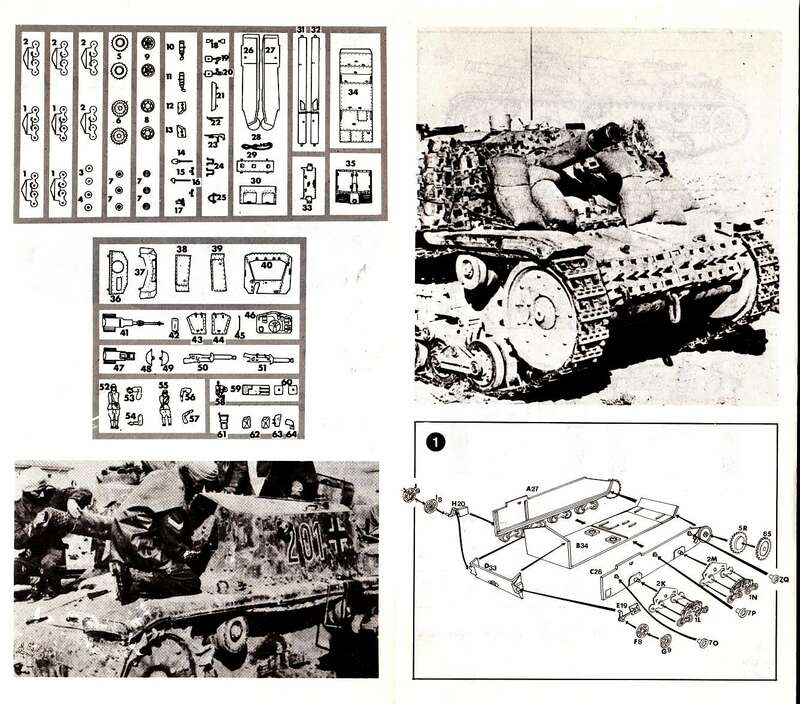 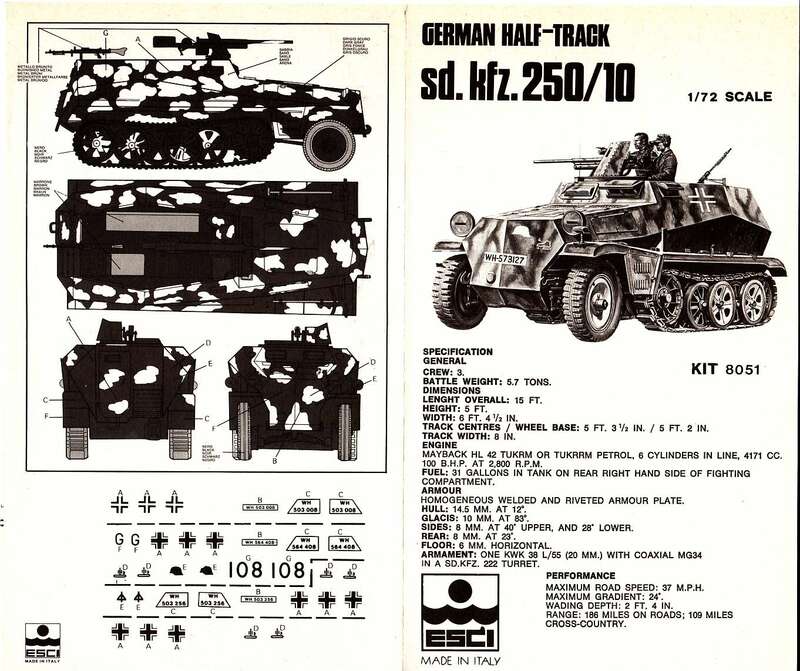 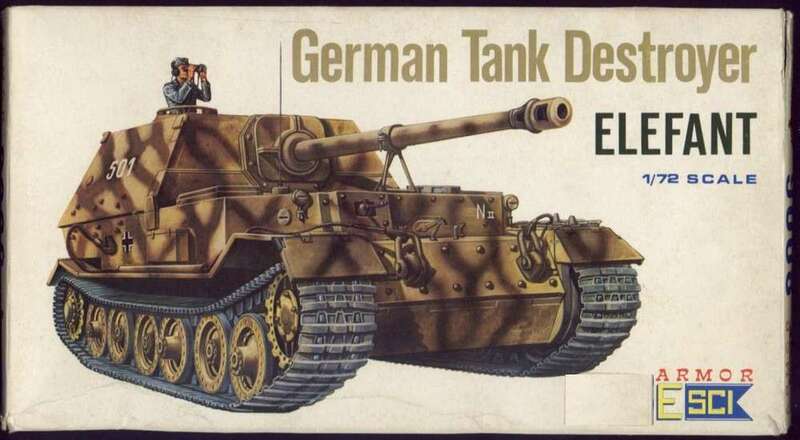 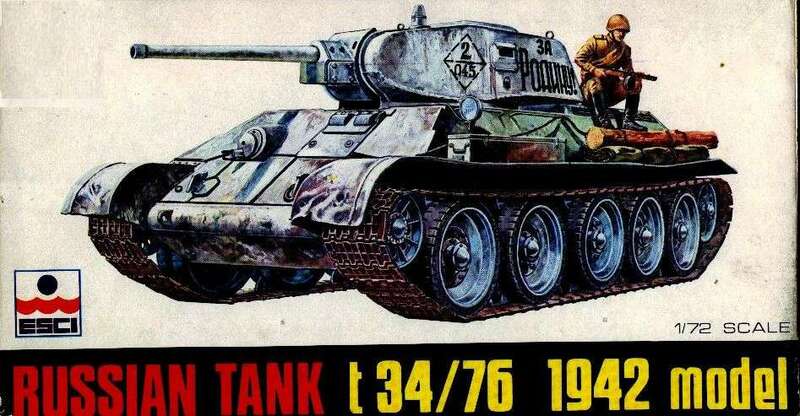 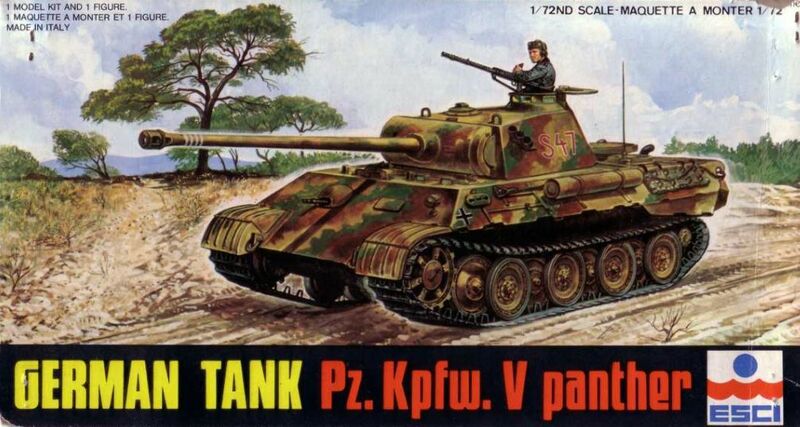 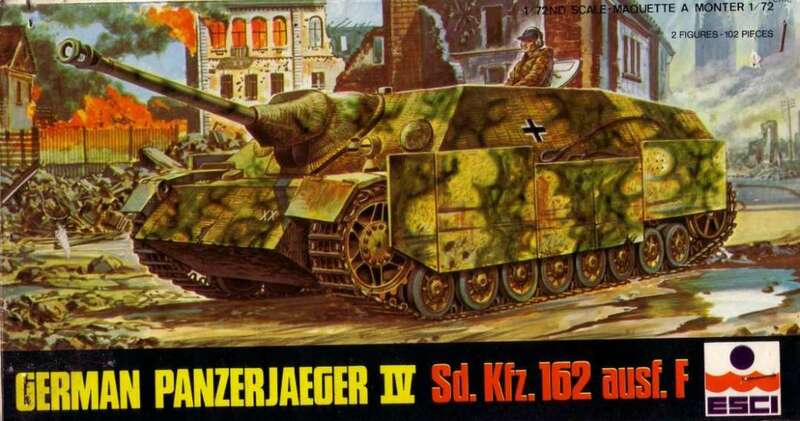 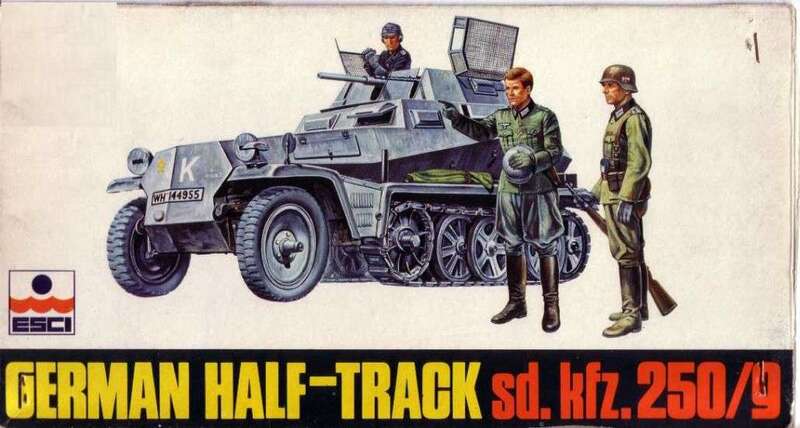 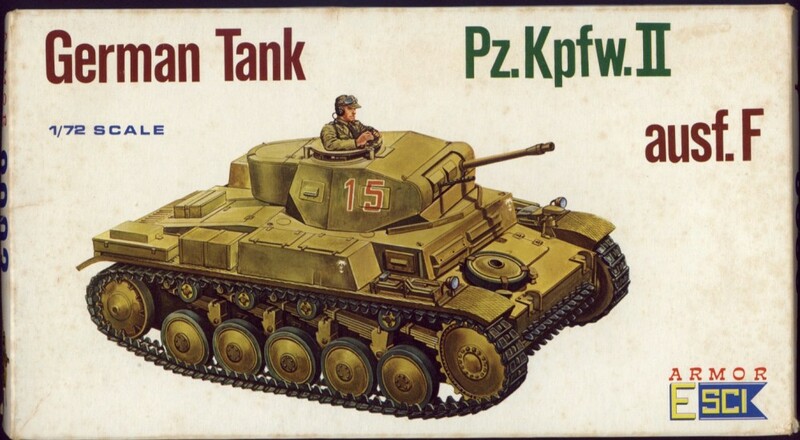 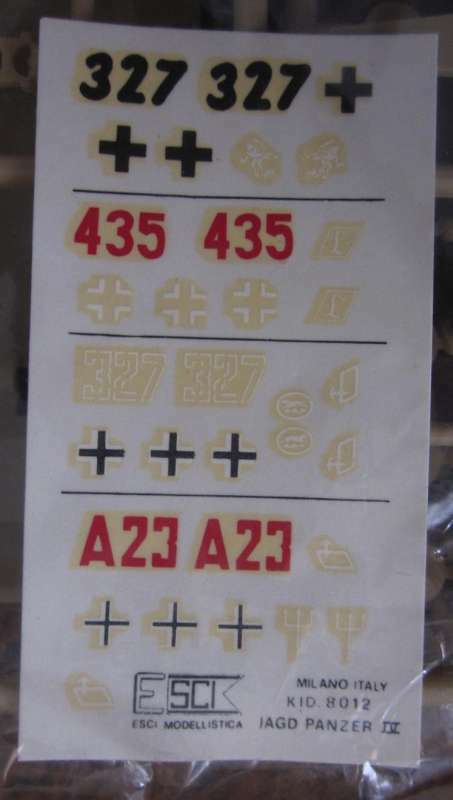 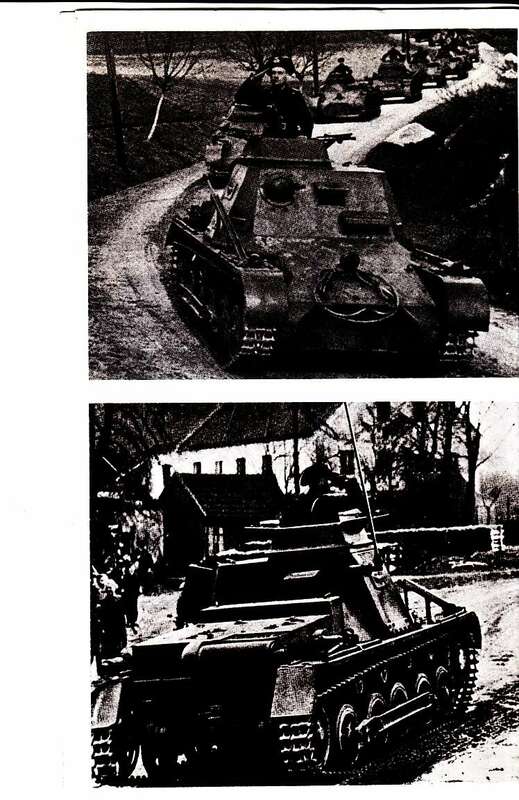 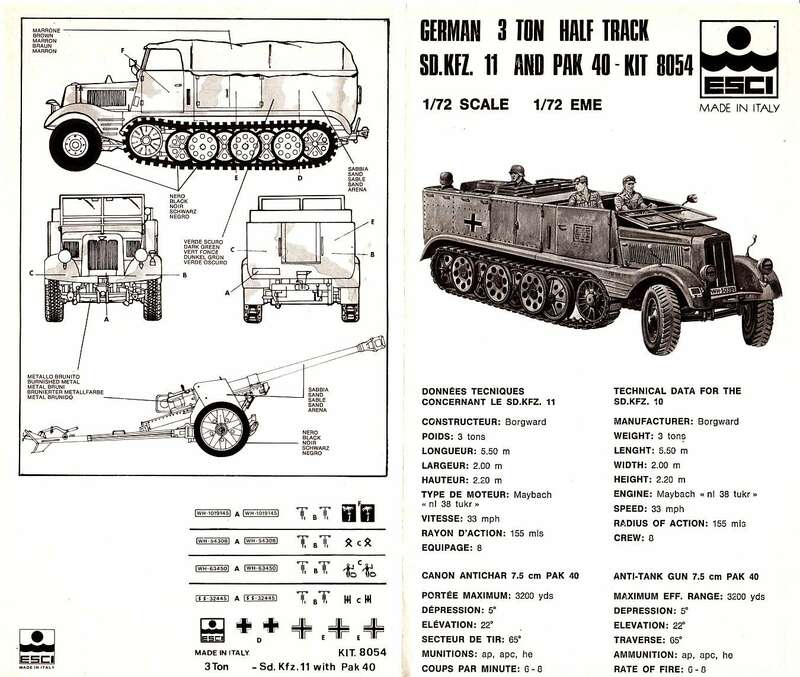 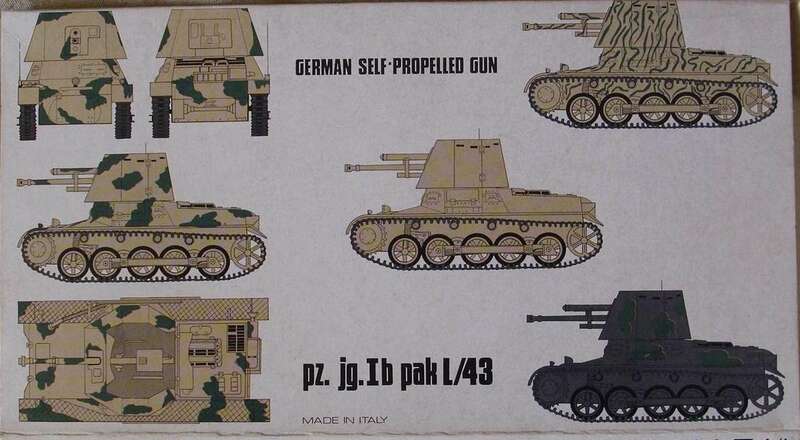 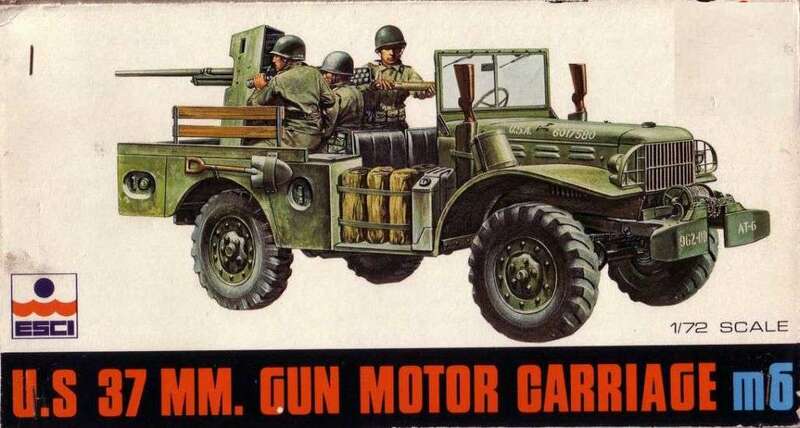 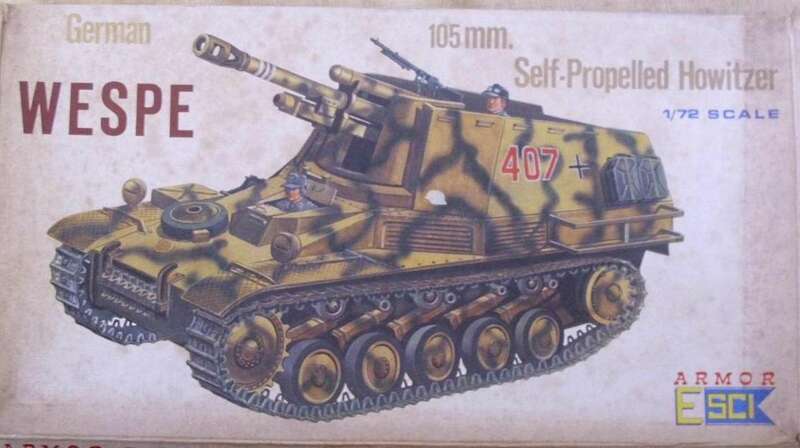 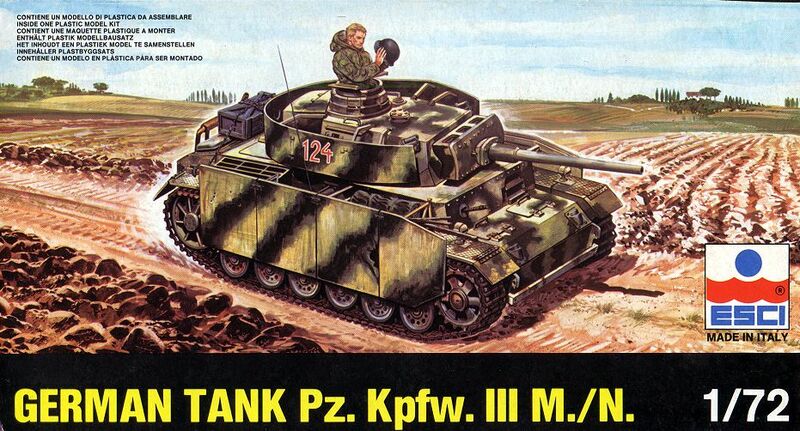 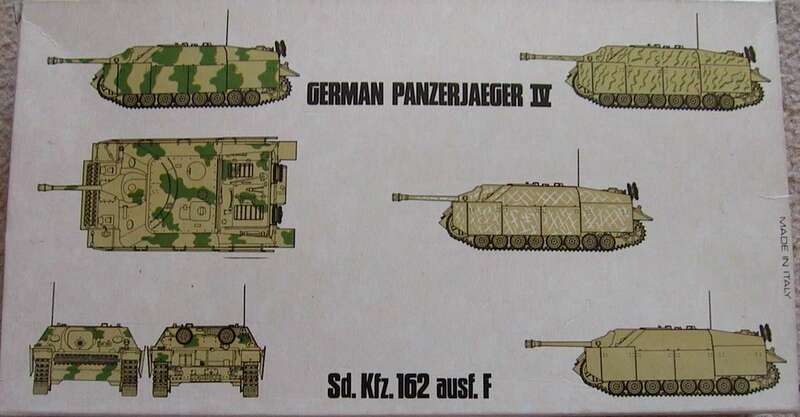 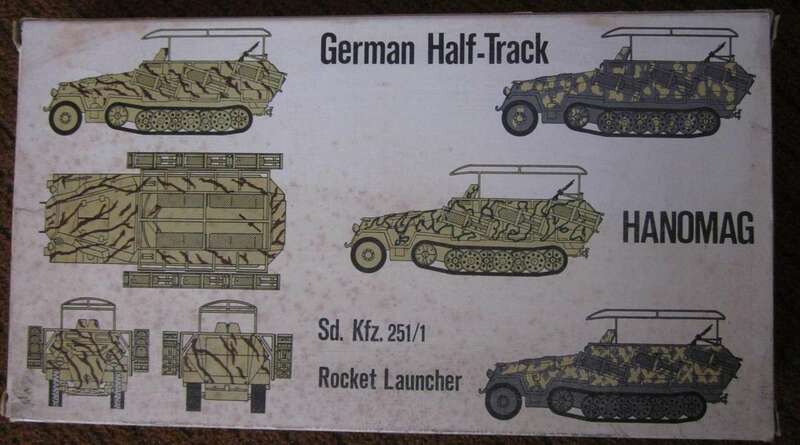 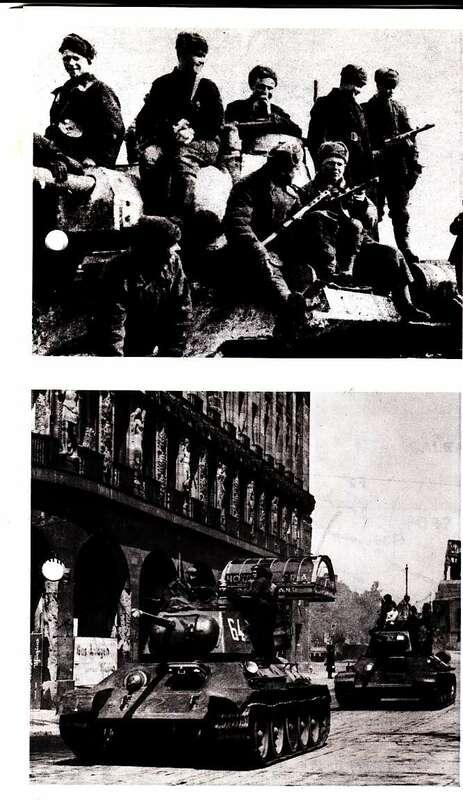 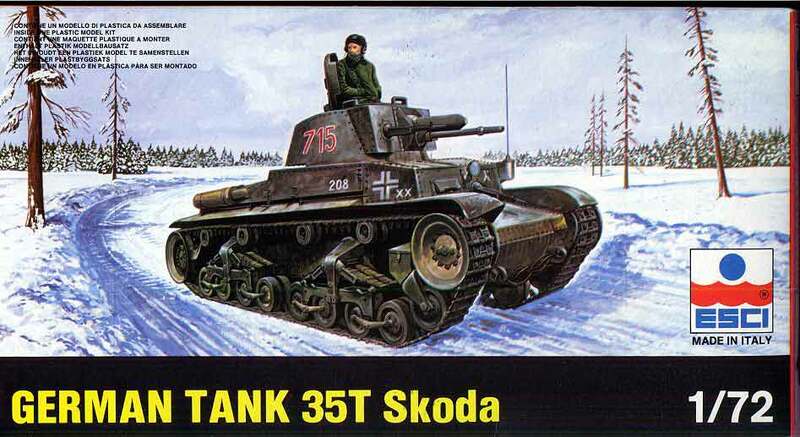 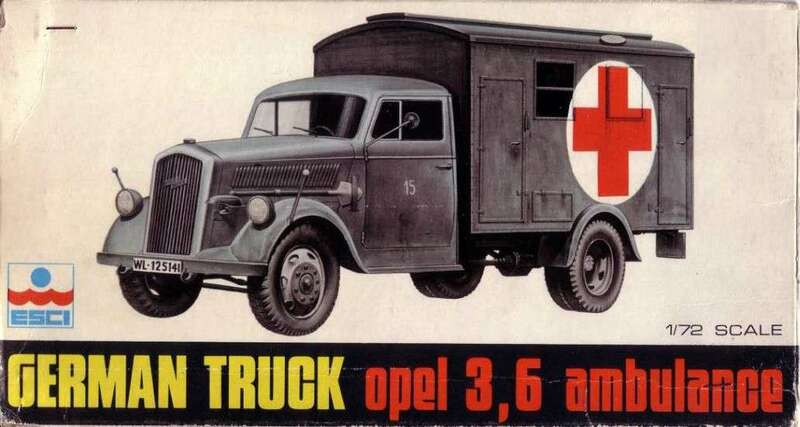 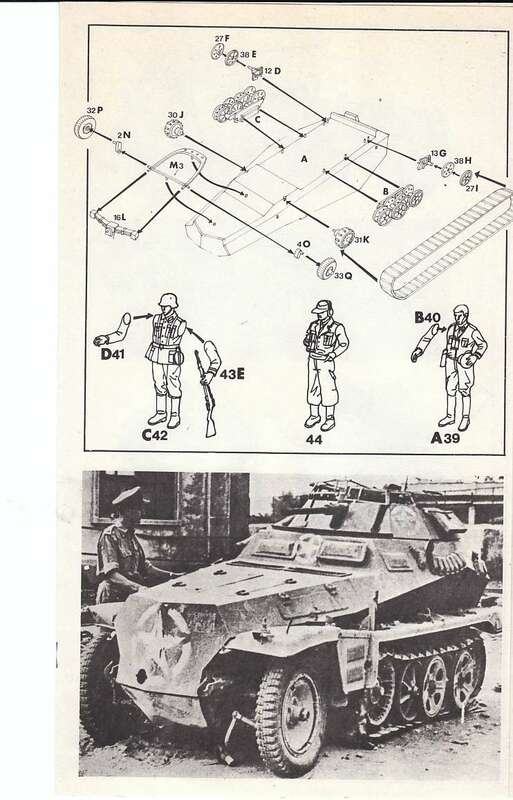 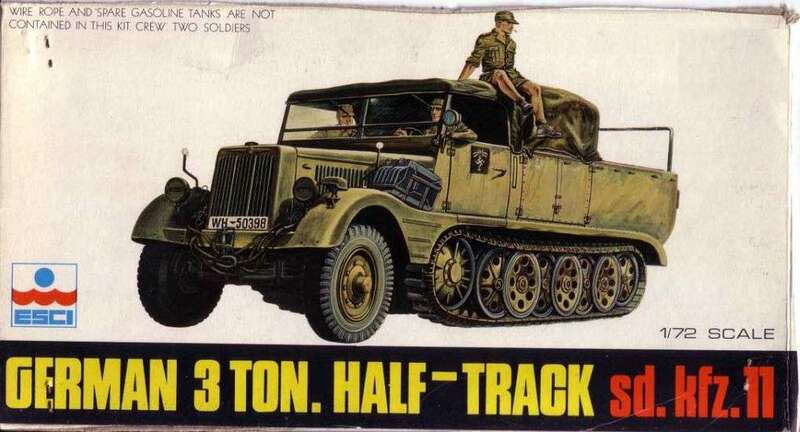 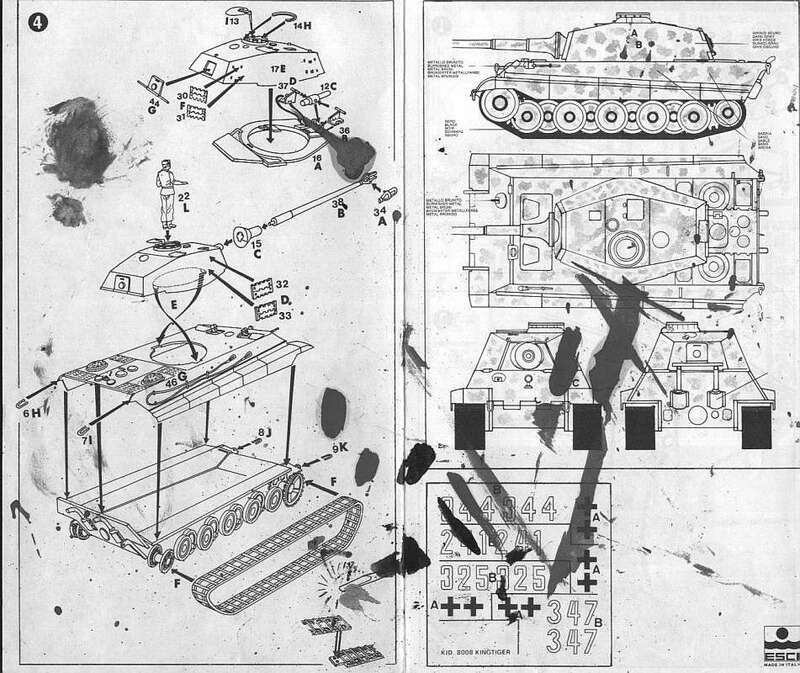 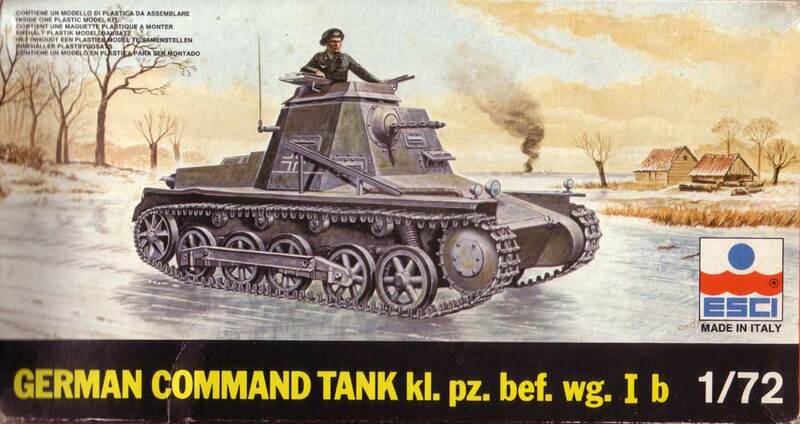 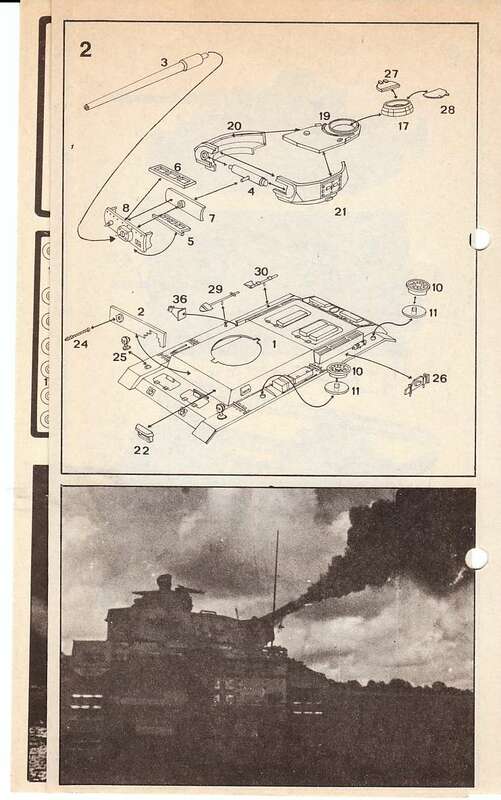 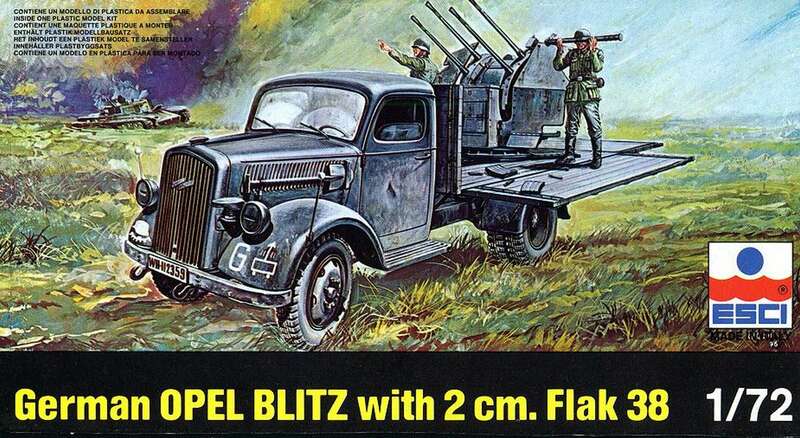 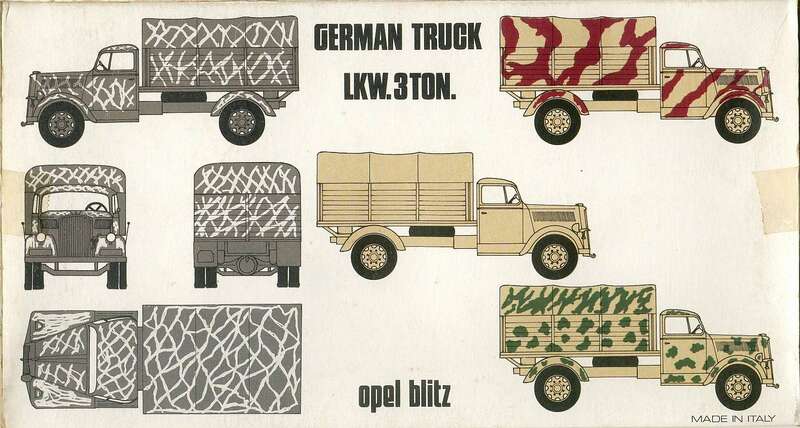 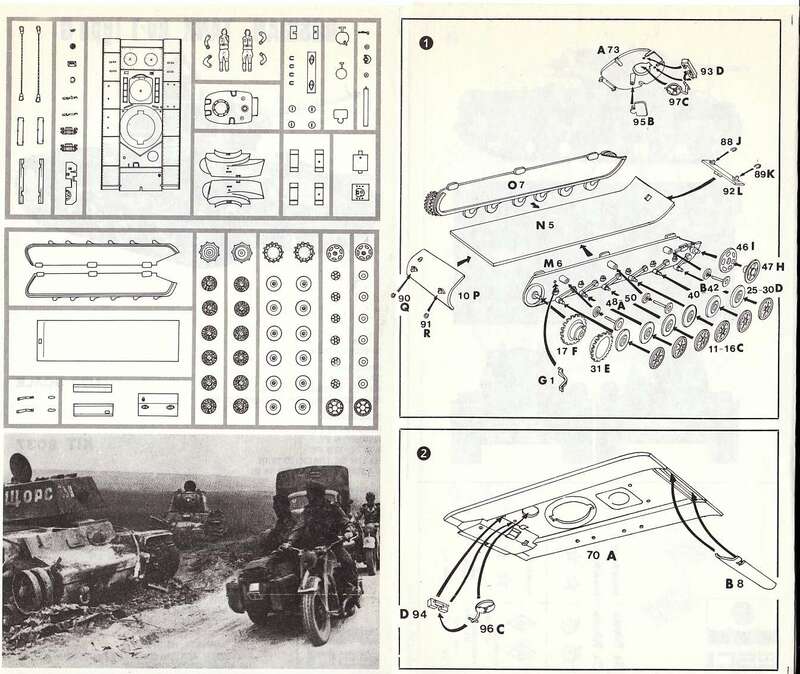 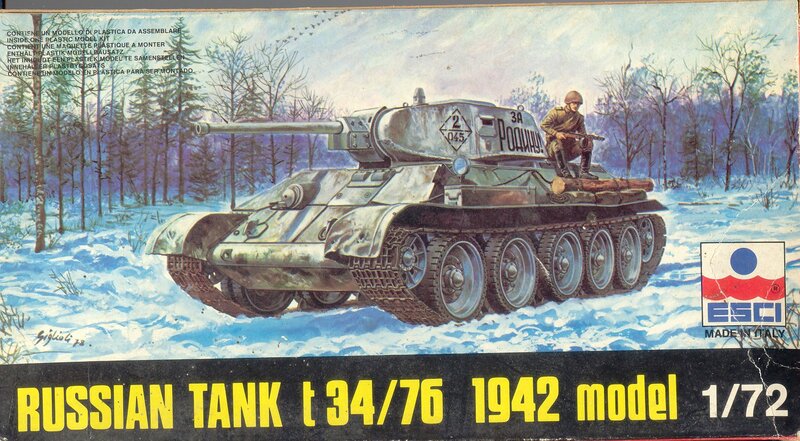 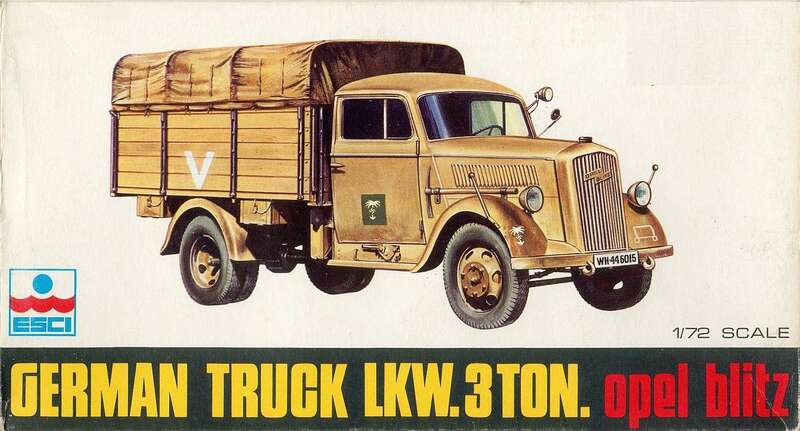 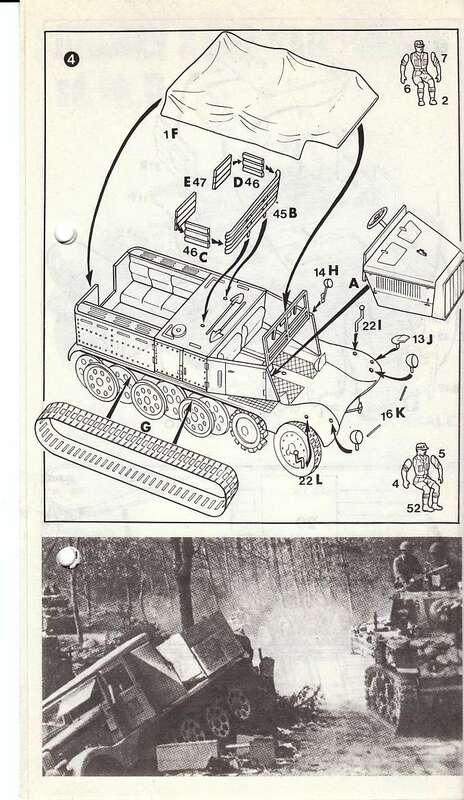 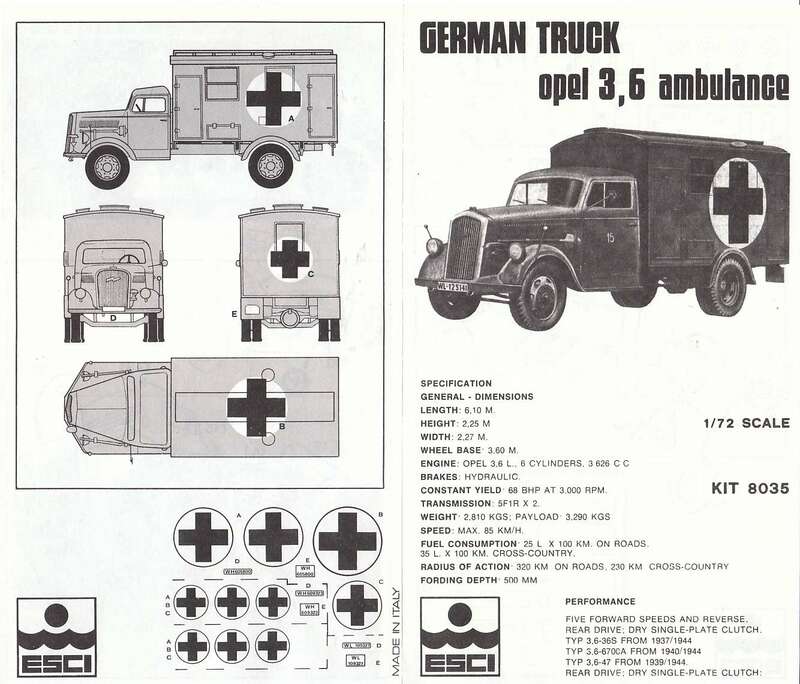 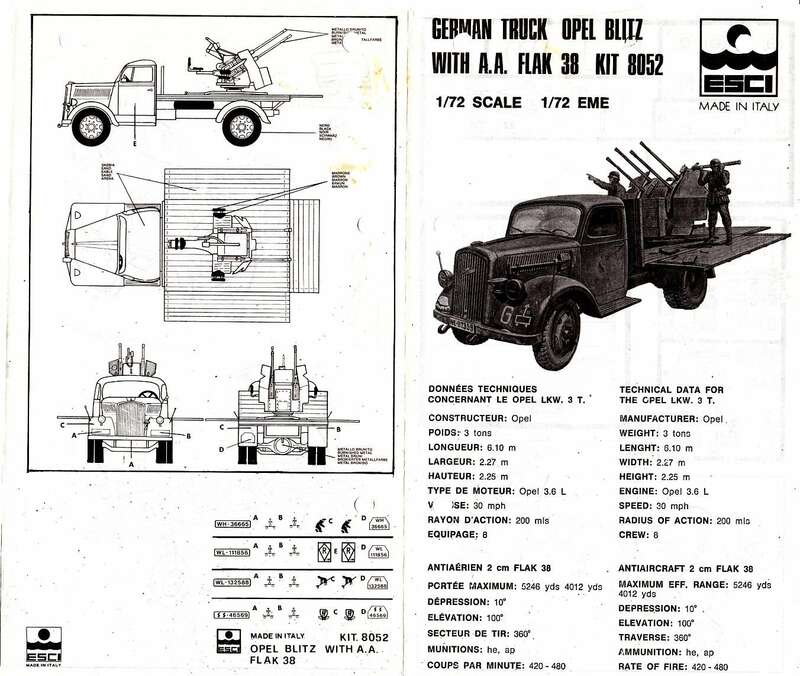 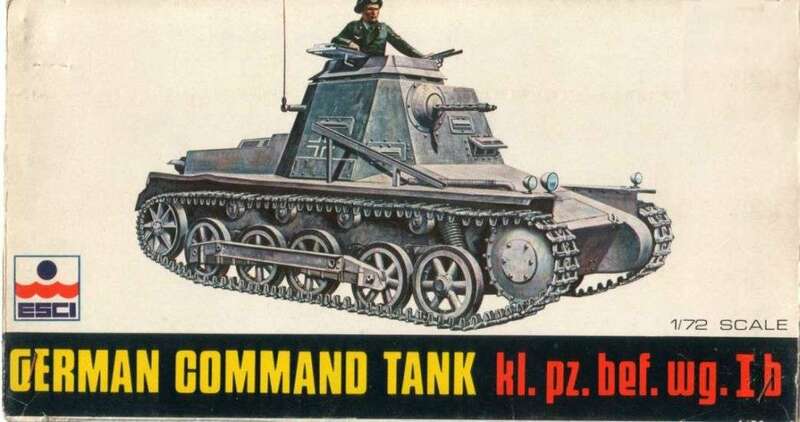 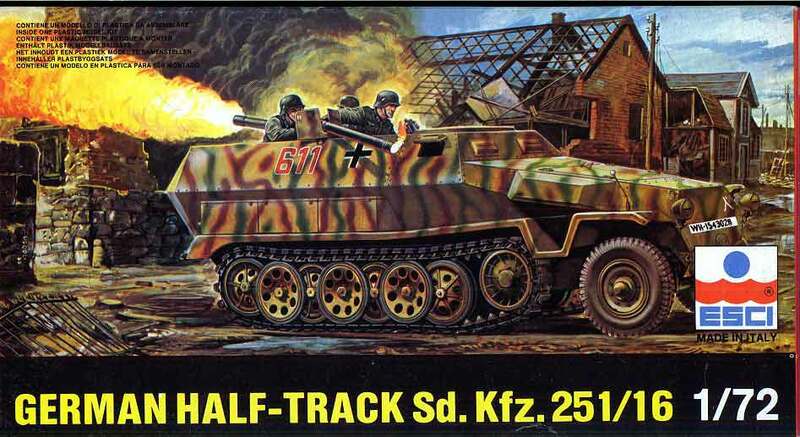 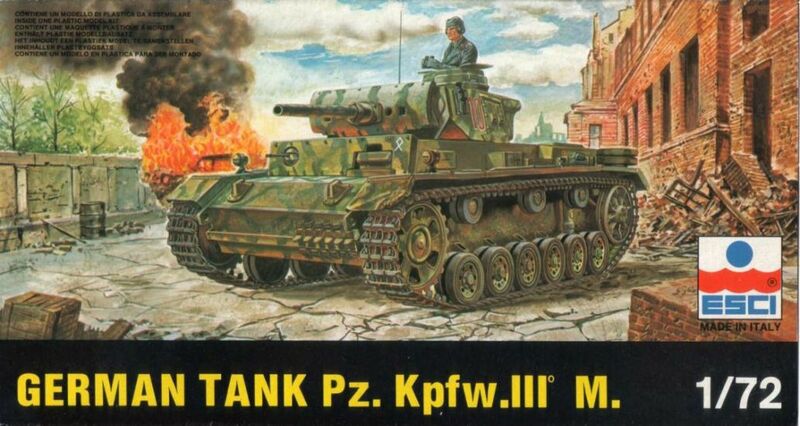 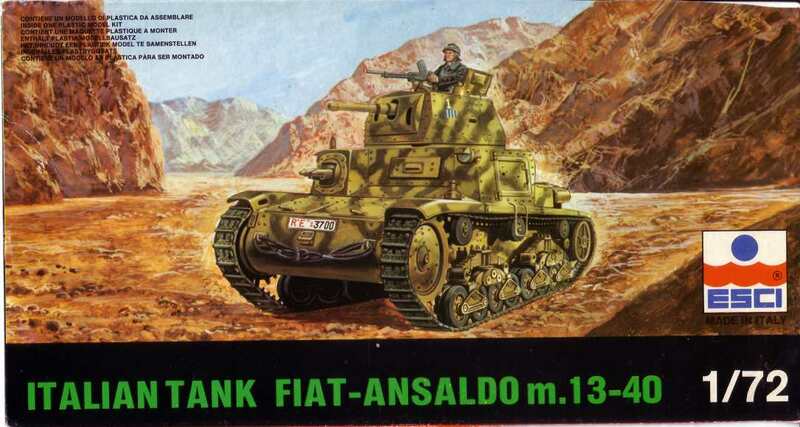 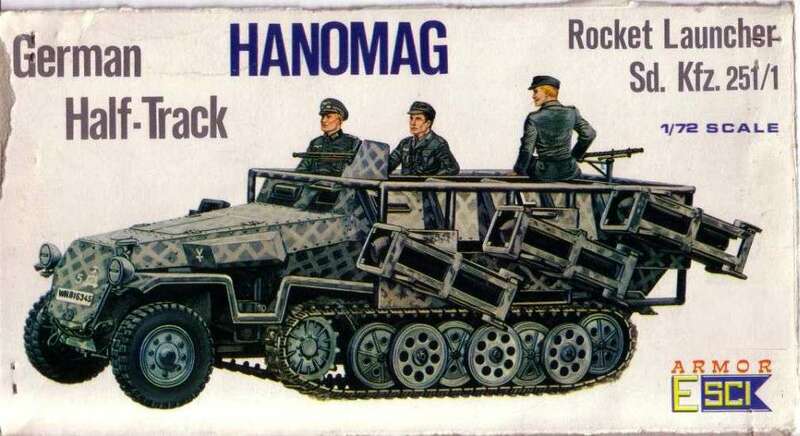 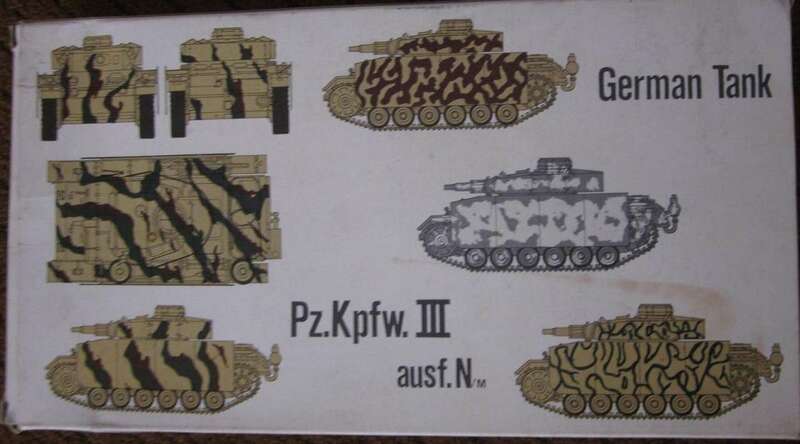 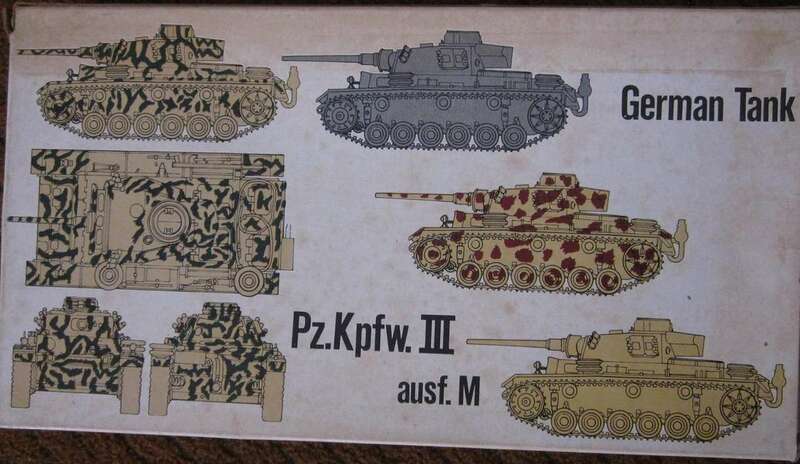 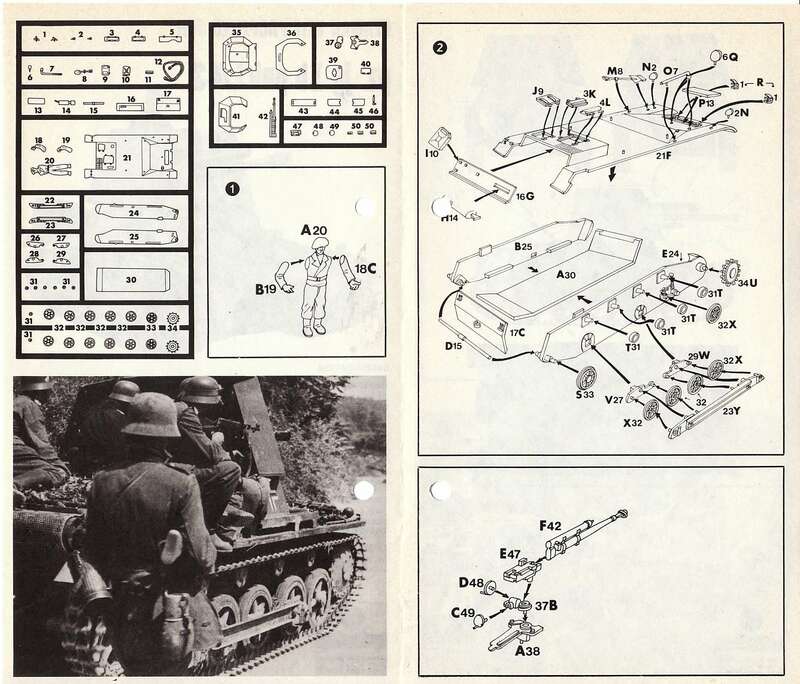 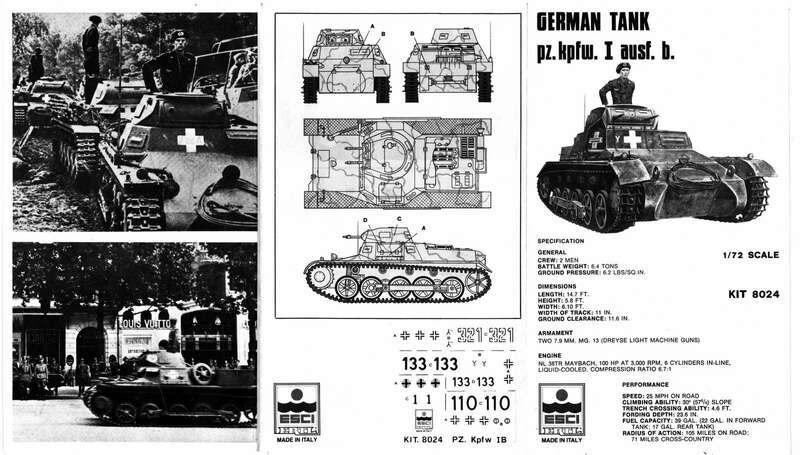 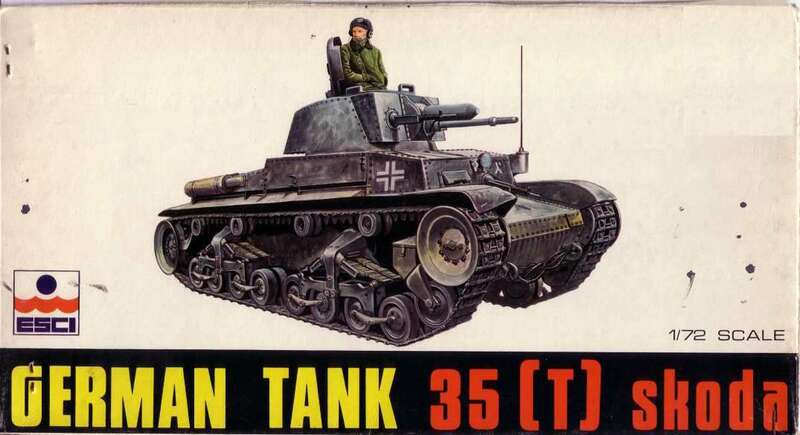 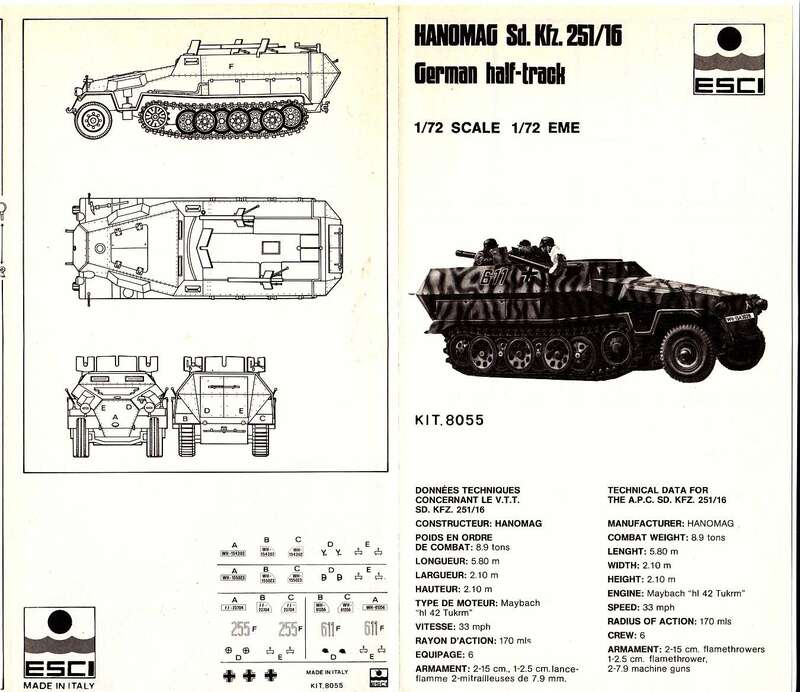 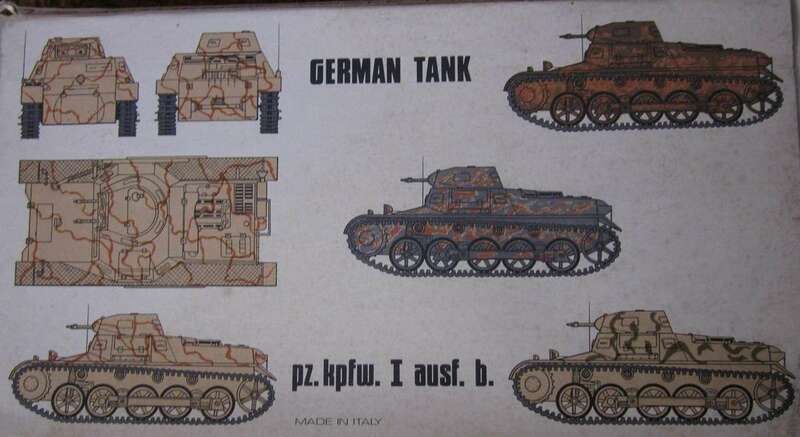 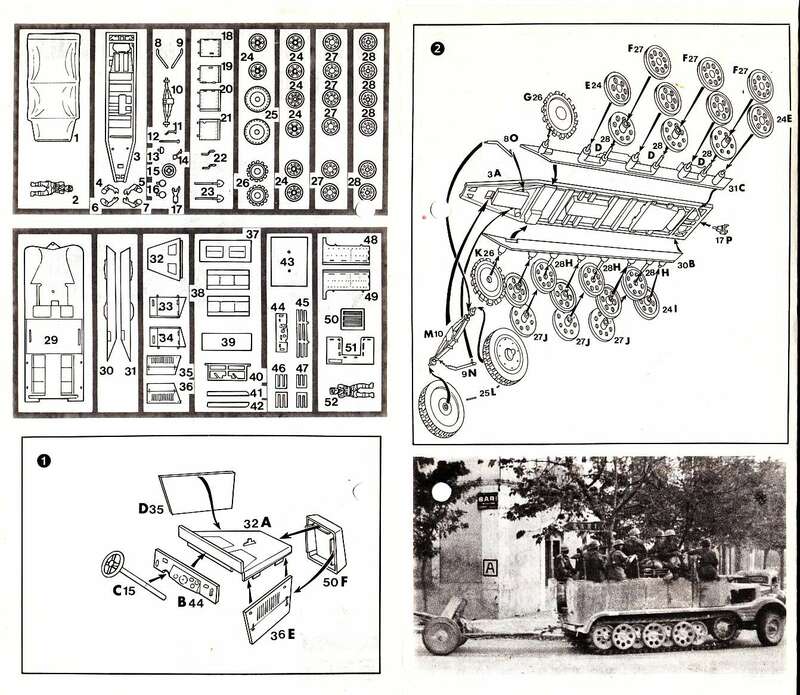 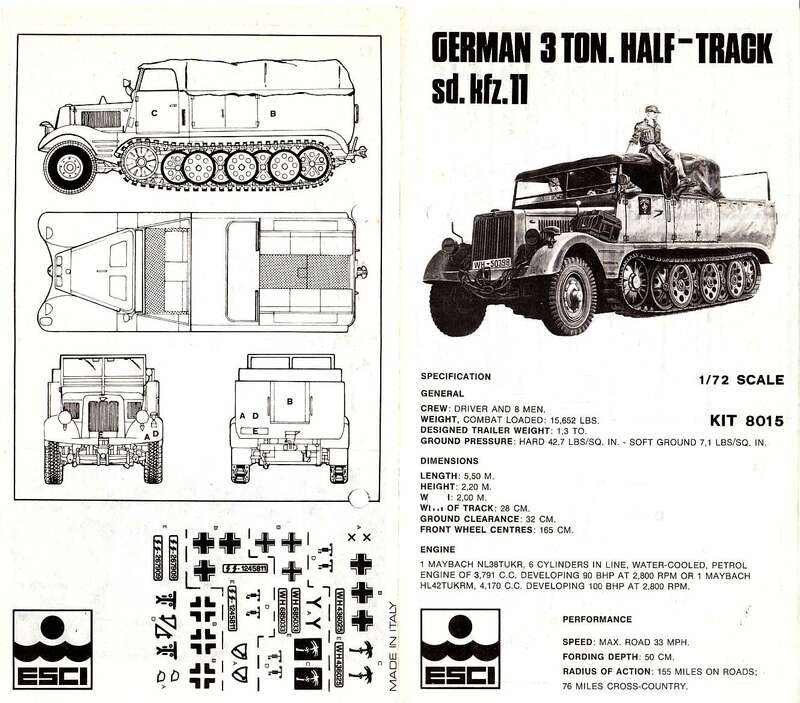 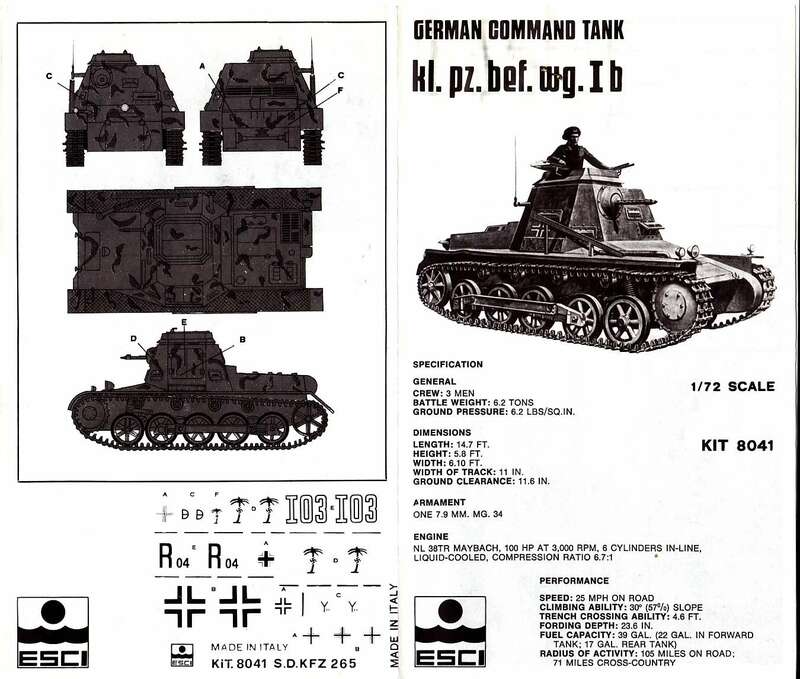 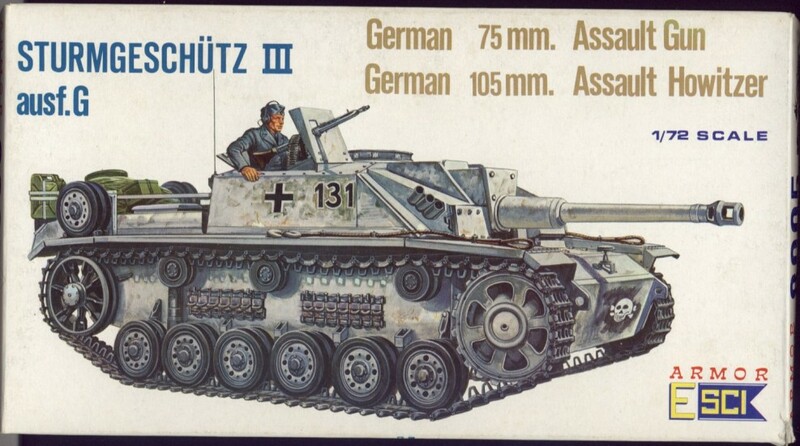 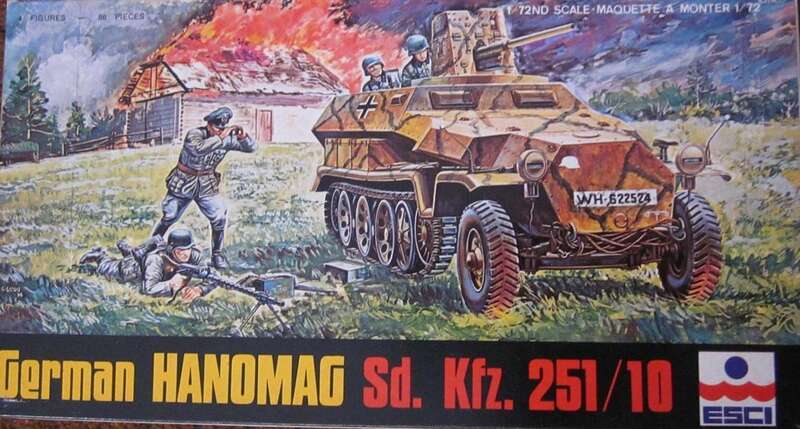 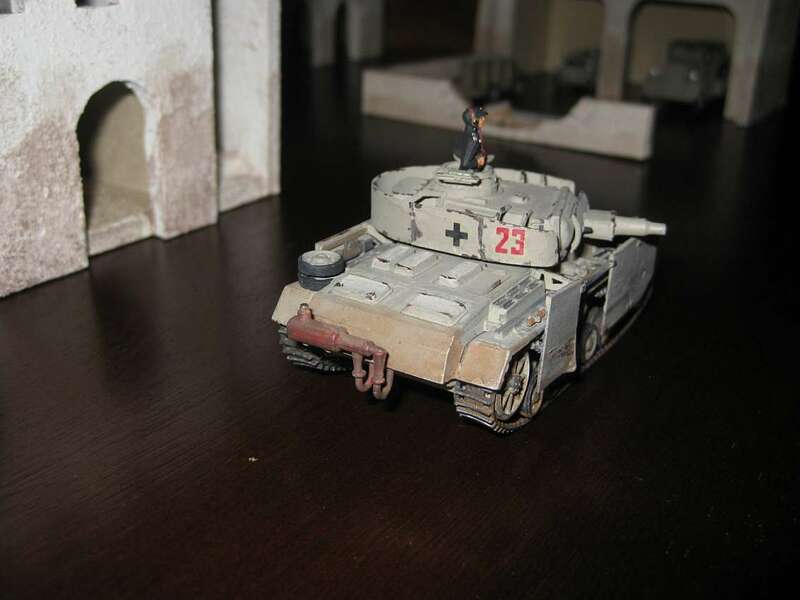 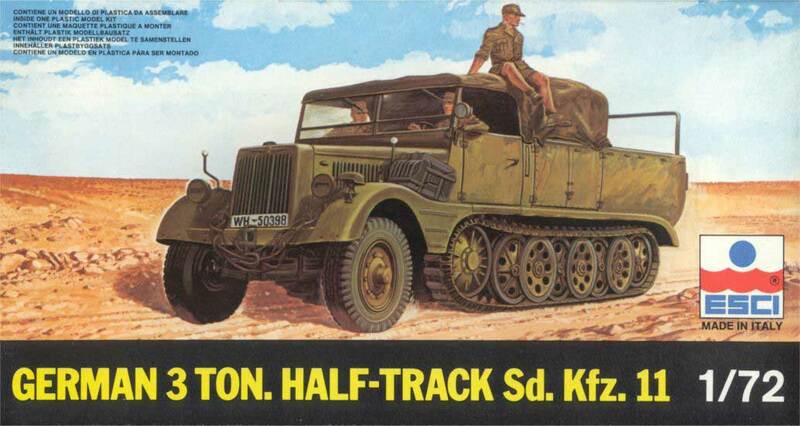 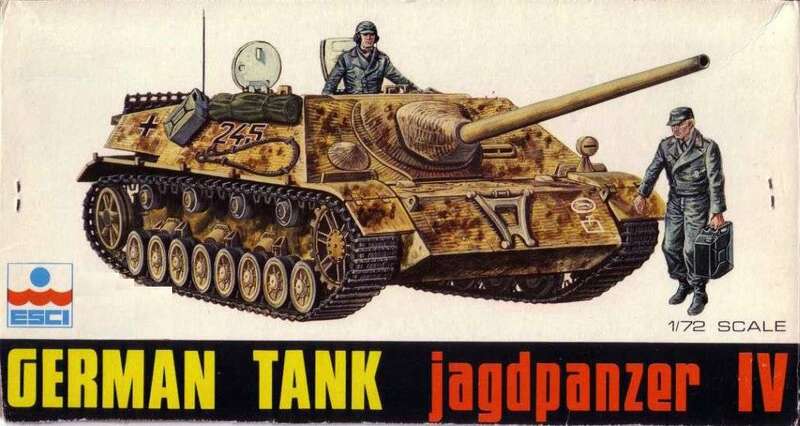 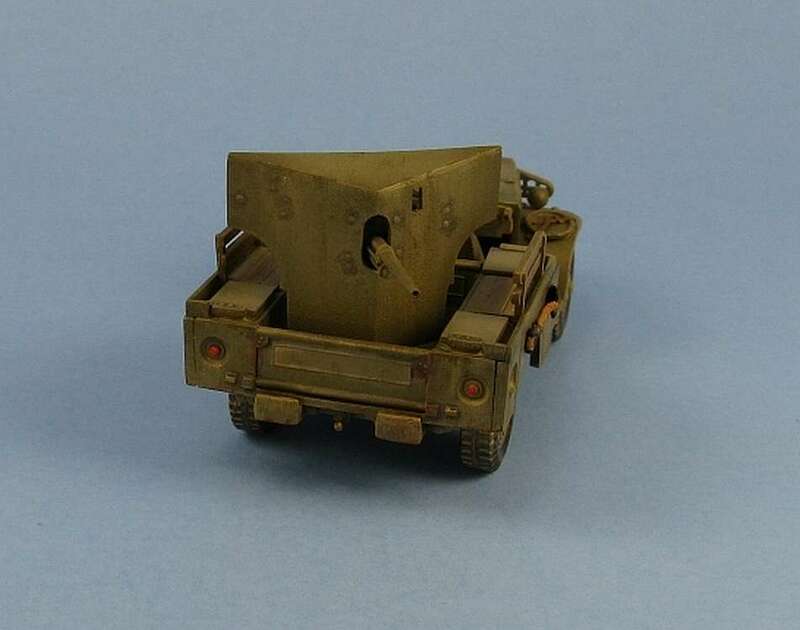 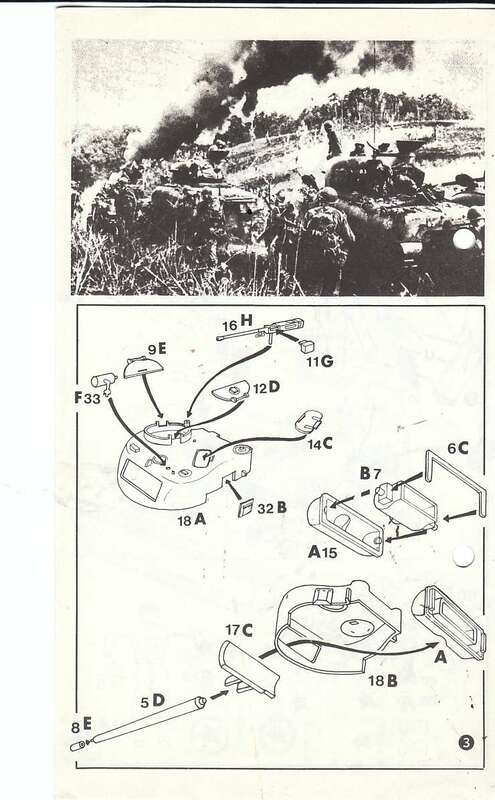 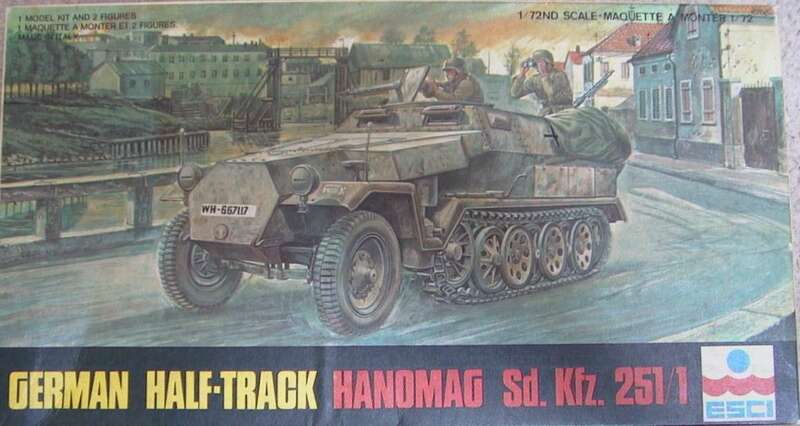 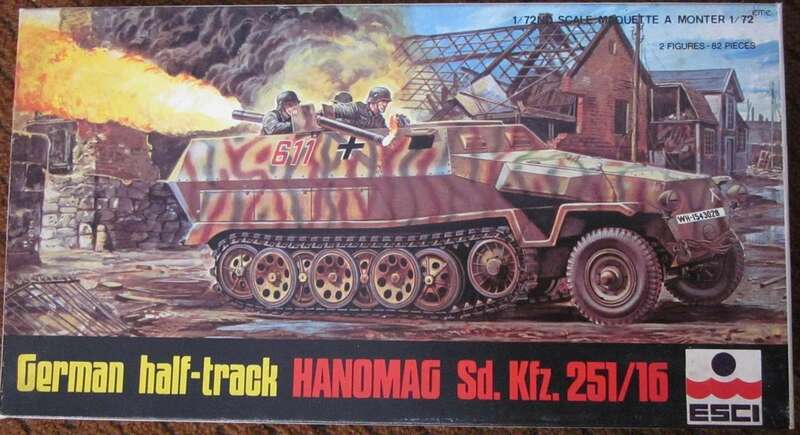 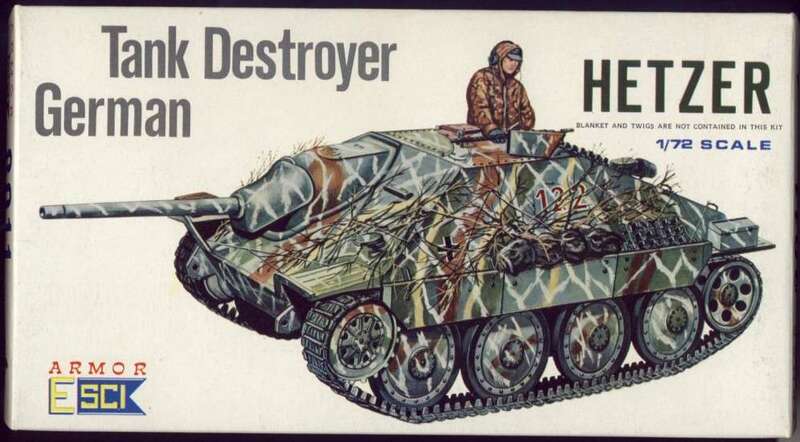 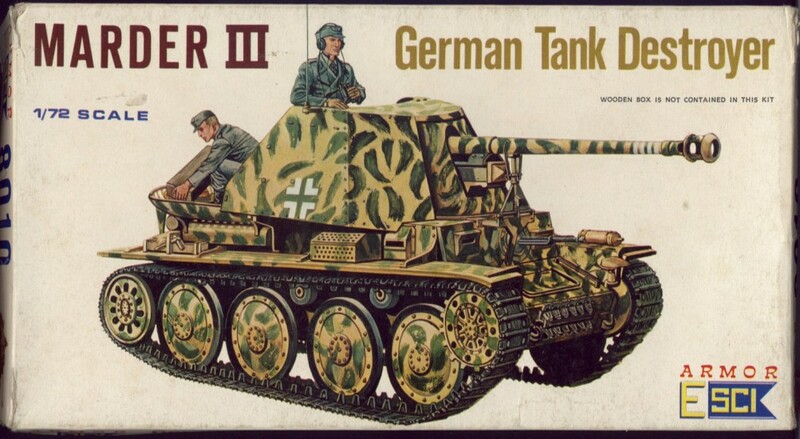 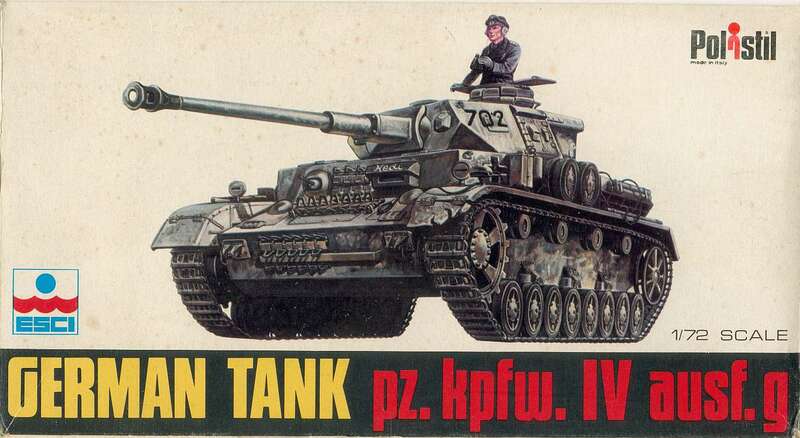 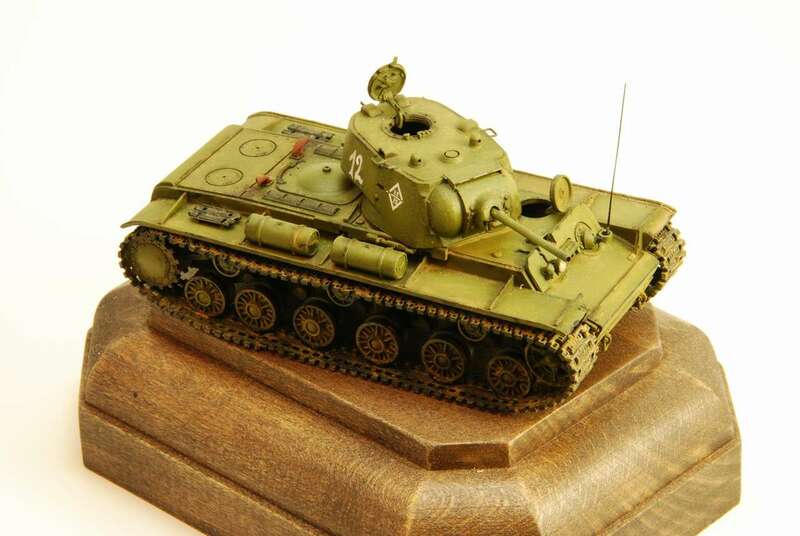 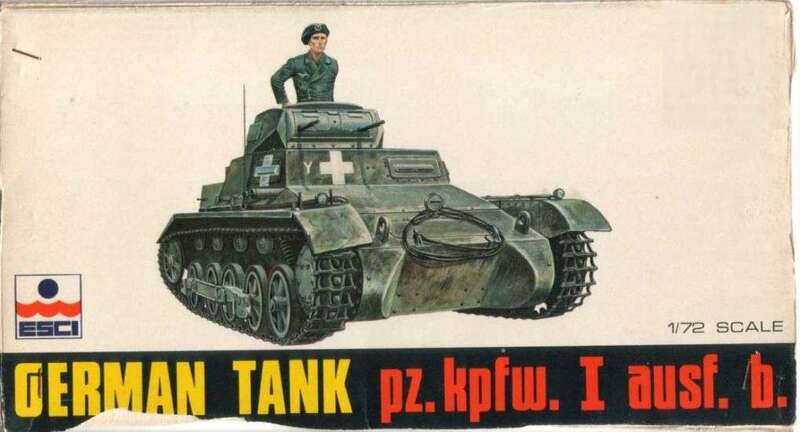 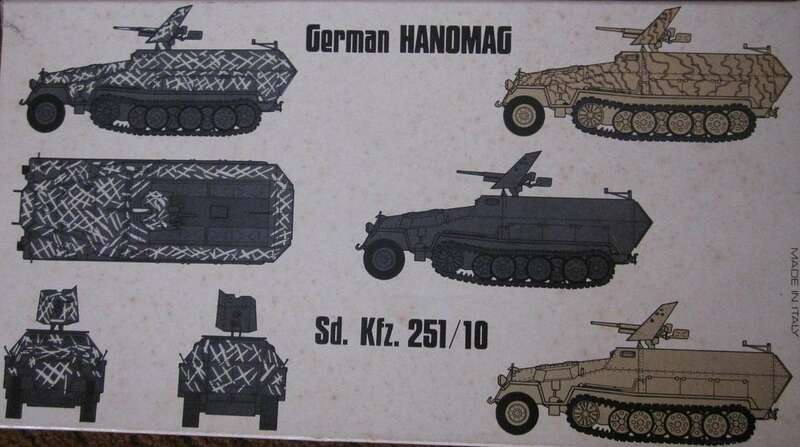 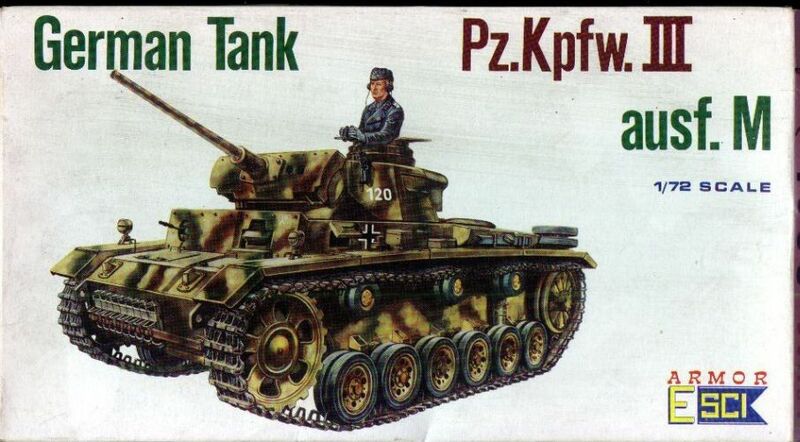 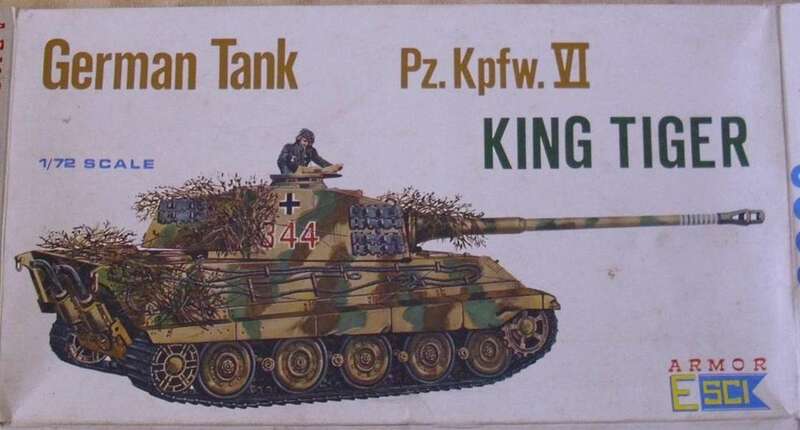 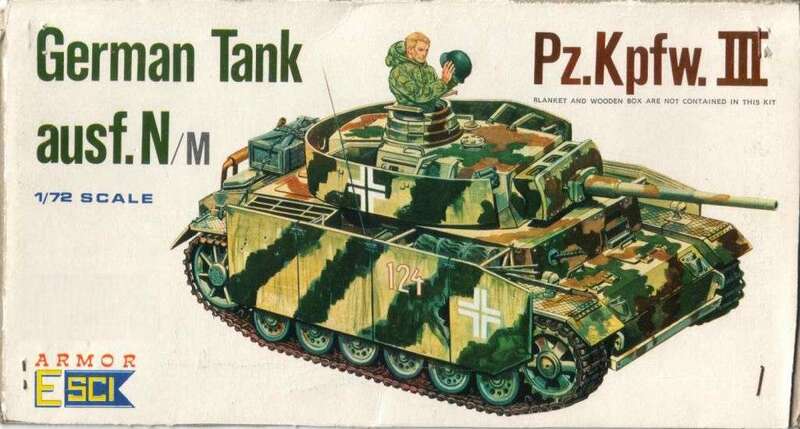 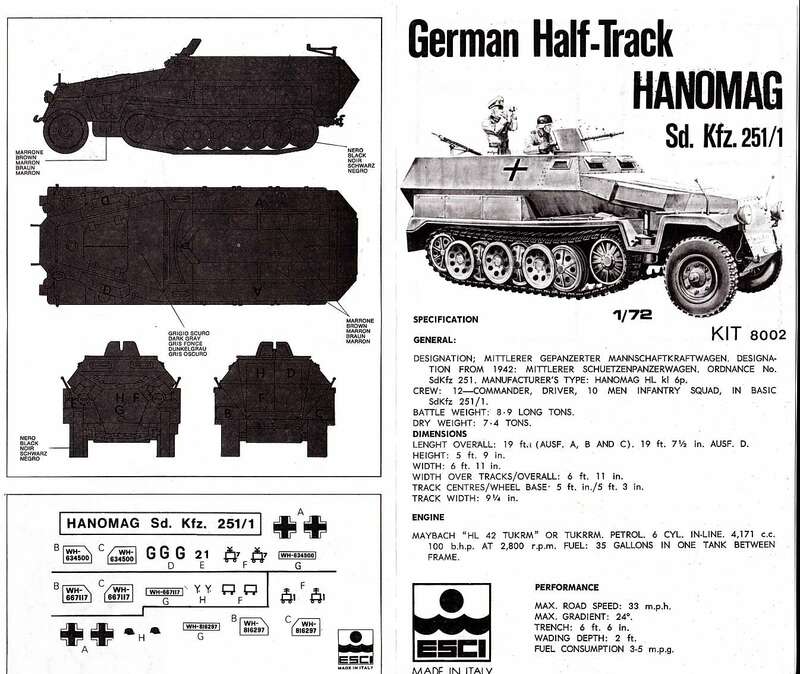 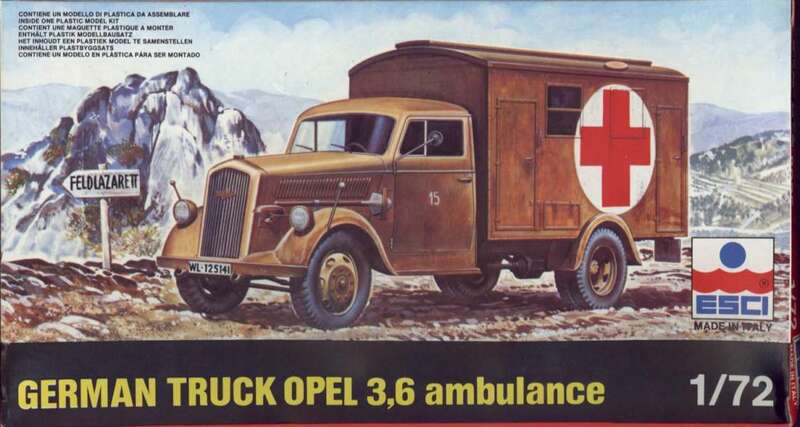 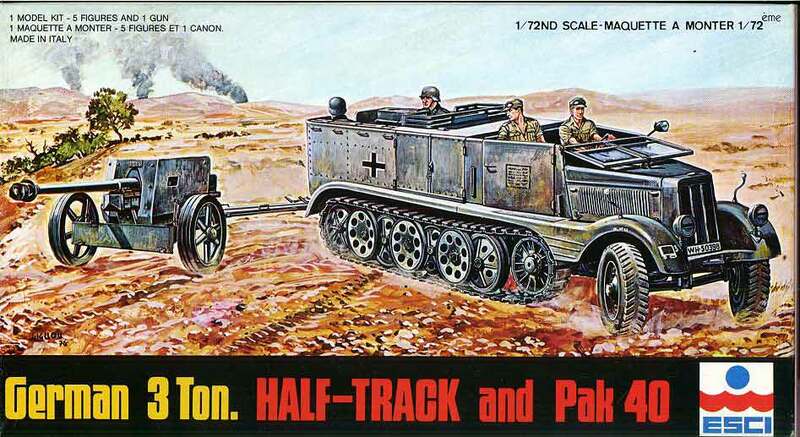 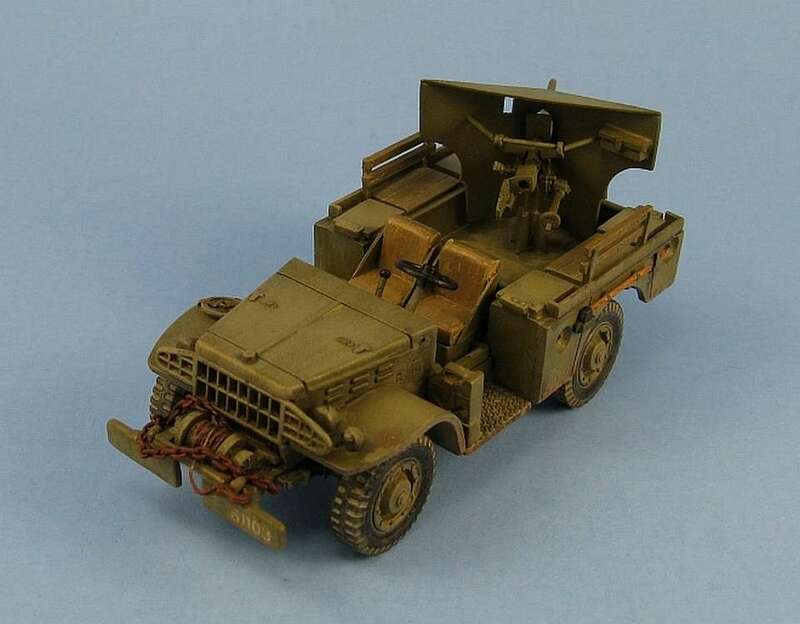 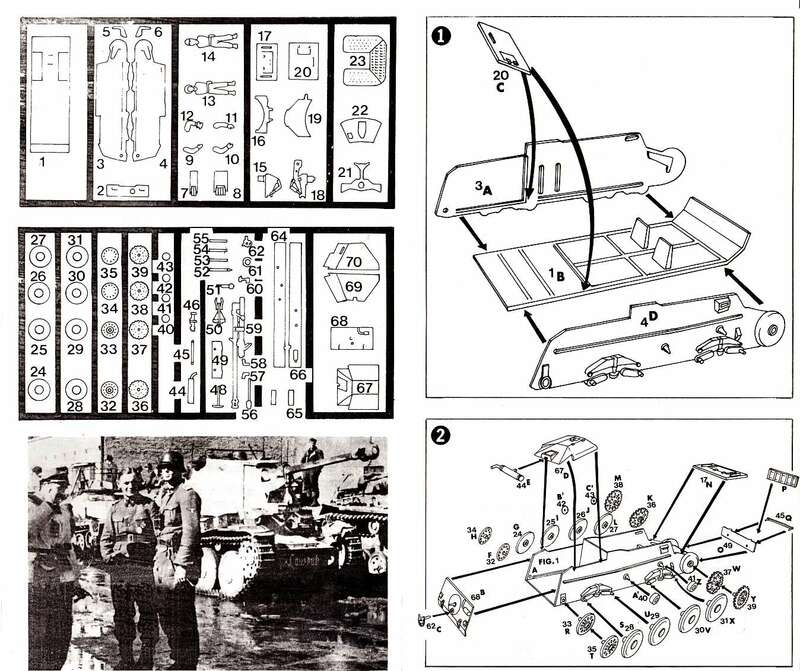 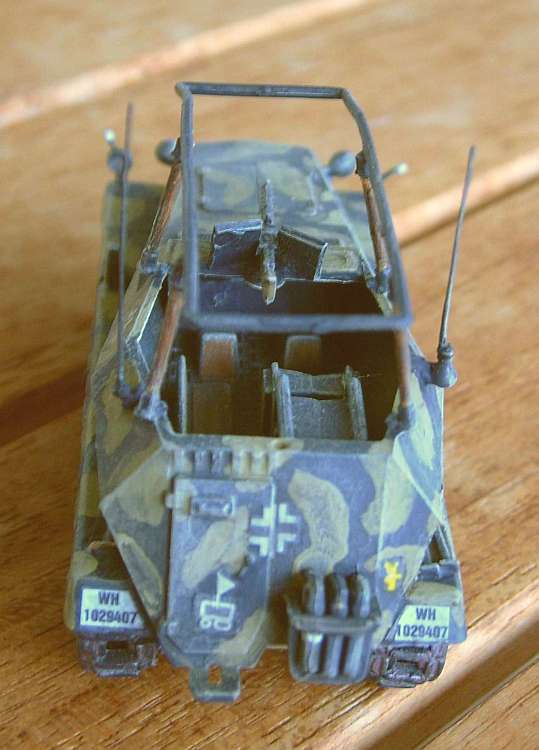 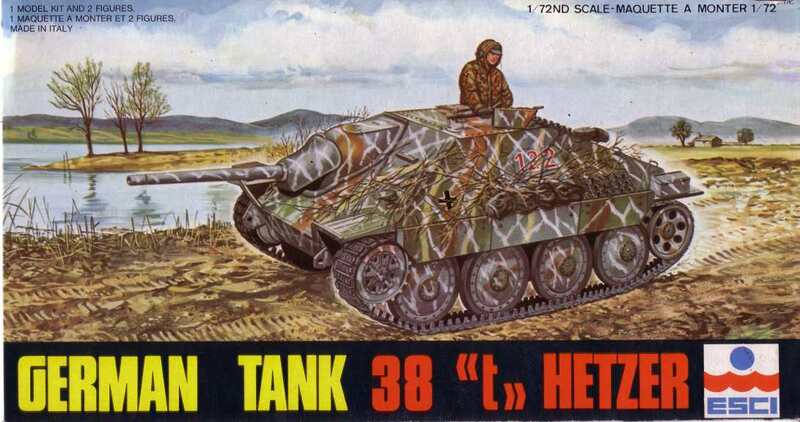 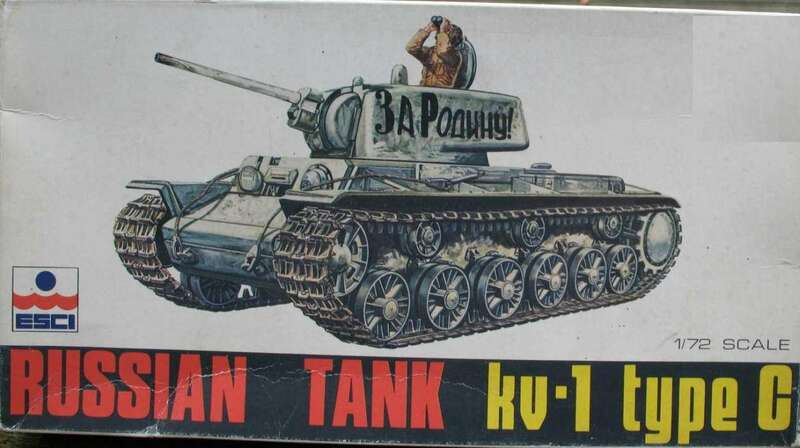 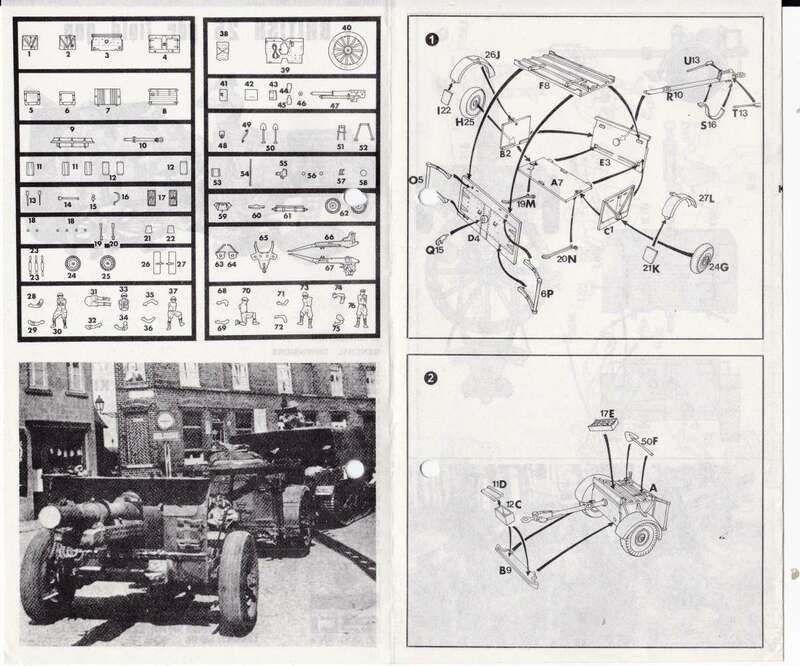 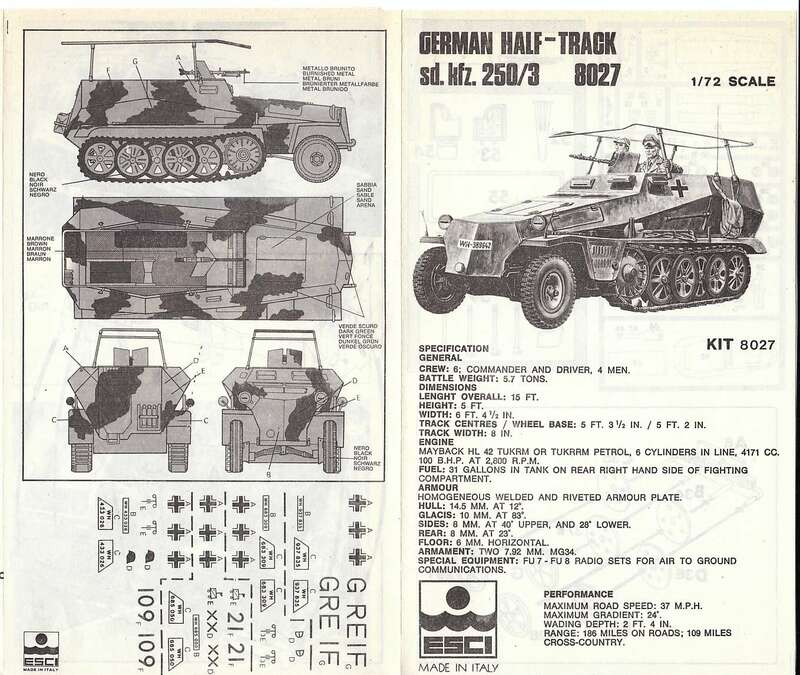 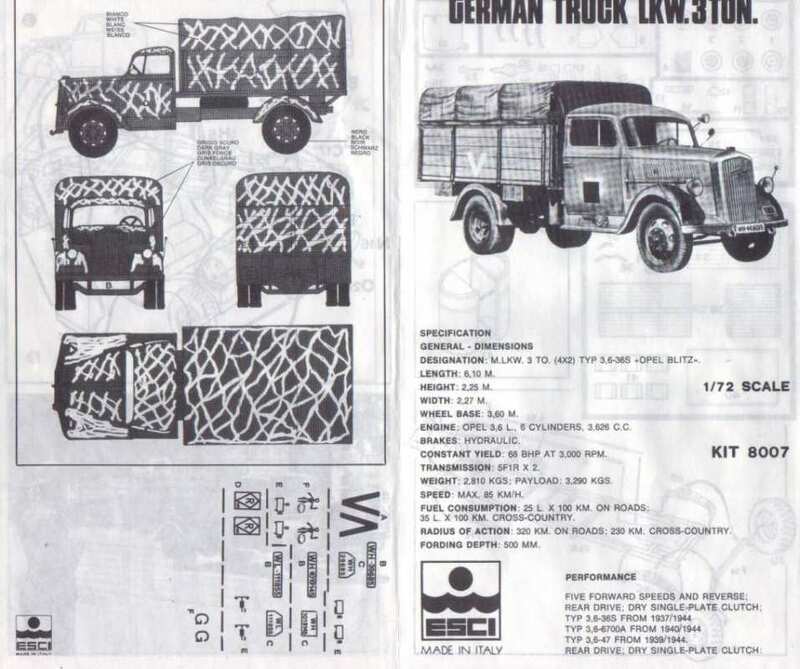 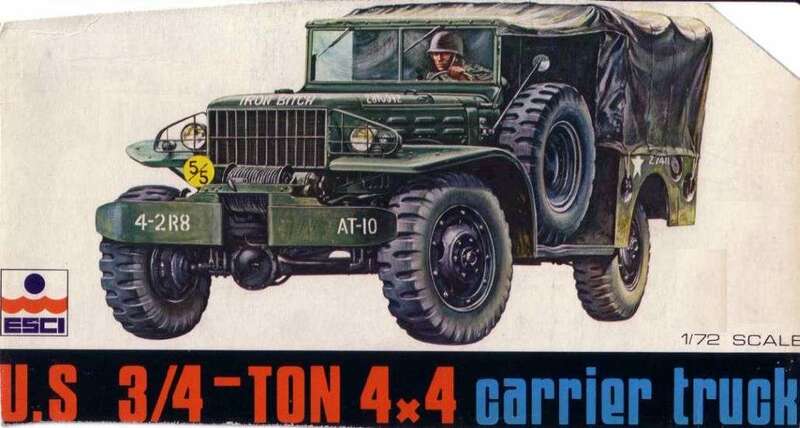 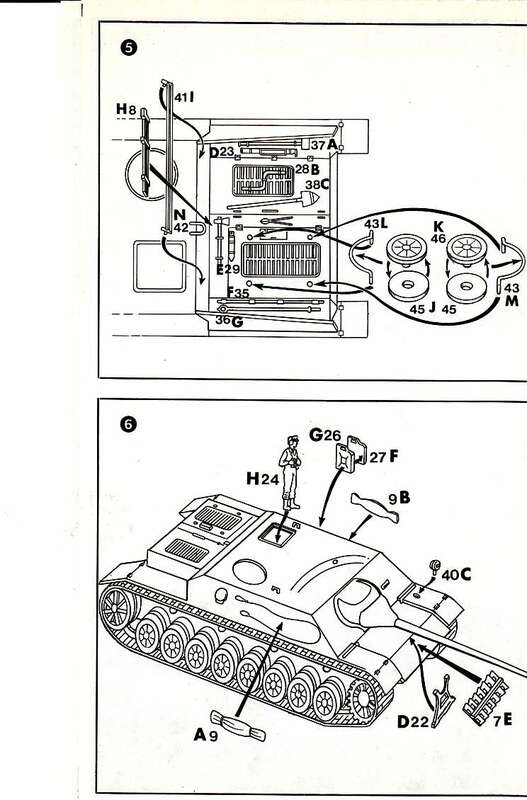 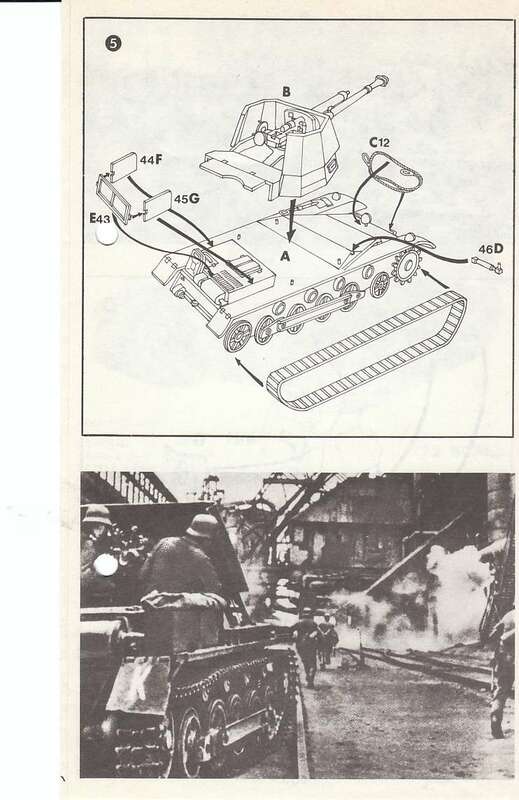 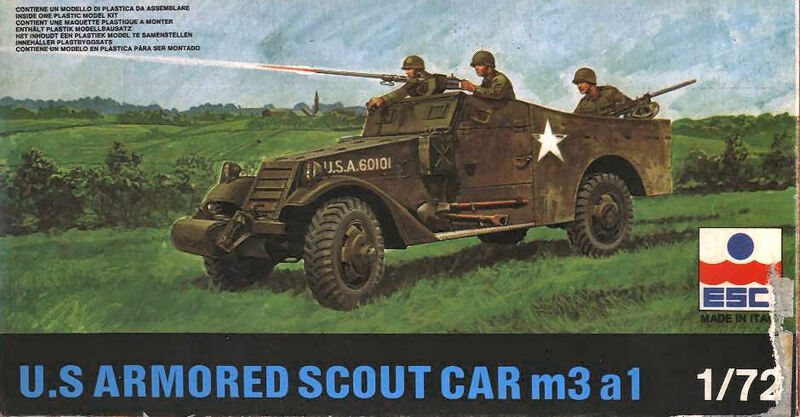 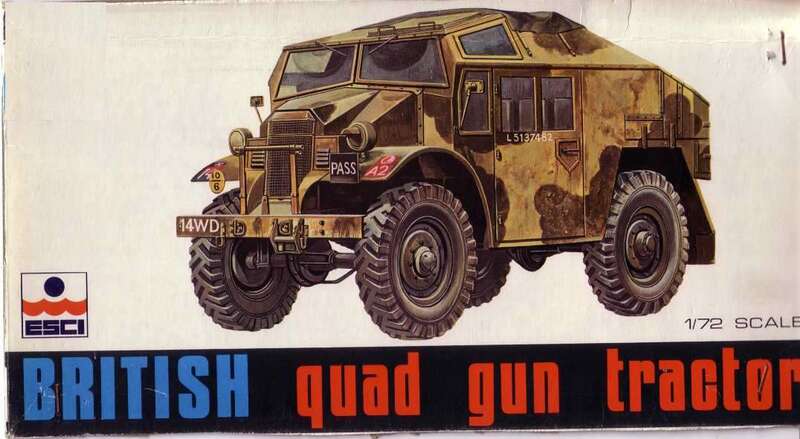 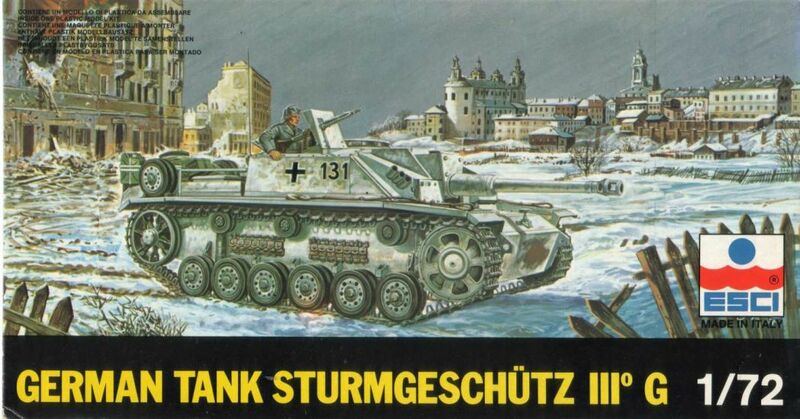 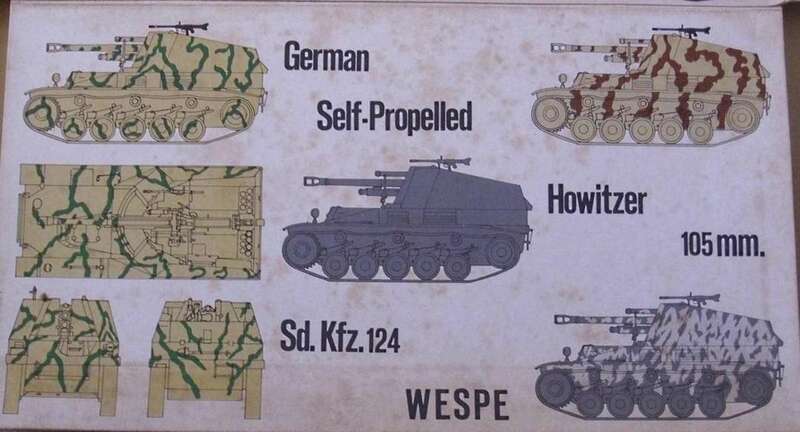 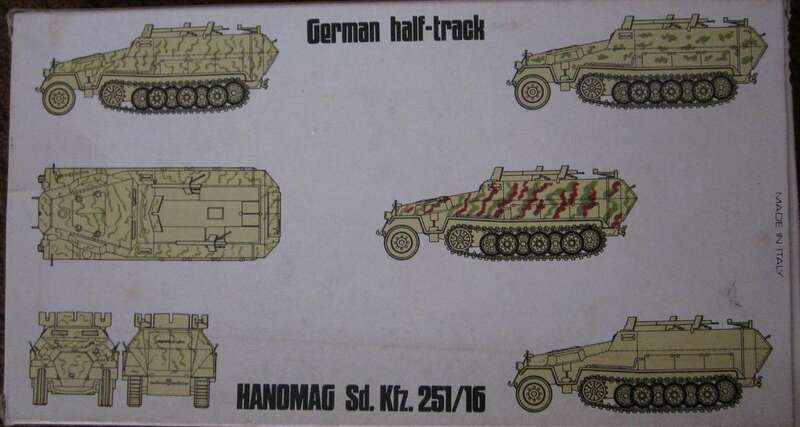 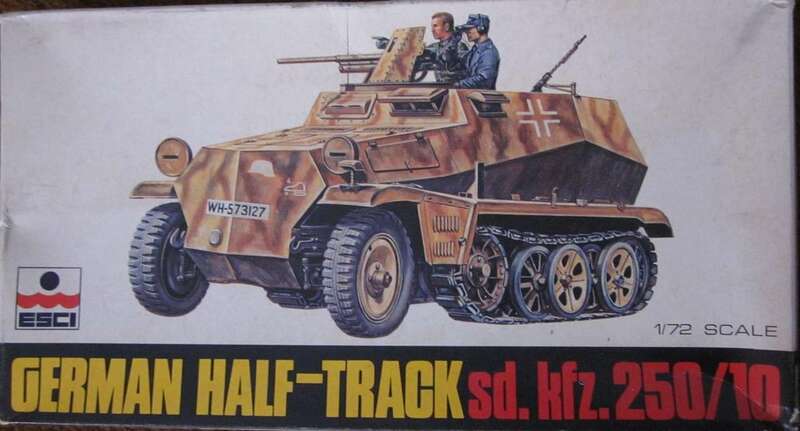 The first releases have the "ARMOR" logo on the box, the highest numbered one beiing the SdKfz 251/1 mit Wurfrahmen (8022). 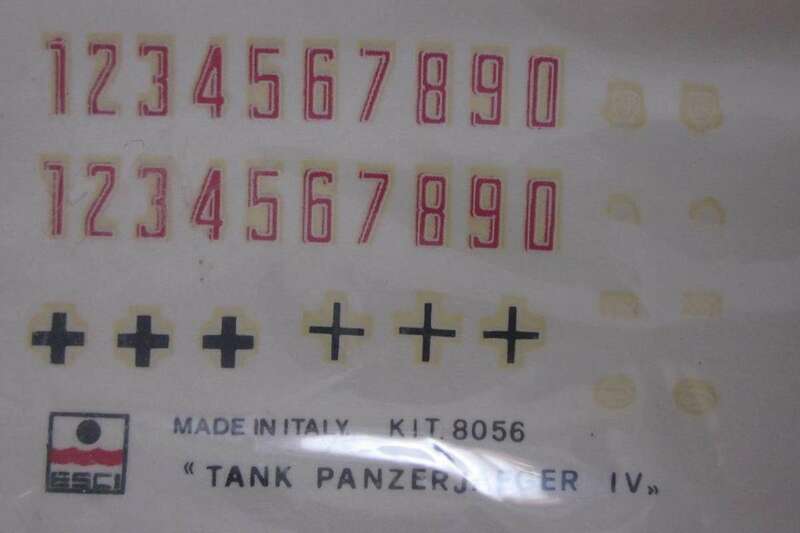 But not all numbers are released in sequence, so some numbers below 8022 are produced with a slightly different box : no "ARMOR" logo but a black edge with the kitname and a nationality flag on the side. 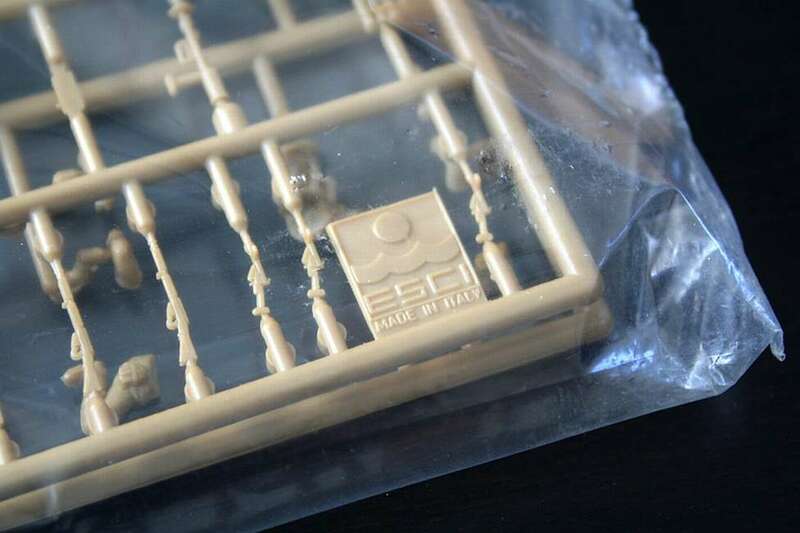 These are called Esci white box 8000 Flag series. 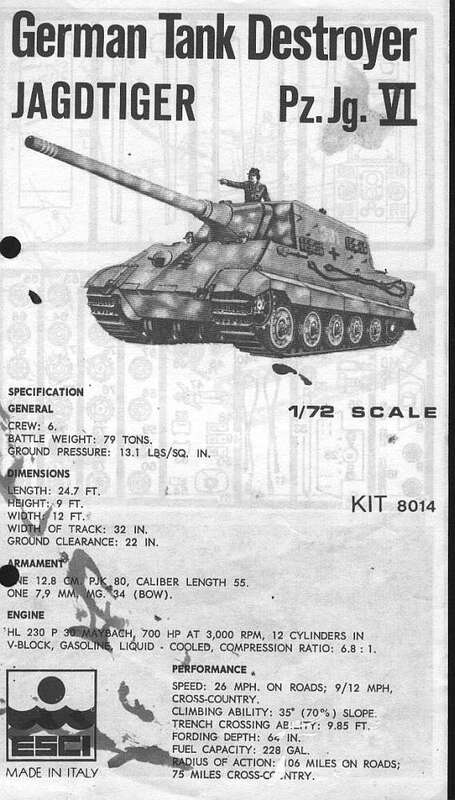 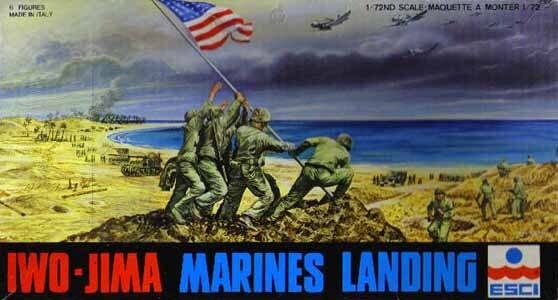 The highest Flag" number is probably the Dodge 37mm M6 AT (8040). 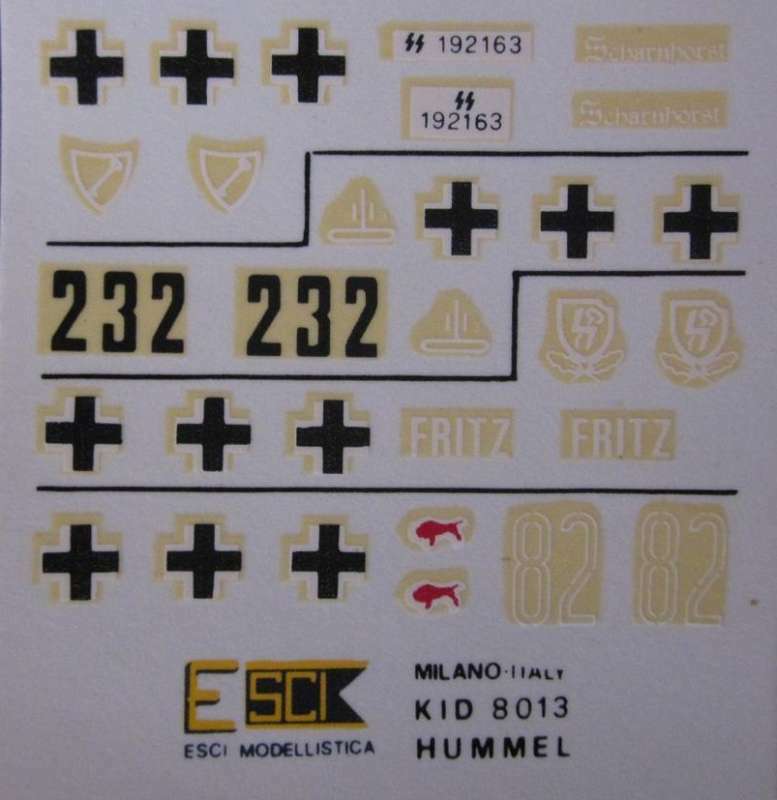 Again the releases are out of sequence as below this number starts the third different box type : These still have the white front with black kit name edge but the flag is replaced by a black square with Esci logo annd kitnumber. 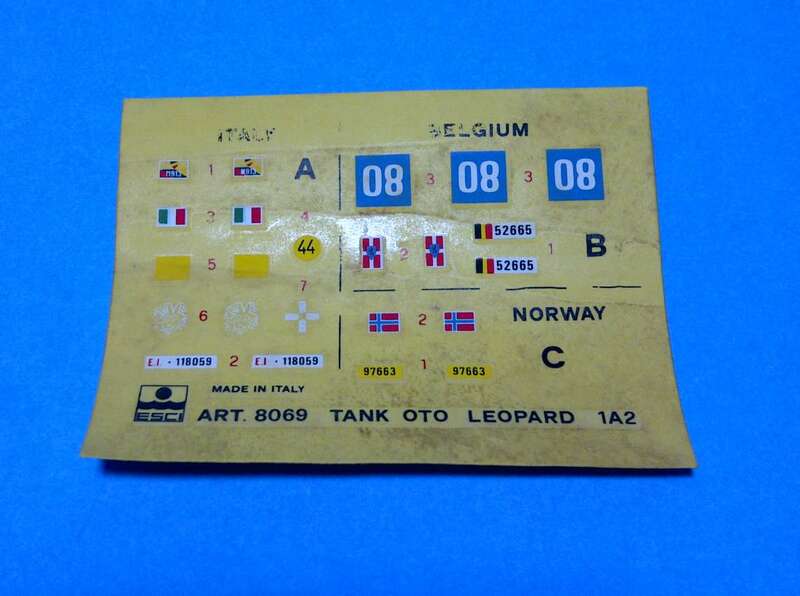 Possibly the kitnumbers 8038, 8039 and 8040 exsist in both "FLAG" and black square variant. 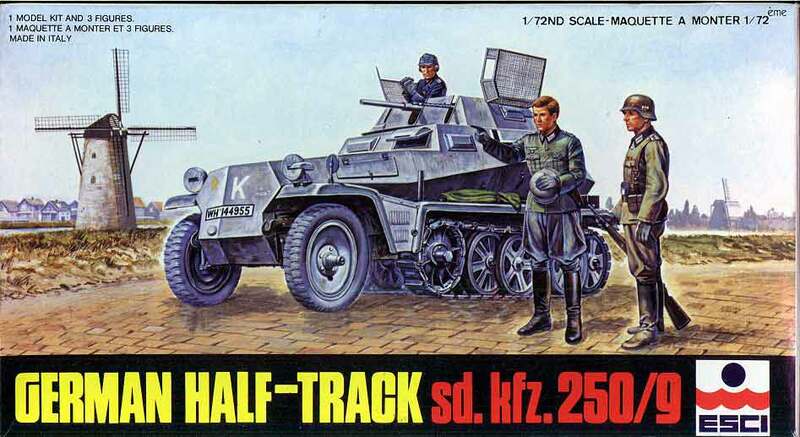 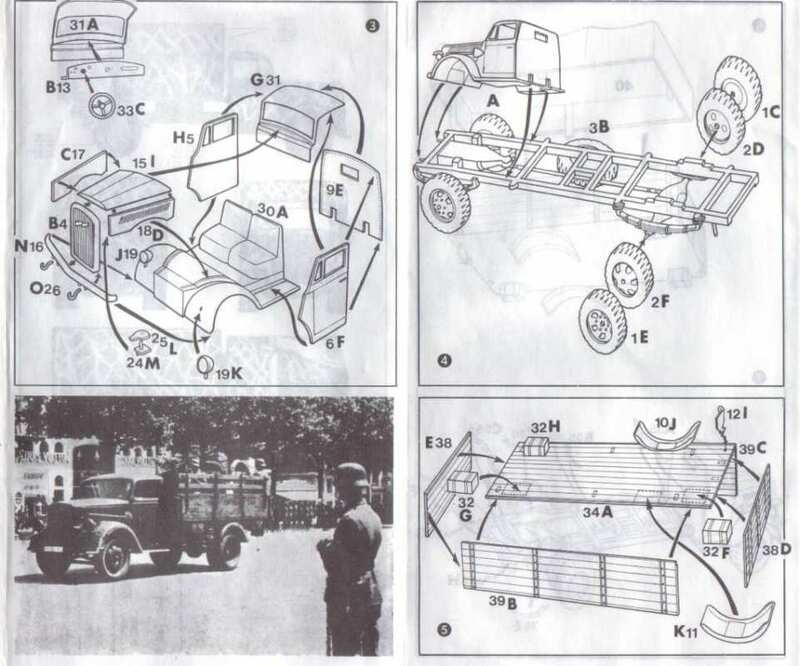 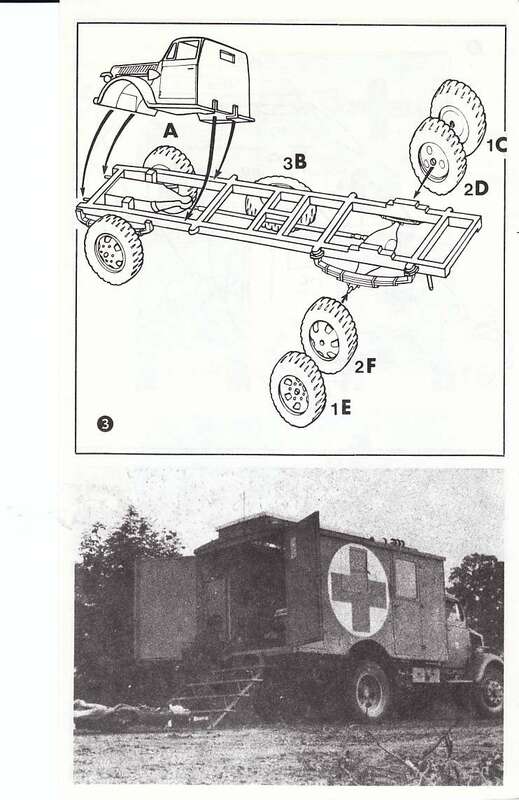 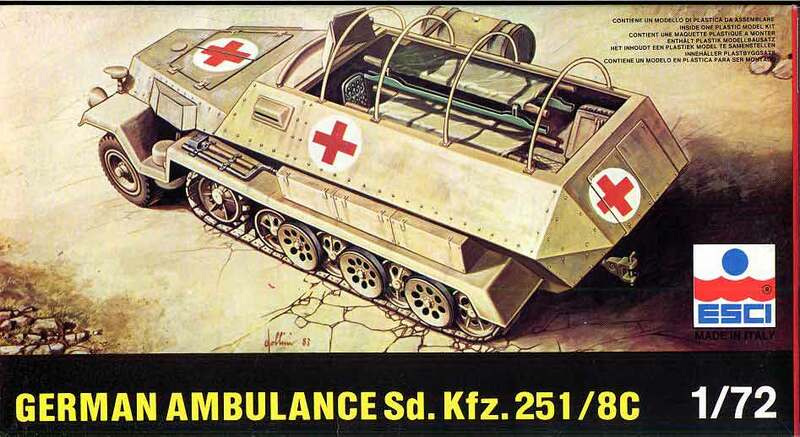 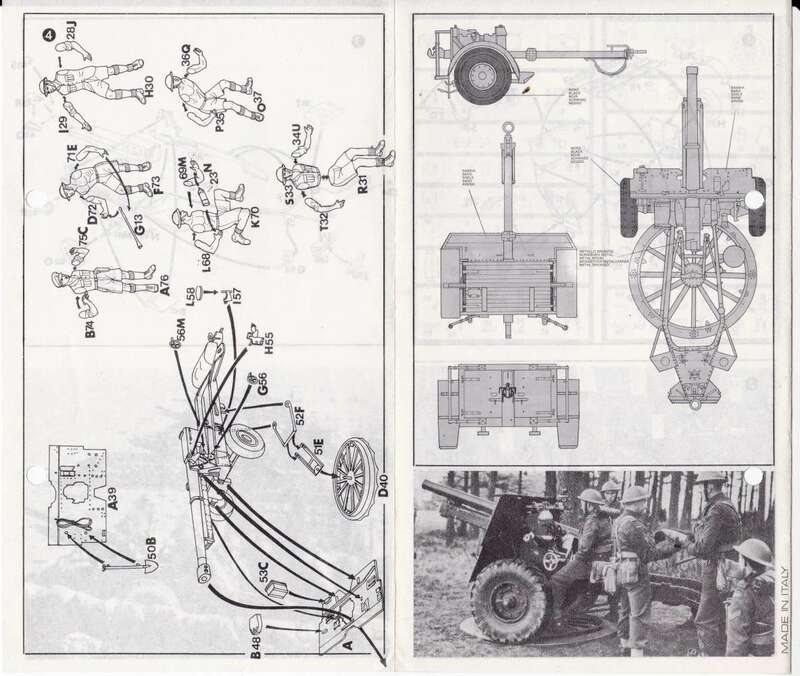 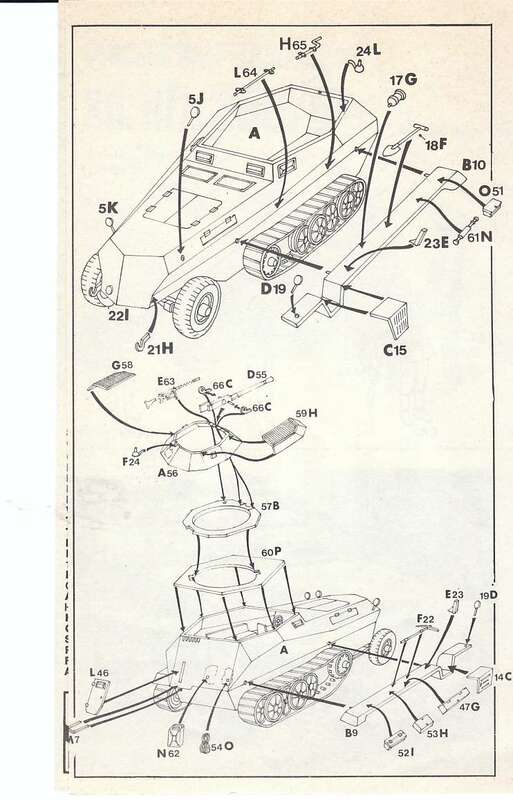 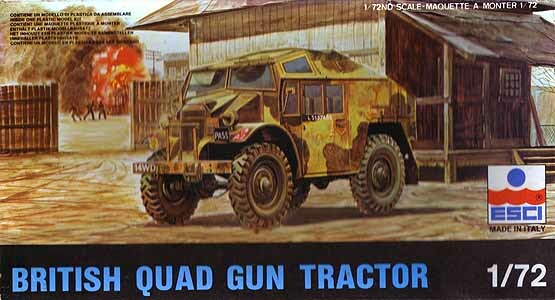 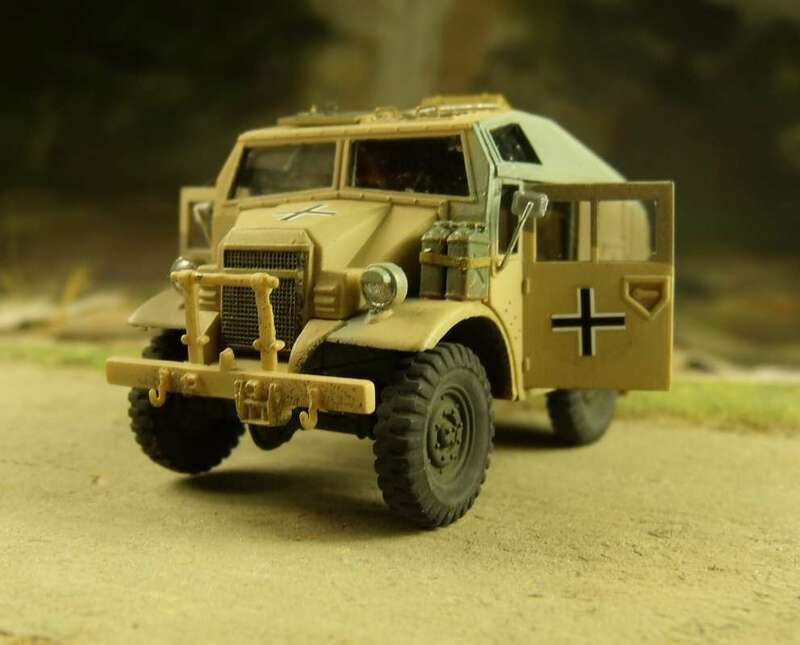 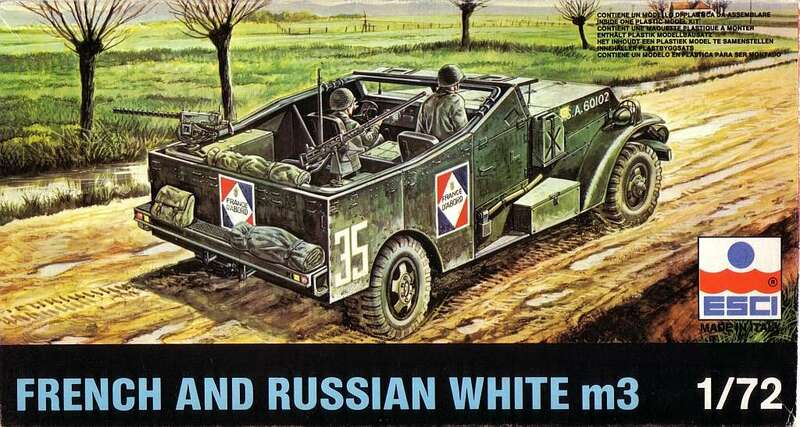 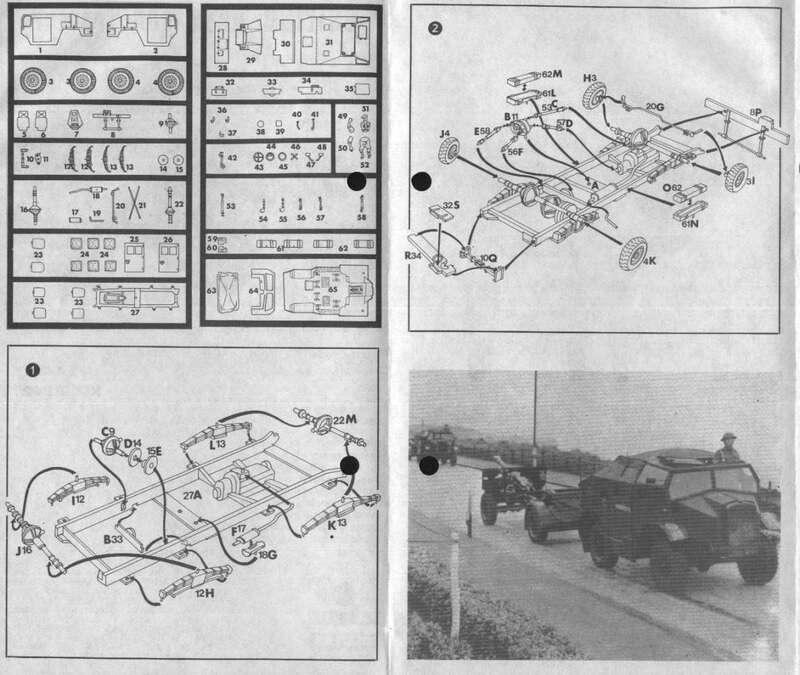 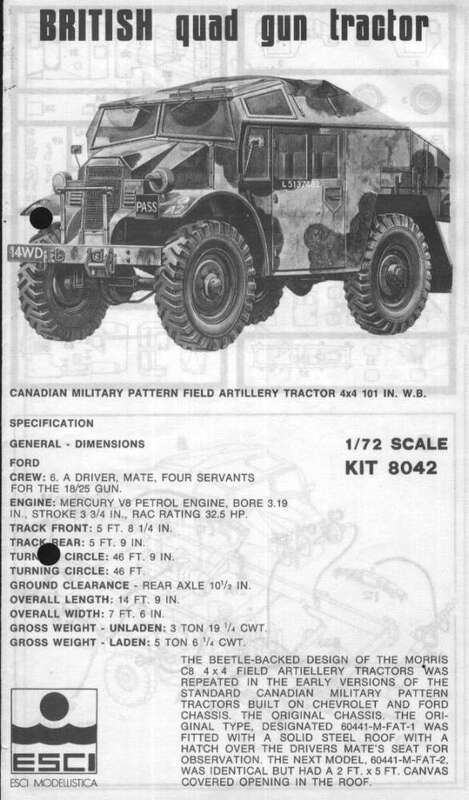 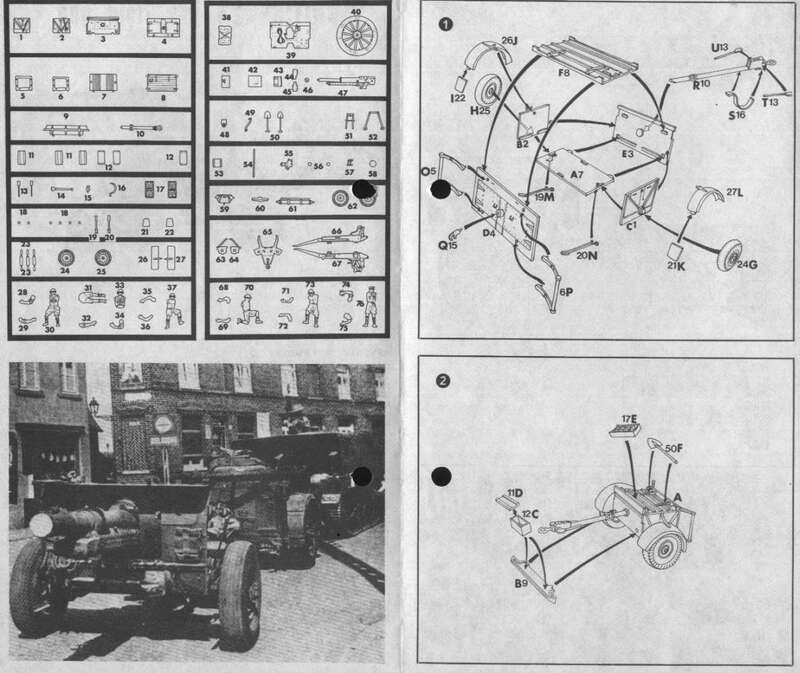 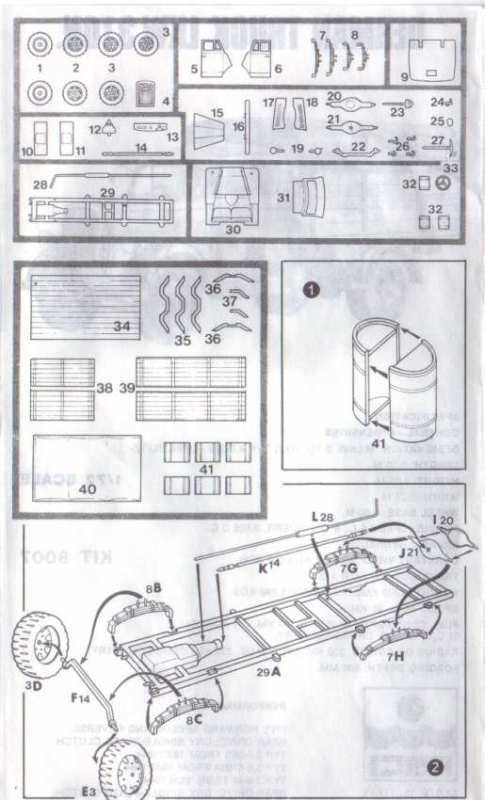 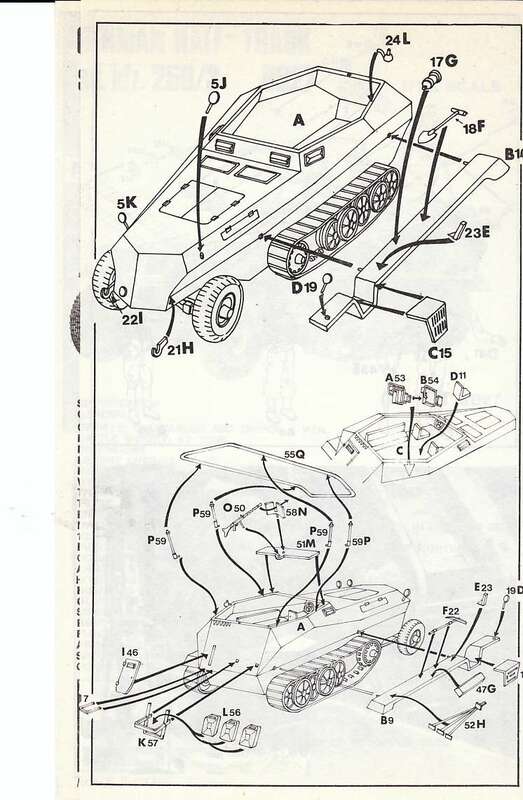 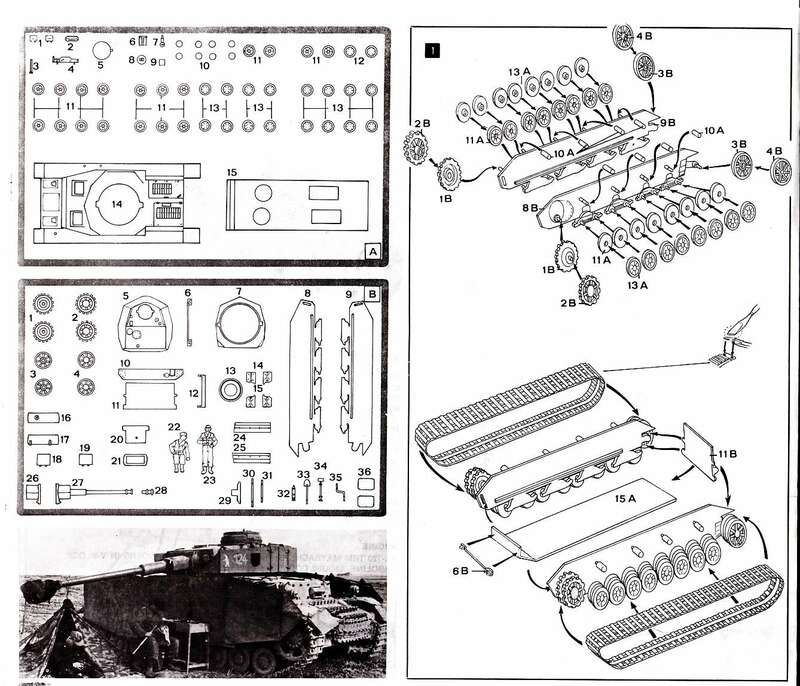 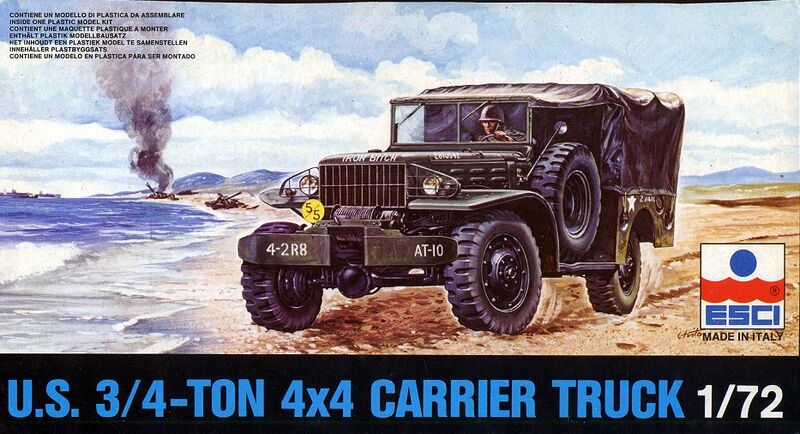 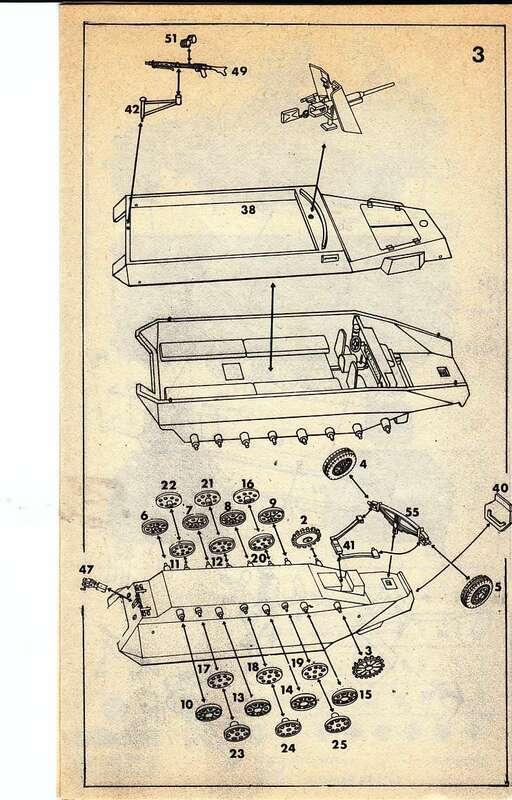 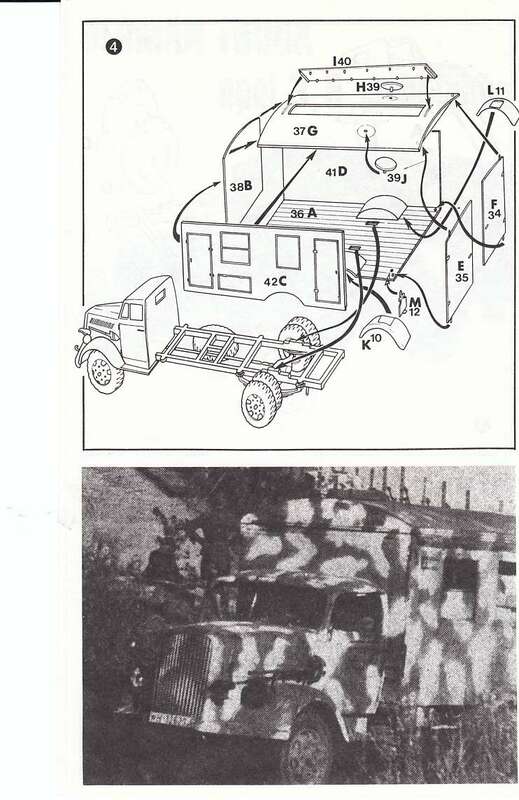 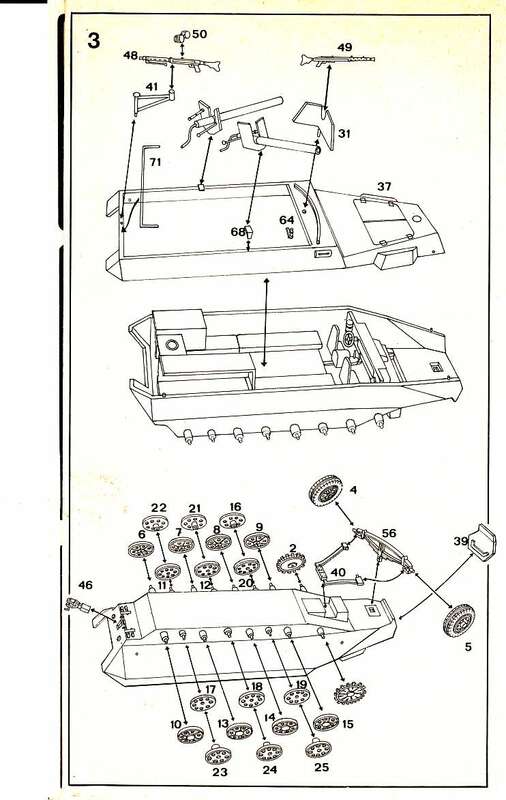 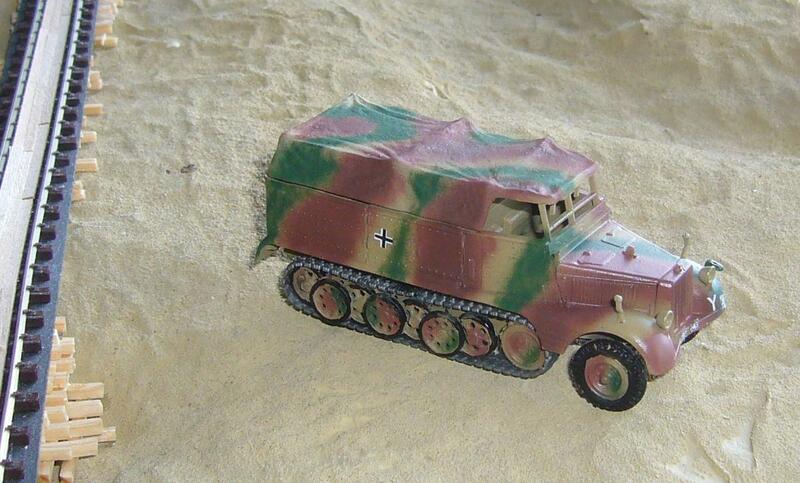 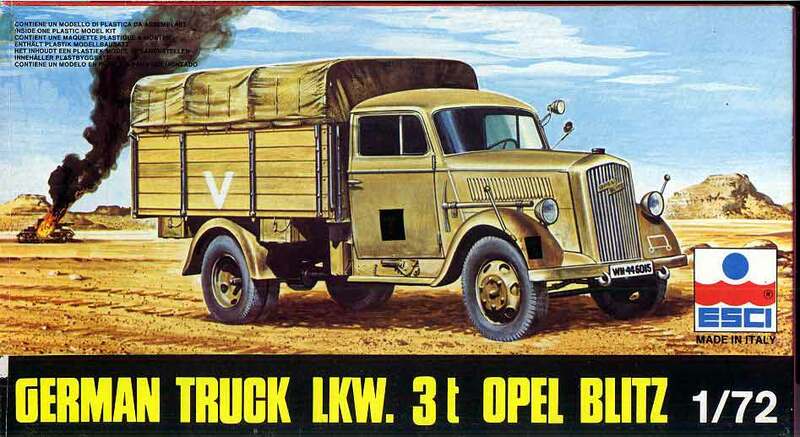 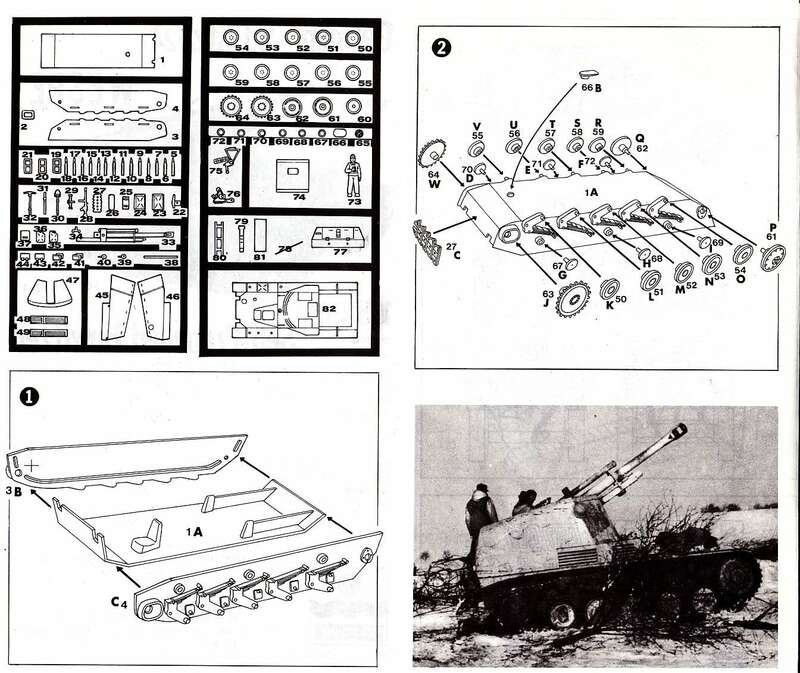 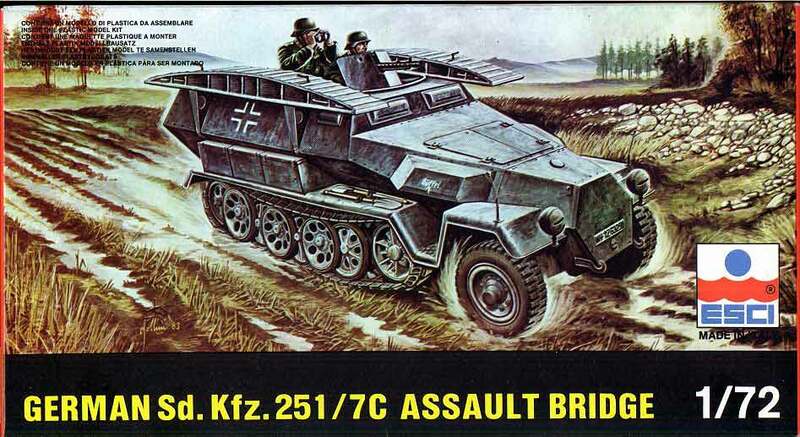 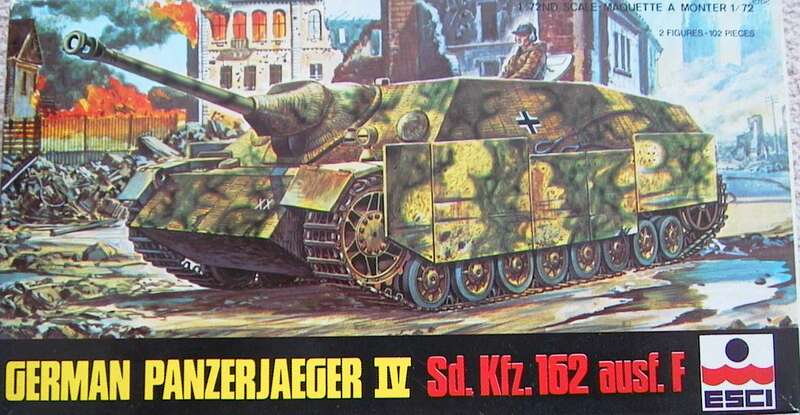 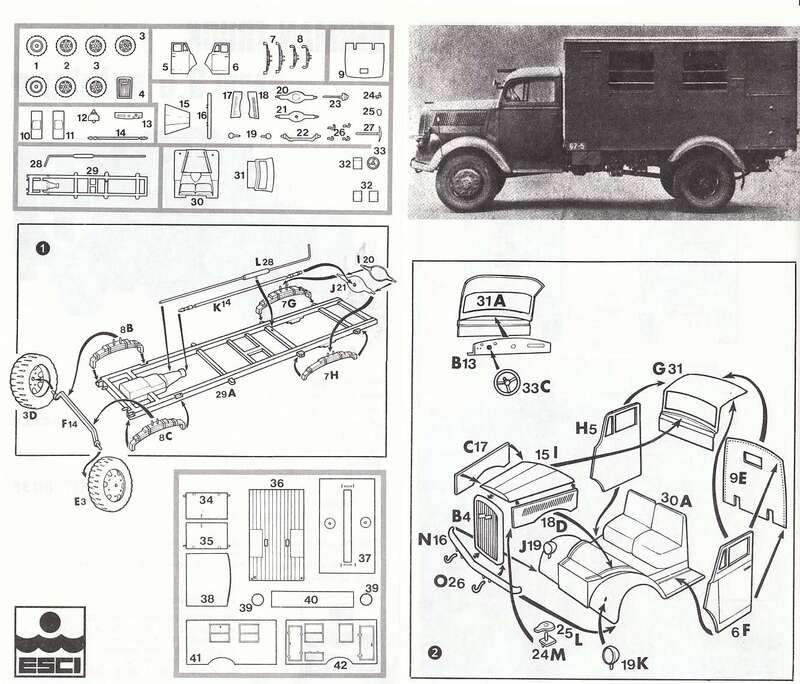 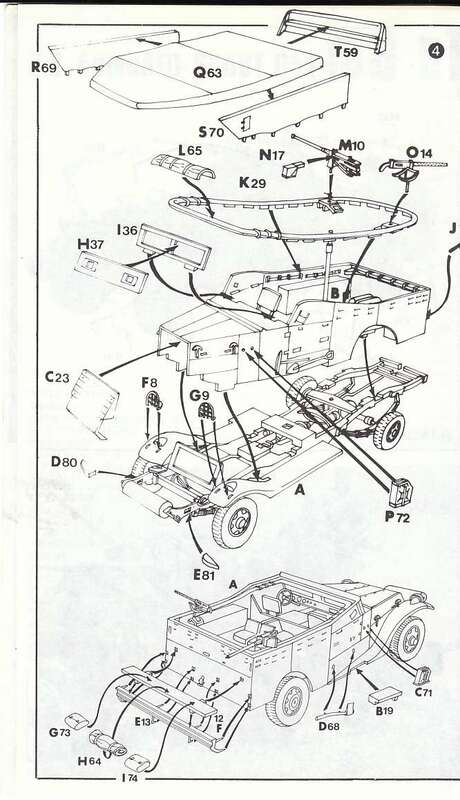 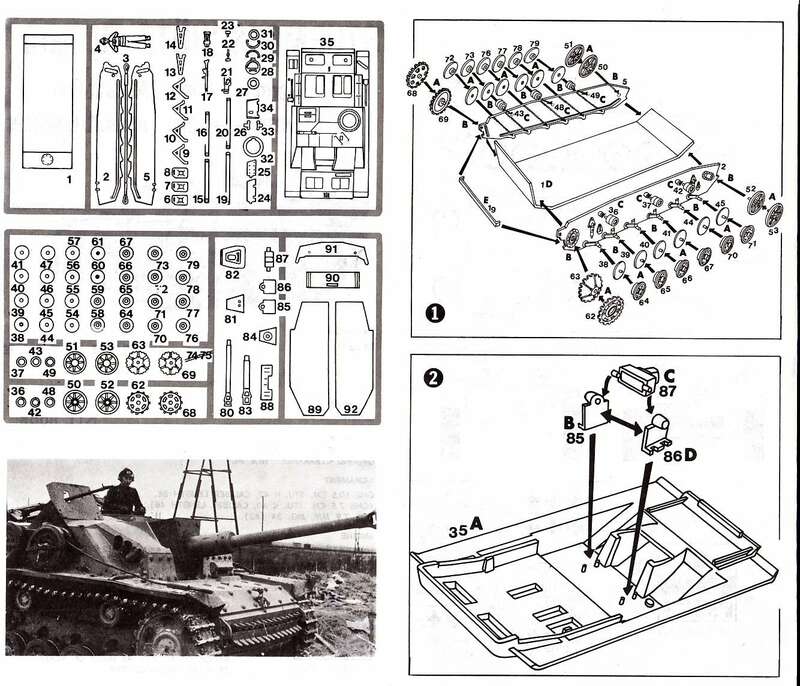 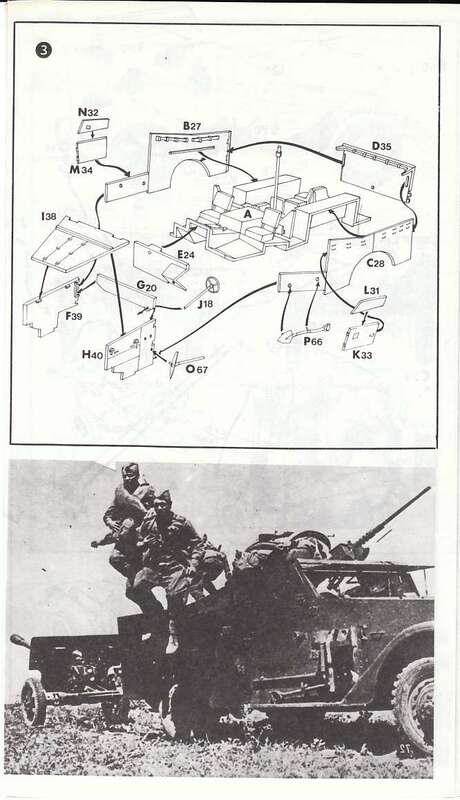 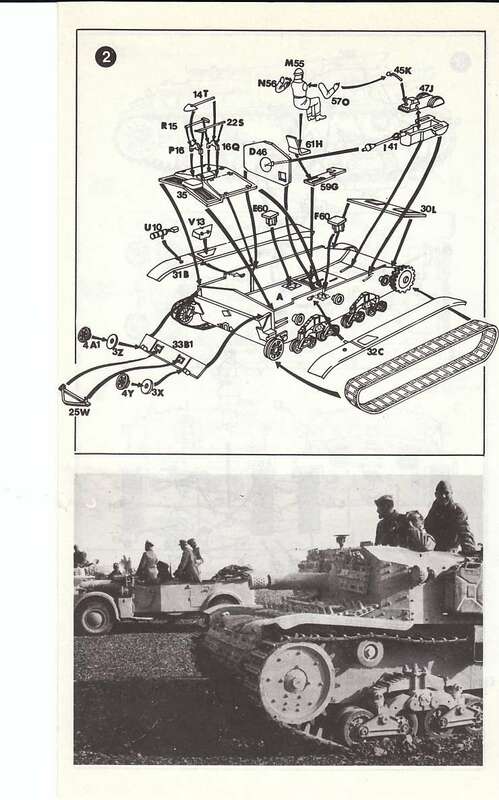 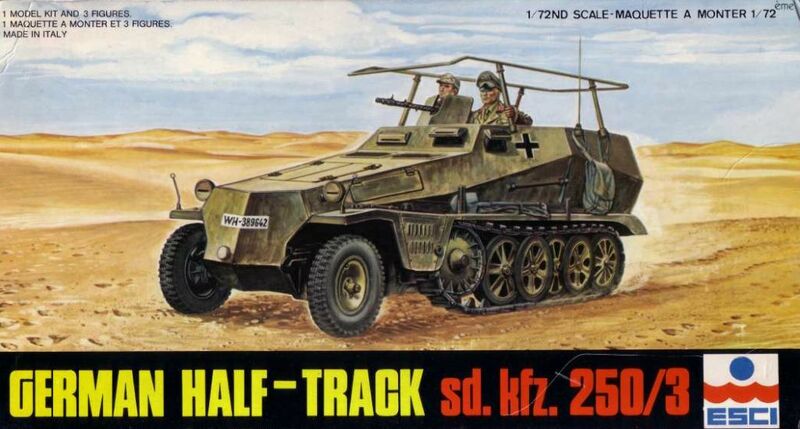 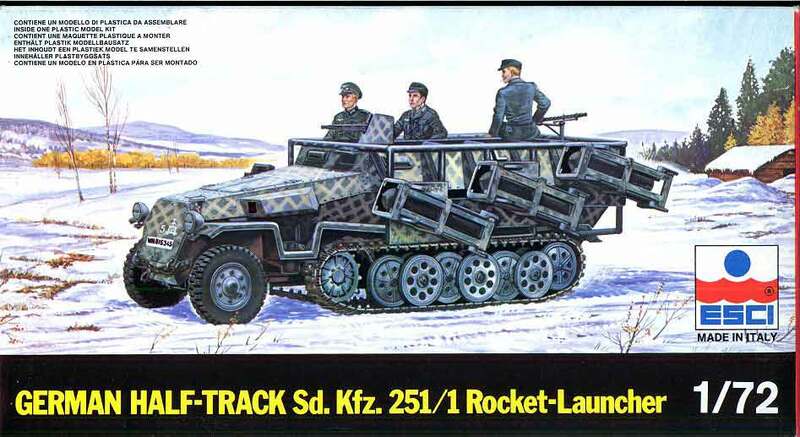 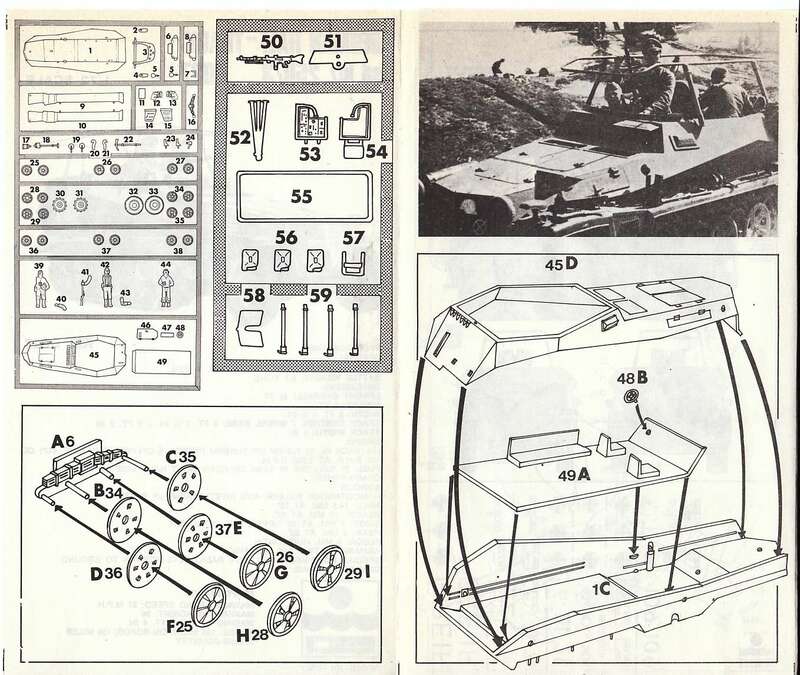 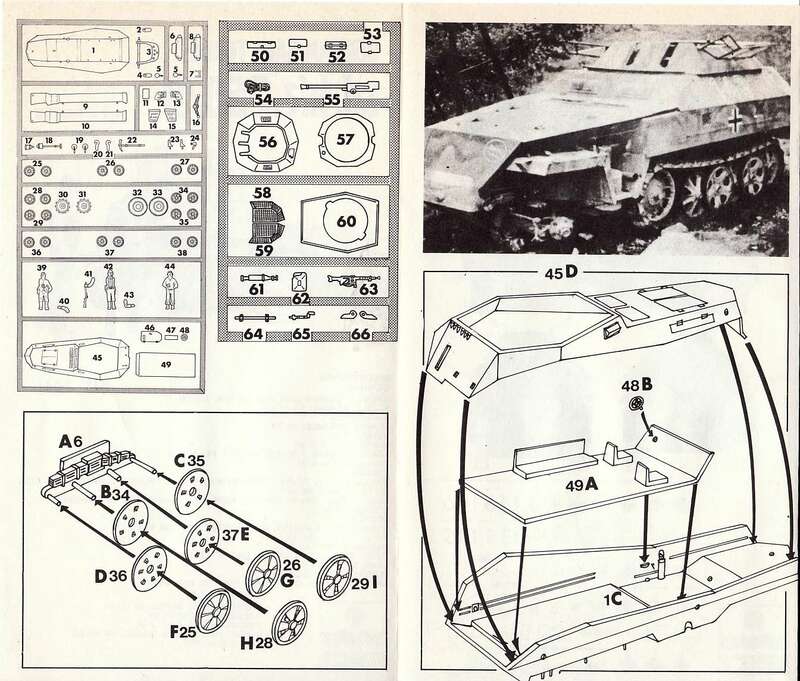 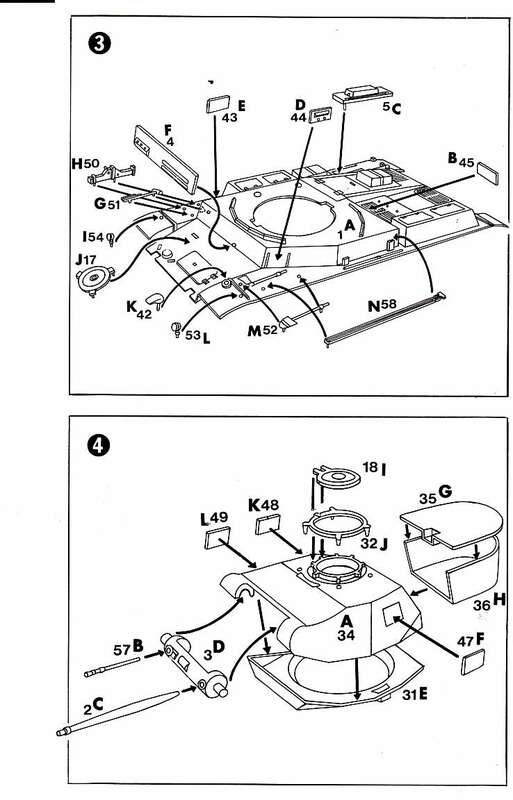 This complete "whitebox" series has as highest kitnumber the SdKfz 250/10 (8051). 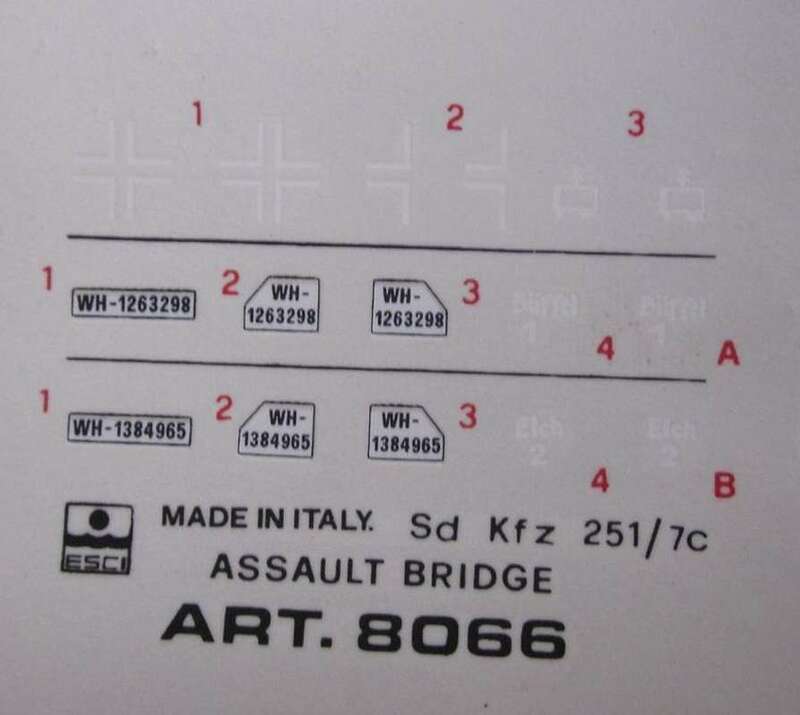 They all carry a color profile on the backside of the box Kitnumbers Esci Whitebox series with their respective boxart type : Esci Armor logo series : 8001 to 8006, 8008, 8010, 8011, 8013, 8014, 8021, 8022. 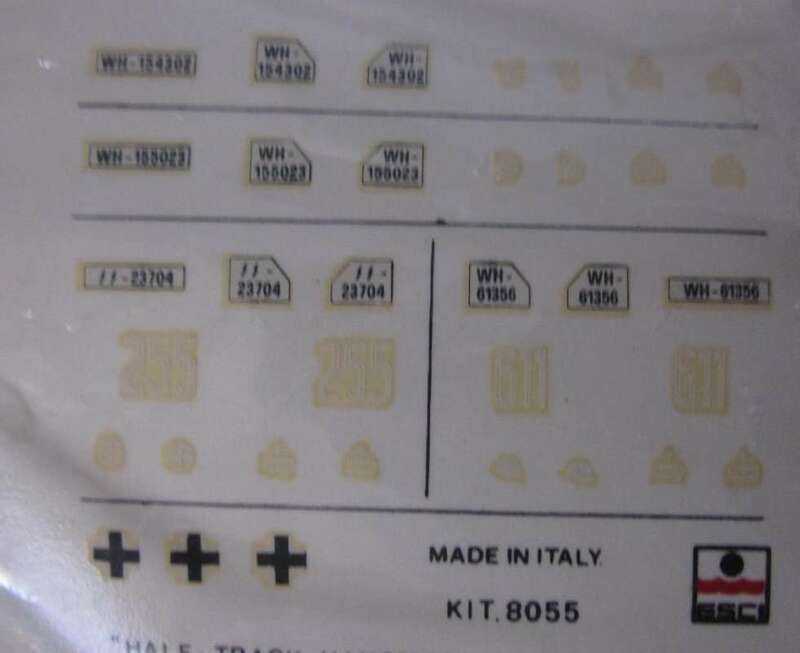 Esci Whitebox Flag series : 8007, 8009, 8012, 8015 to 8020, 8023, 8026, 8028 to 8031, 8035 to 8037, 8039. 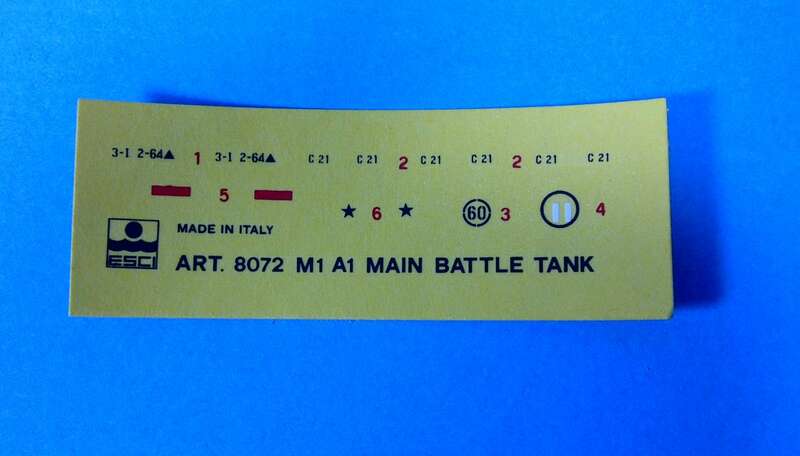 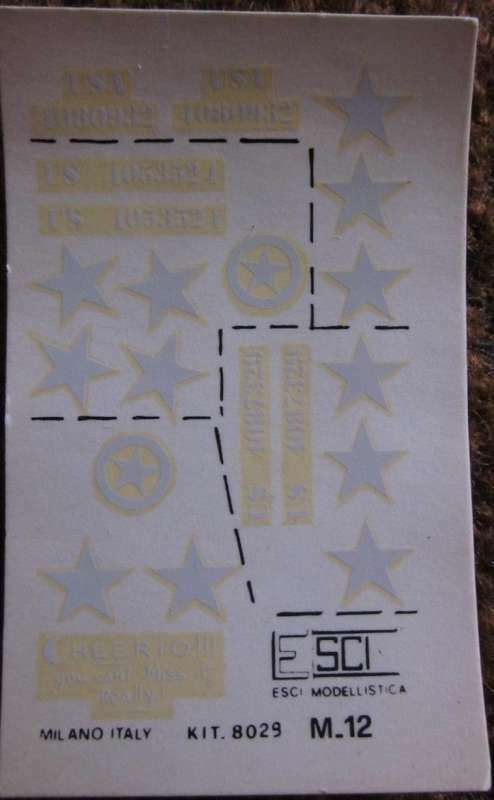 The complete early ESCI 8000 numbered series which had the color profiles at the backside of the box. 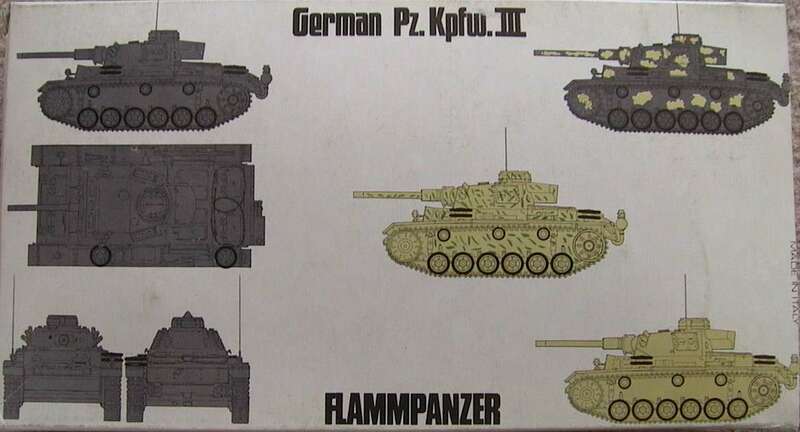 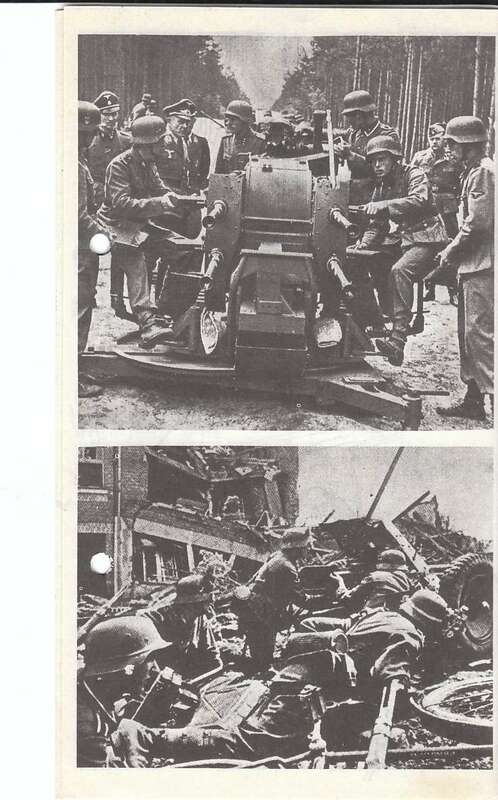 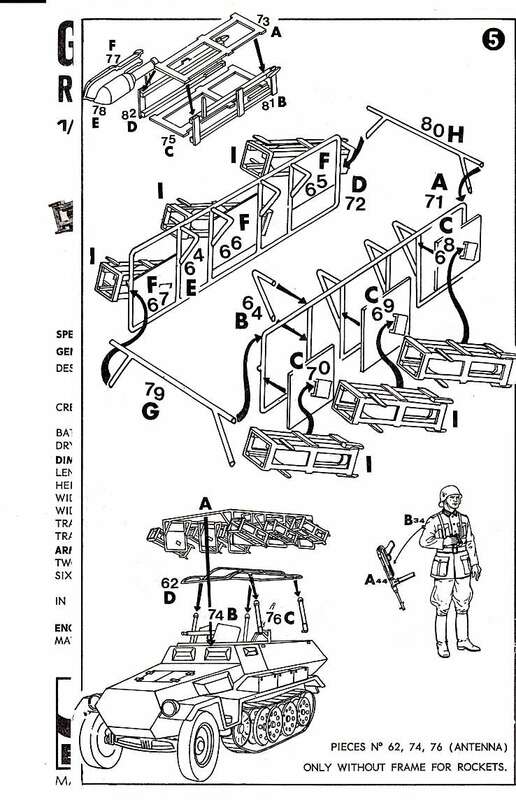 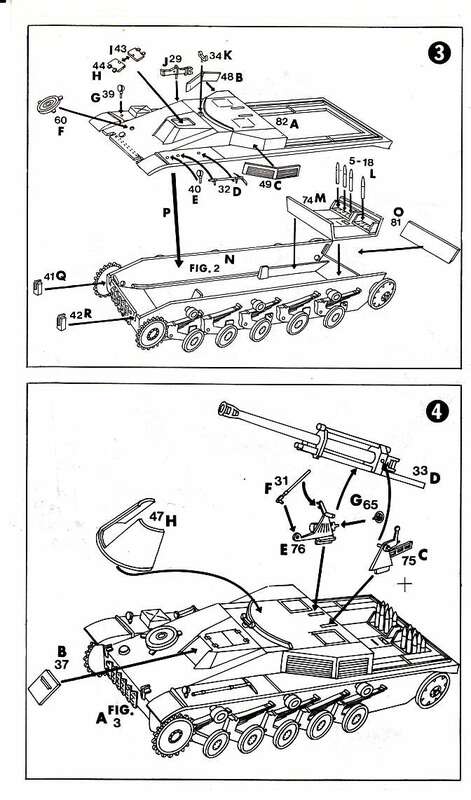 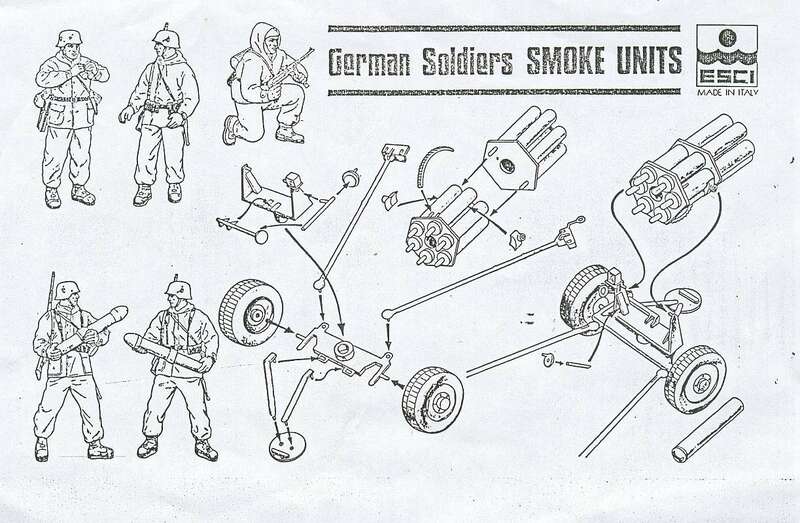 Numbering from 8001 up to 8057 (Flammpanzer III). 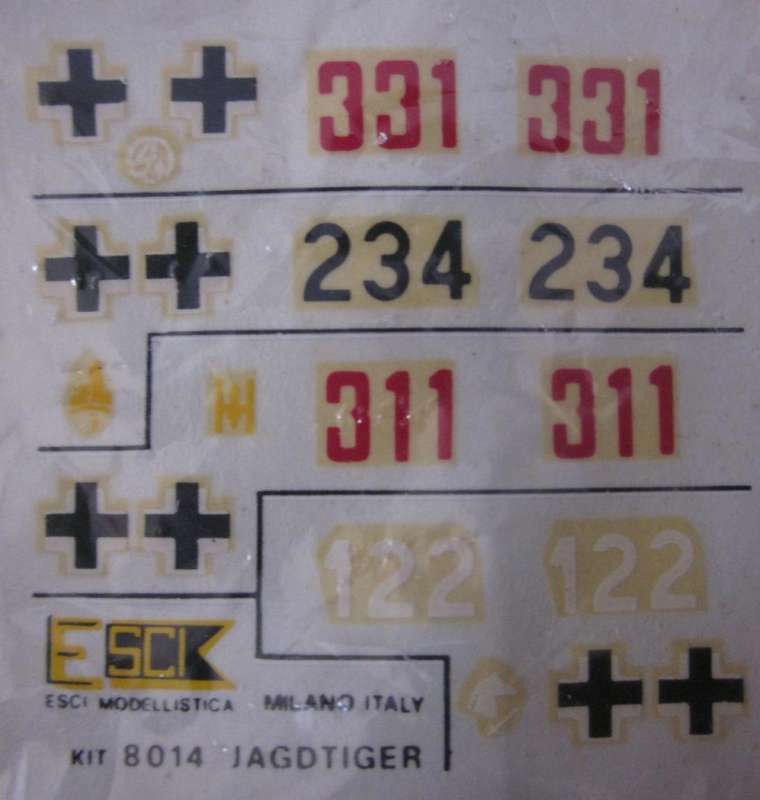 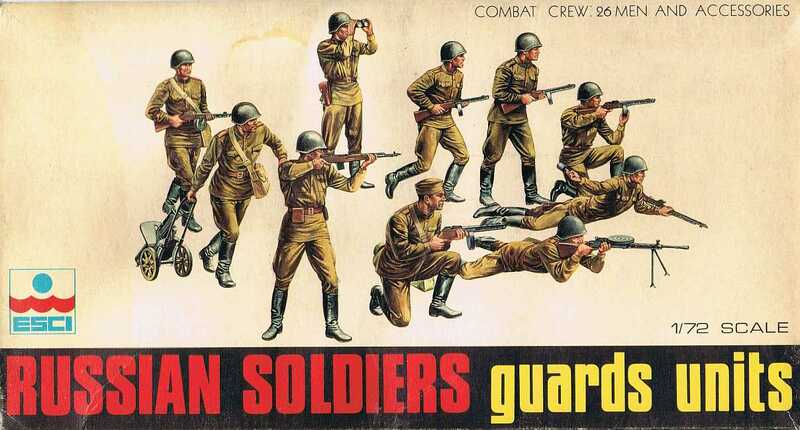 After number 8057 none of the ESCI armor kits had a color profile at the backside anymore. 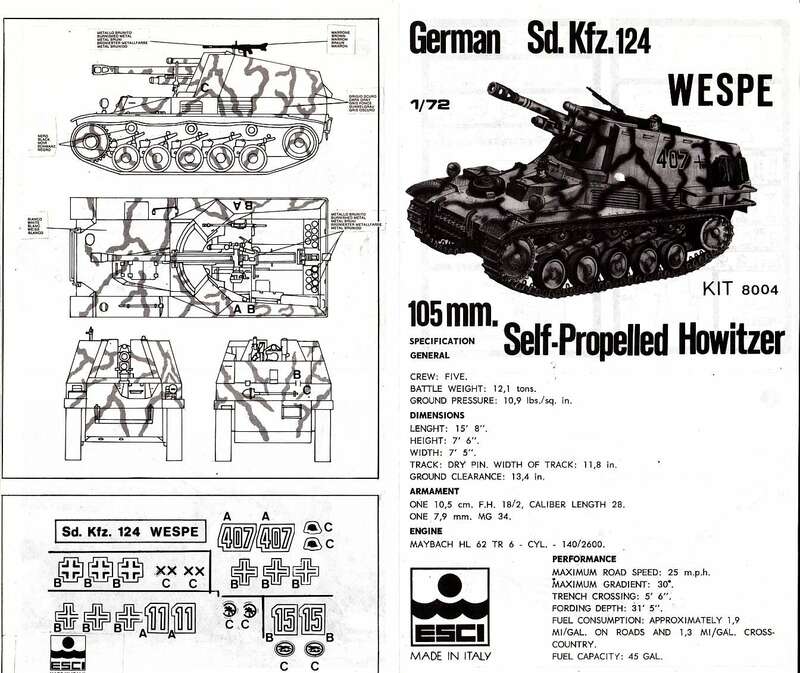 NOTE : The REVELL-ESCI, POLISTIL-ESCI and AURORA ESCI releases also had the same color profiles but the colors of the artwork often varies considerably !! 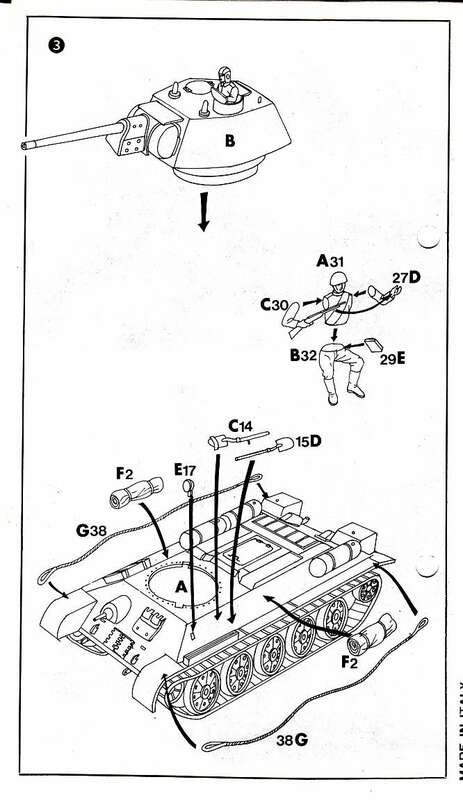 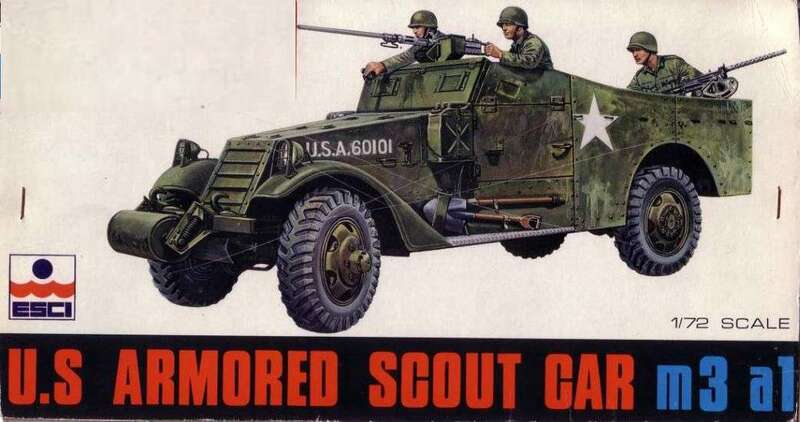 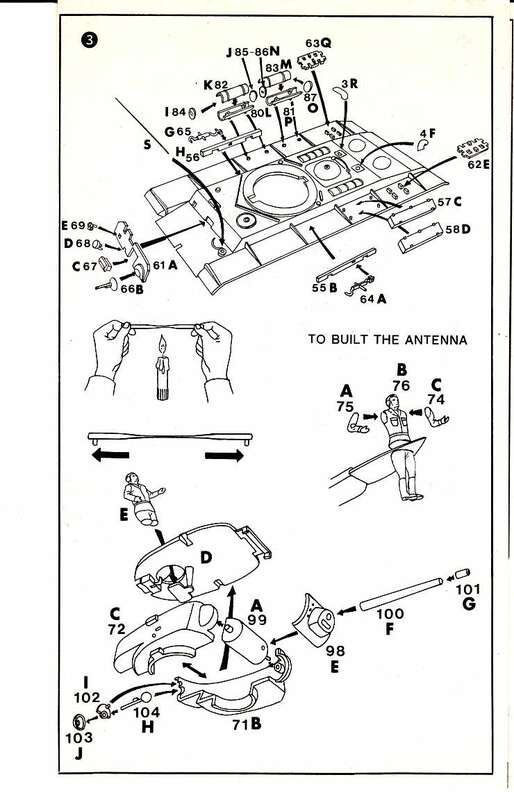 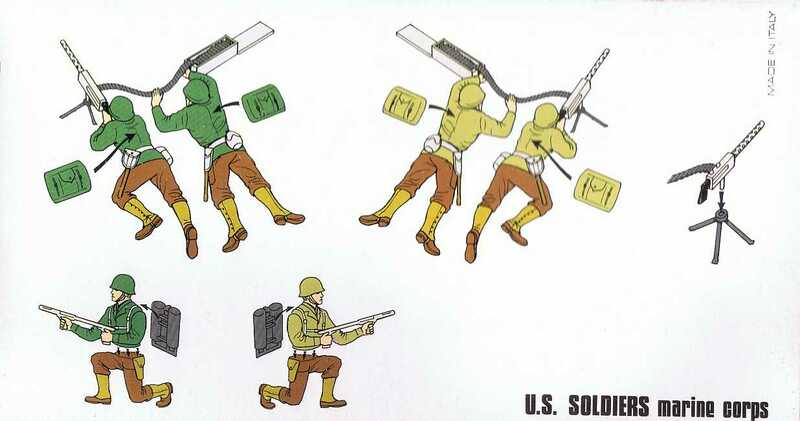 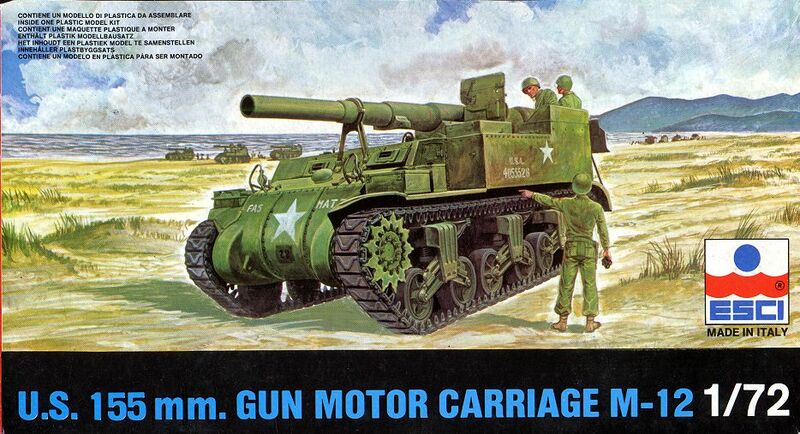 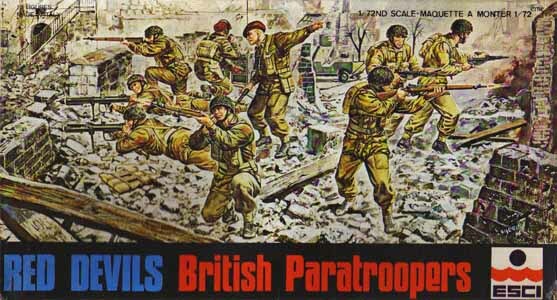 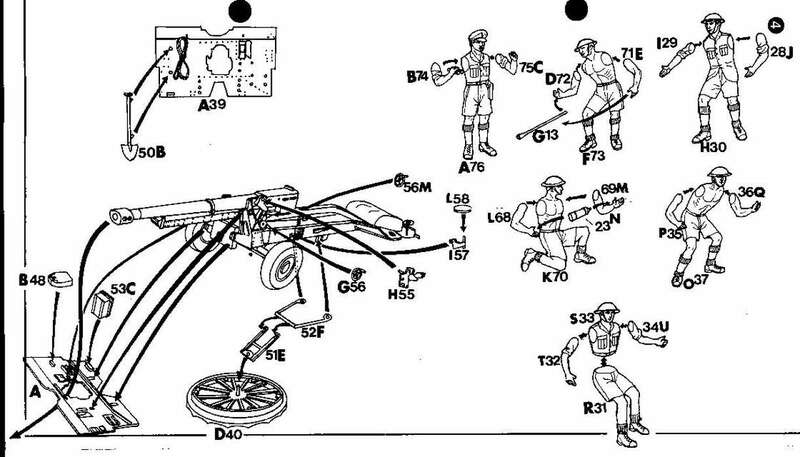 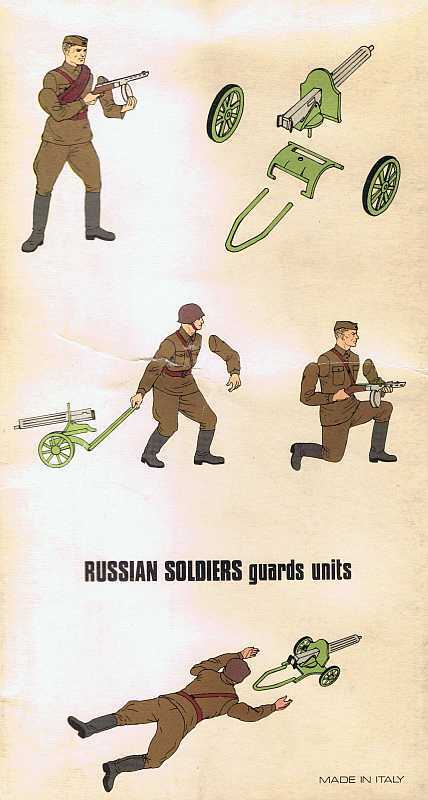 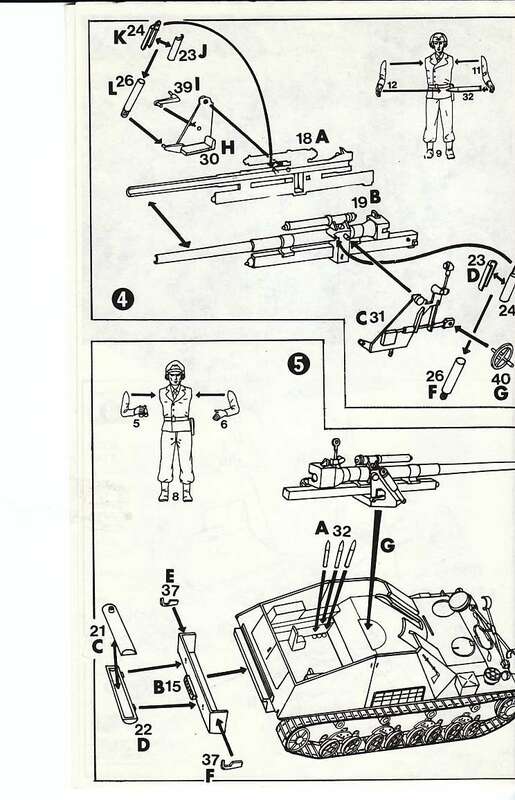 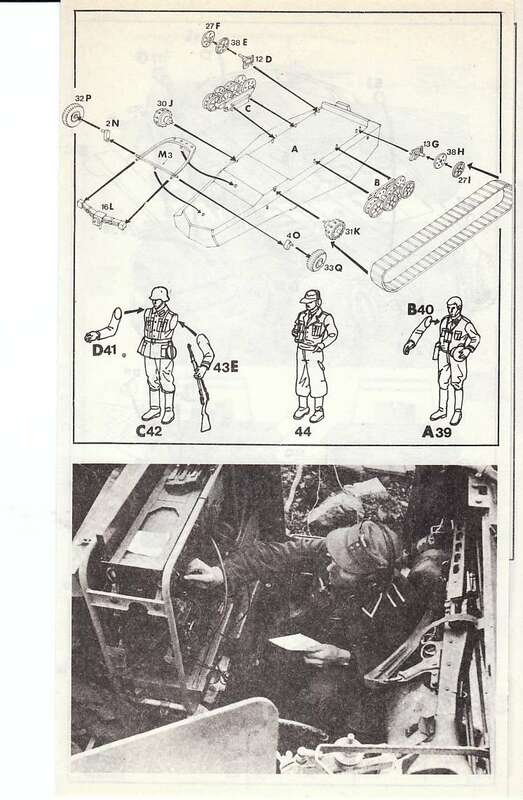 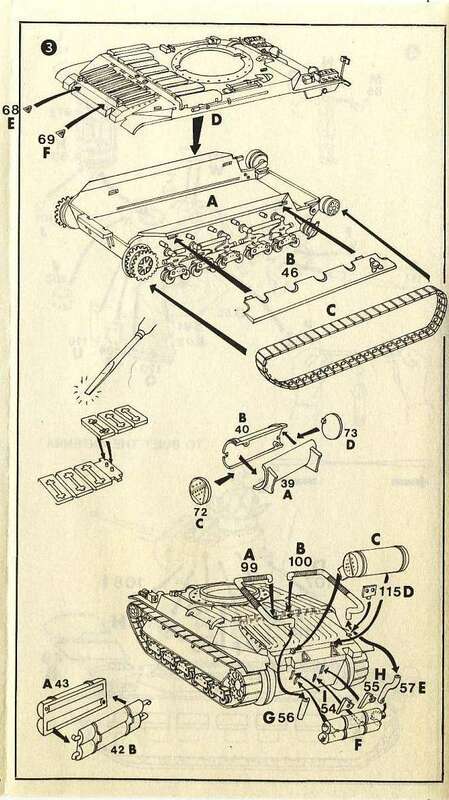 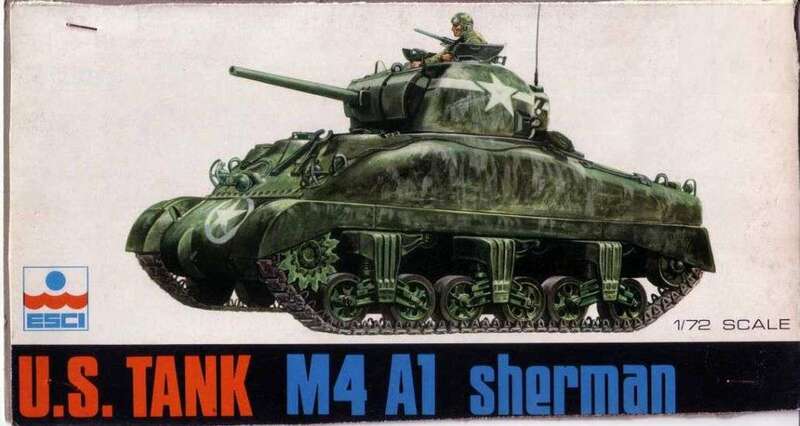 The Sherman is a good example of this variation. 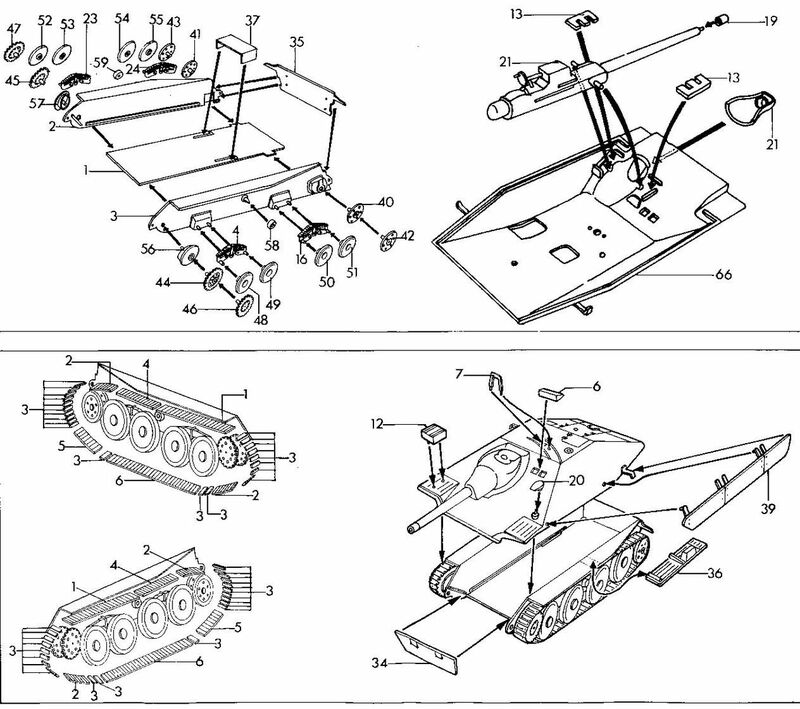 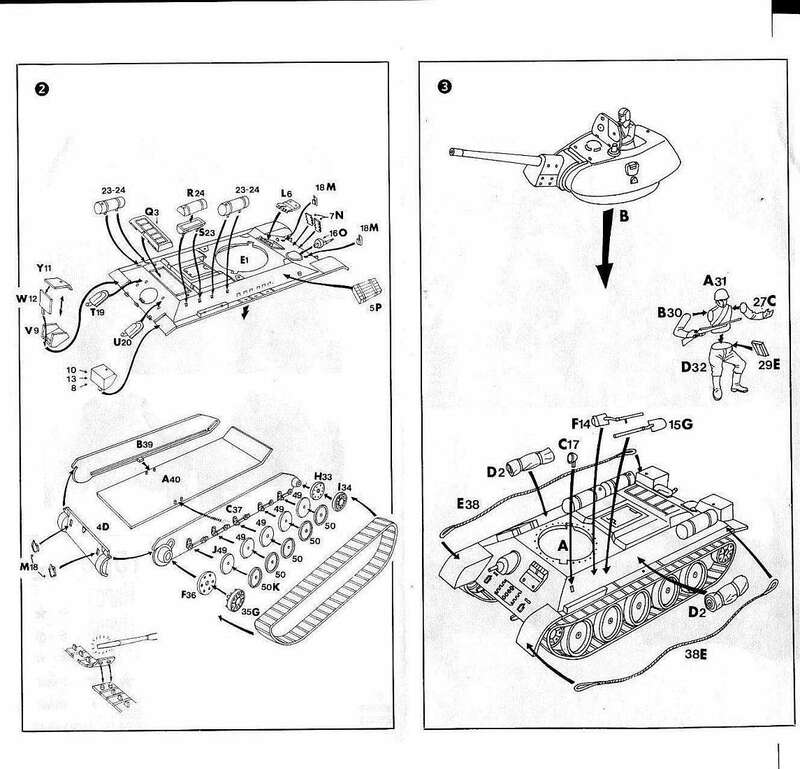 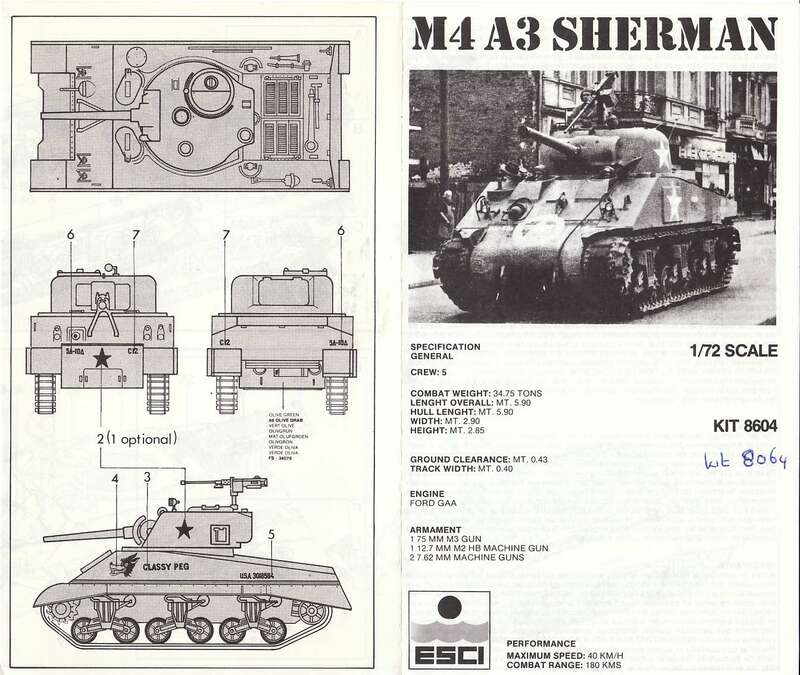 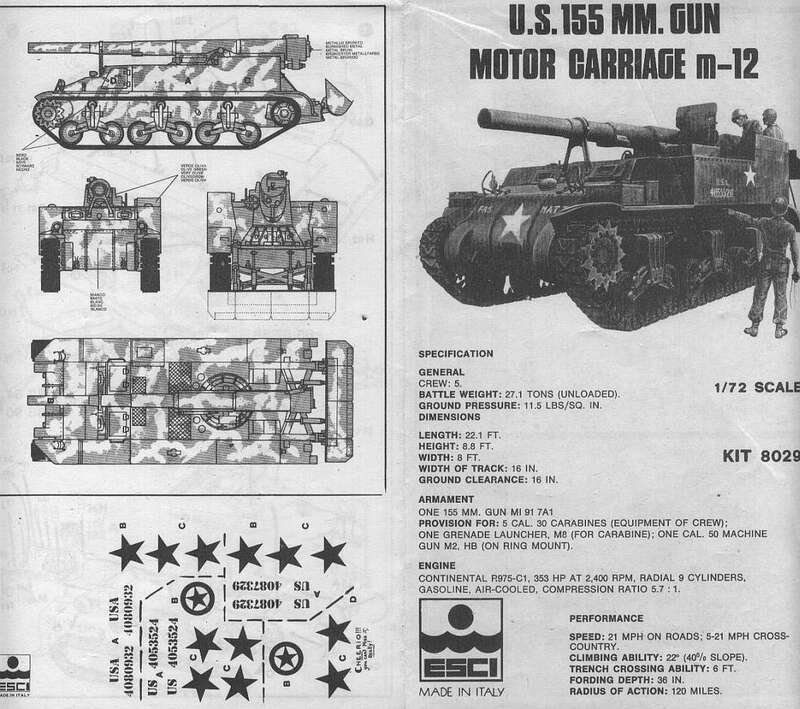 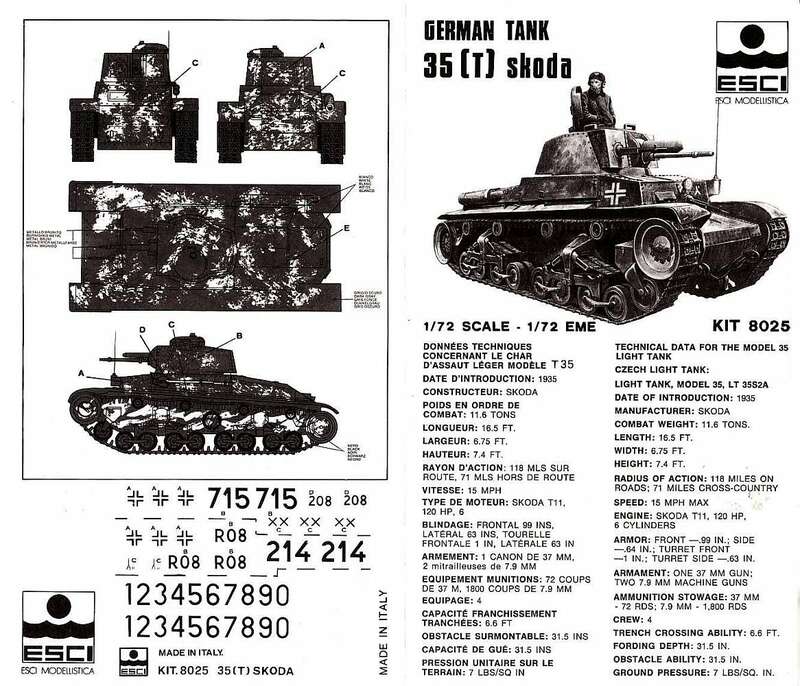 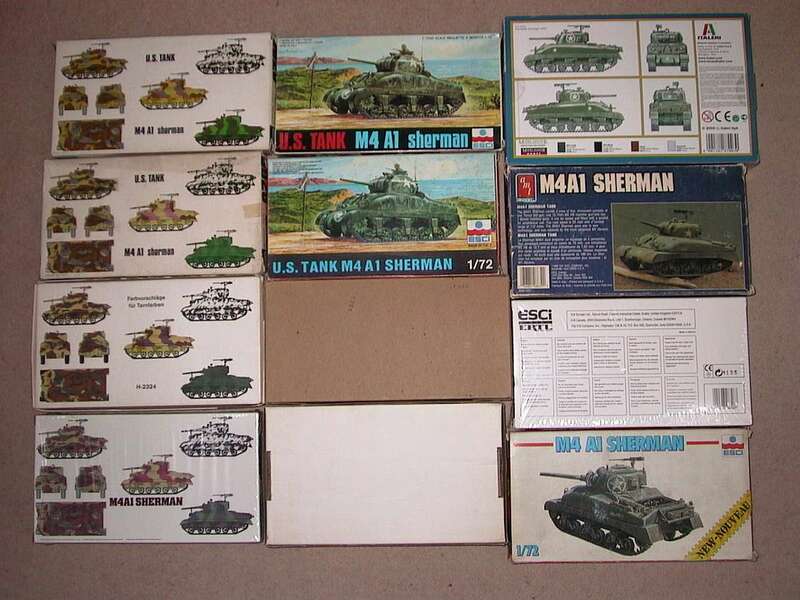 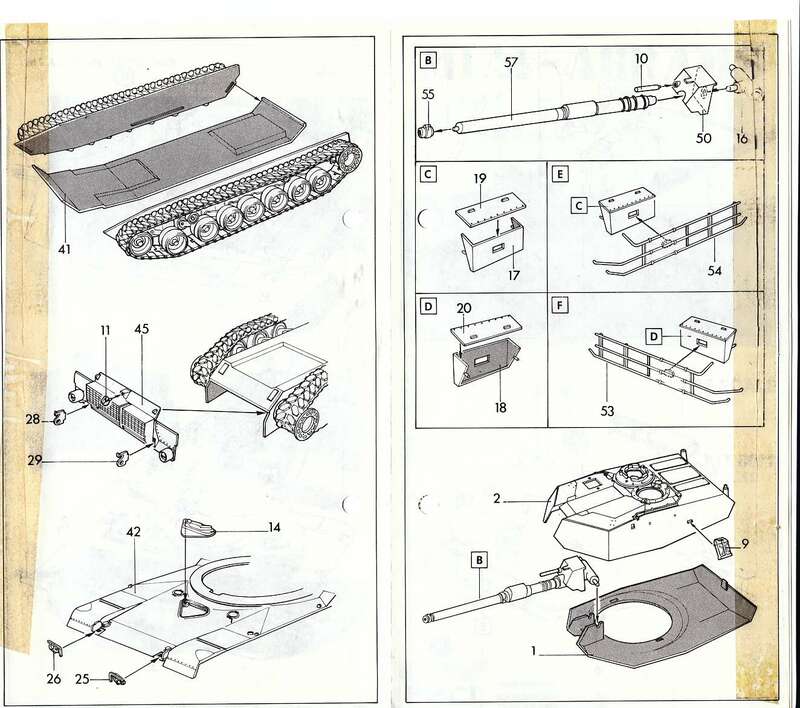 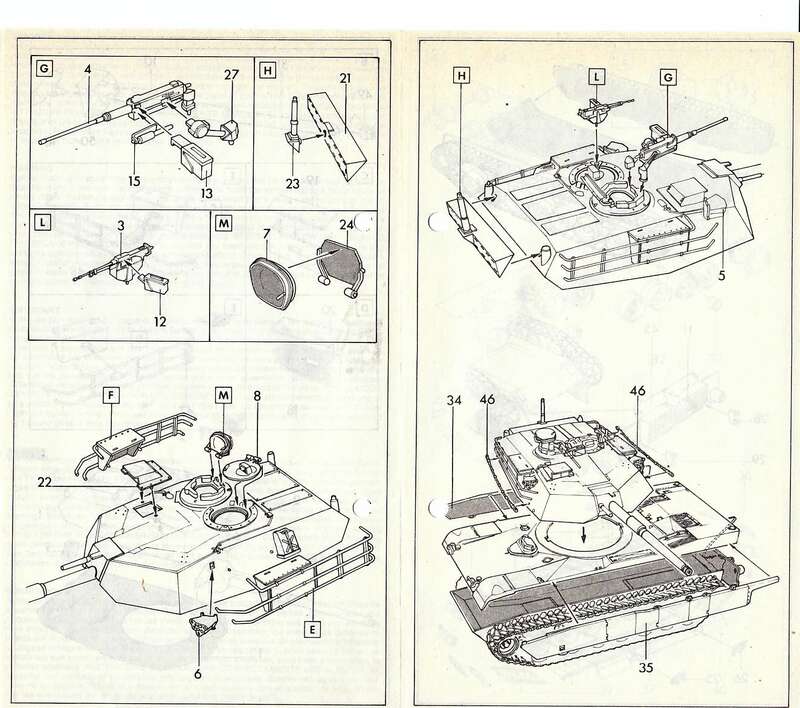 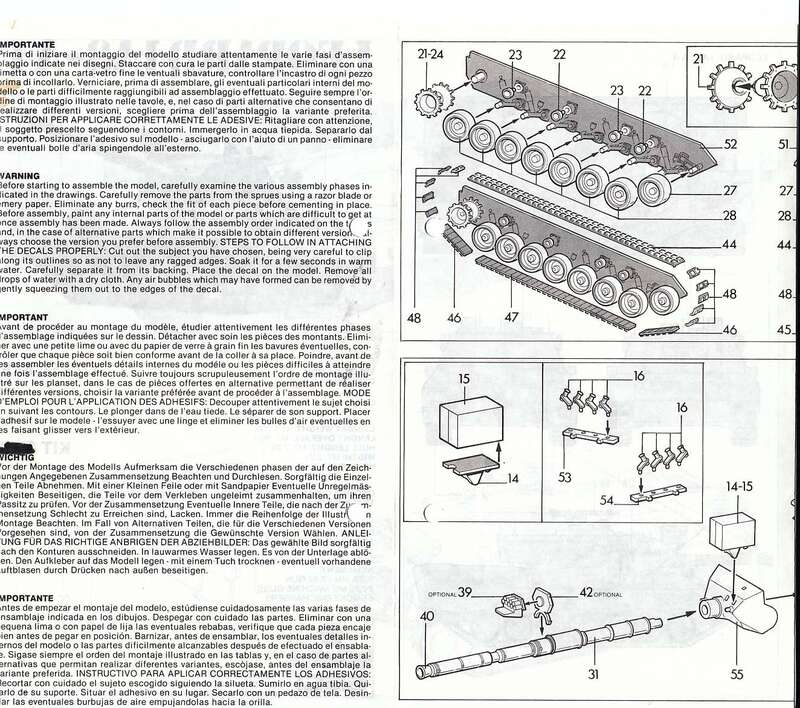 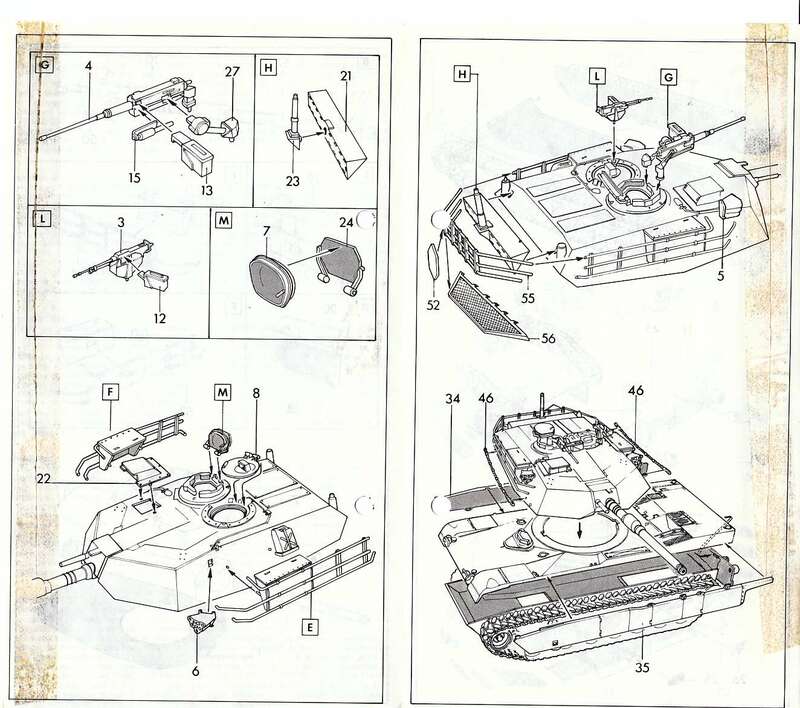 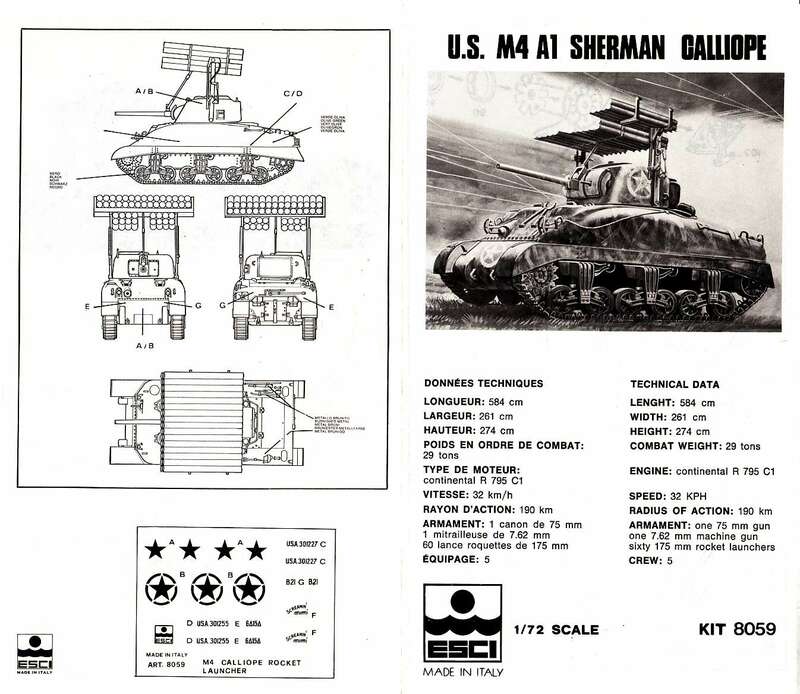 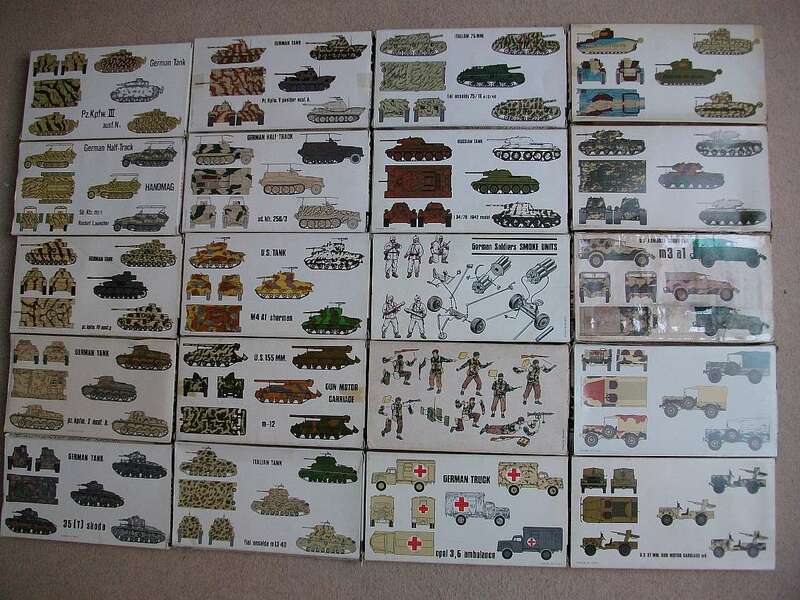 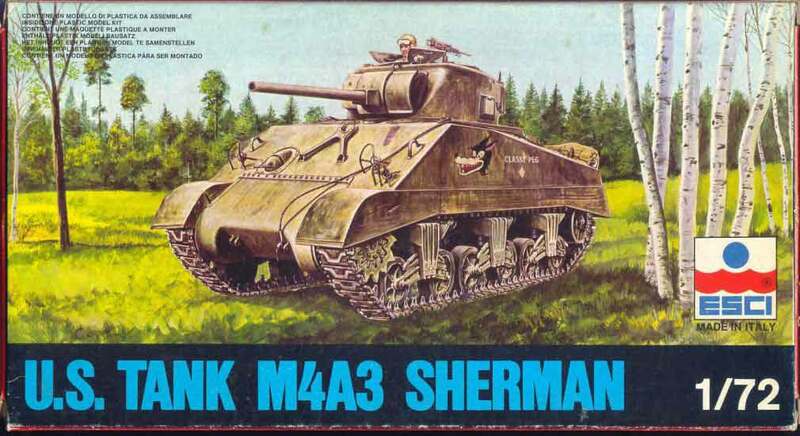 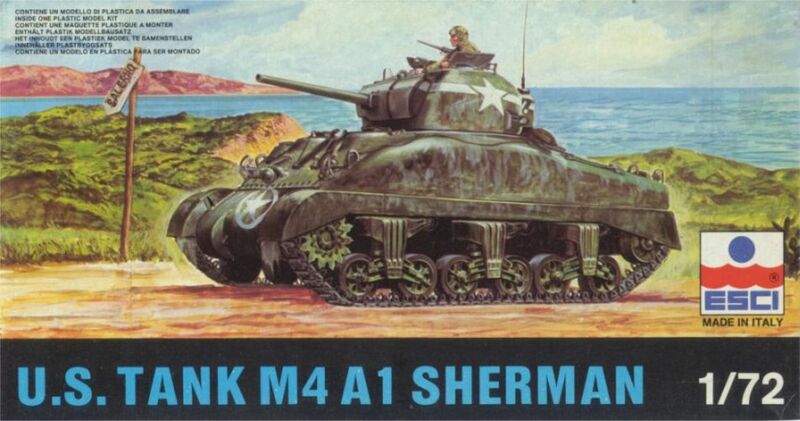 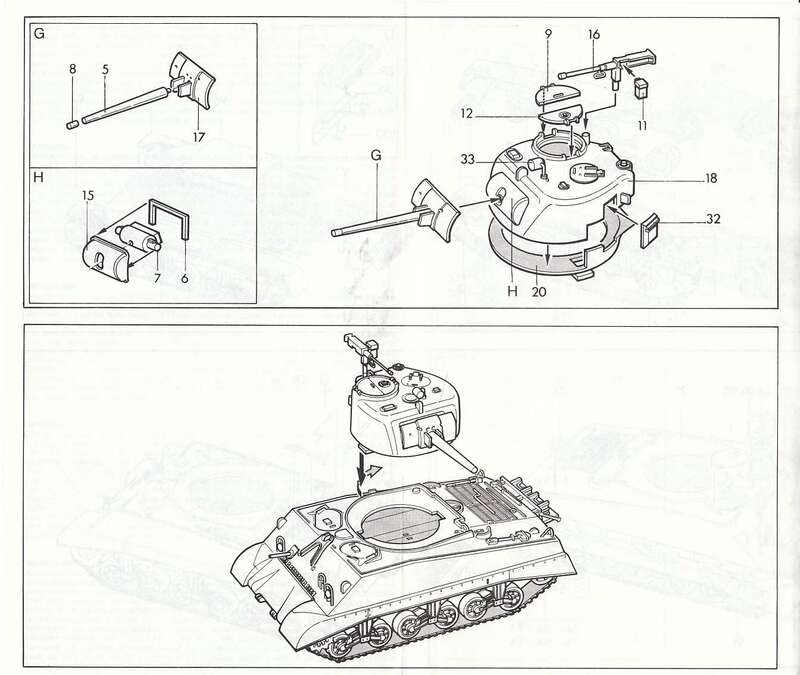 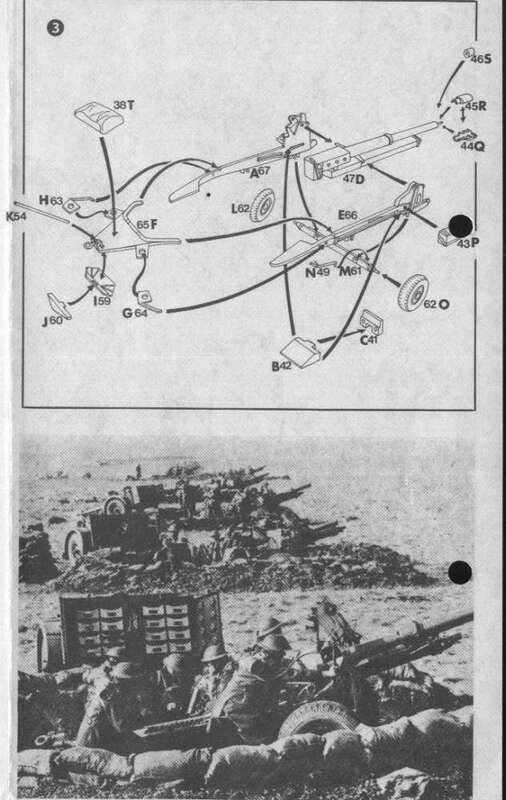 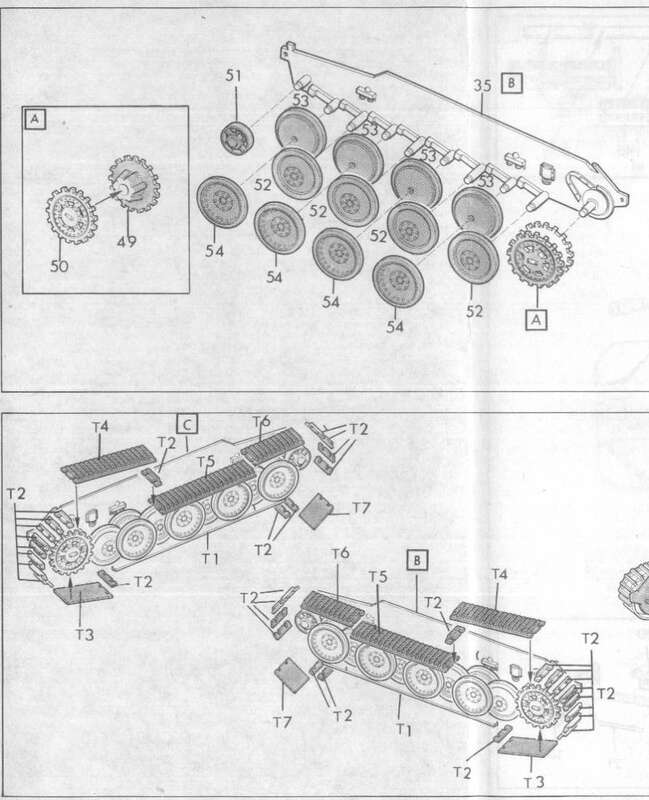 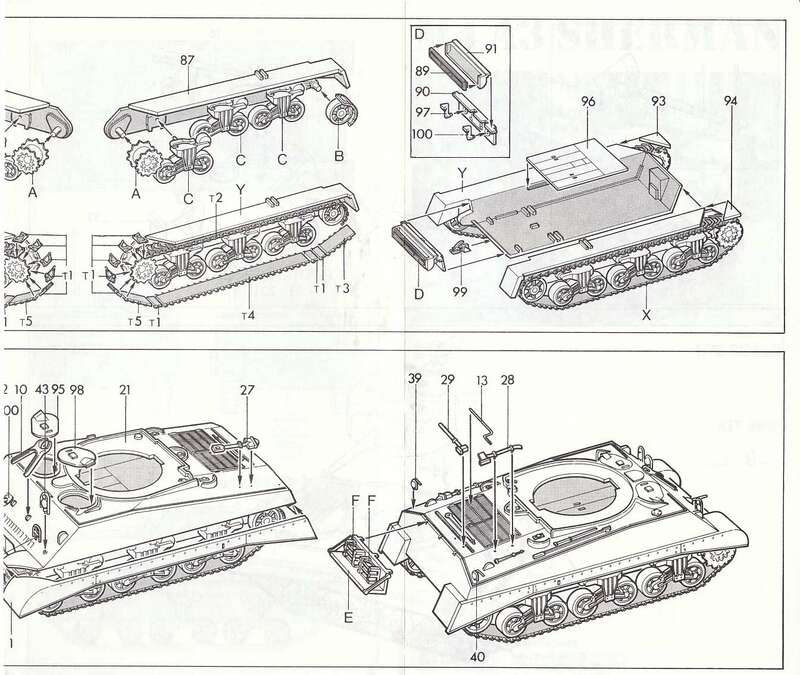 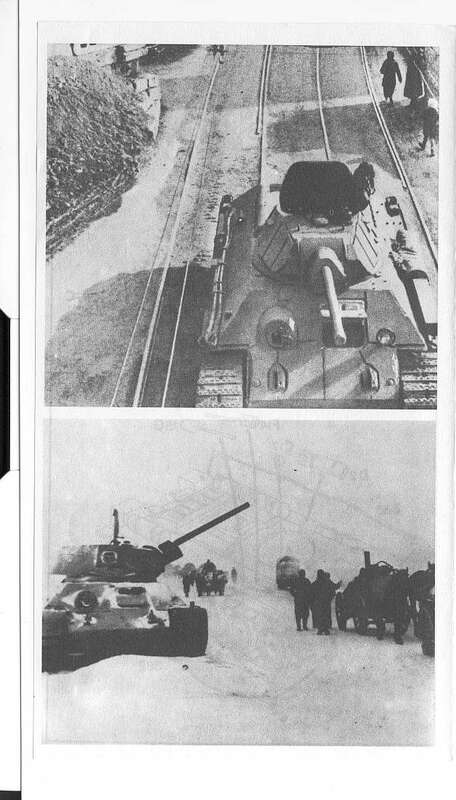 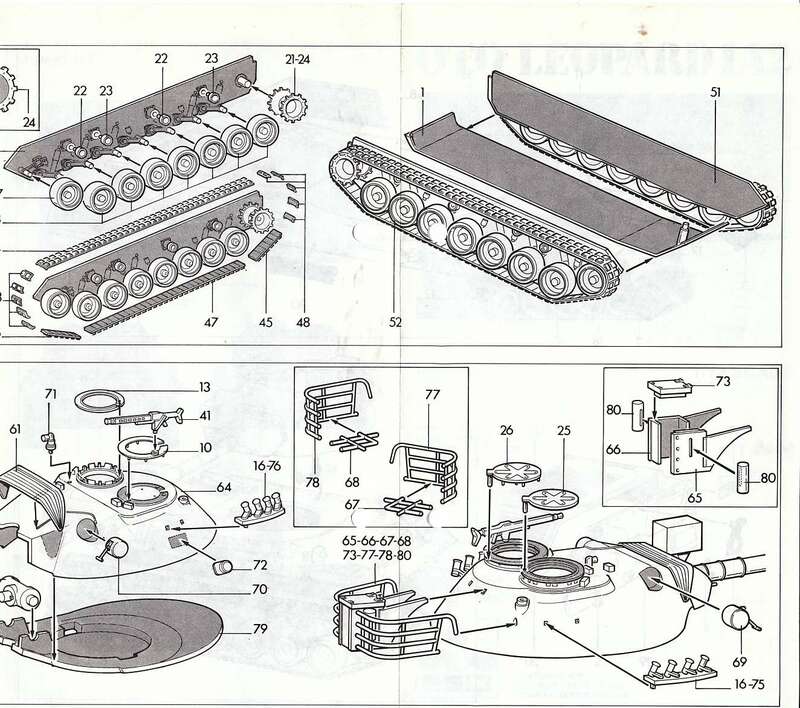 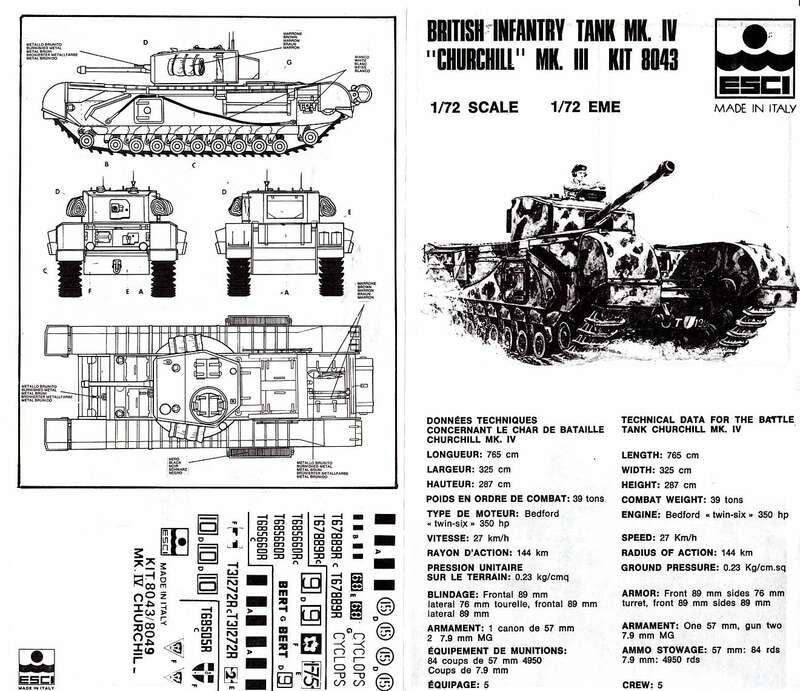 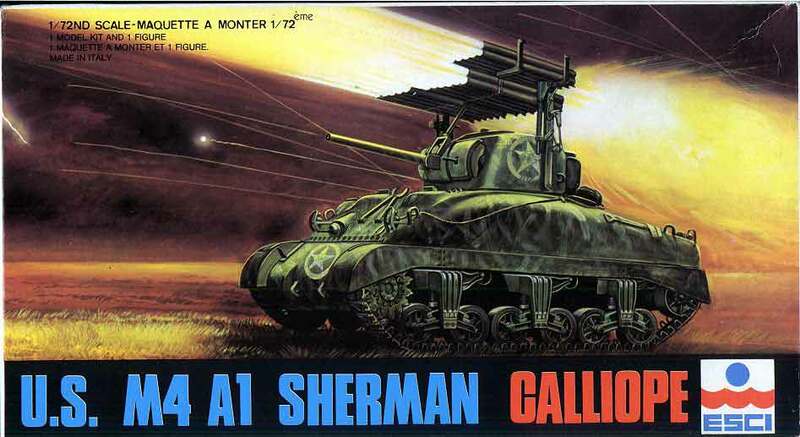 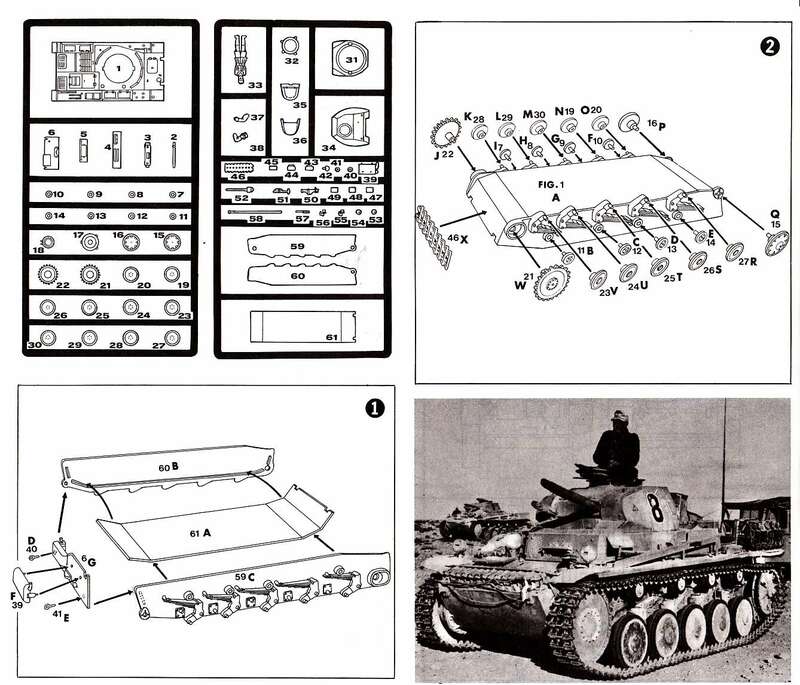 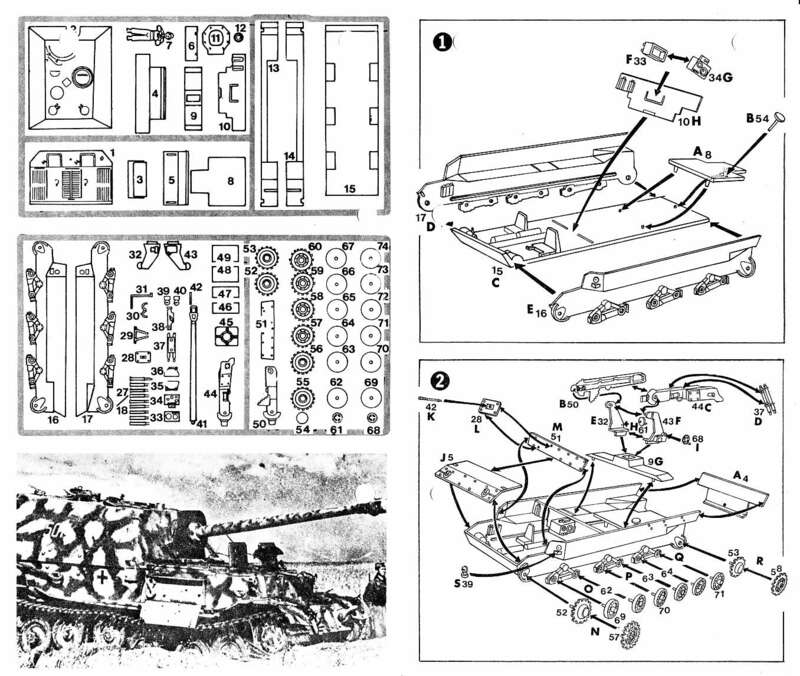 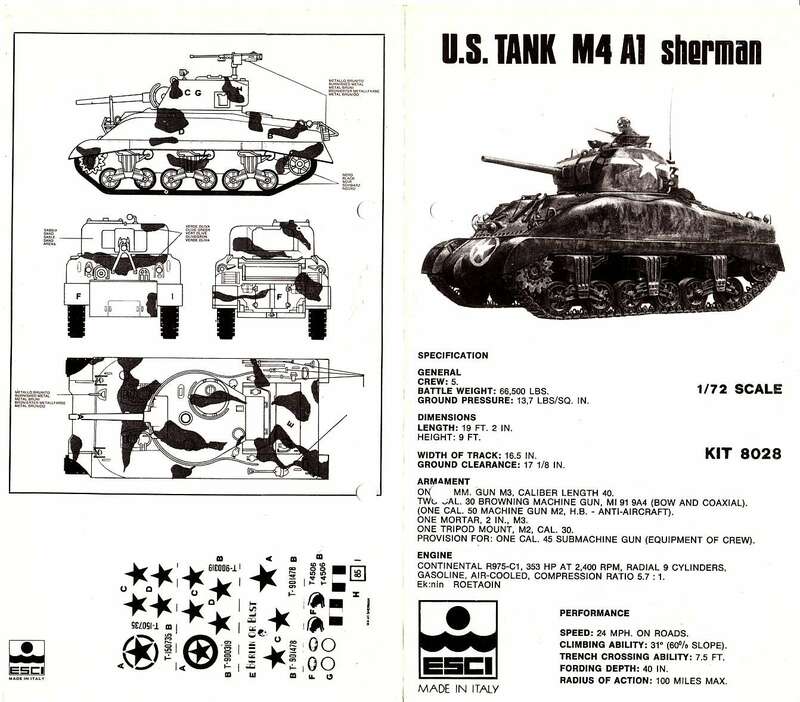 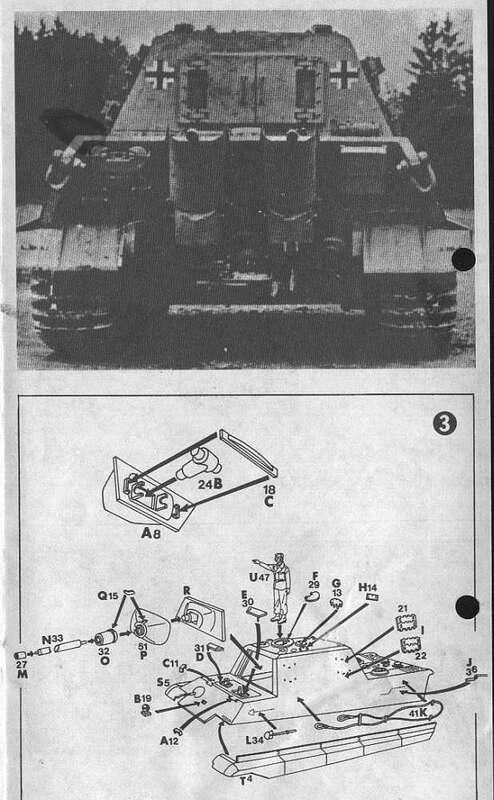 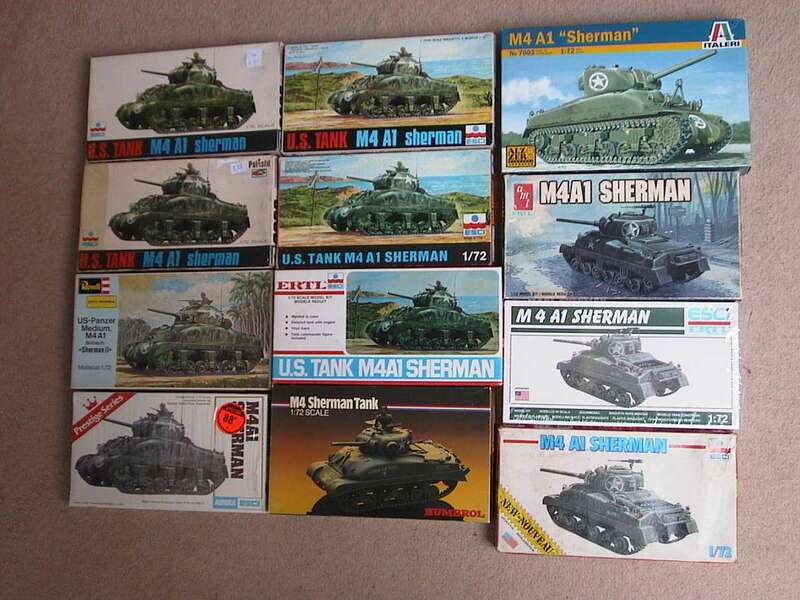 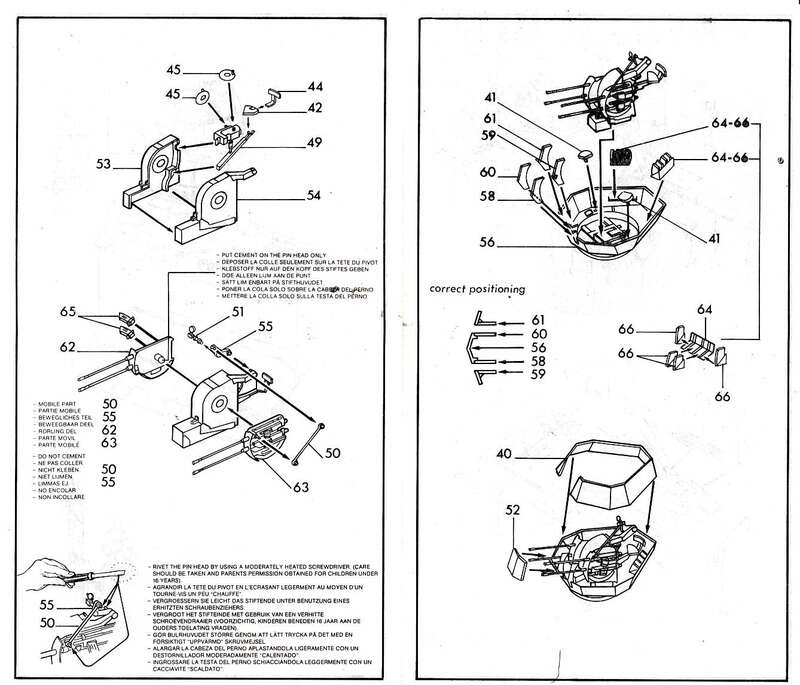 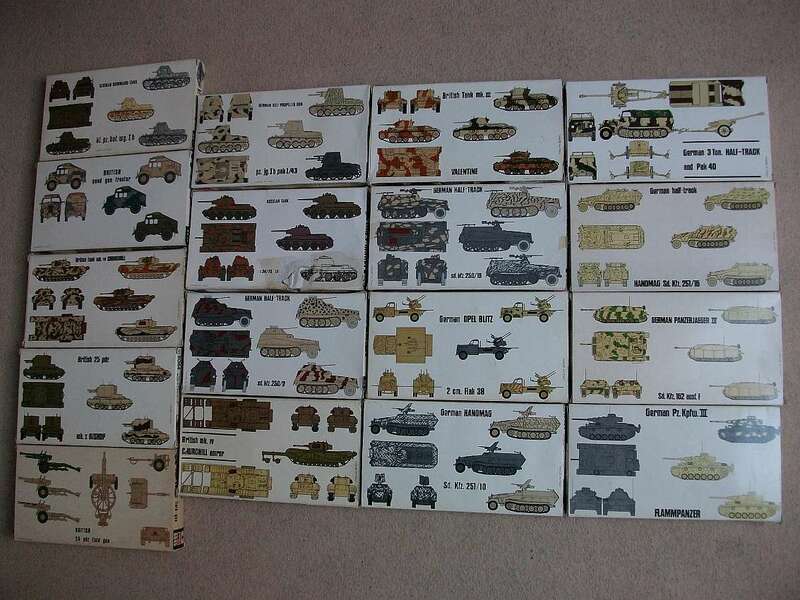 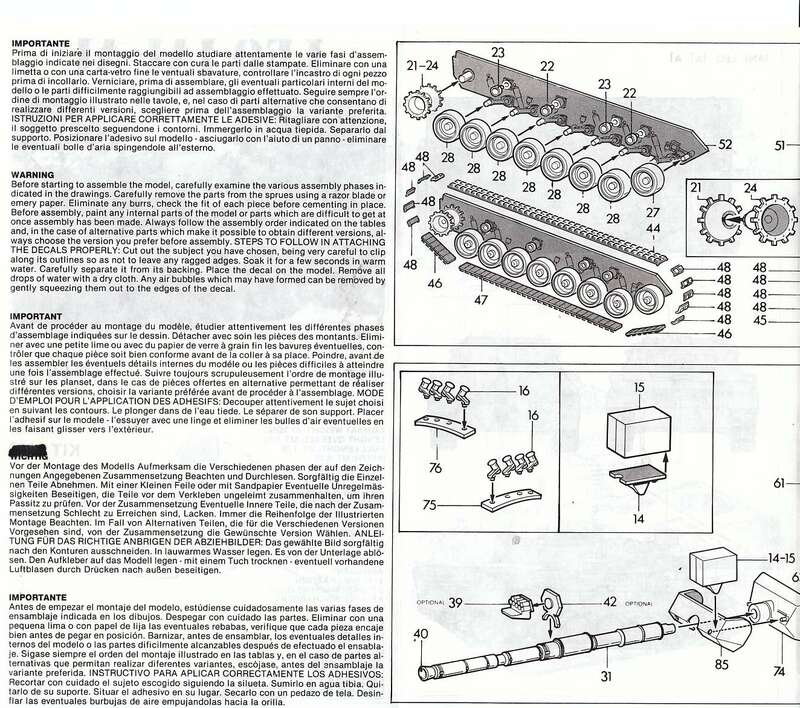 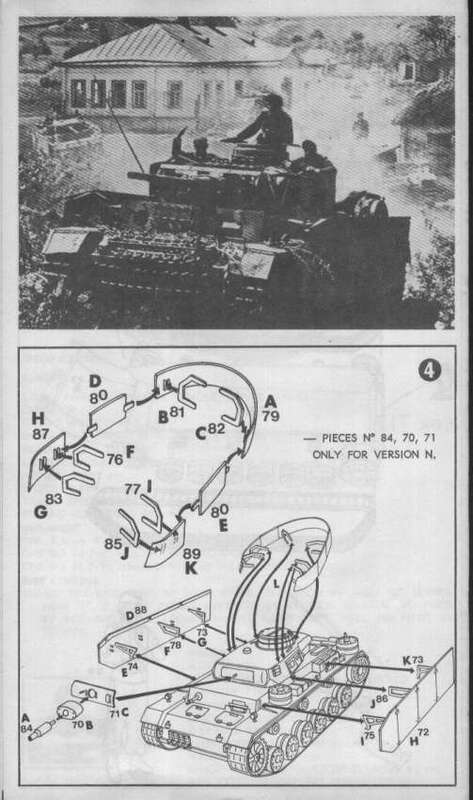 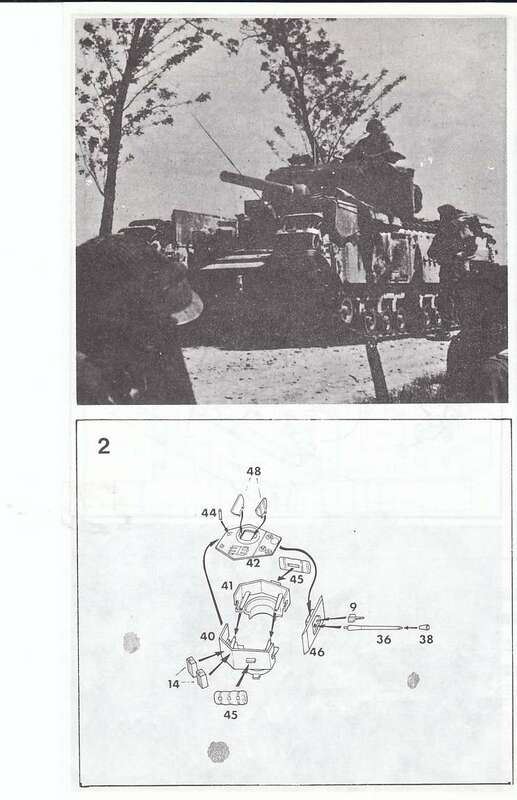 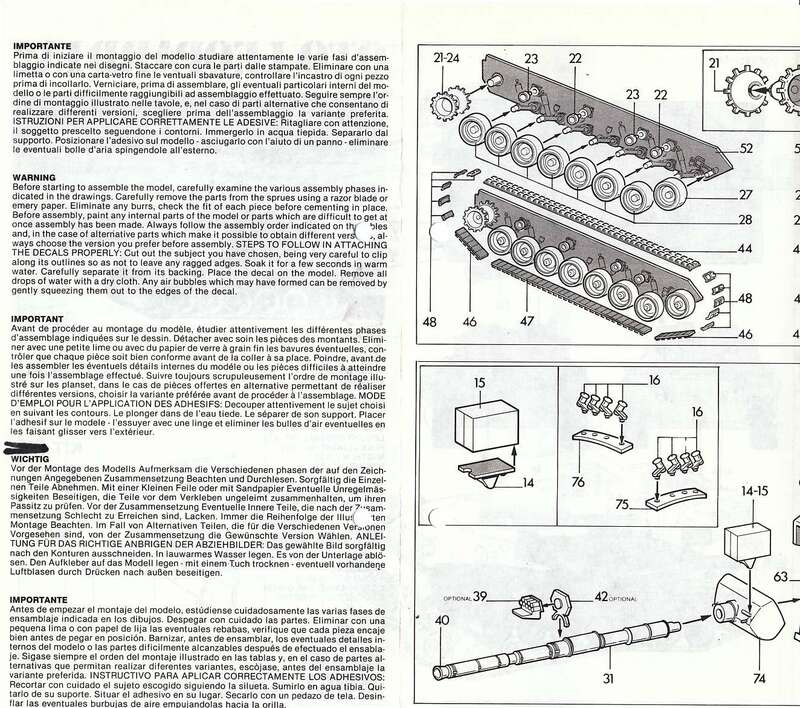 Also shown is two pictures (front and back) of all the different releases of the ESCI Sherman M4 A1 from 1974 up to 2005. 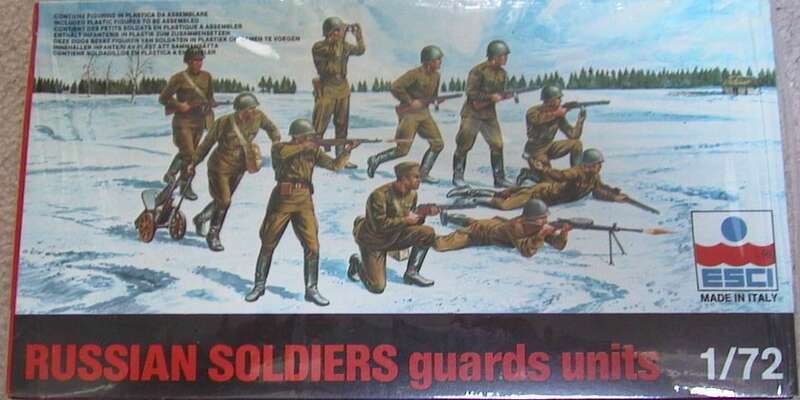 There are 12 of them. 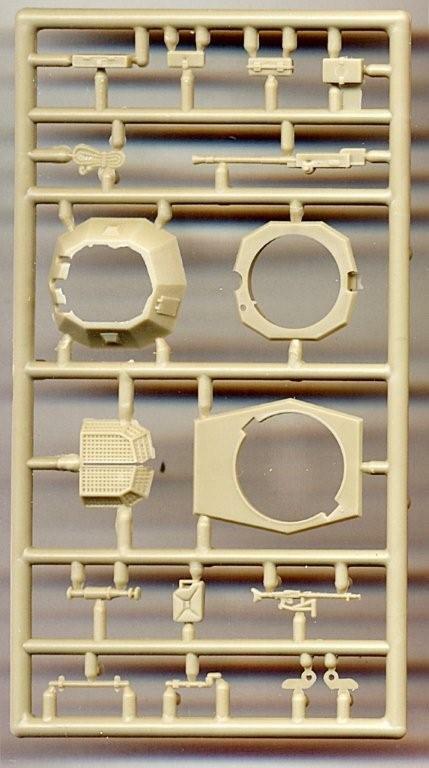 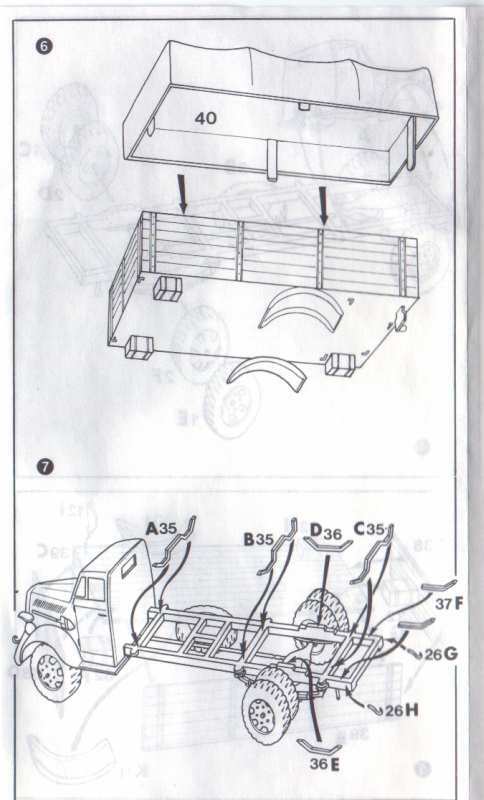 Only the very rare Hasegawa-Esci box is missing. 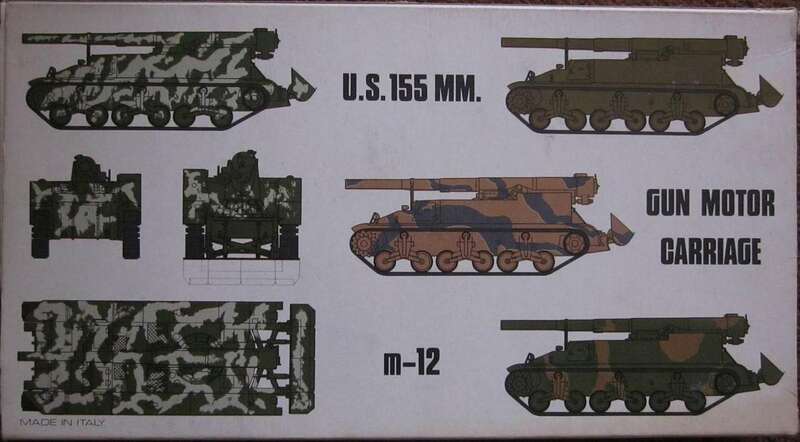 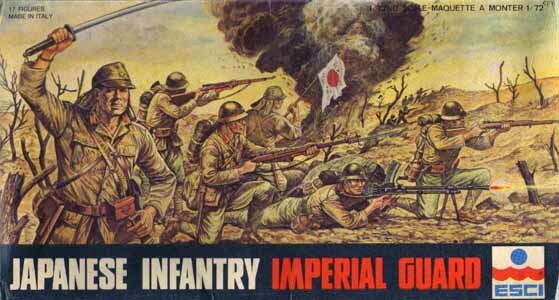 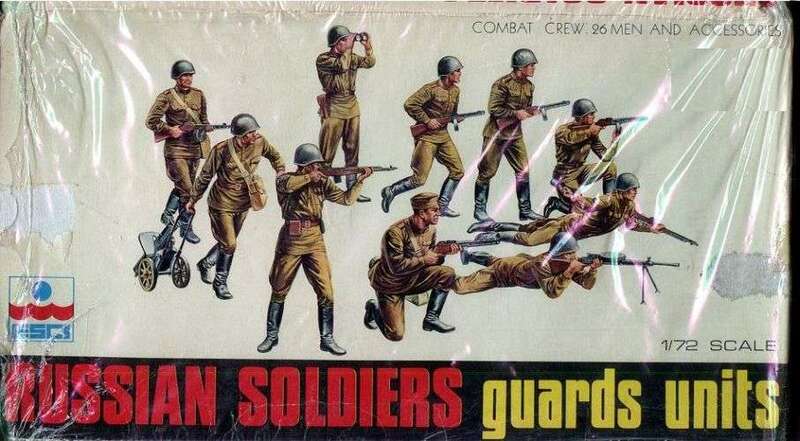 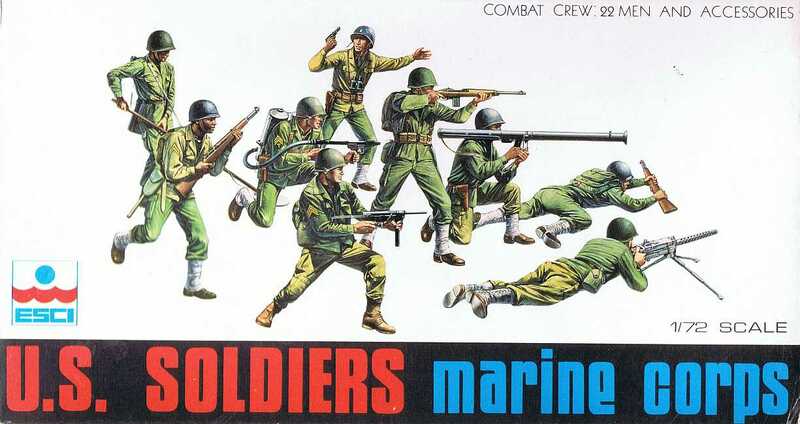 The Esci 1/72 Armor full color boxart series. 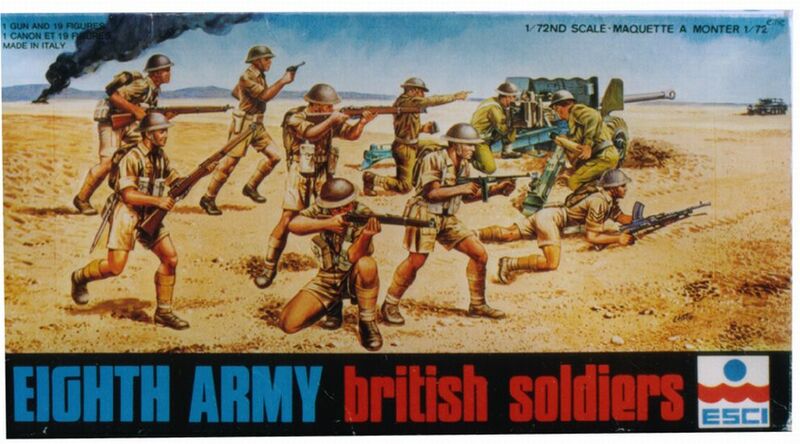 This series started in 1977 when new kits, that were already promised from 1975 onwards, were released. 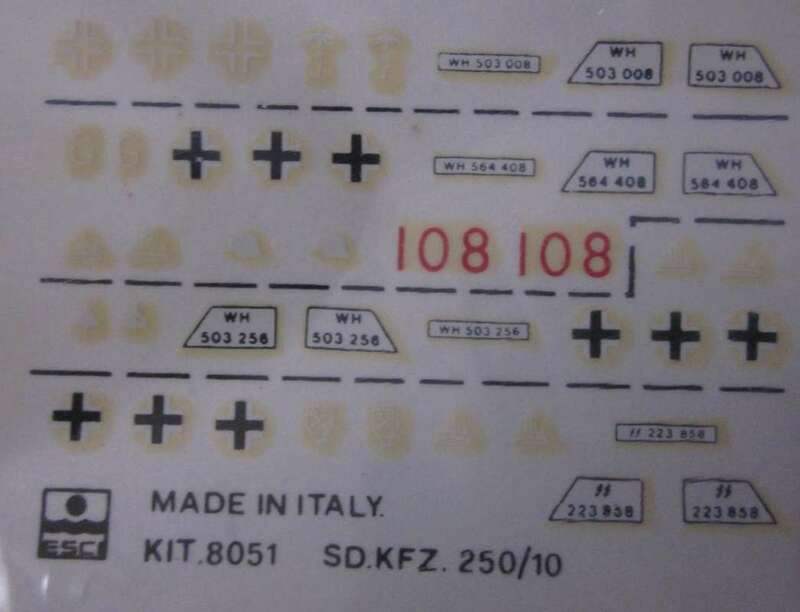 When this series stopped late 1986, all kitnumbers from 8001 up to 8073 were accounted for. 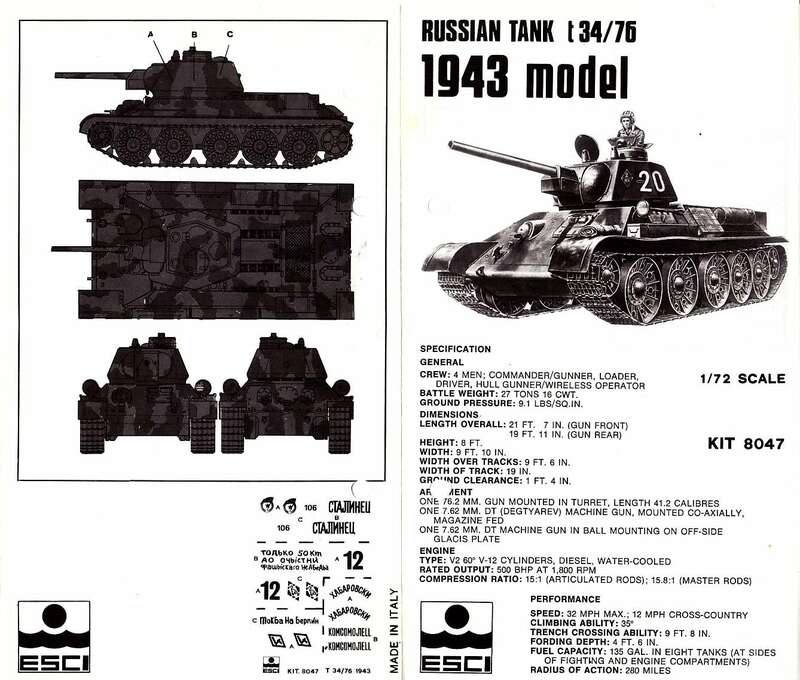 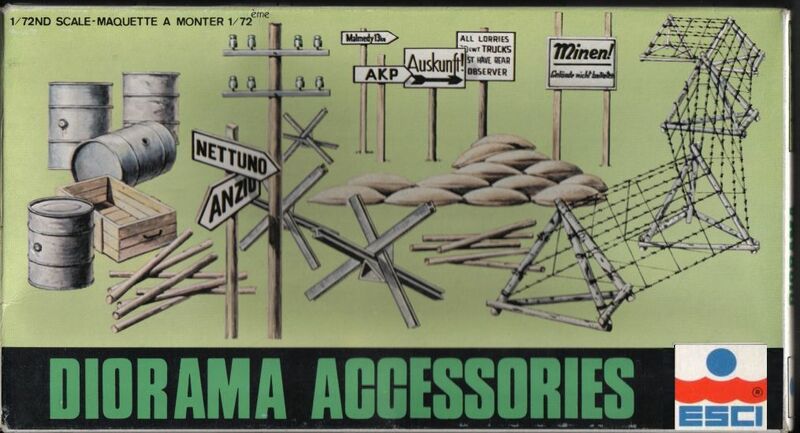 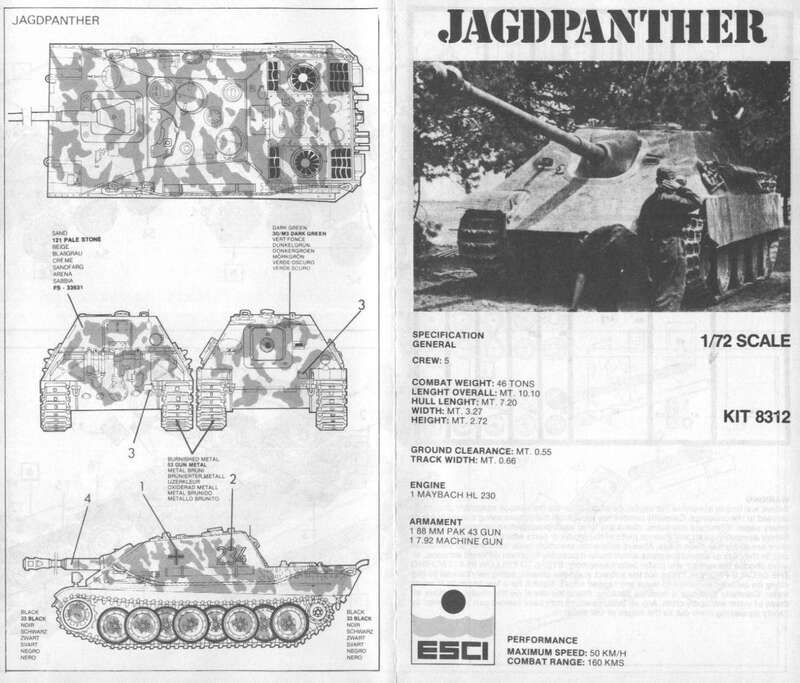 In 1977 Esci started with kits in flipopen boxes with at the front a full color landscape boxart and a black band kitname. 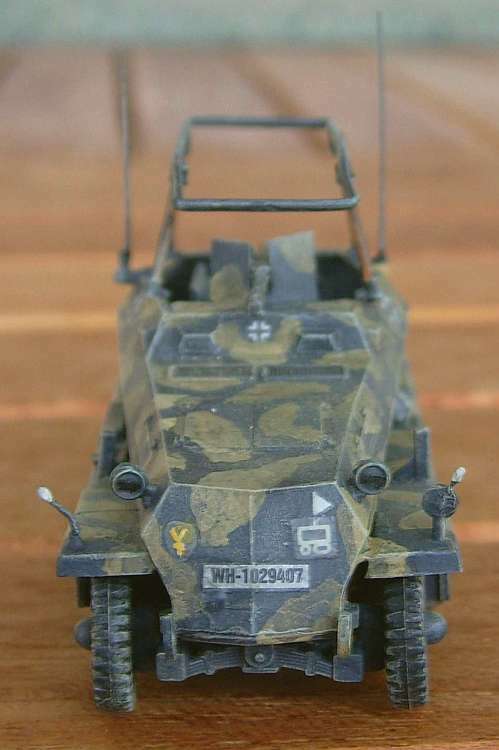 The same vehicle/soldier pictures were taken from the Whitebox series with the landscape painted behind them. 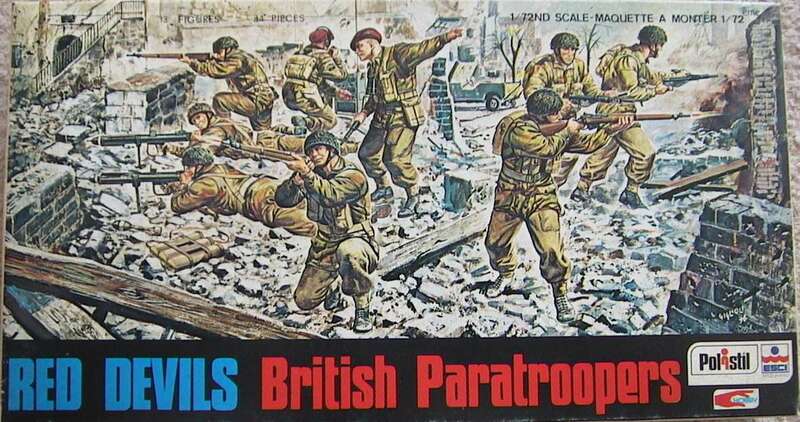 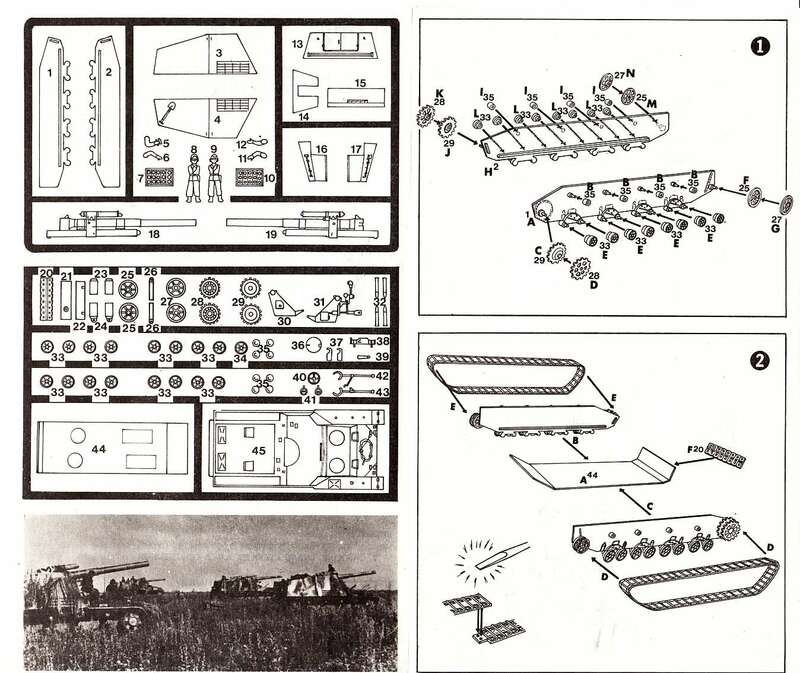 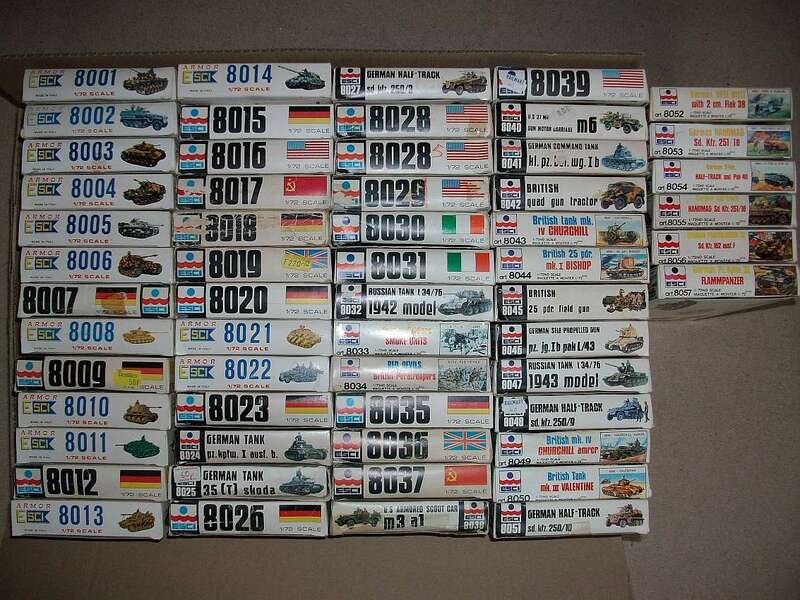 (The same happened with the Revell-Esci releases but with different landscapes). 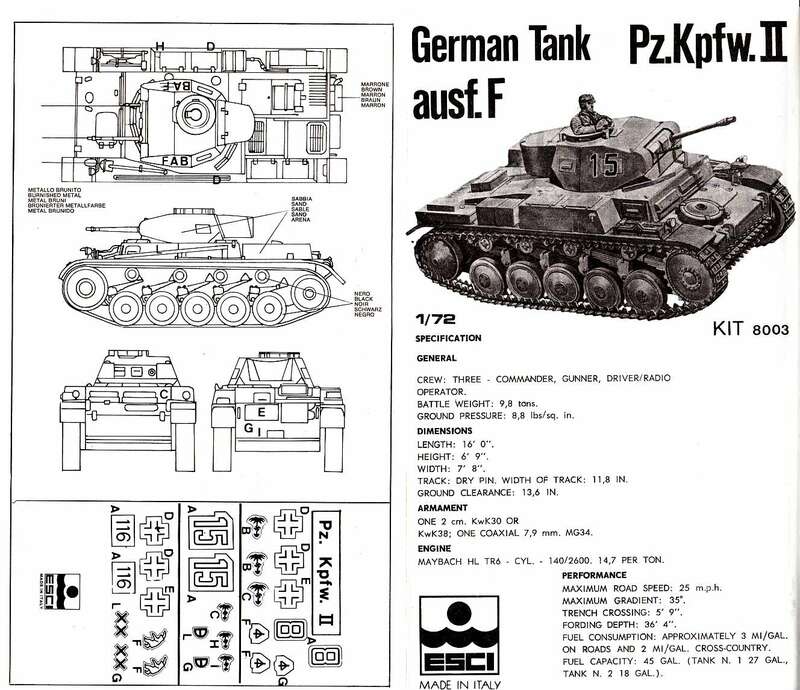 Some changes were made in details and the first four kits (8001 to 8004) got whole new boxart. 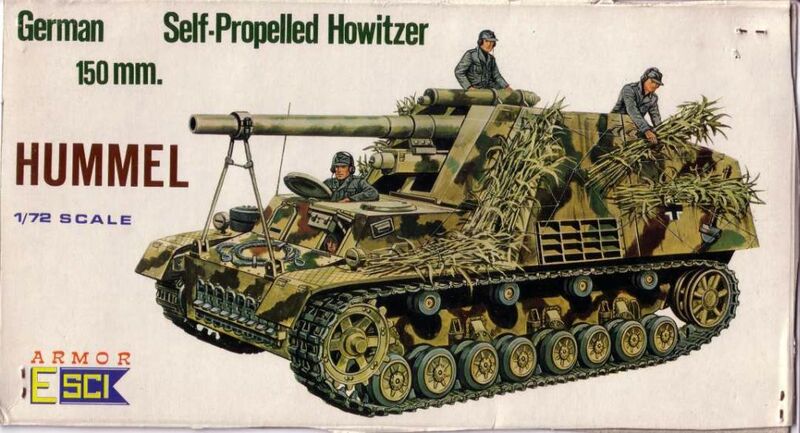 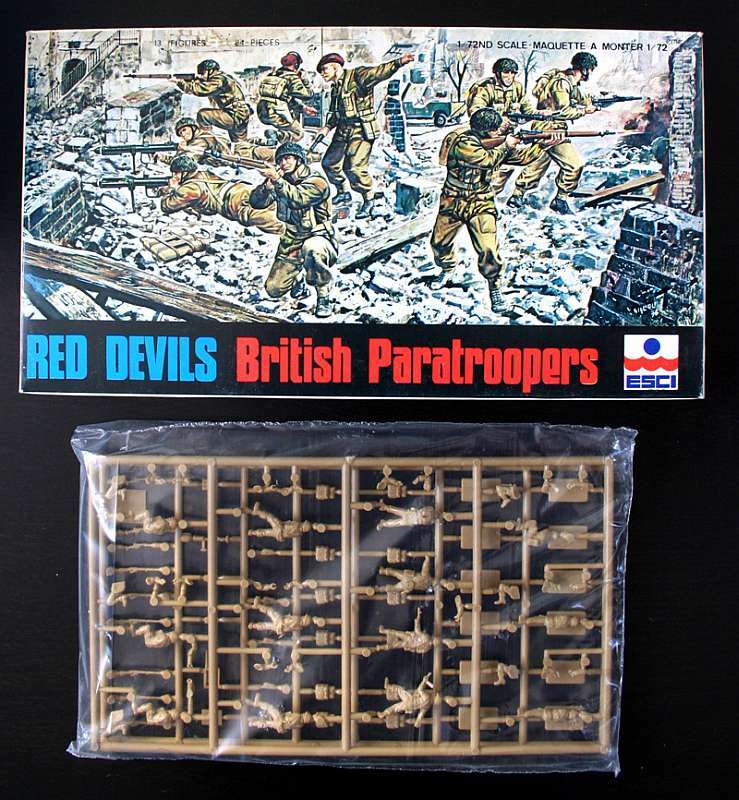 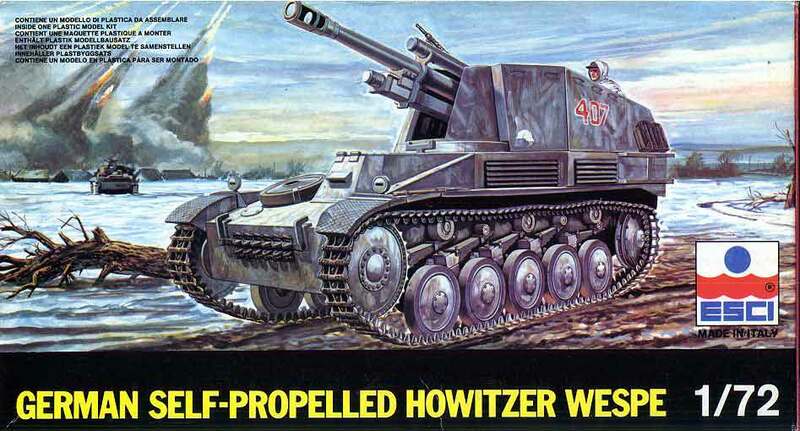 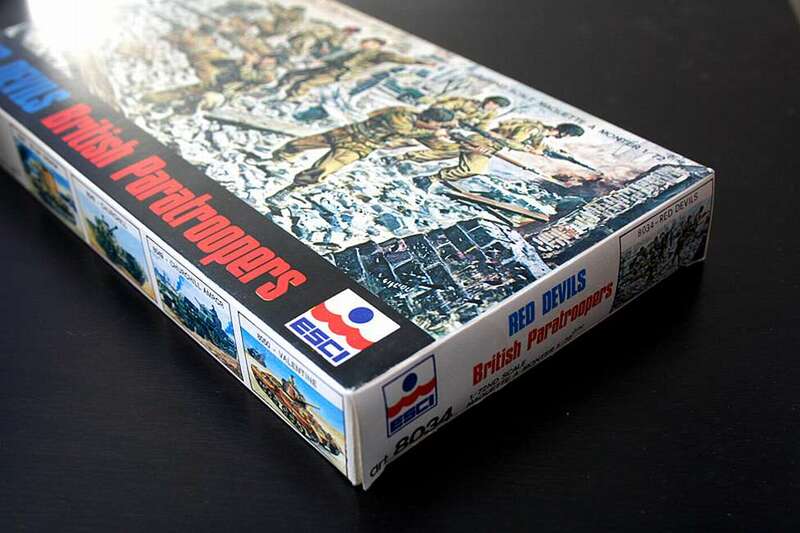 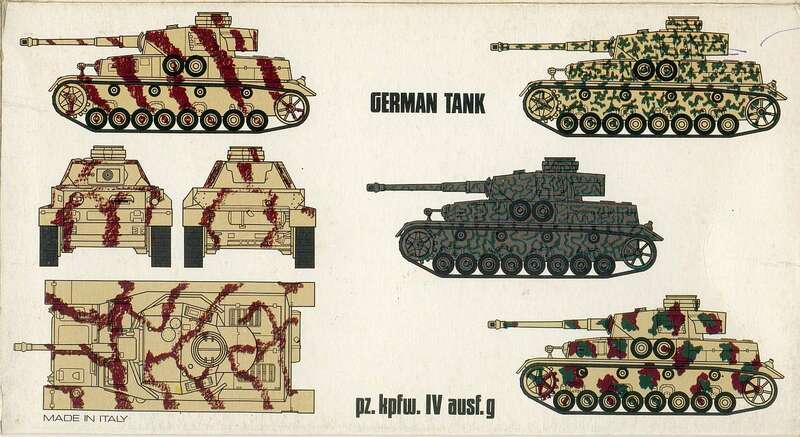 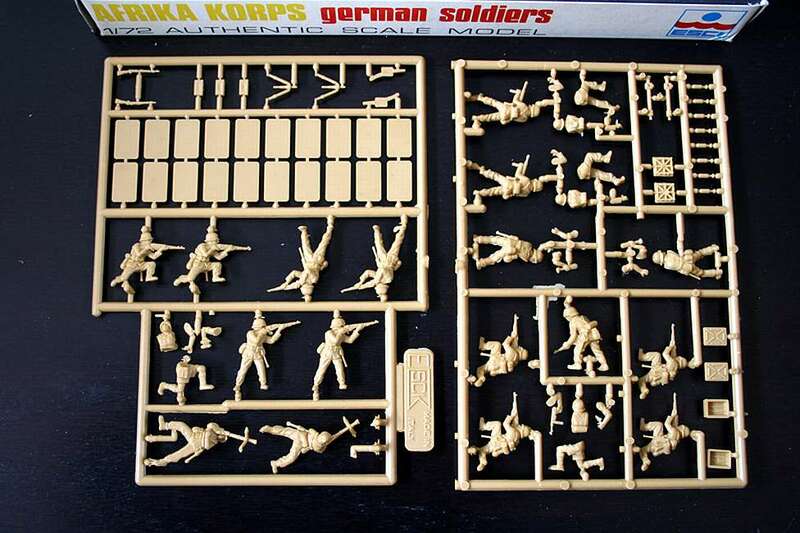 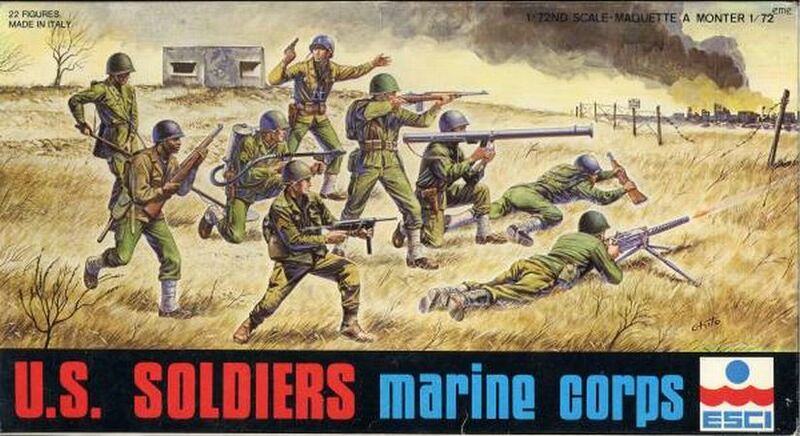 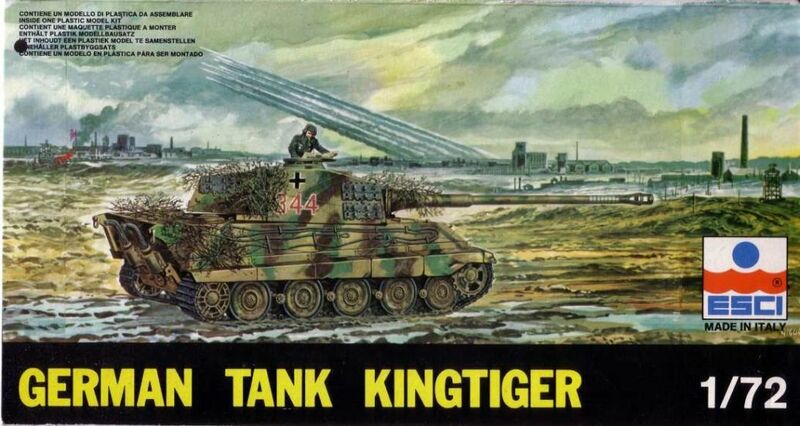 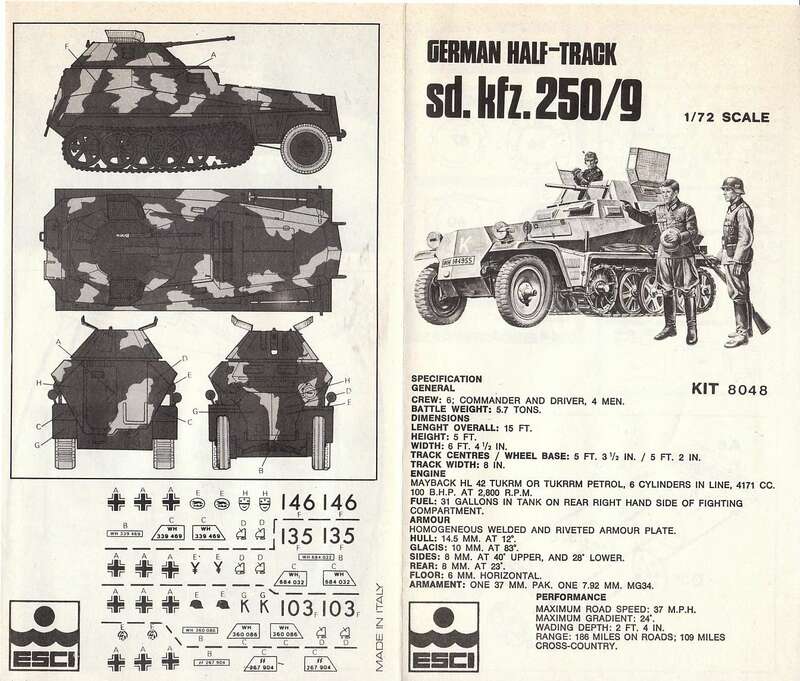 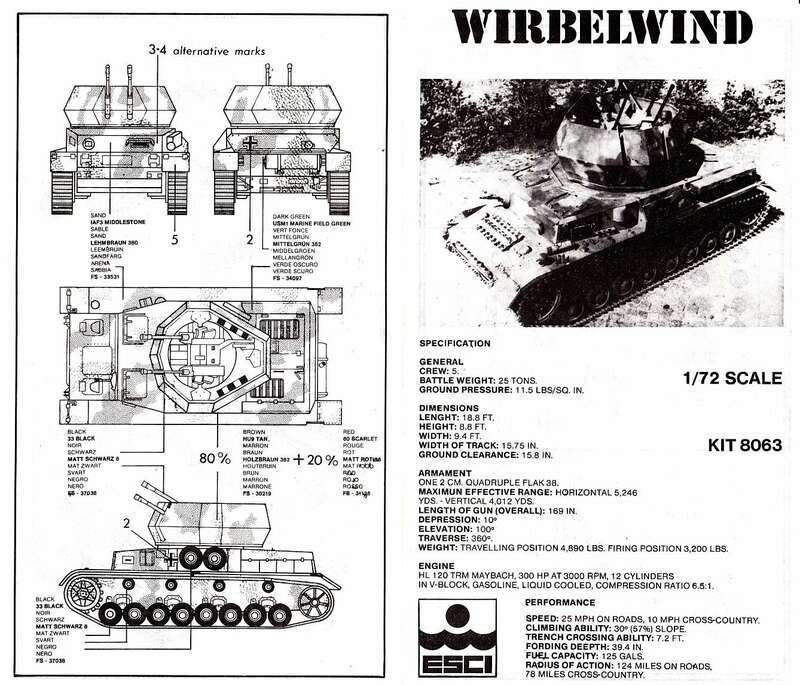 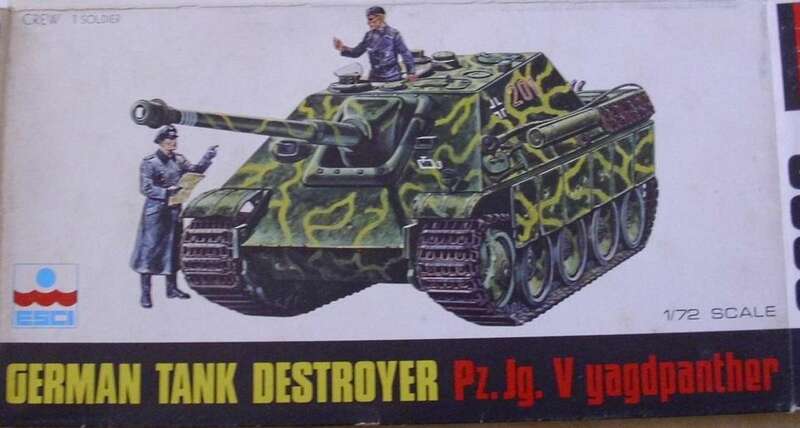 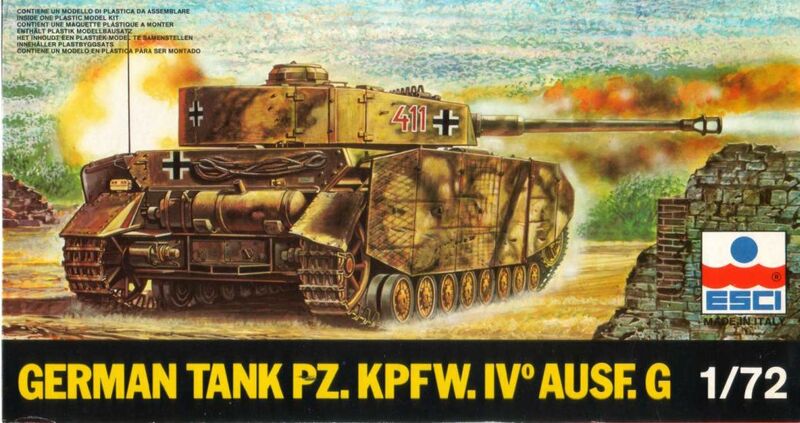 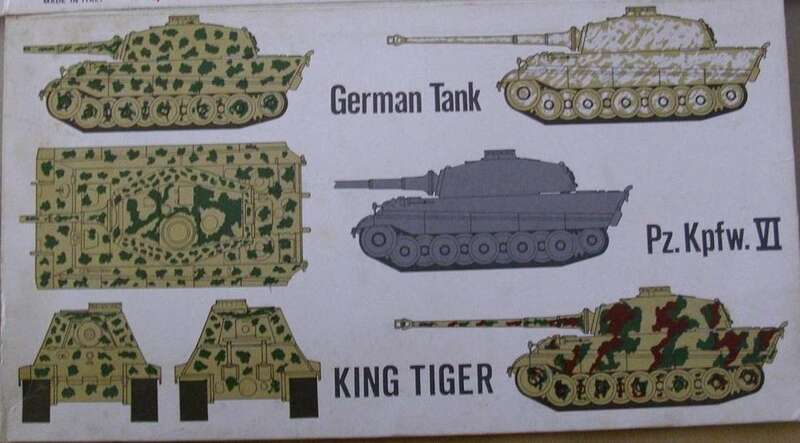 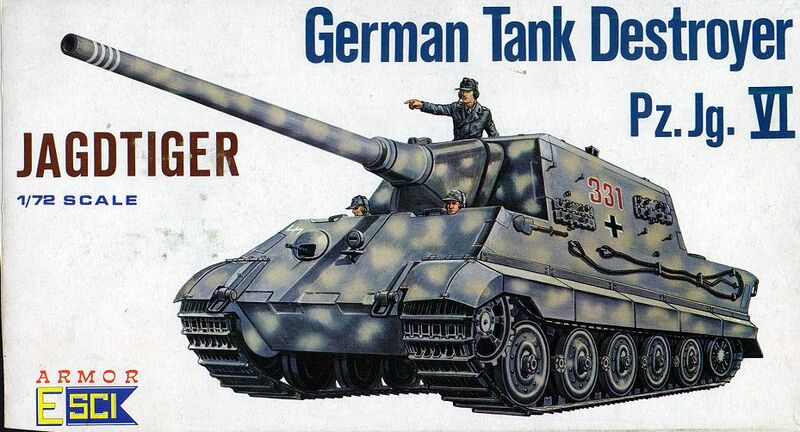 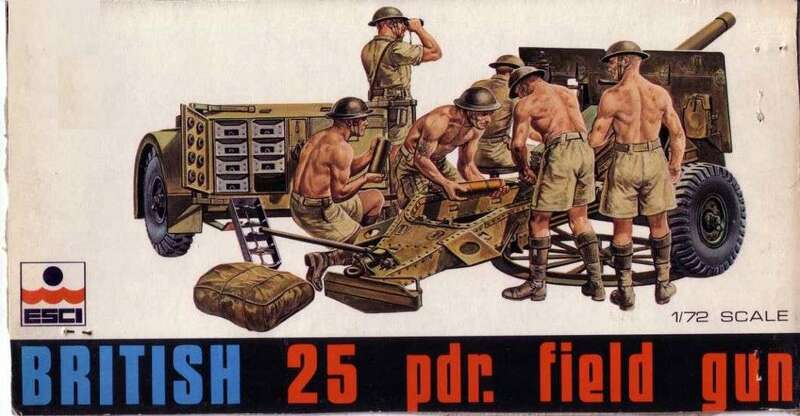 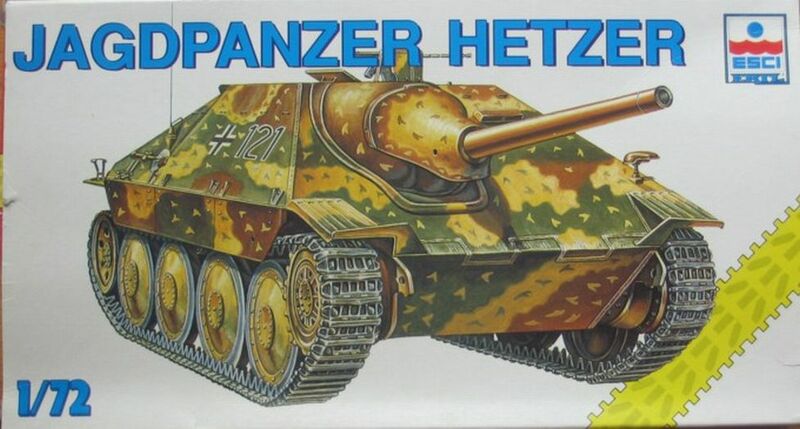 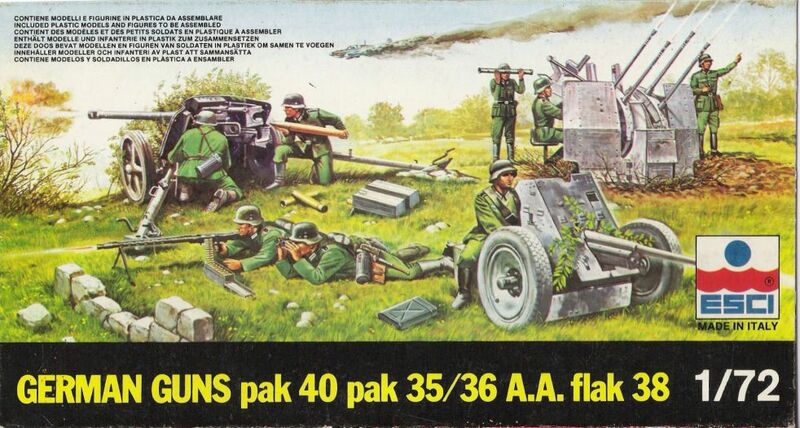 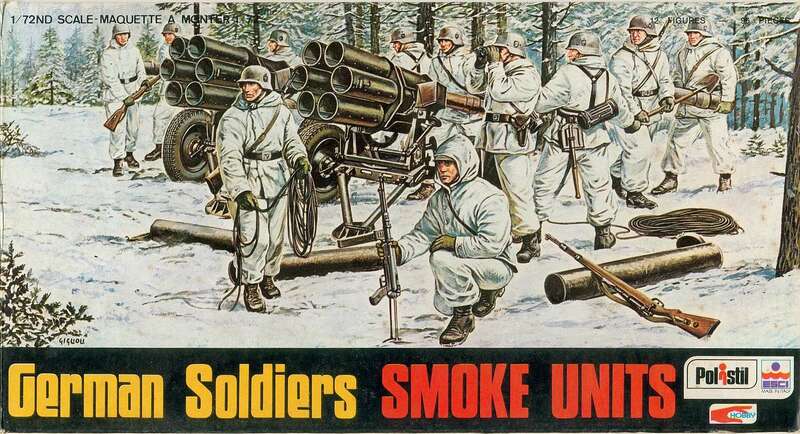 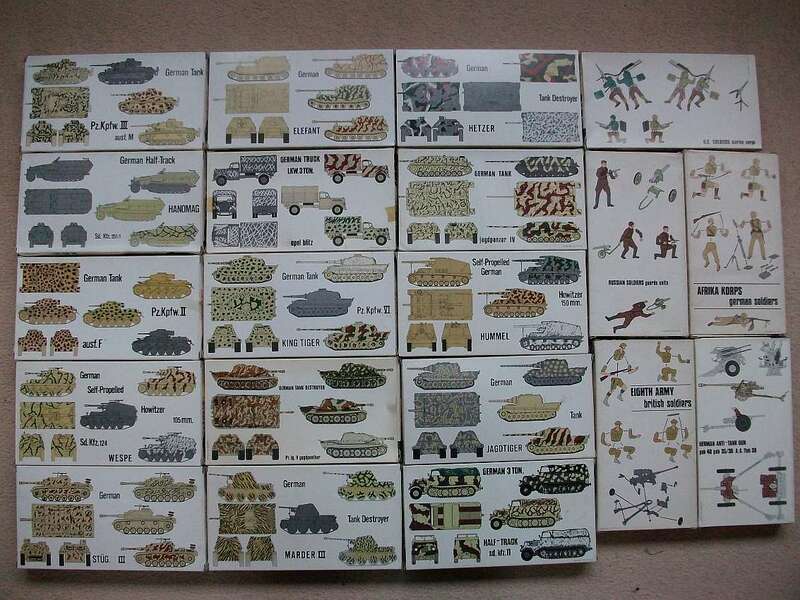 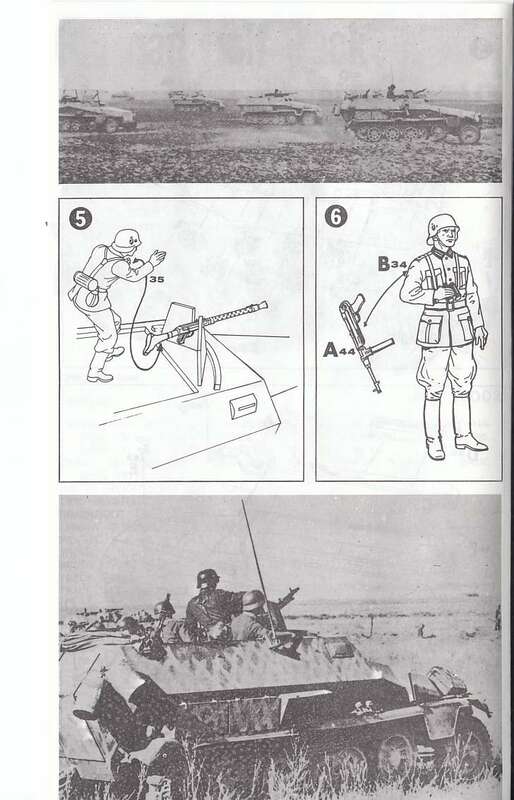 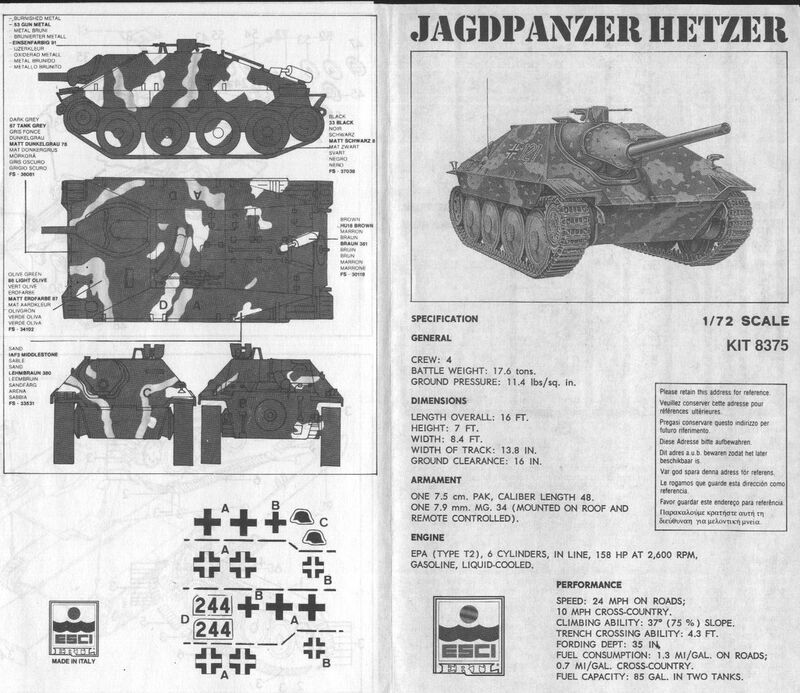 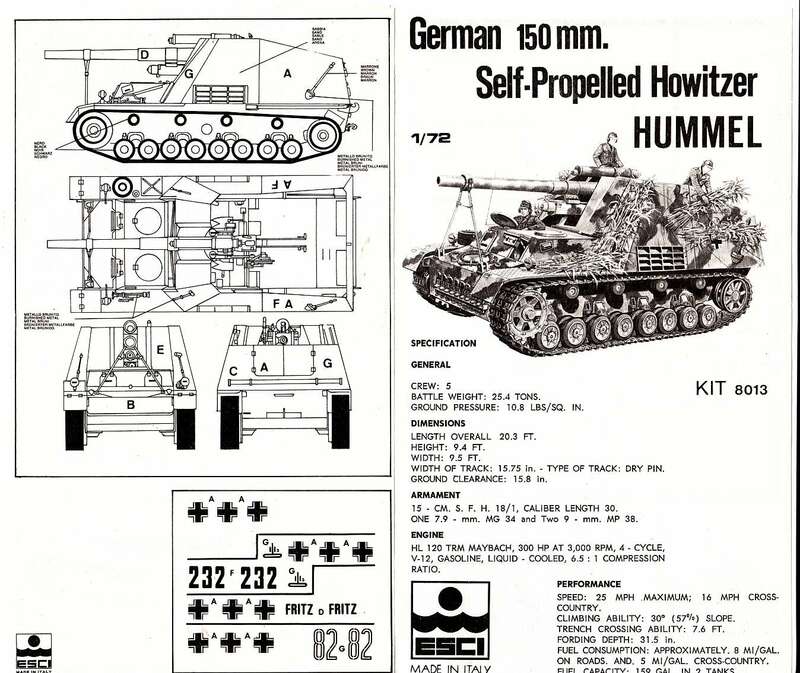 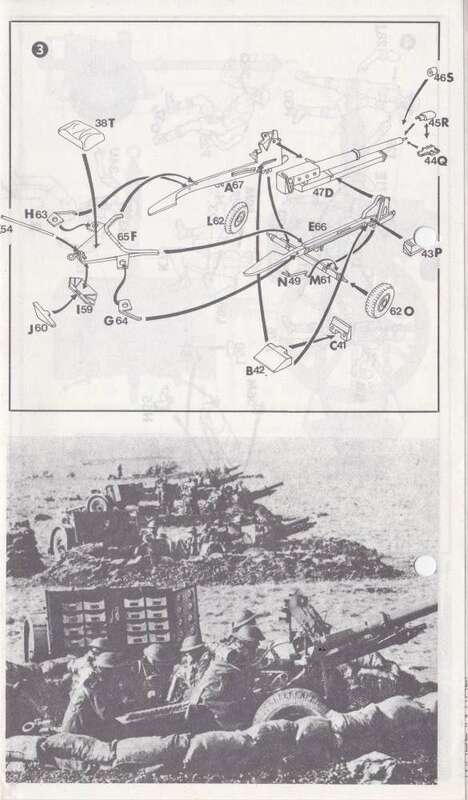 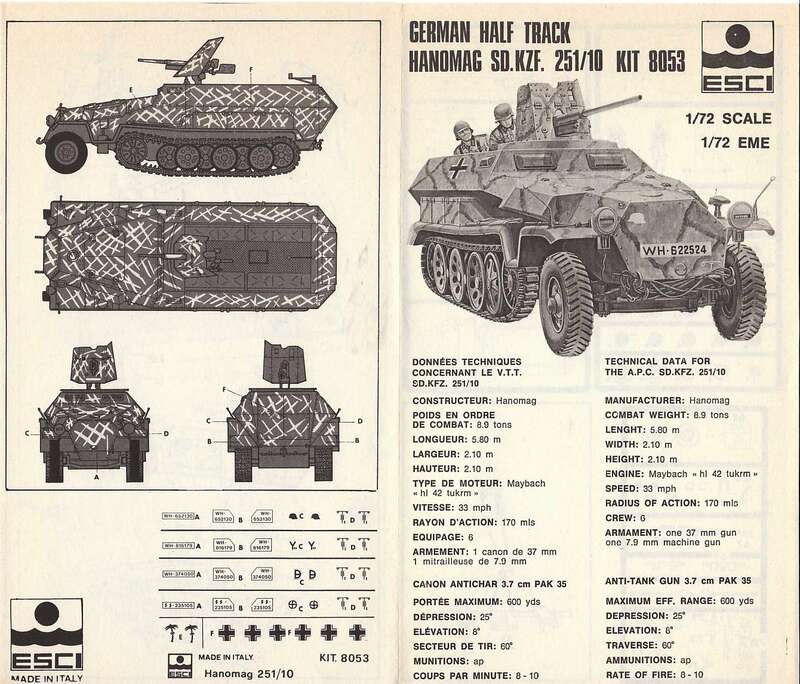 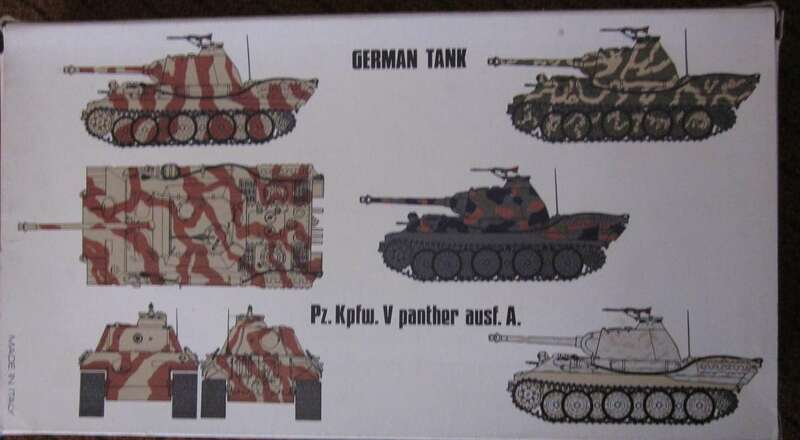 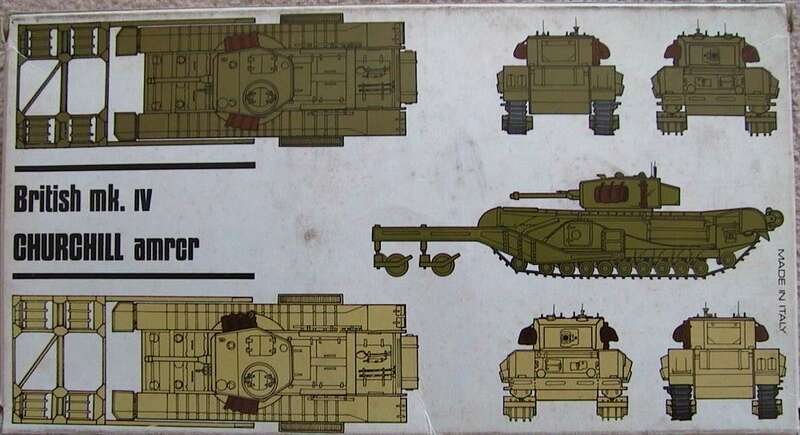 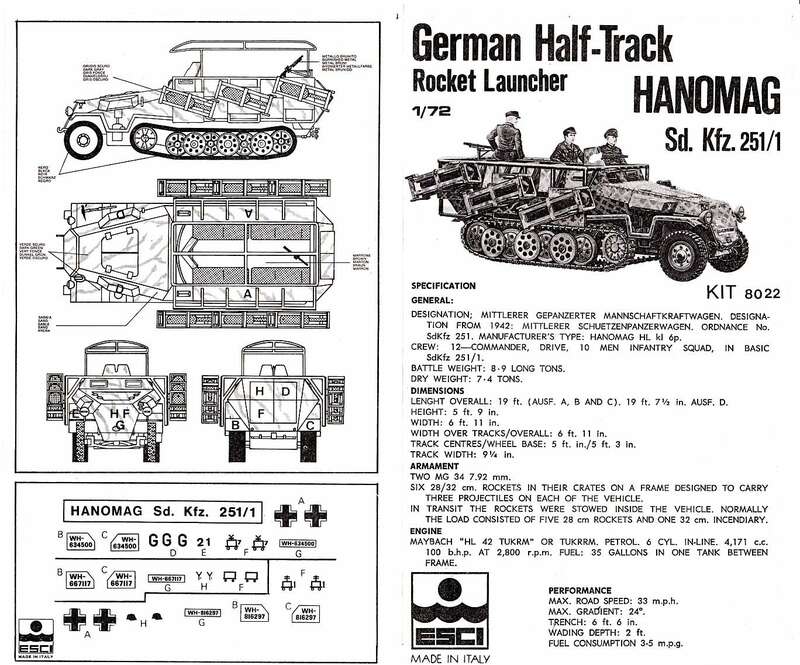 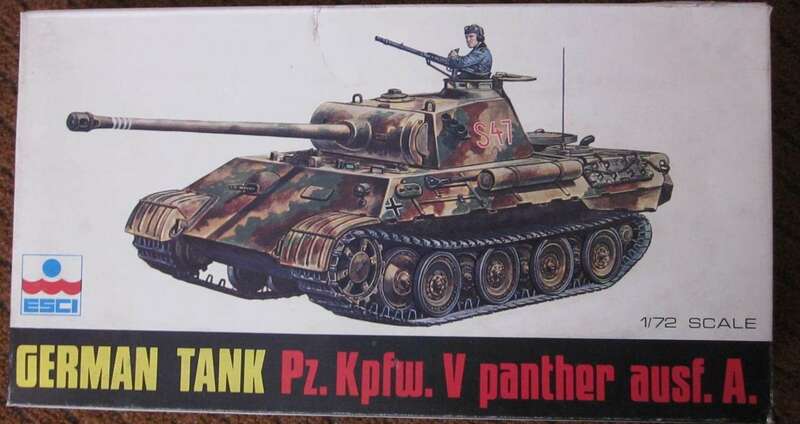 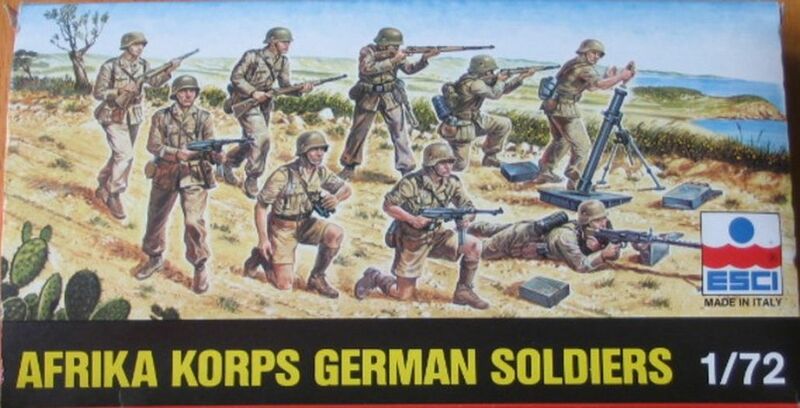 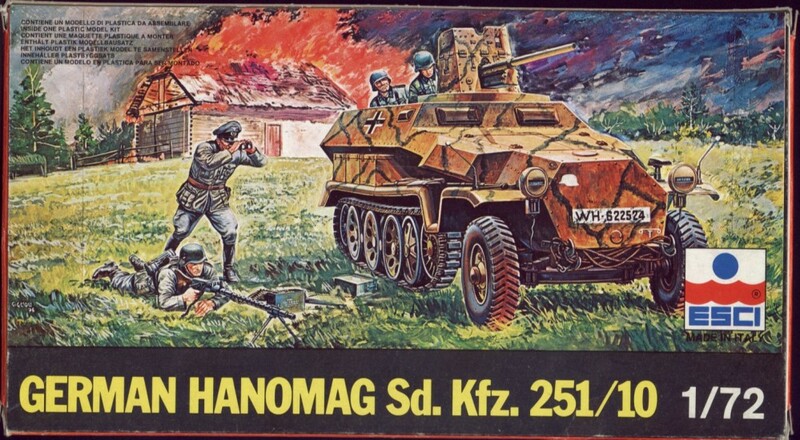 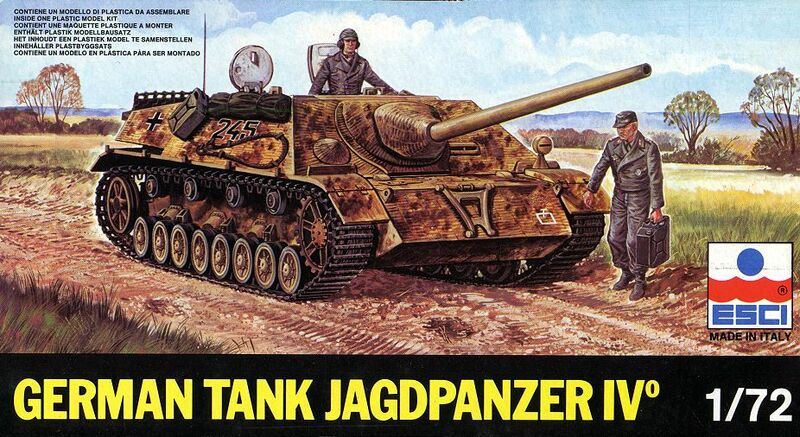 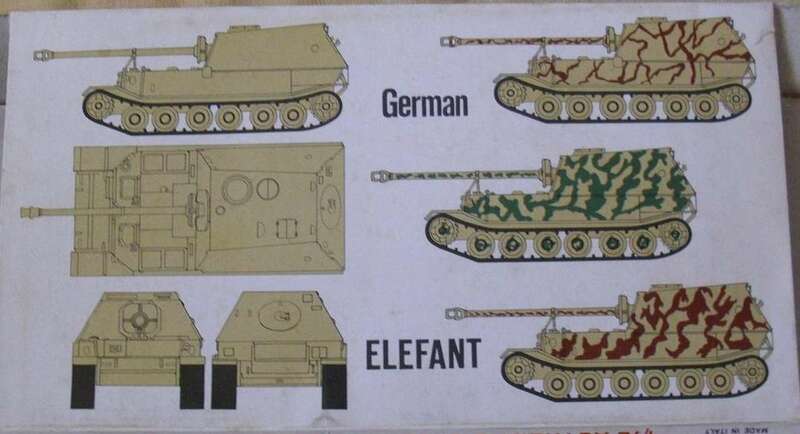 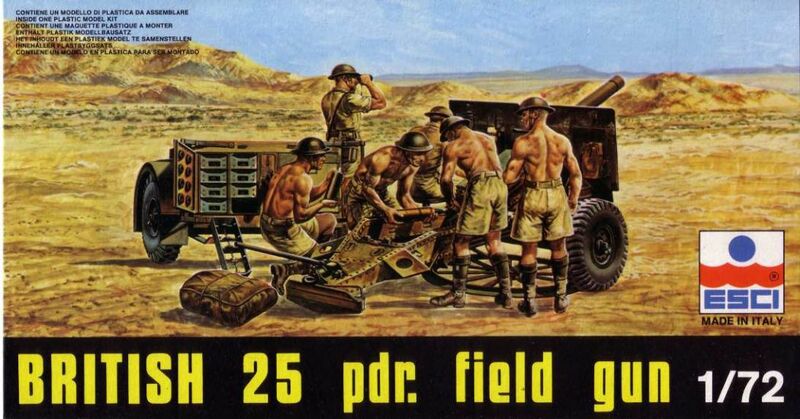 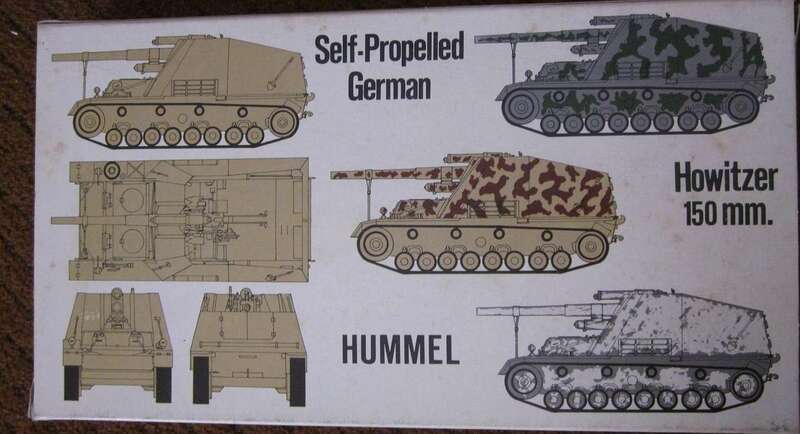 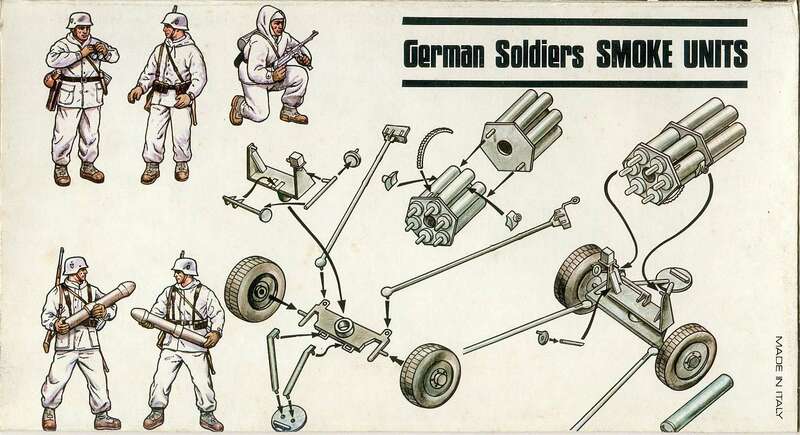 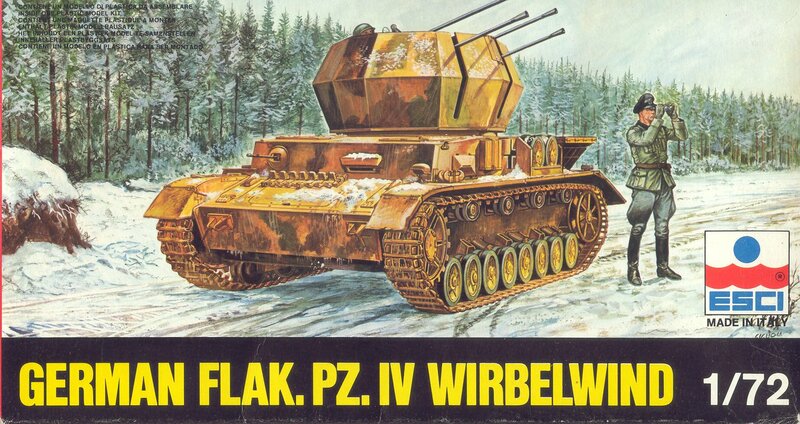 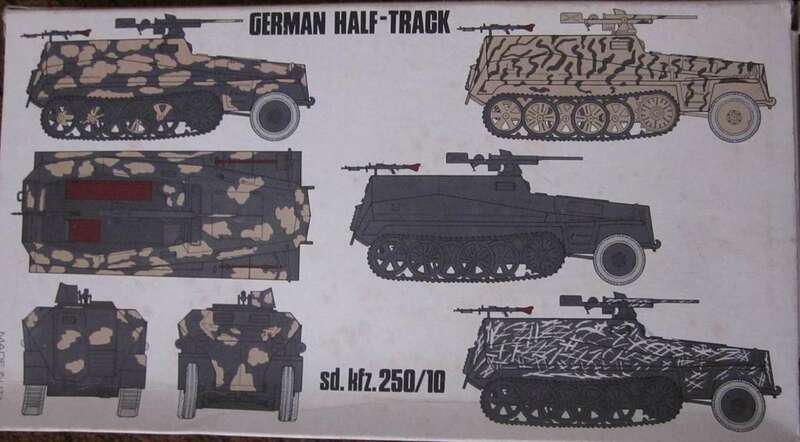 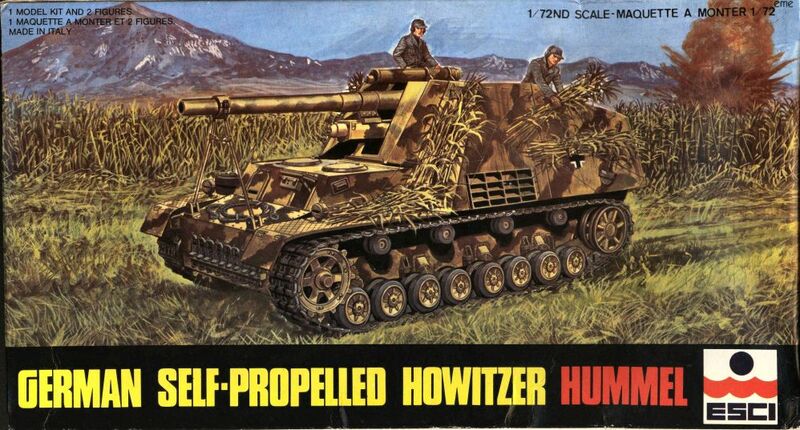 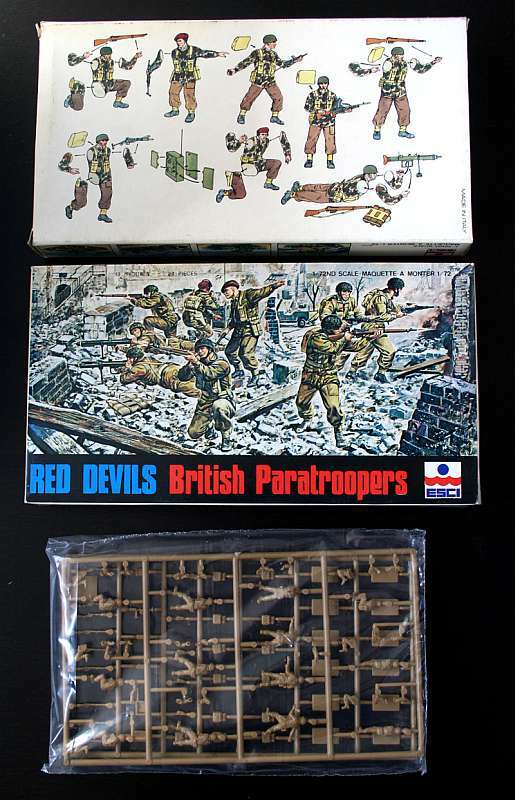 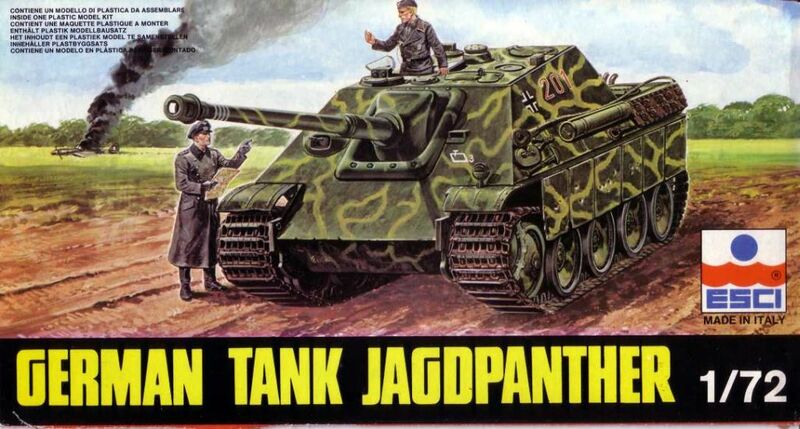 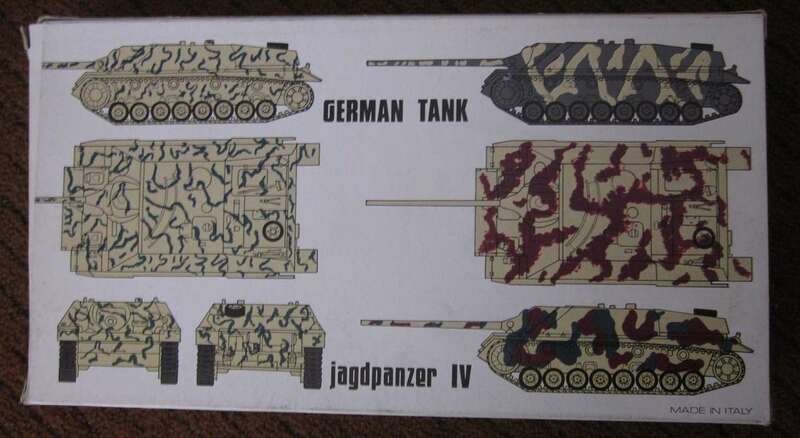 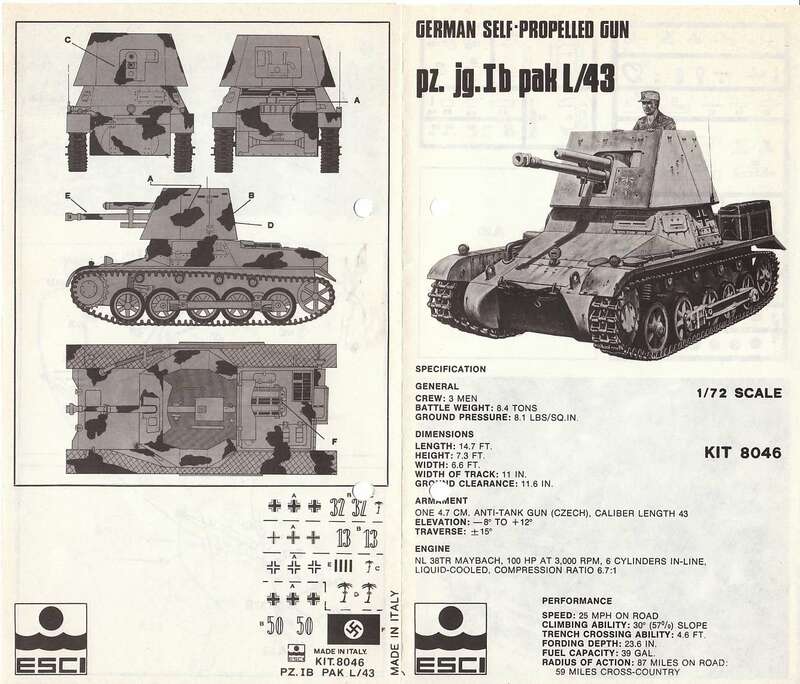 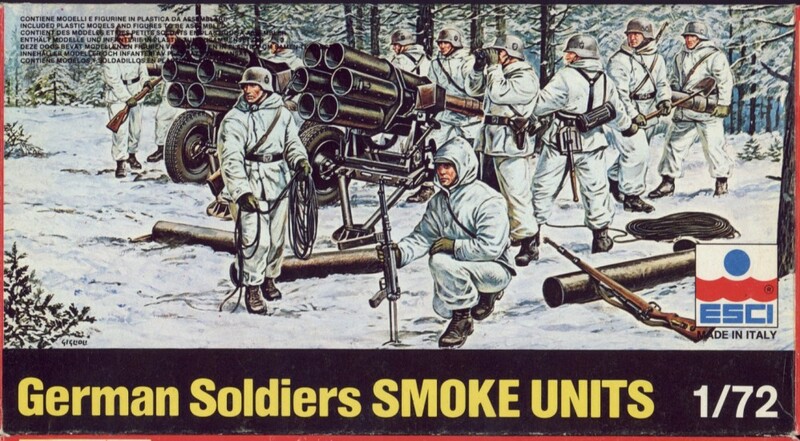 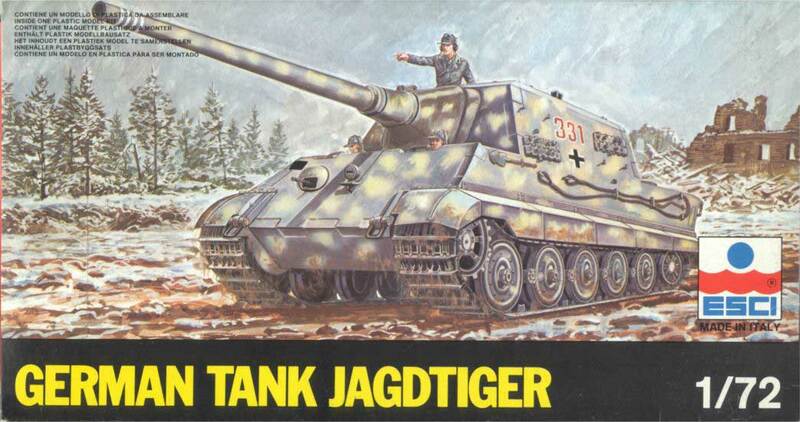 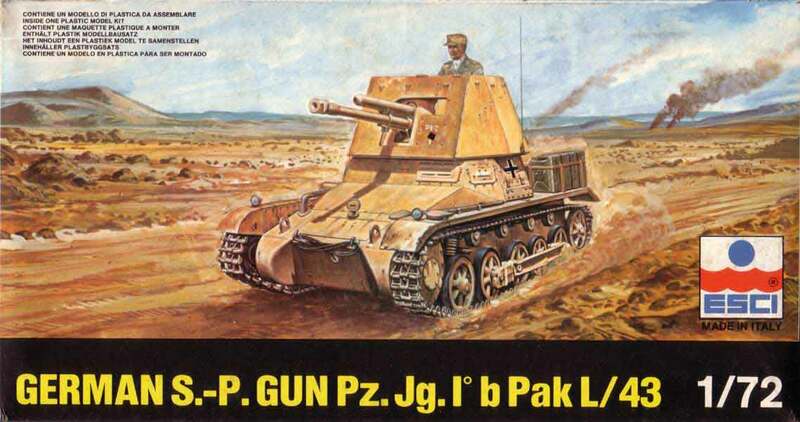 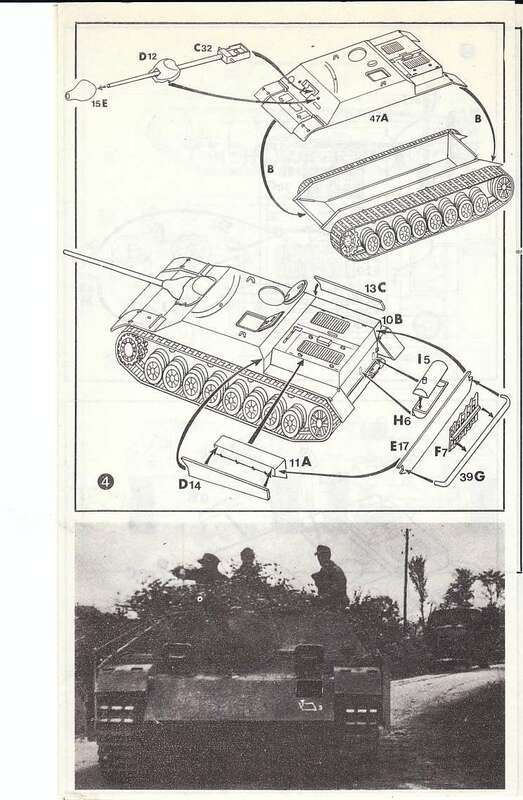 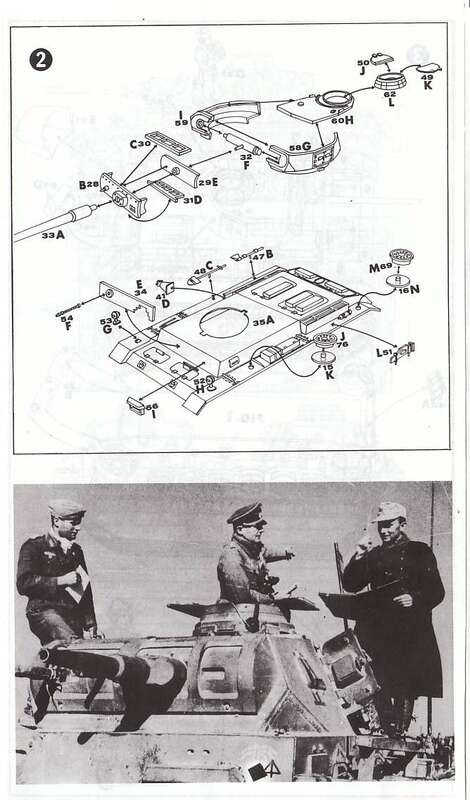 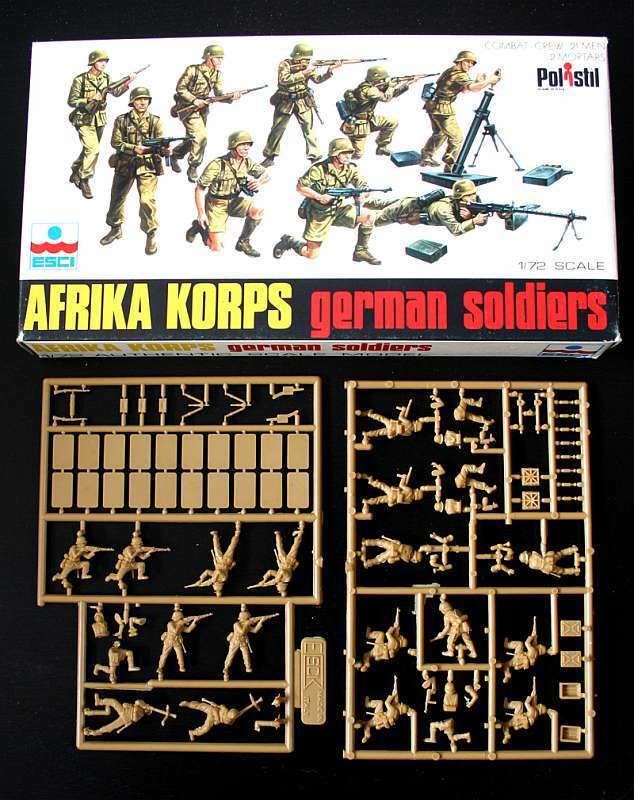 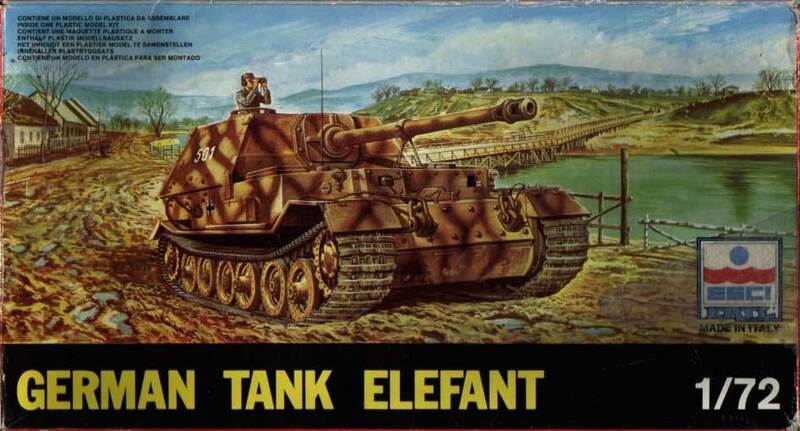 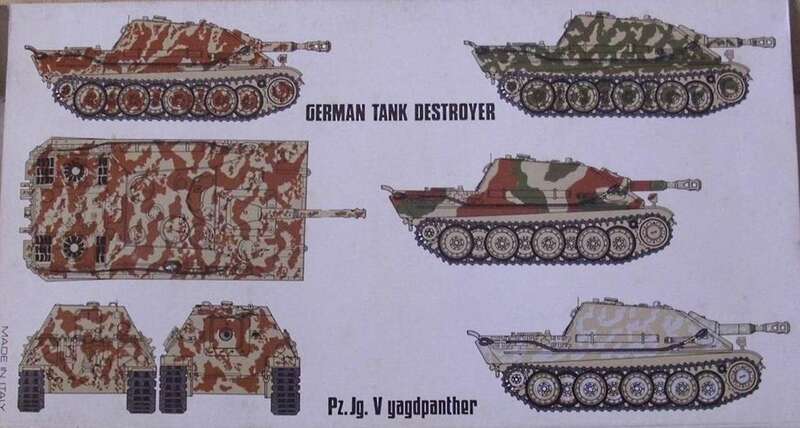 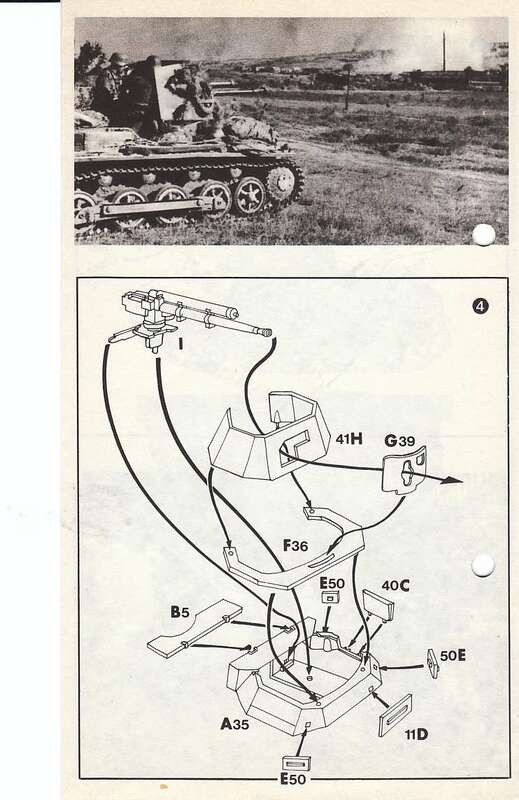 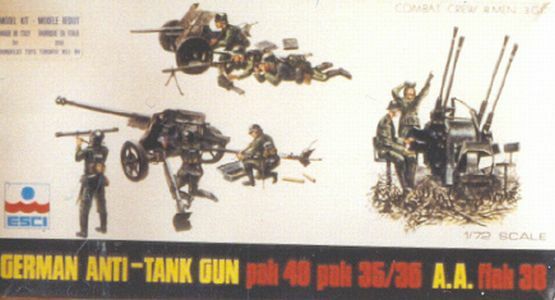 These "re-issues" came later though, and the first full color boxes were the ones sofar not released in the early series, starting with the Nebelwerfer and the Red Devils kits (8033 and 8034). 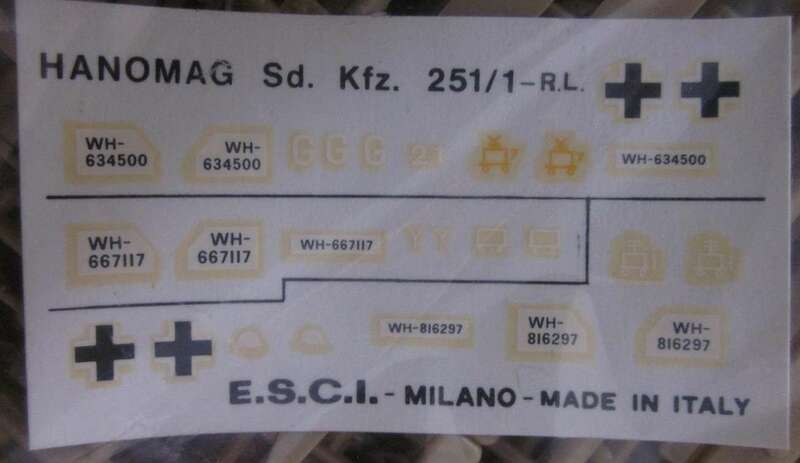 These boxes usually have a very dark-blue Esci logo on front and sides and, more special, have a color profile at the backside of the box, like the Whitebox series !! 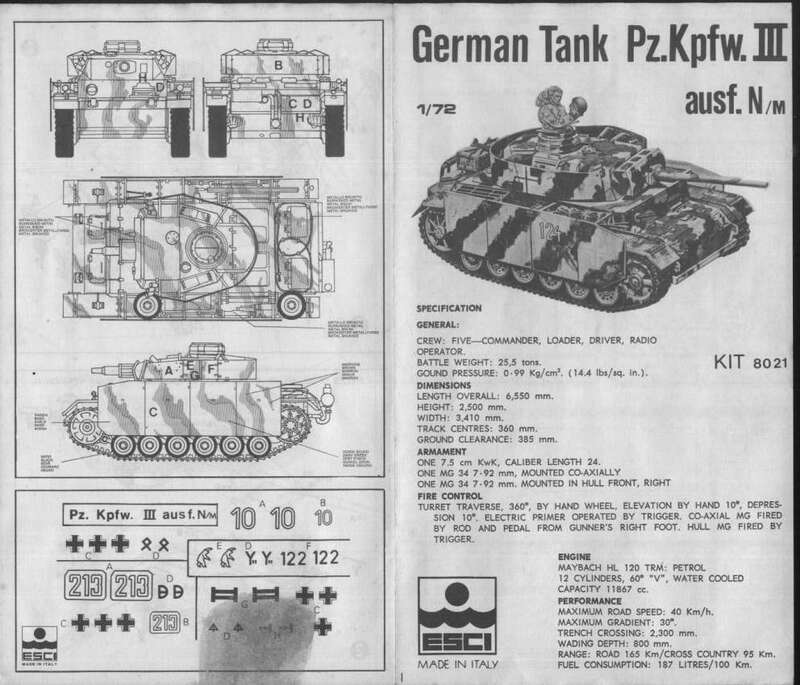 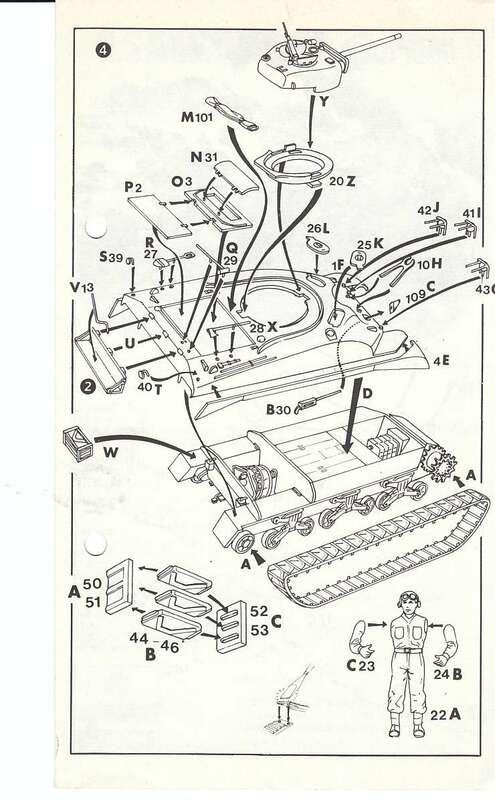 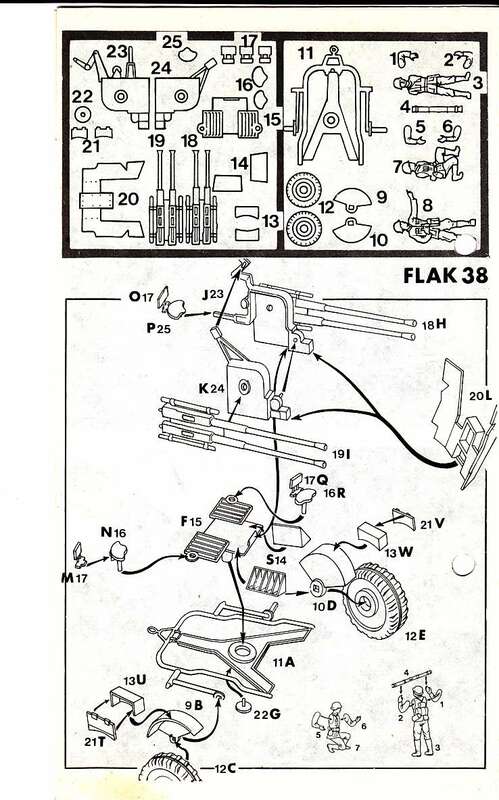 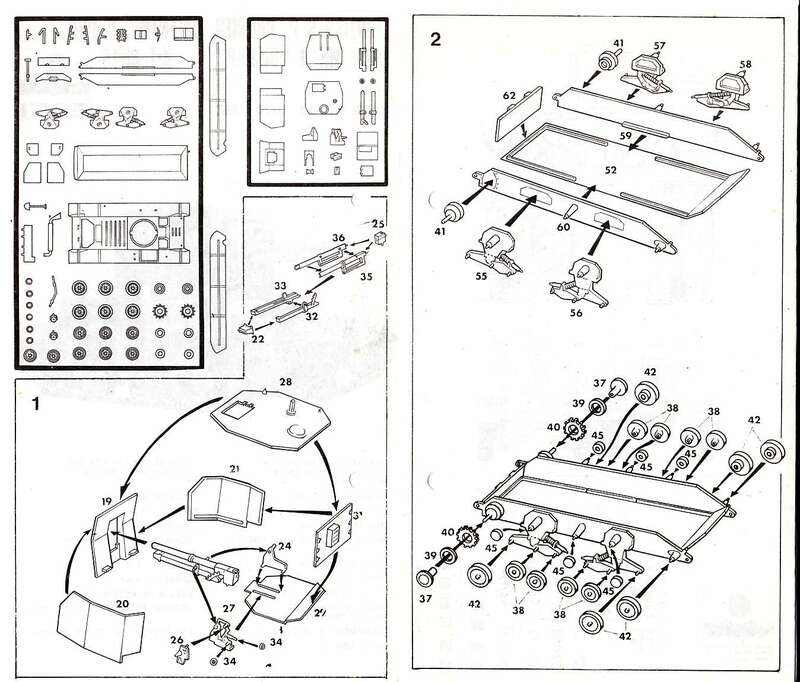 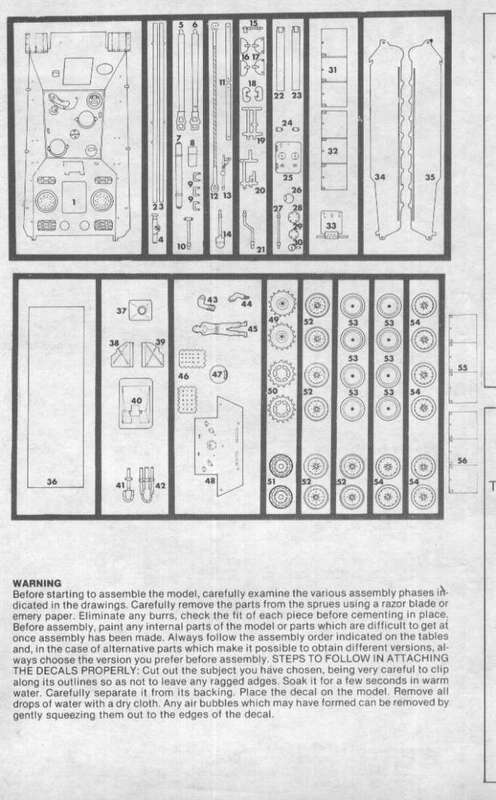 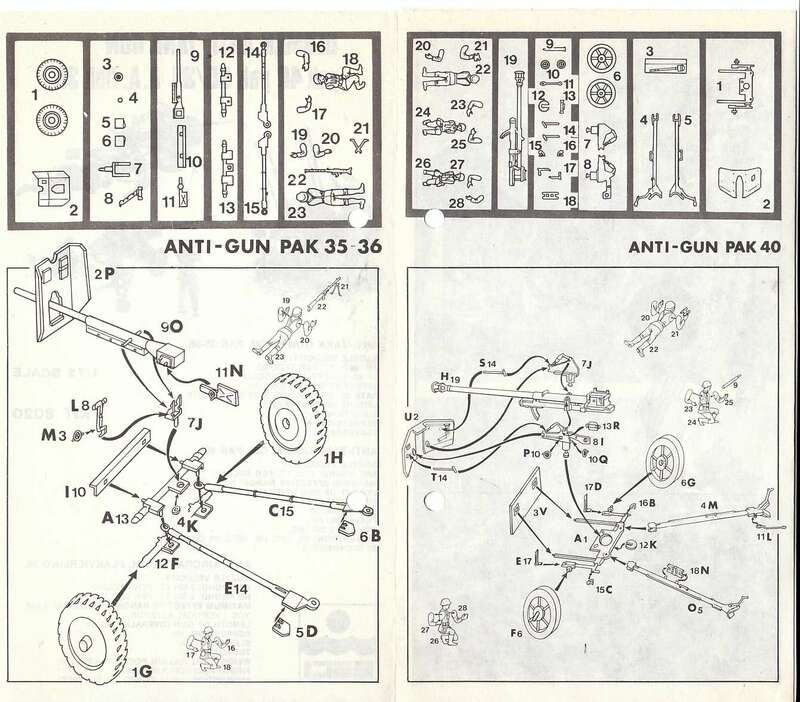 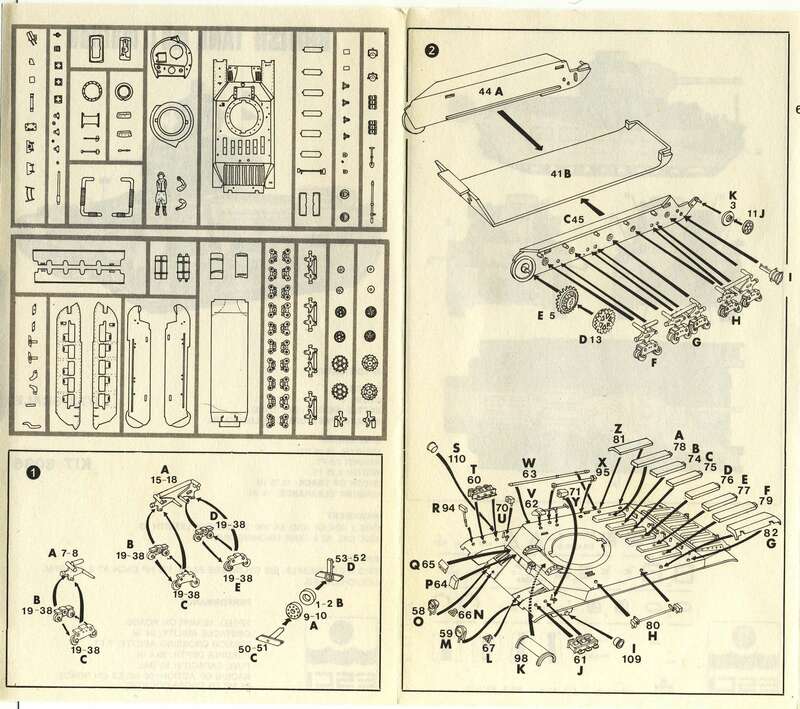 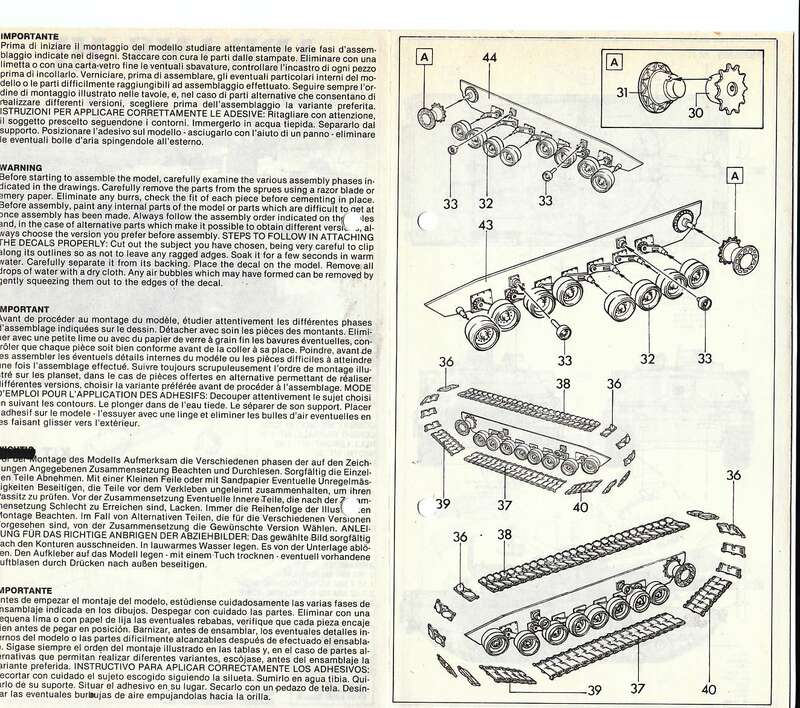 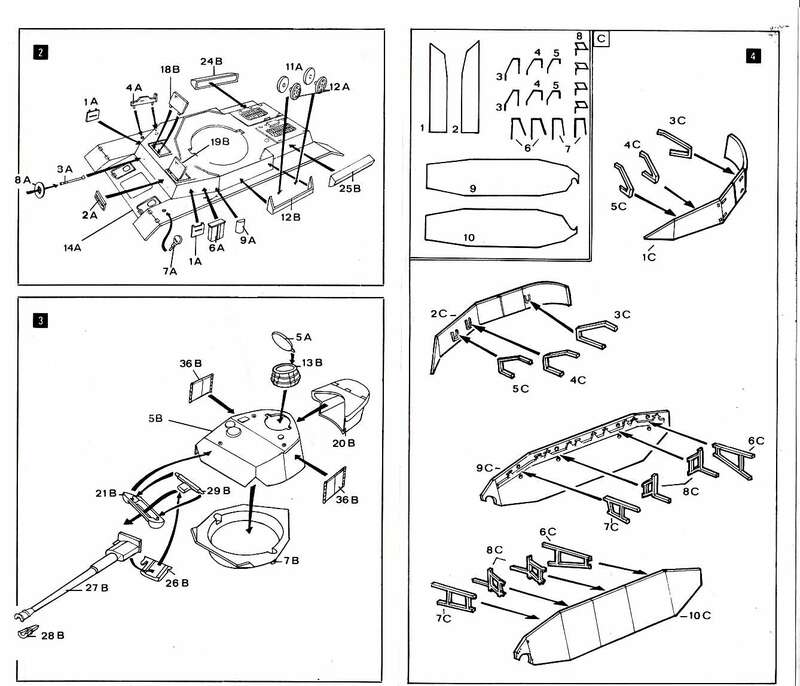 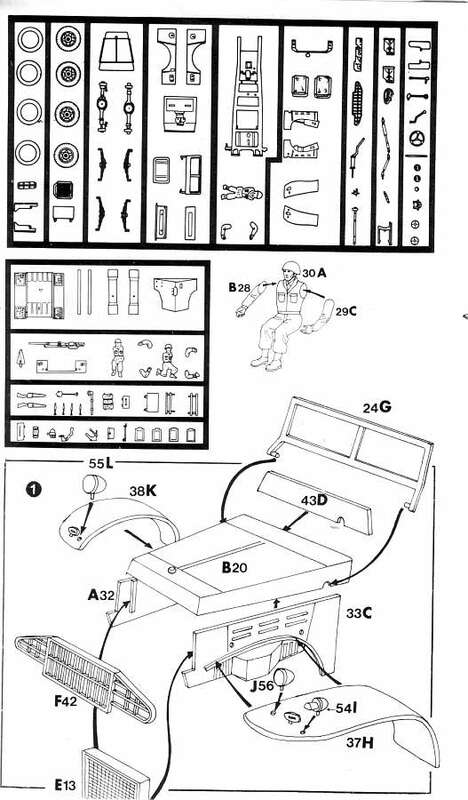 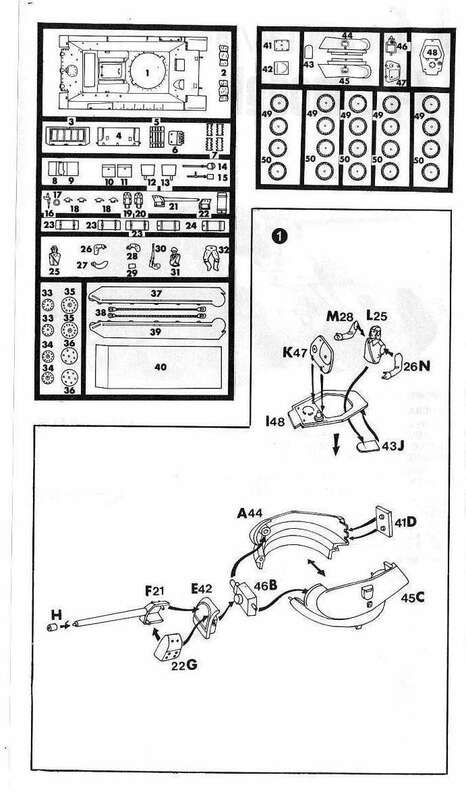 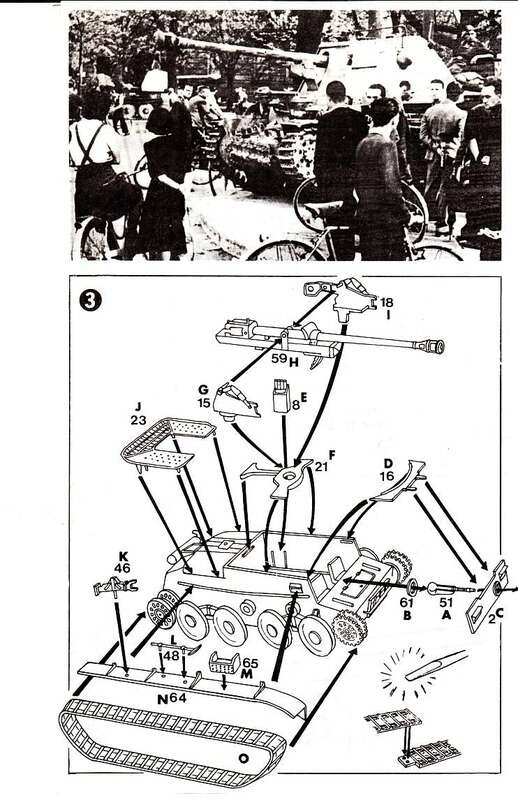 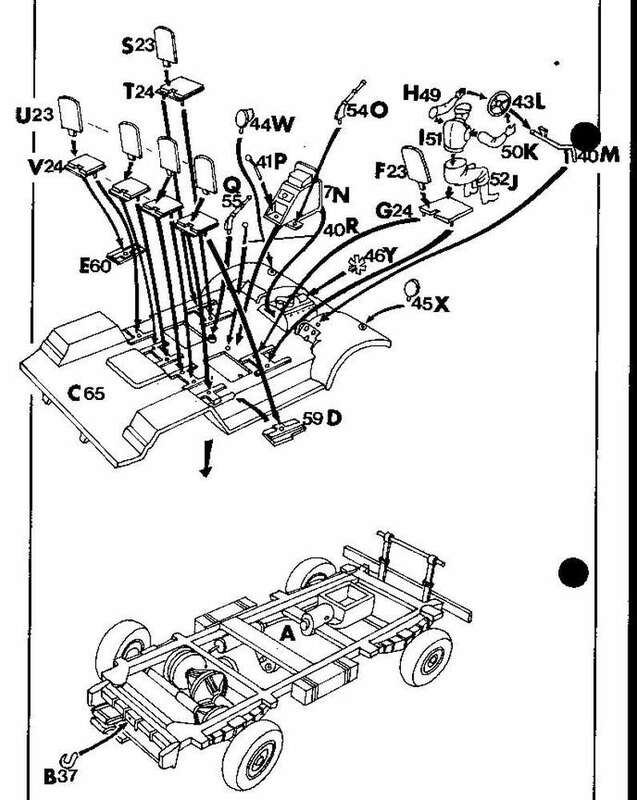 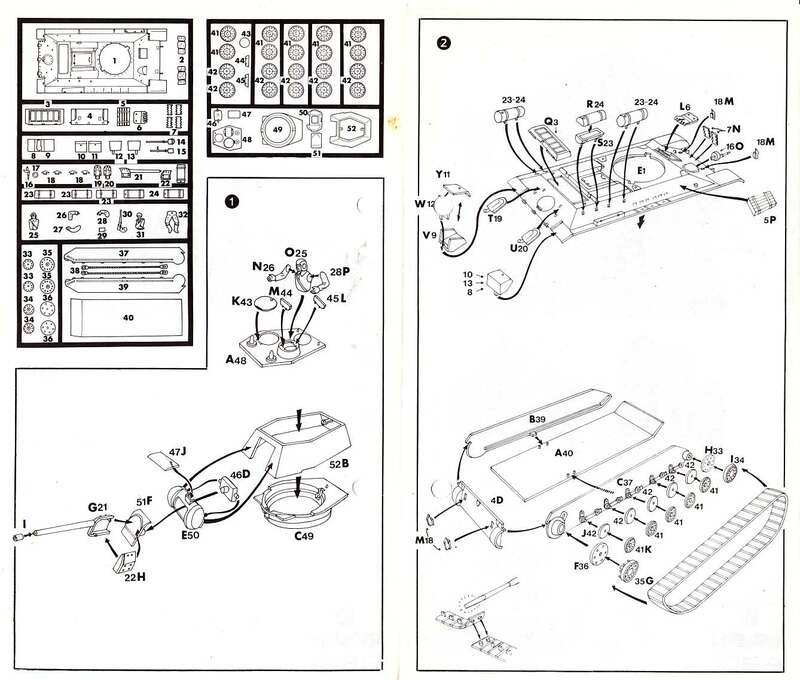 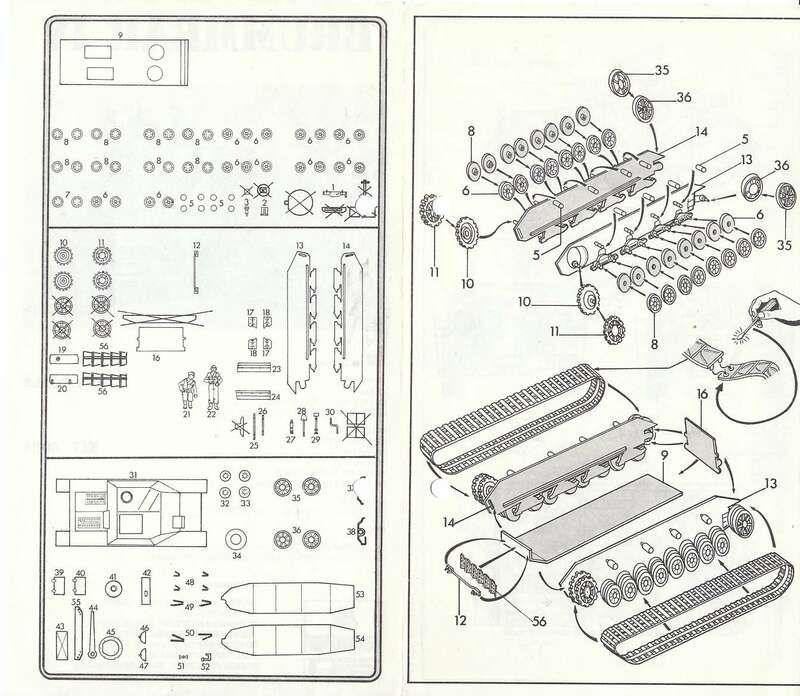 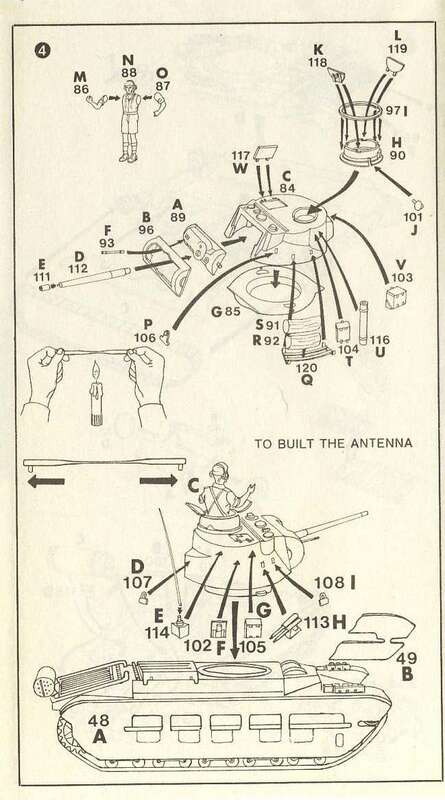 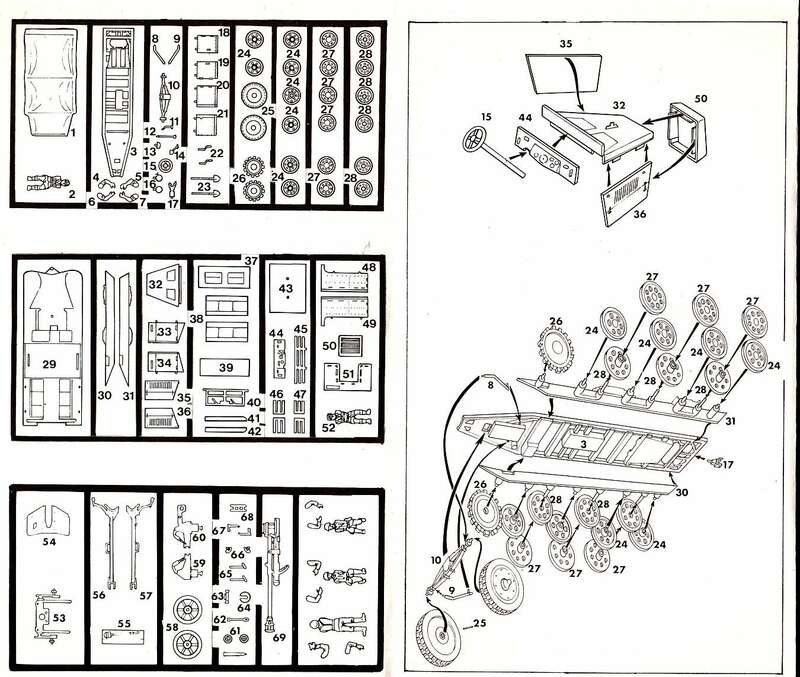 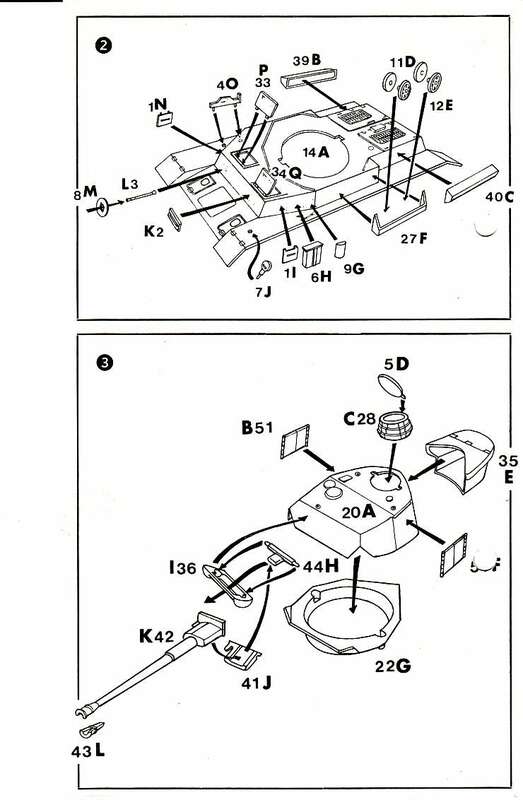 This configuration only appeared throughout 1977 and maybe early 1978 and is to be found on the following kitnumbers : 8033, 8034, 8043, 8044, 8049, 8050, 8052 to 8057. 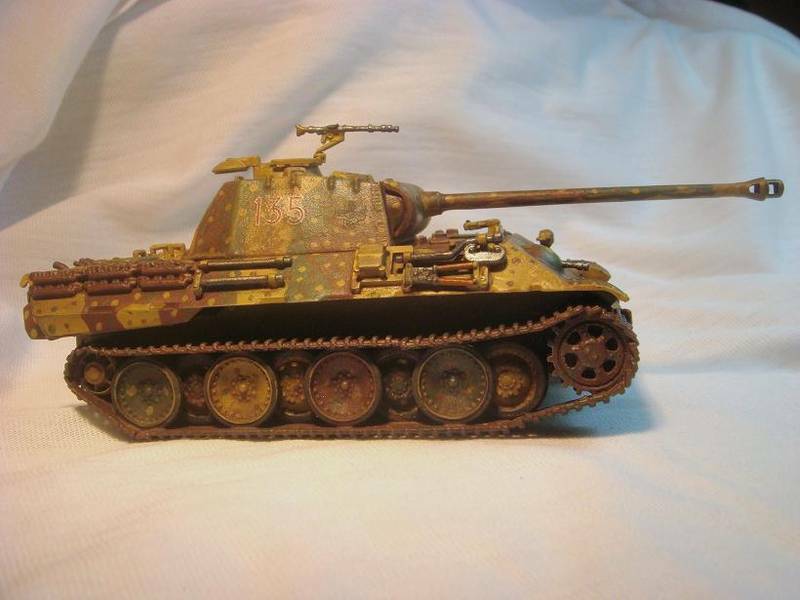 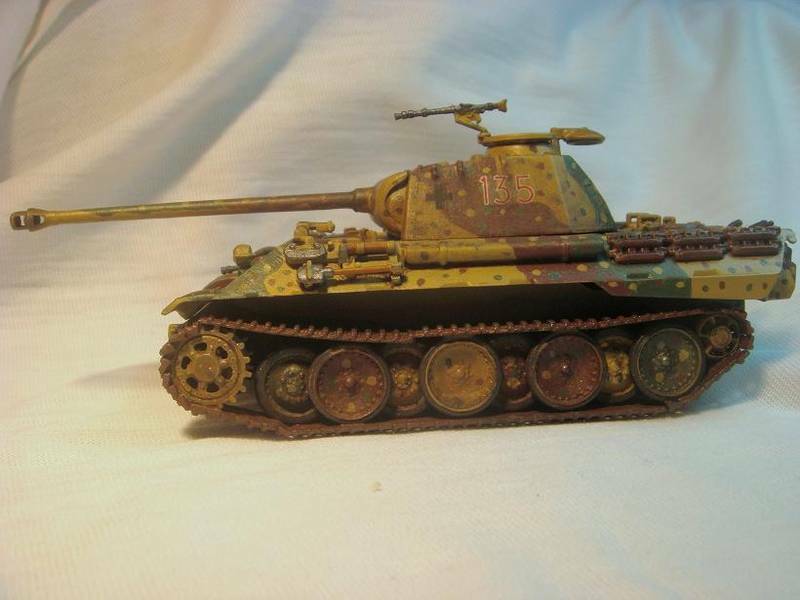 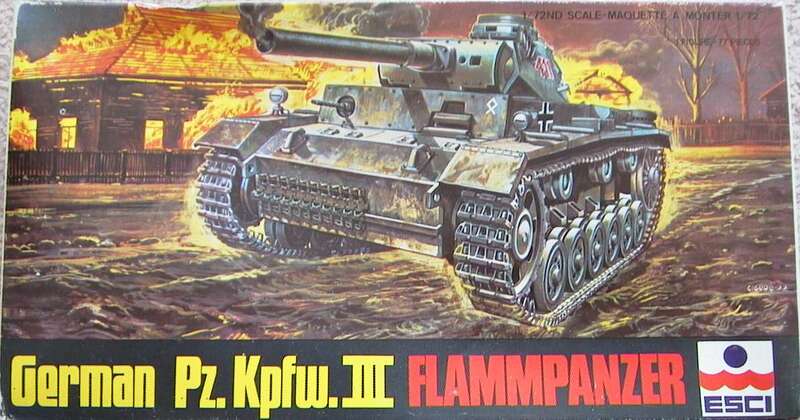 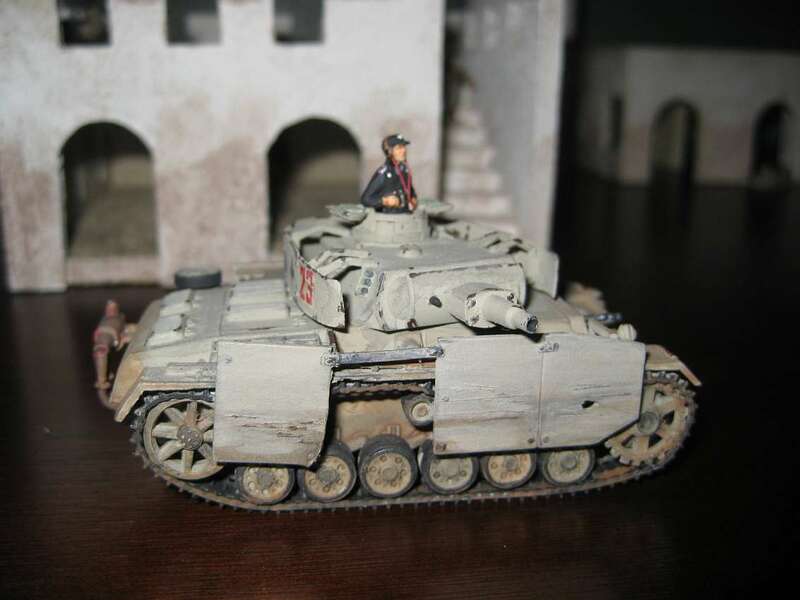 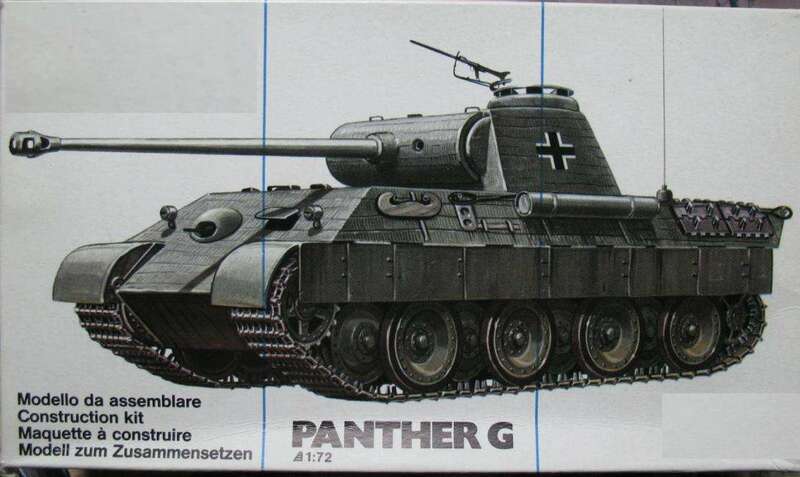 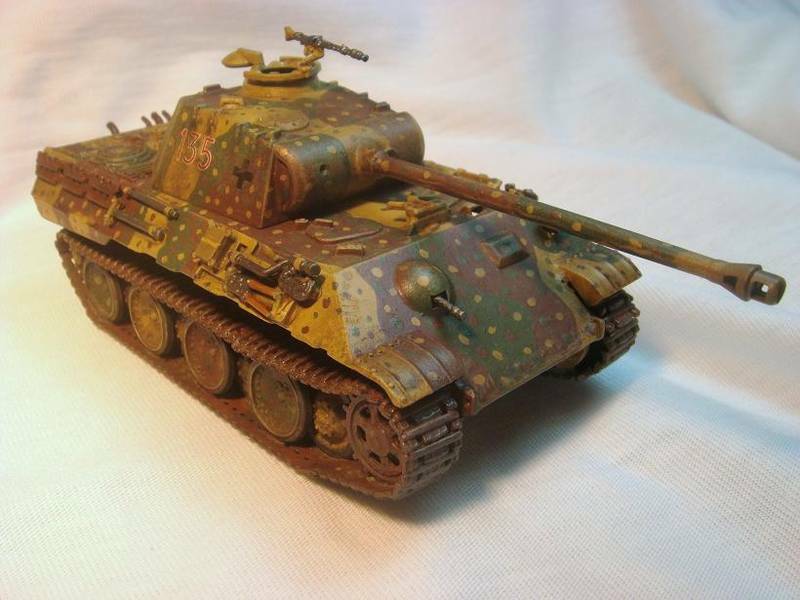 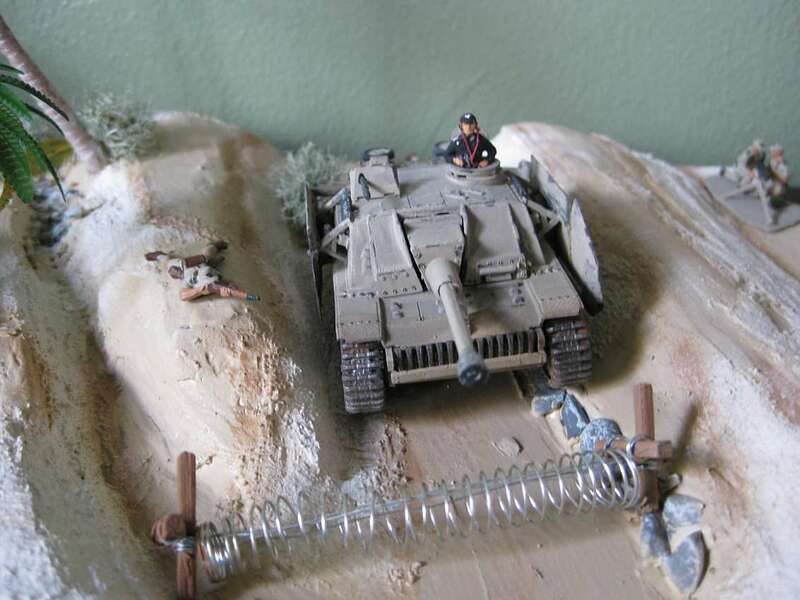 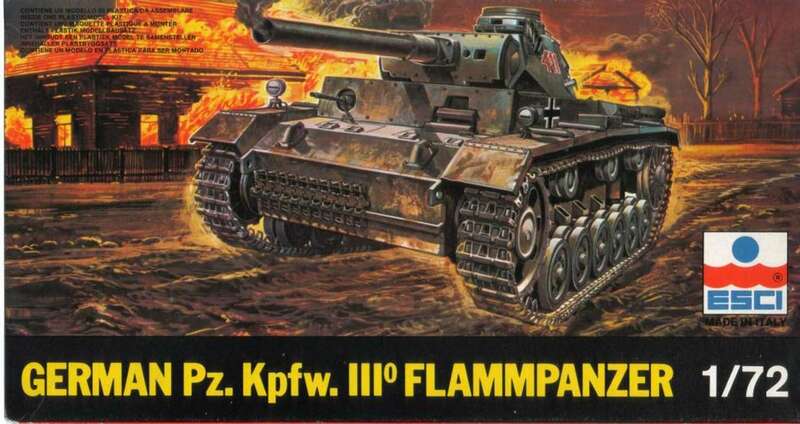 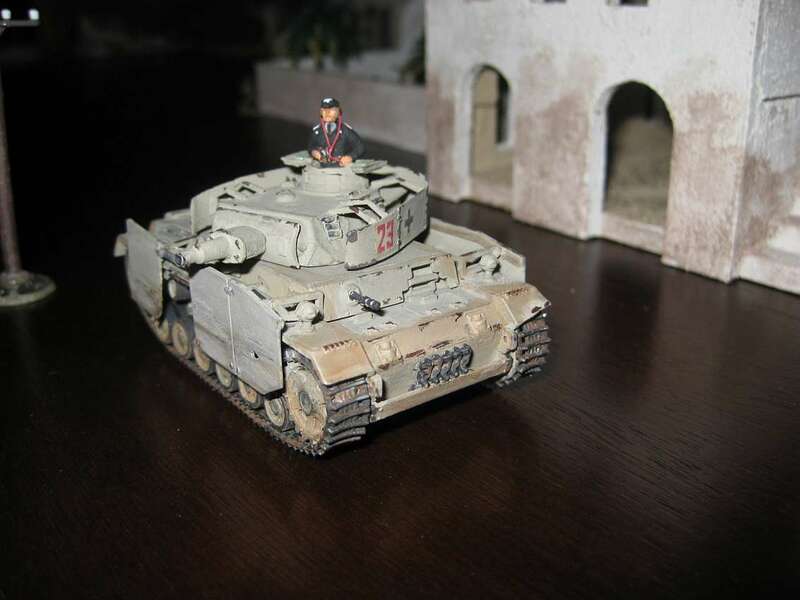 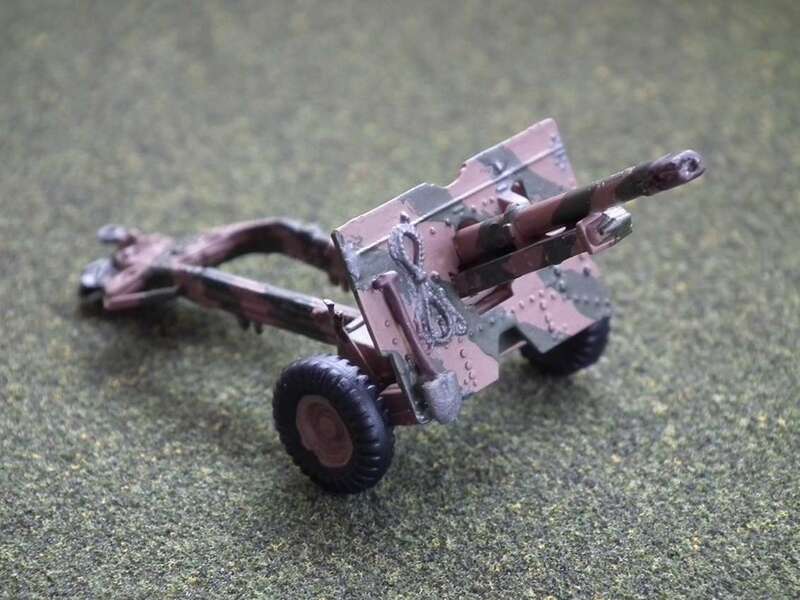 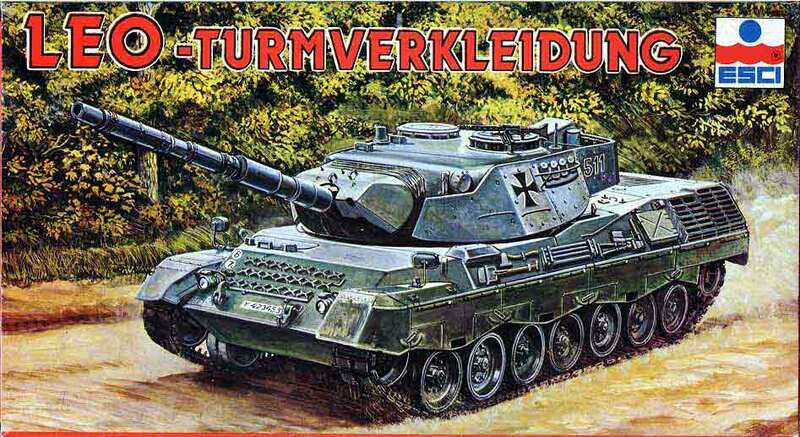 The Flammpanzer III (8057) is the last in this "crossover" series. 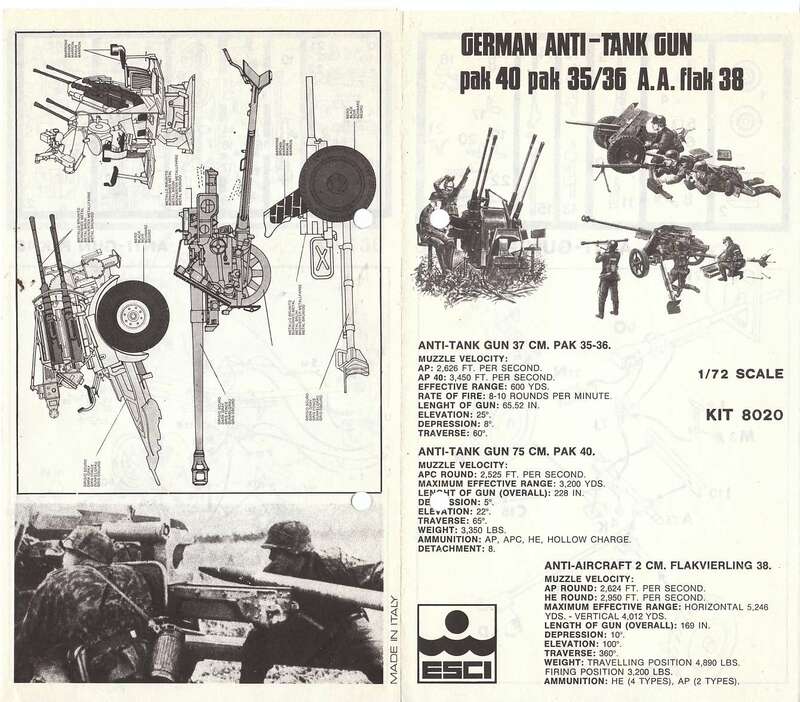 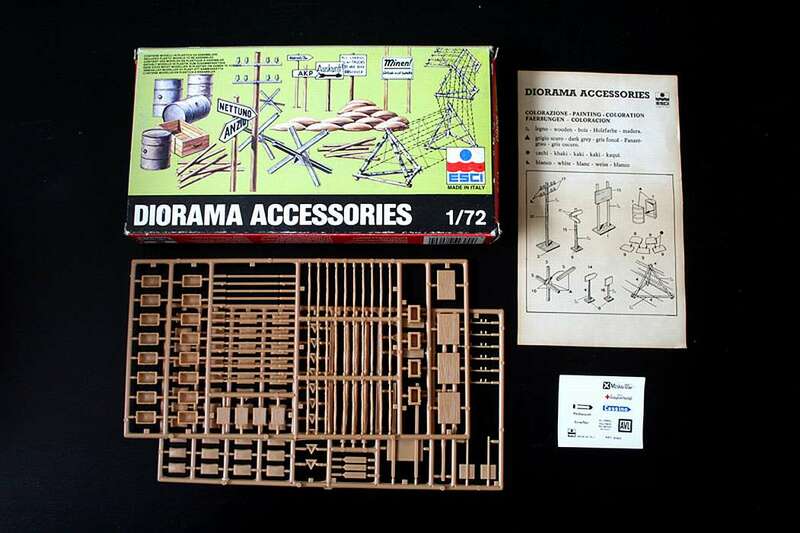 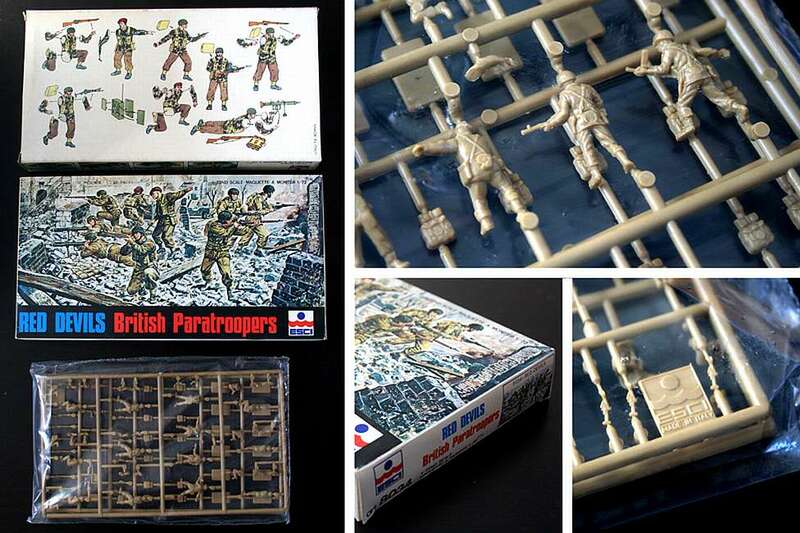 All these kits were re-issued from 1978 onwards with the normal, well known, full color boxart at both sides of the box. 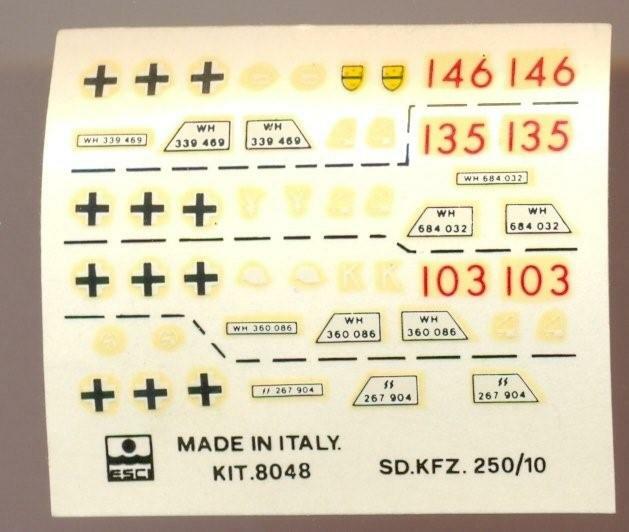 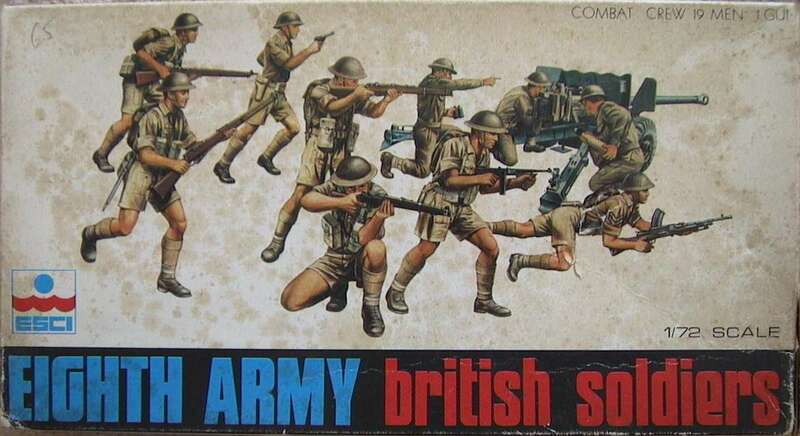 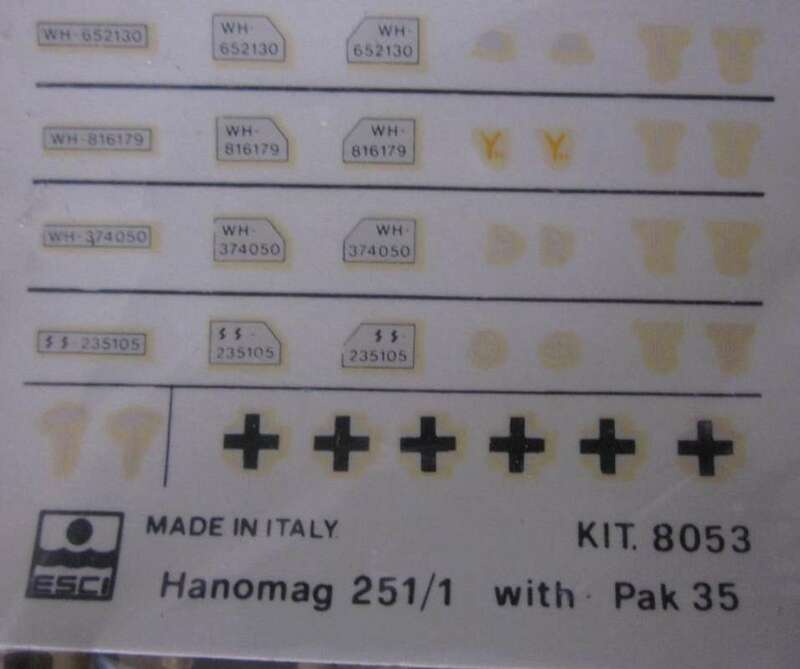 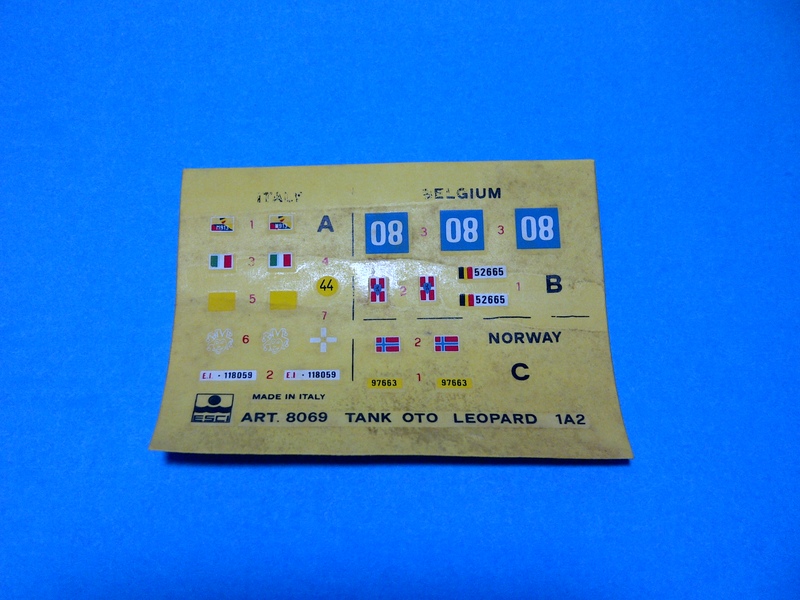 All kits had white sides with pictures of other kits in the series and the kits were usually shrinkfoiled, sometimes so tight it warped the whole box... Several importers put stickers on top of the shrinkfoil like Humbrol, Squadron, Soldat and Polistil. 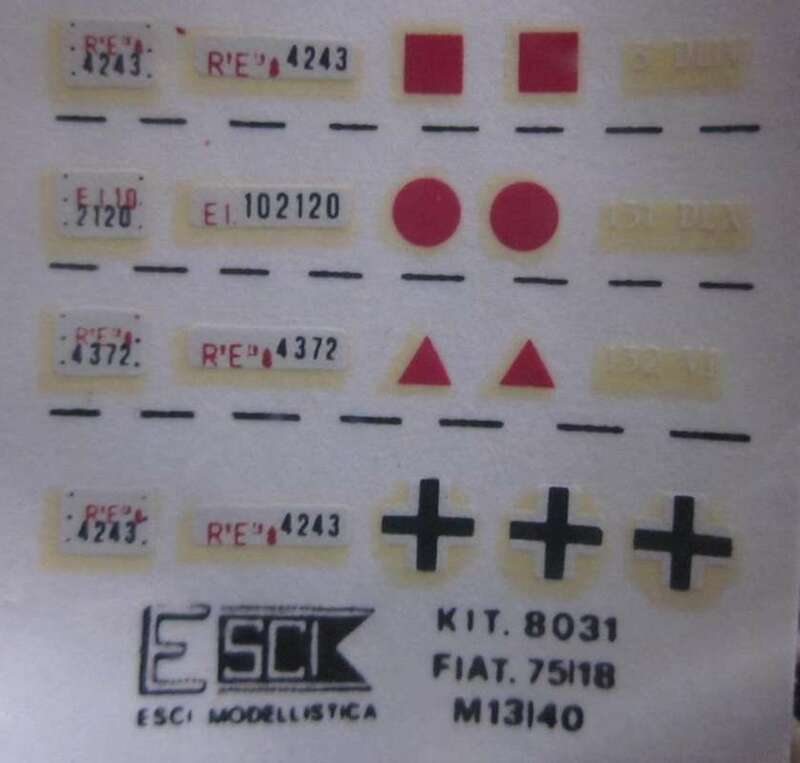 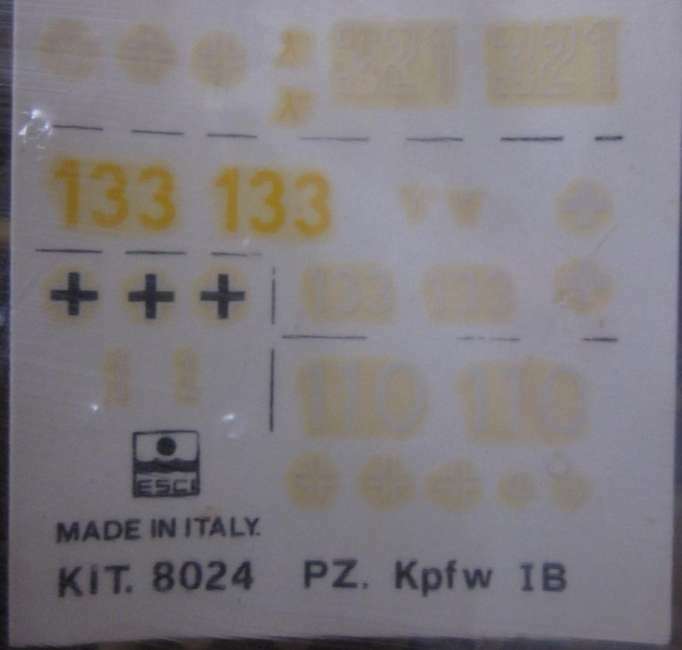 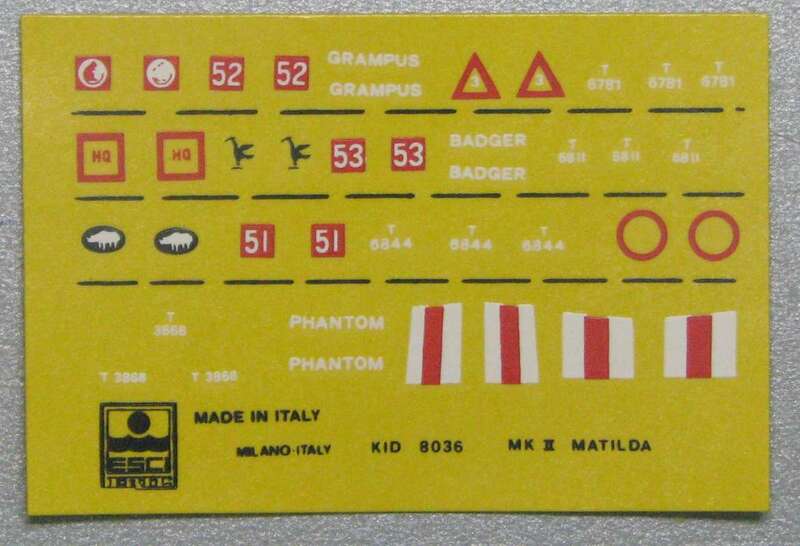 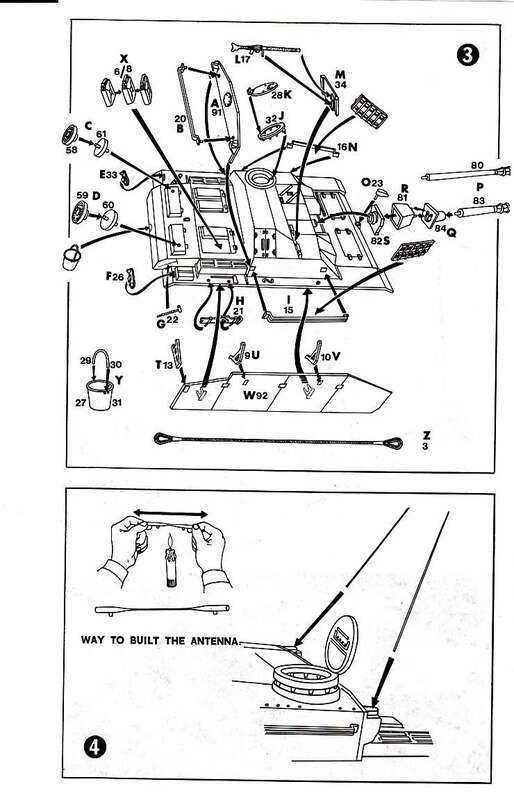 In the beginning of 1984 the kits were reissued in the socalled "Red Box" format. 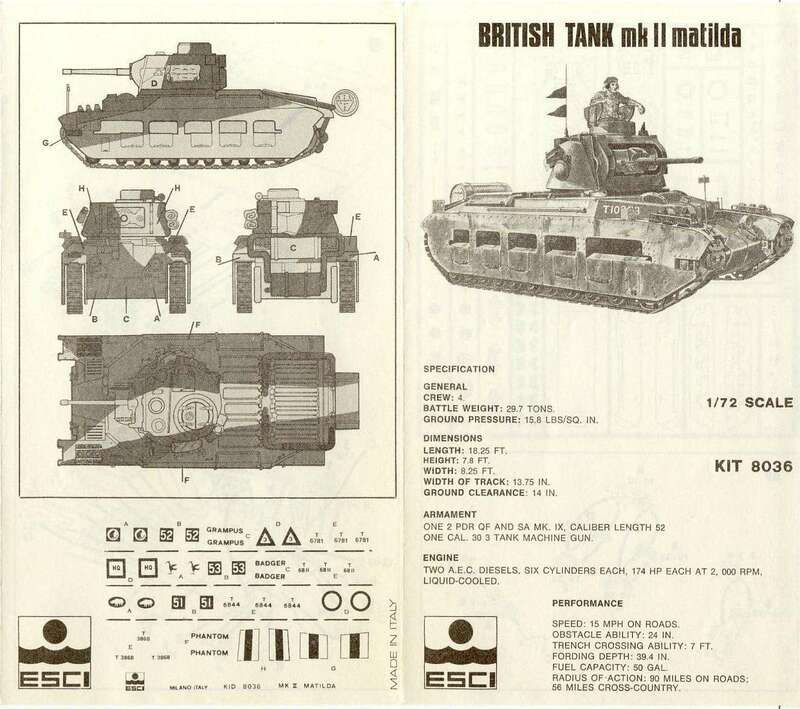 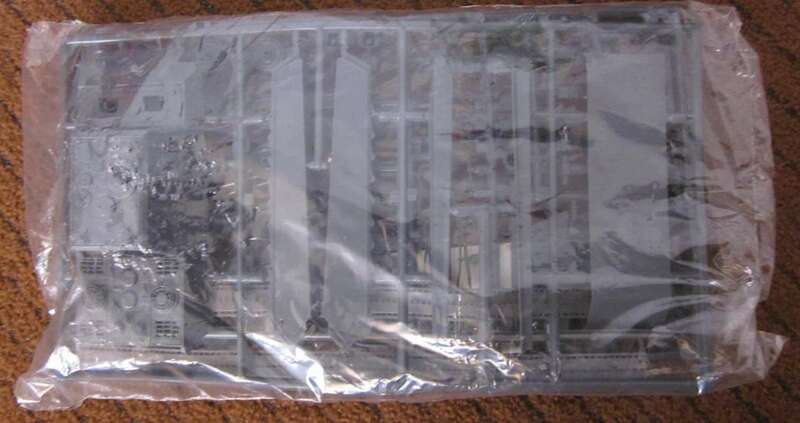 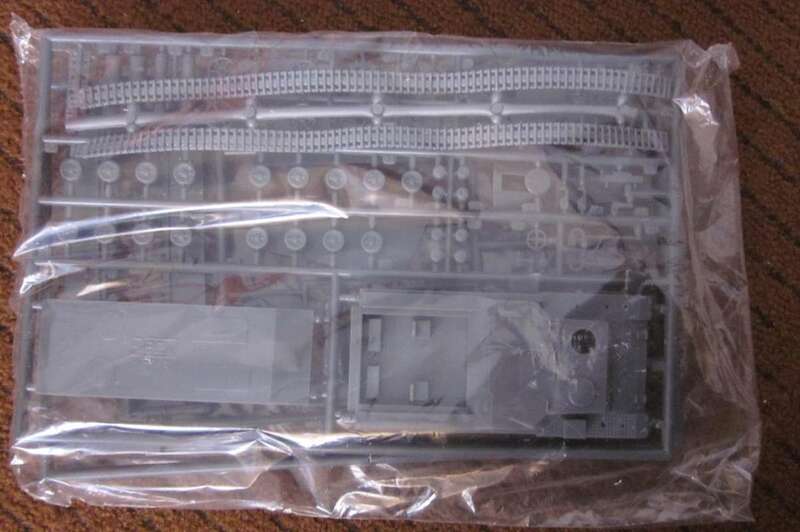 All kits from 8001 to 8068 were released in these boxes, which now had the Esci logo printed in the boxart picture. 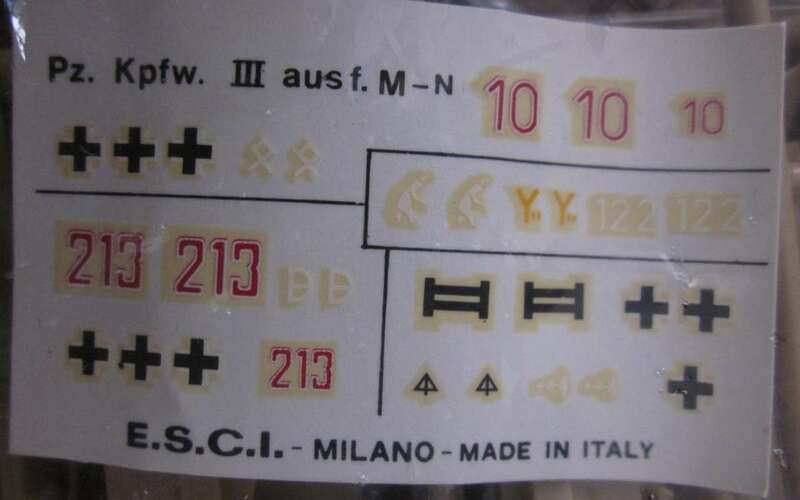 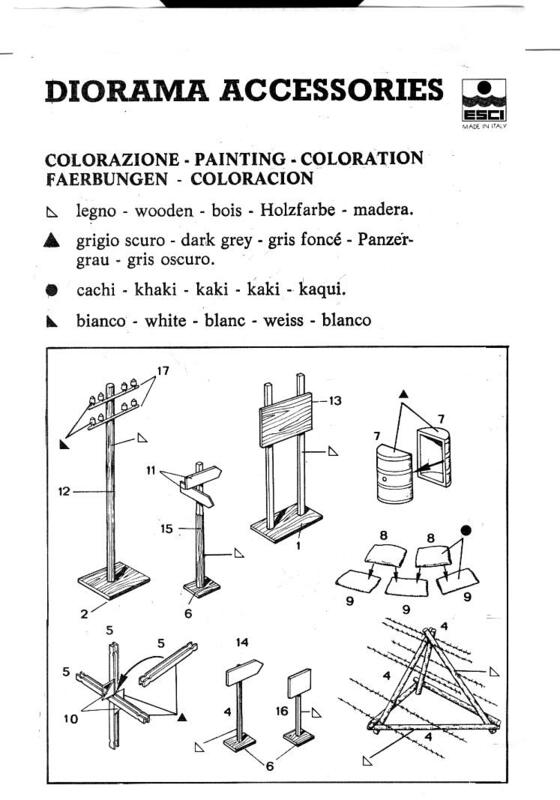 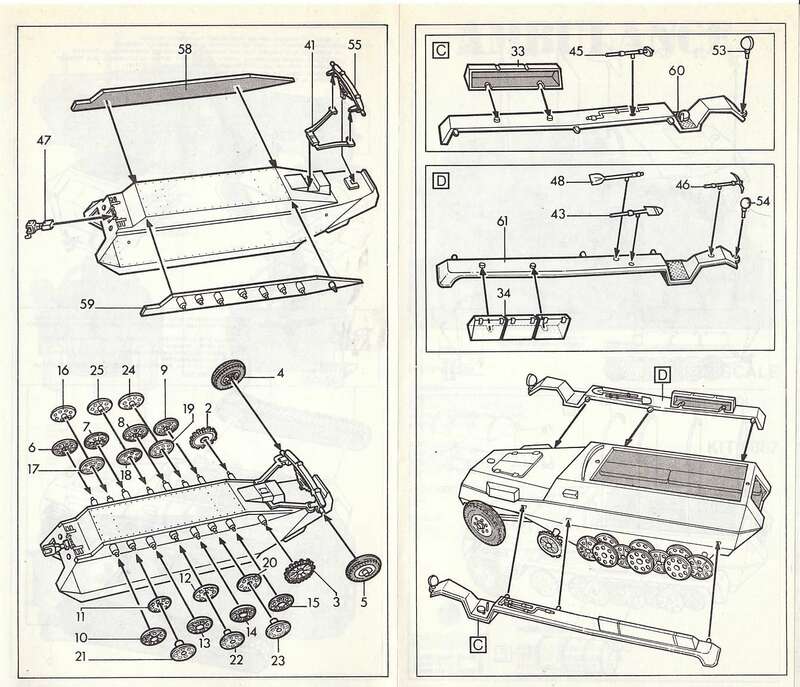 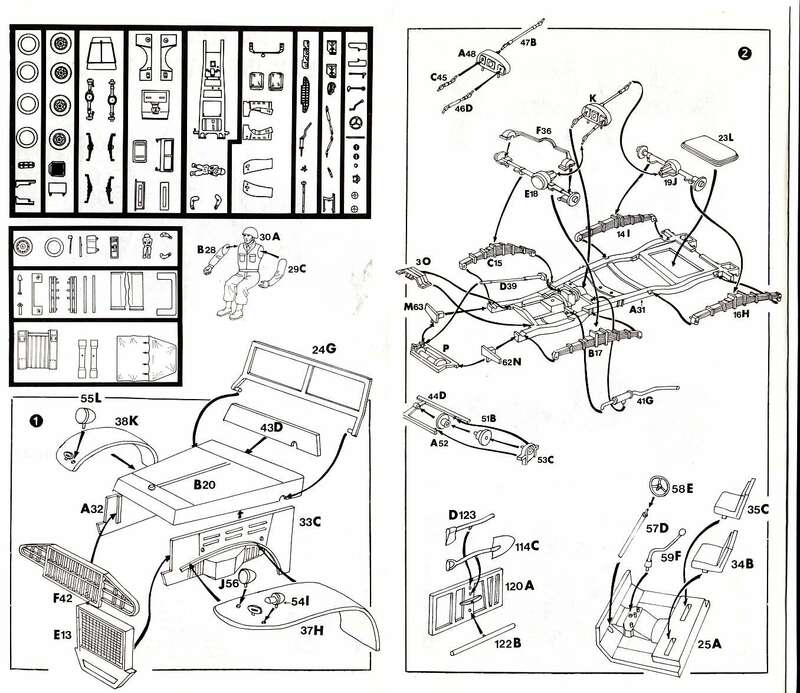 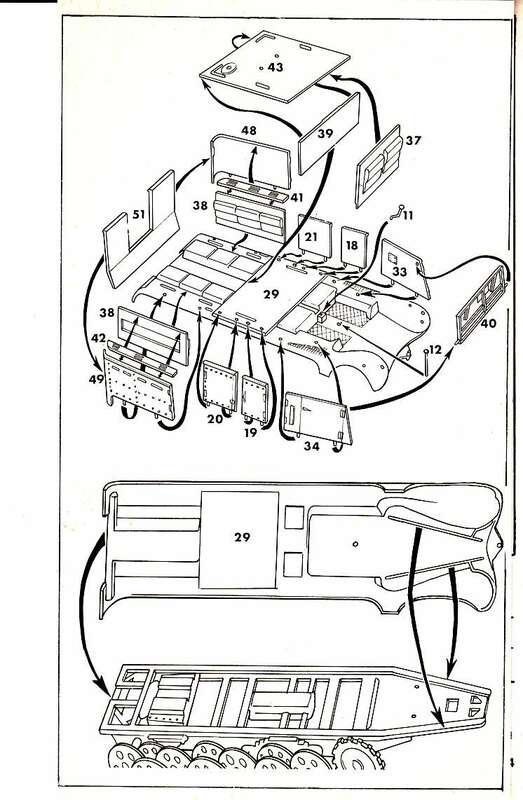 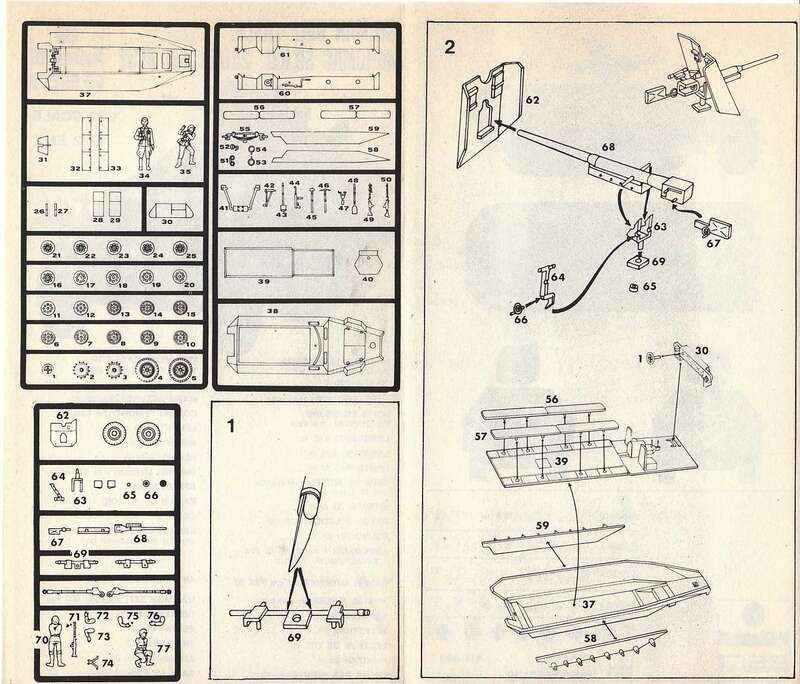 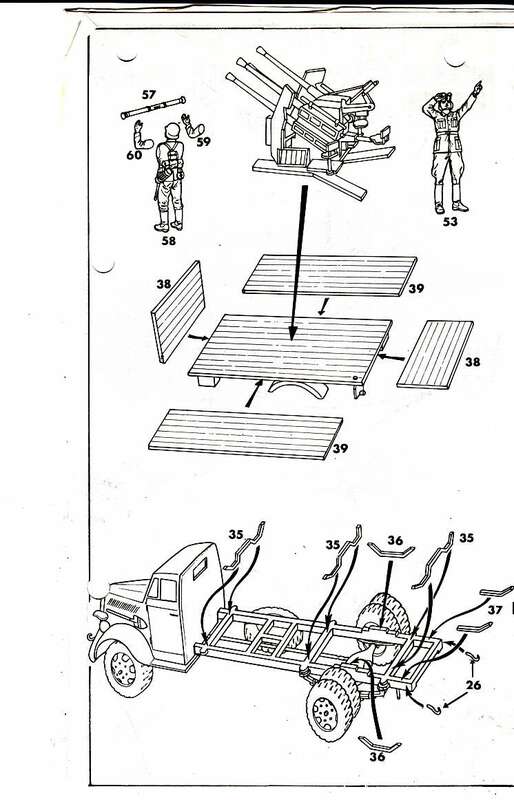 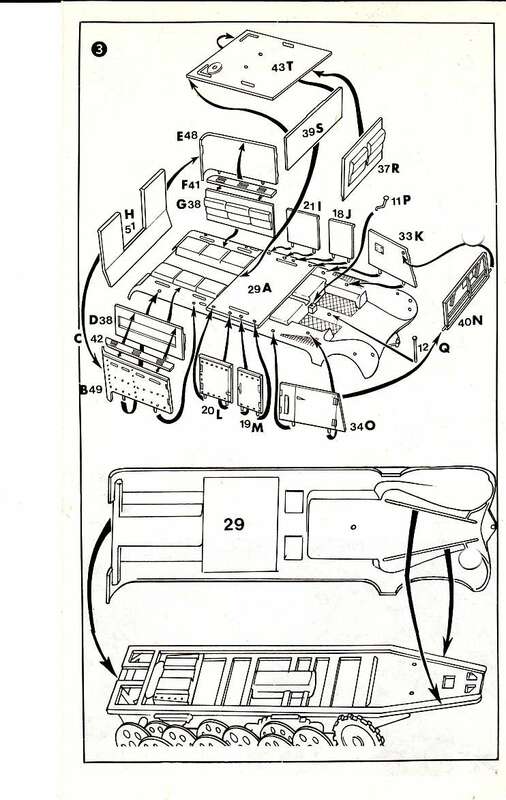 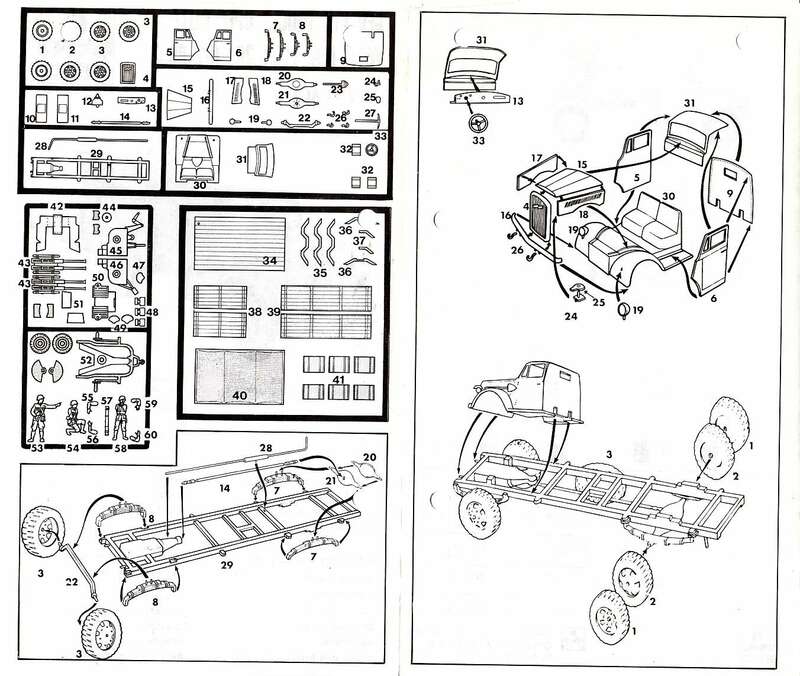 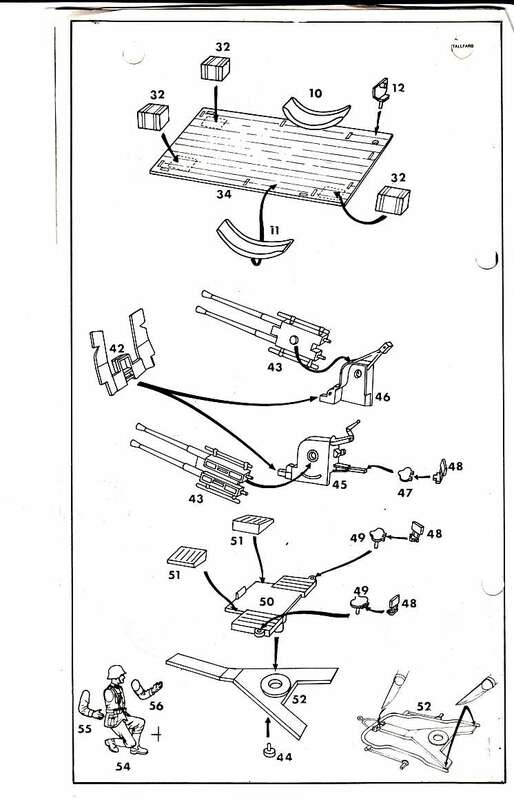 The sides changed with only text info about the plastic in serveral languages and the Esci adress in Italy and a date : febrary 1983 on all issues. 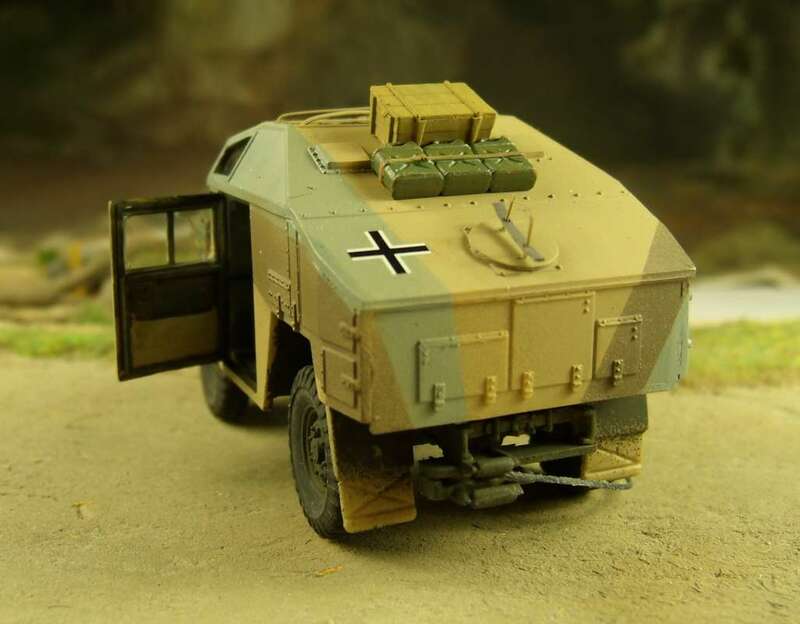 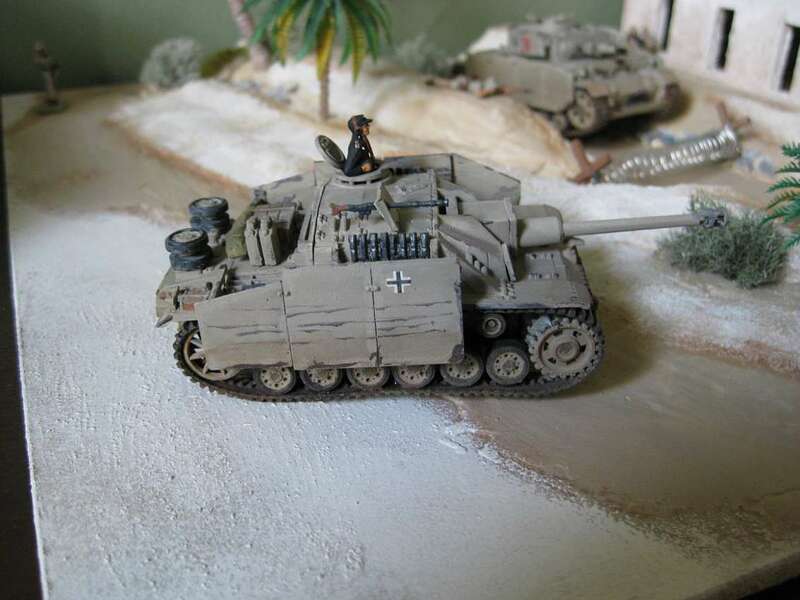 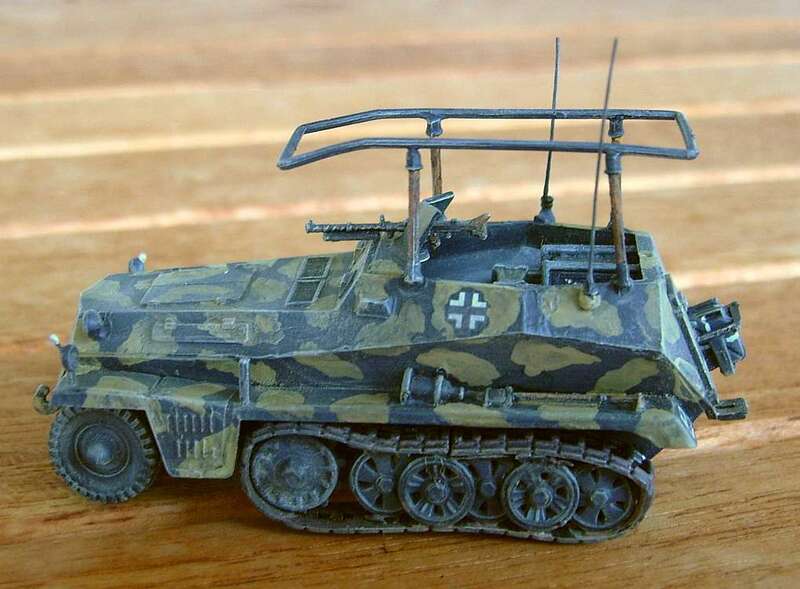 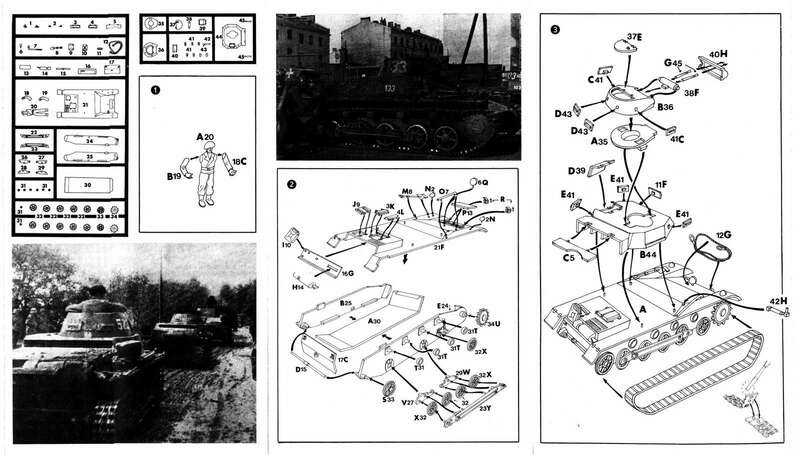 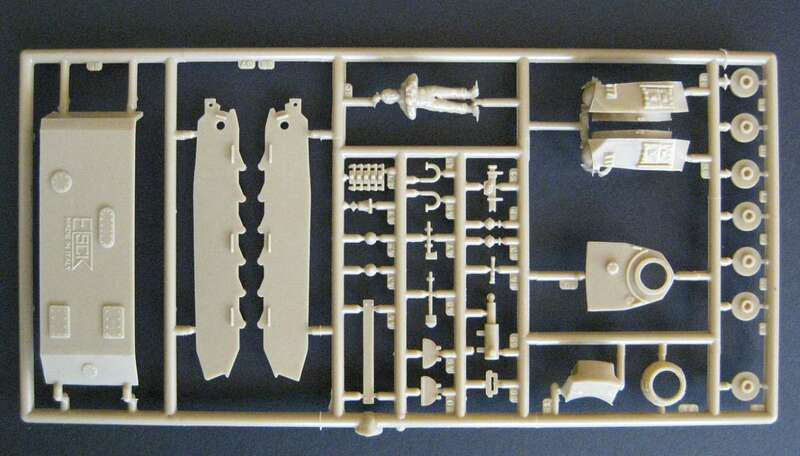 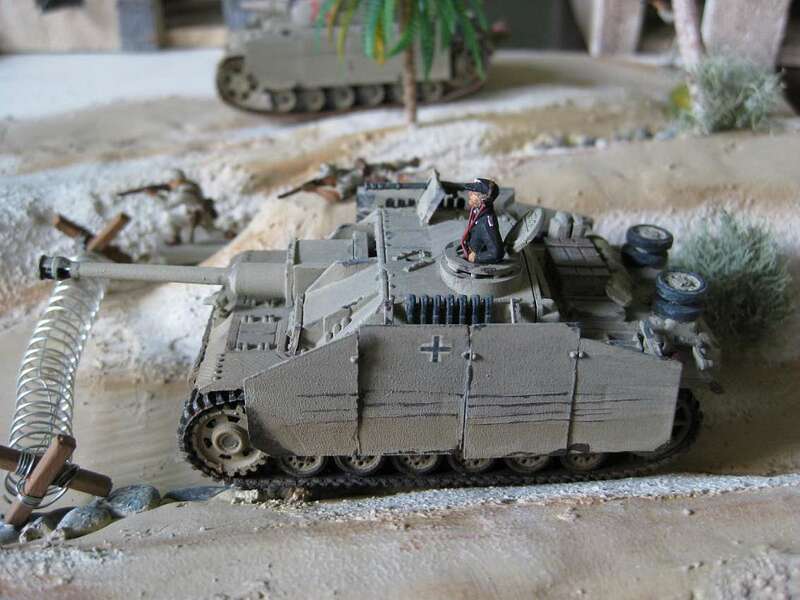 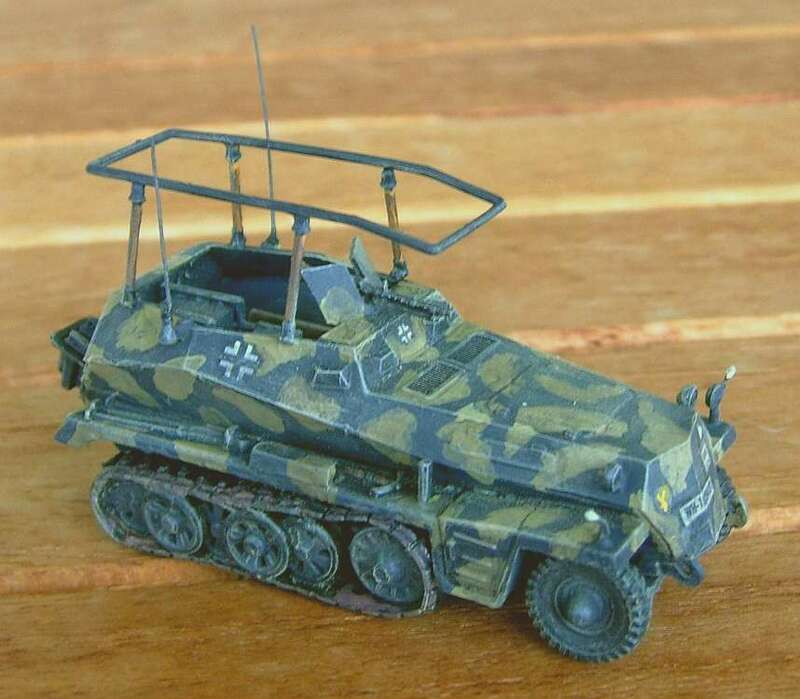 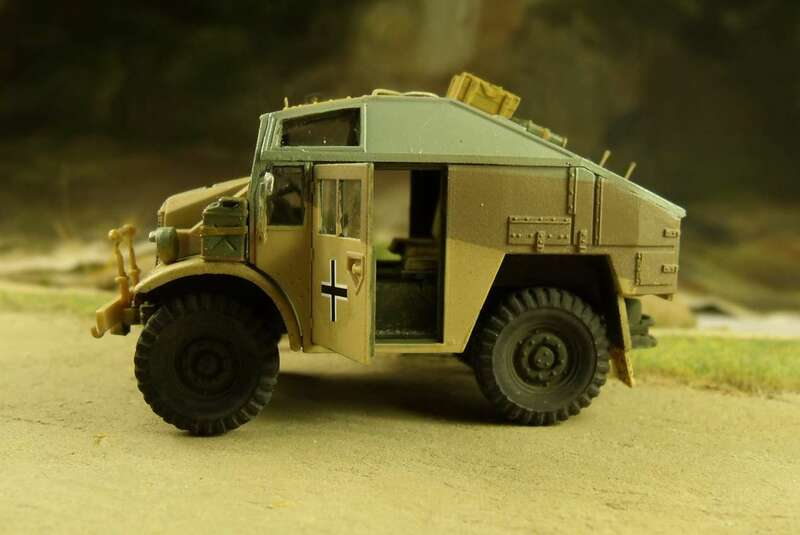 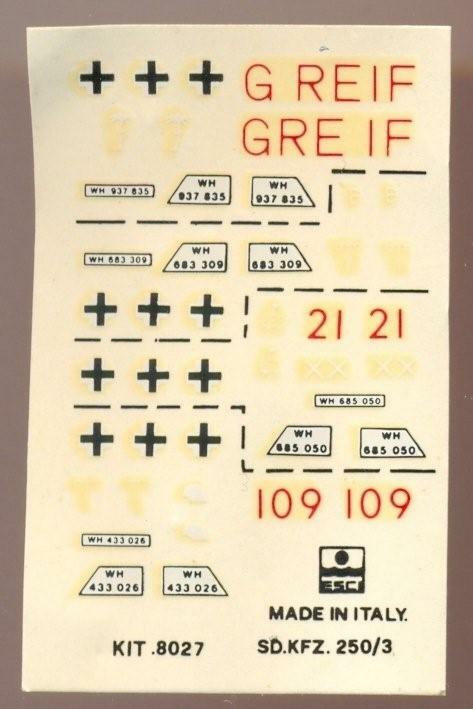 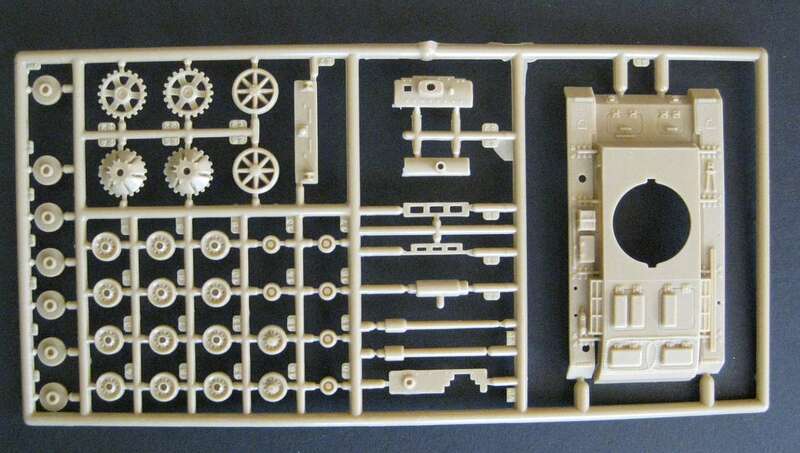 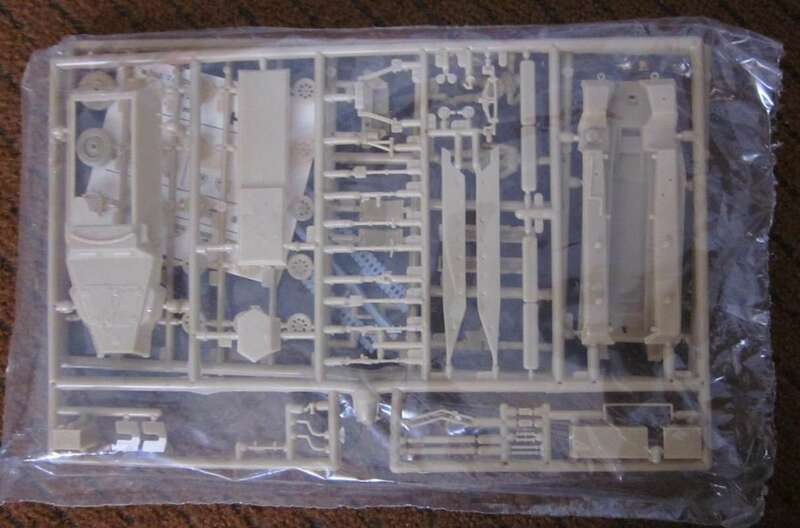 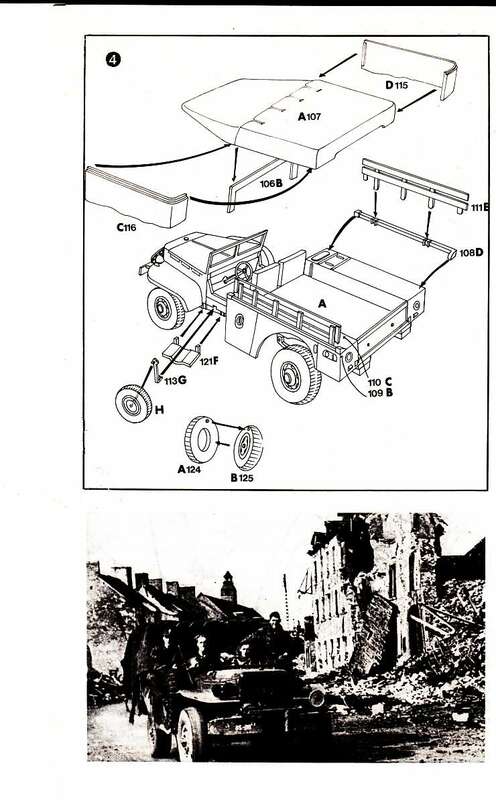 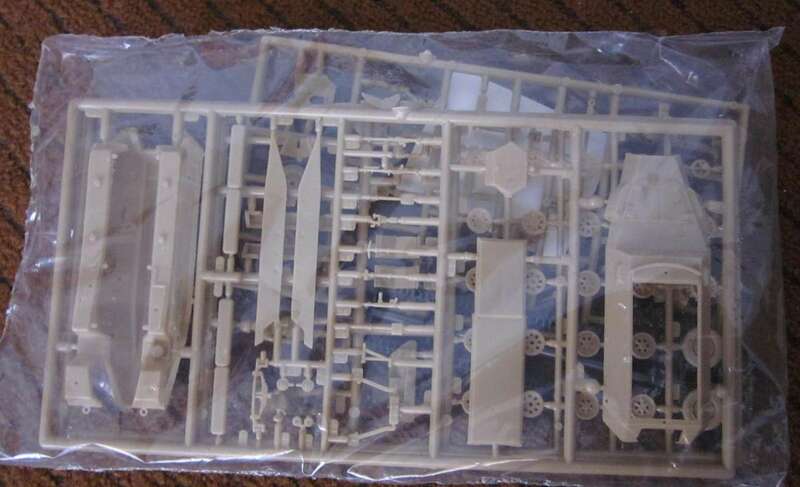 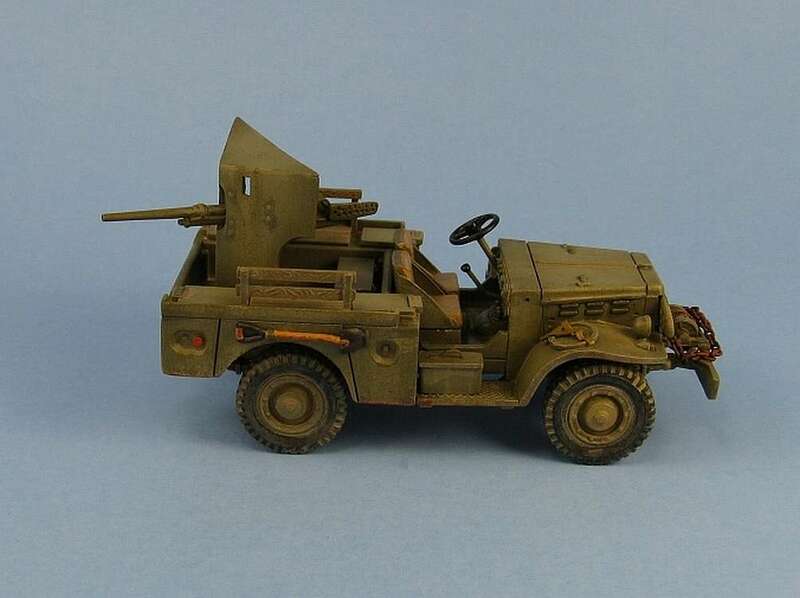 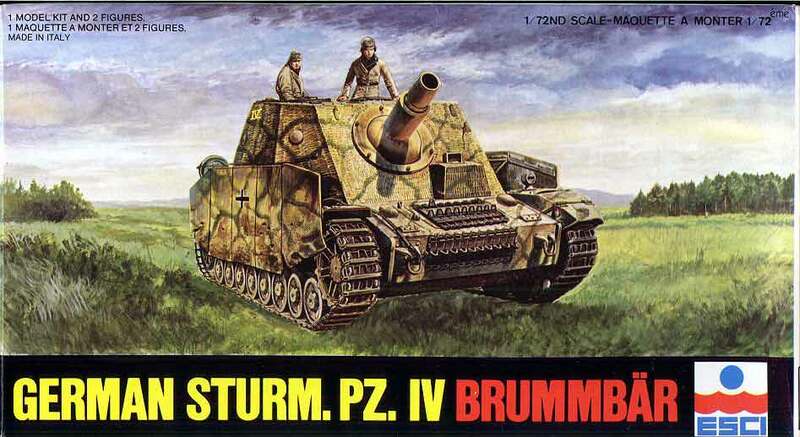 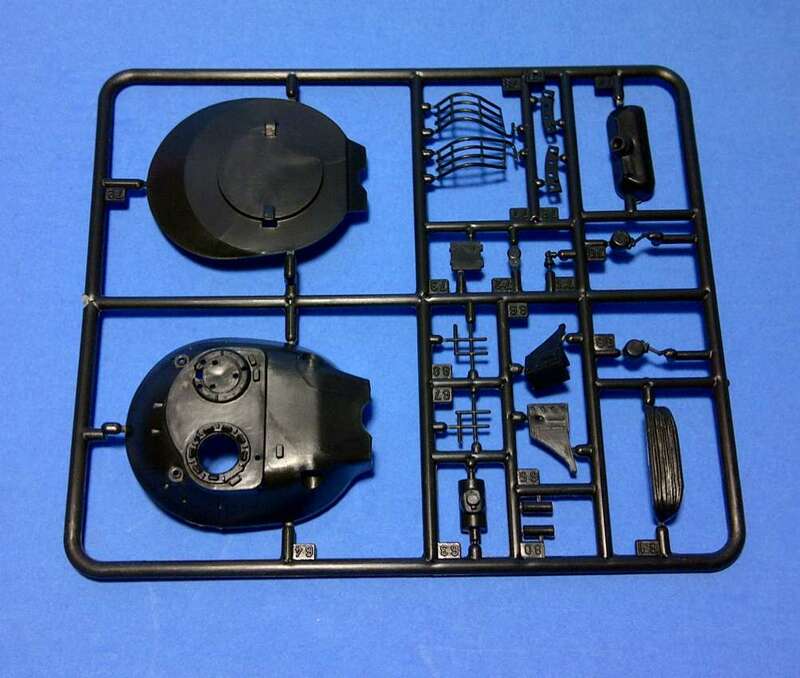 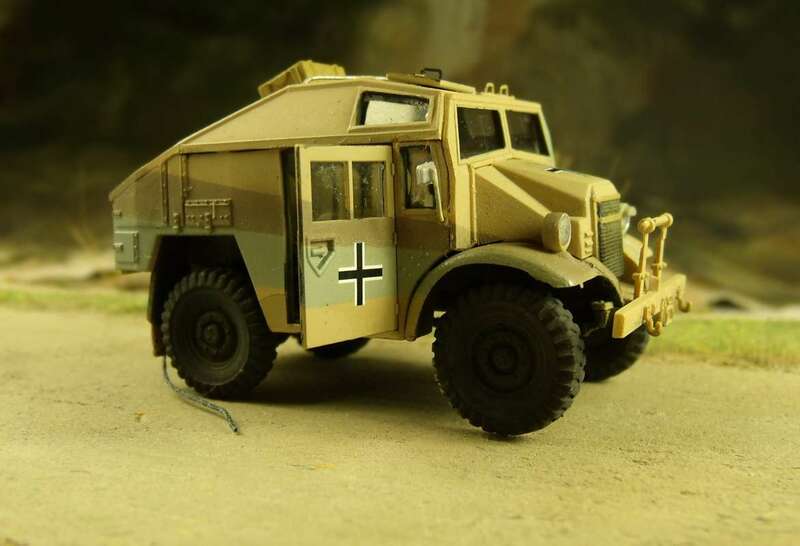 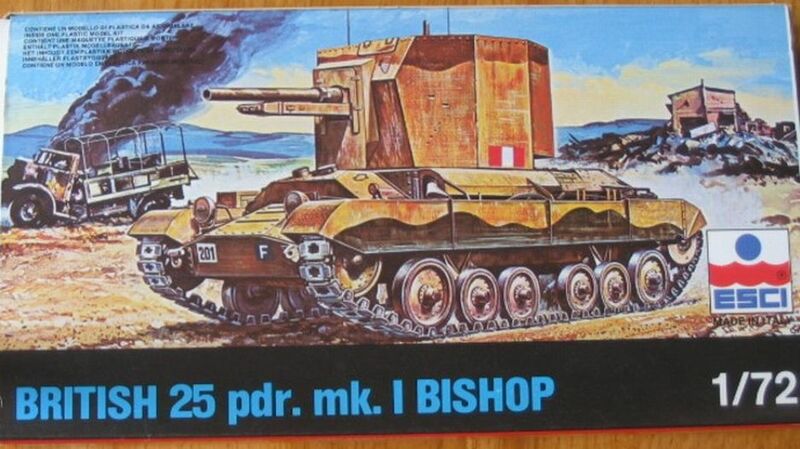 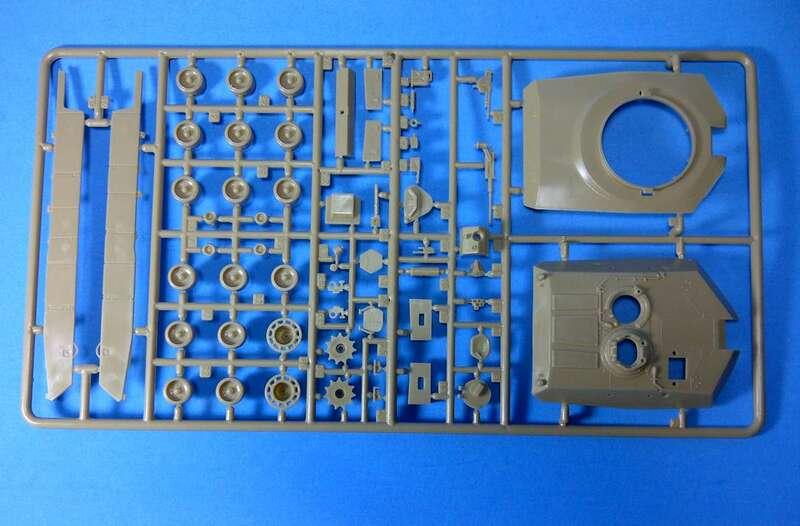 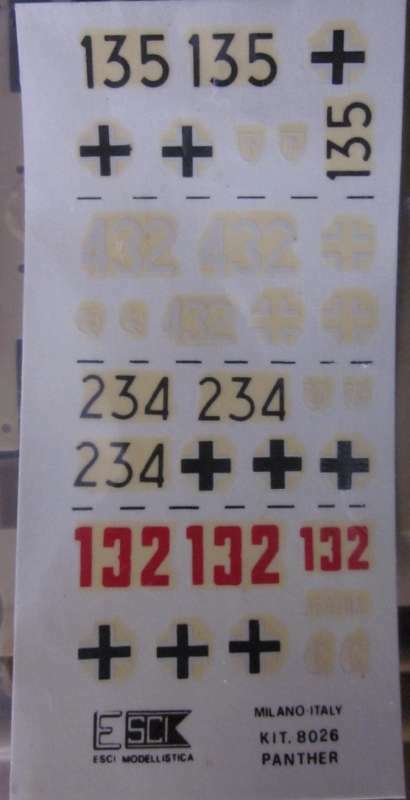 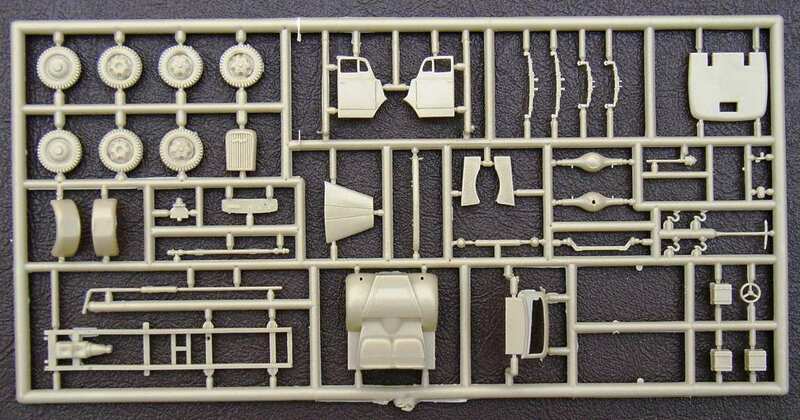 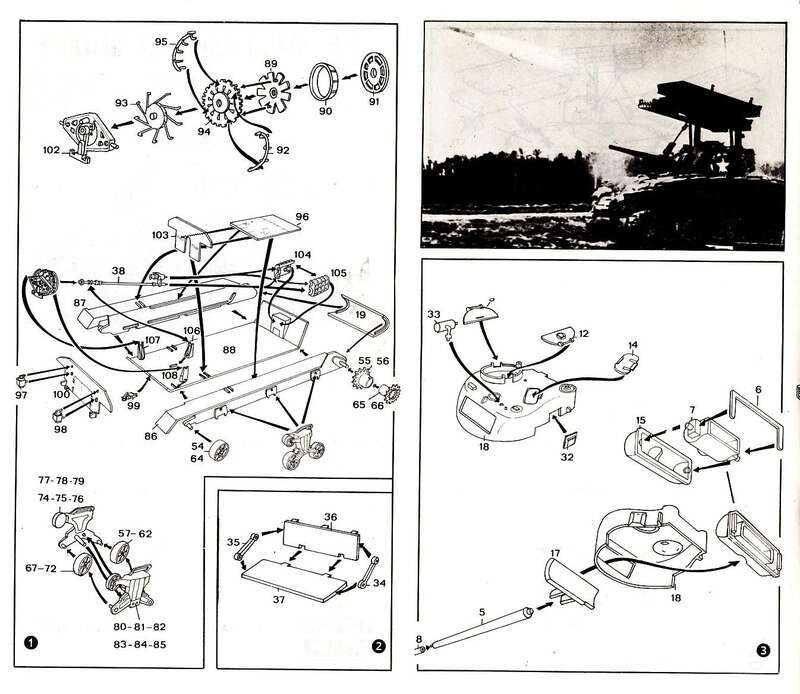 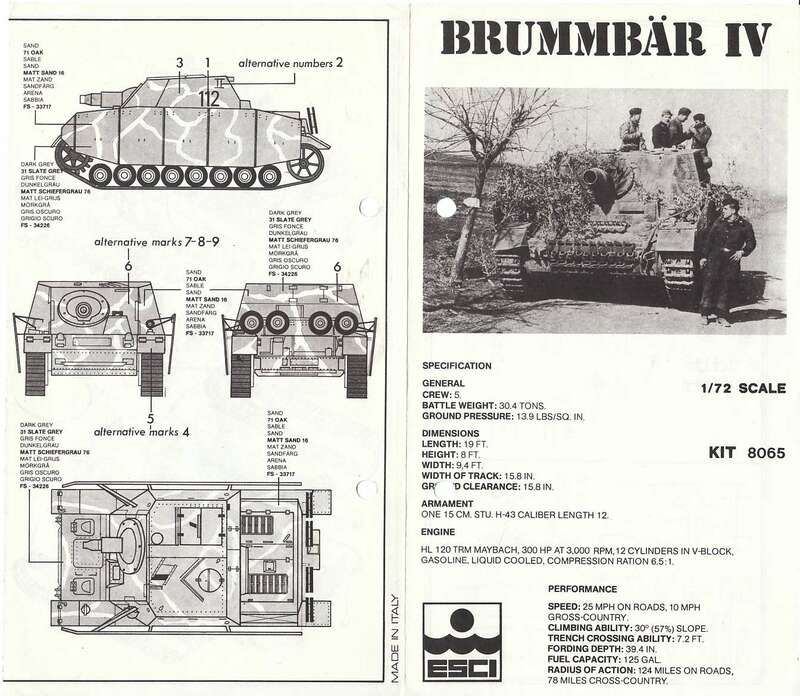 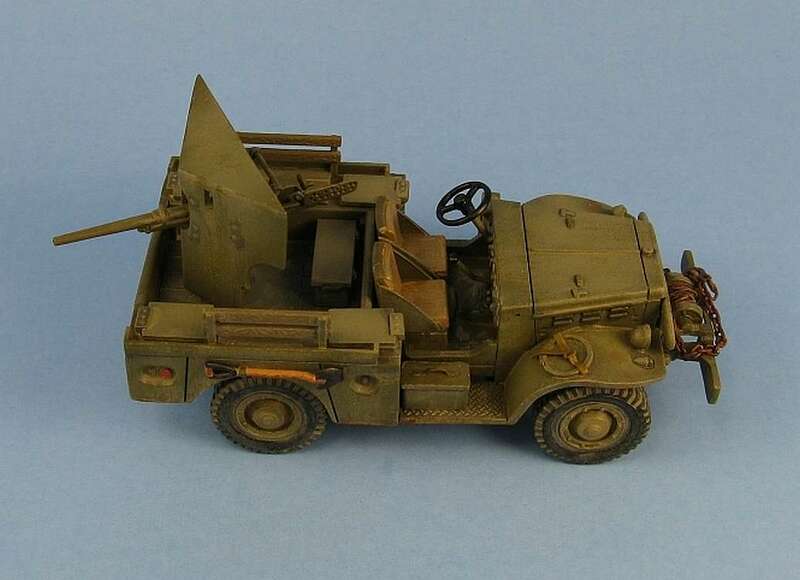 The Brummbar (8065) is the last kit to also appear in the whitesided box and from the SdKfz 251/7 c Pionier (8066) onwards, the kits only appear in Redbox livery. 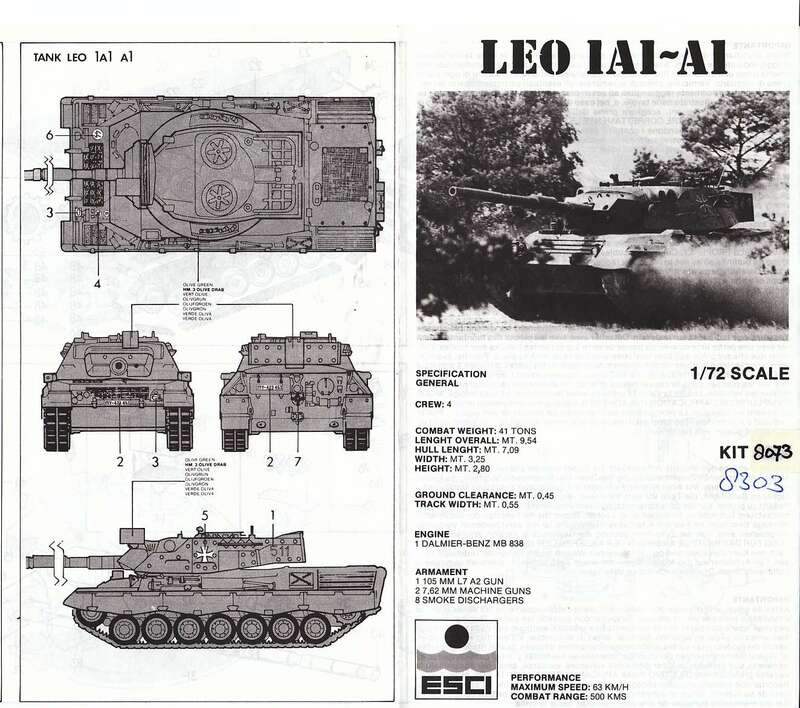 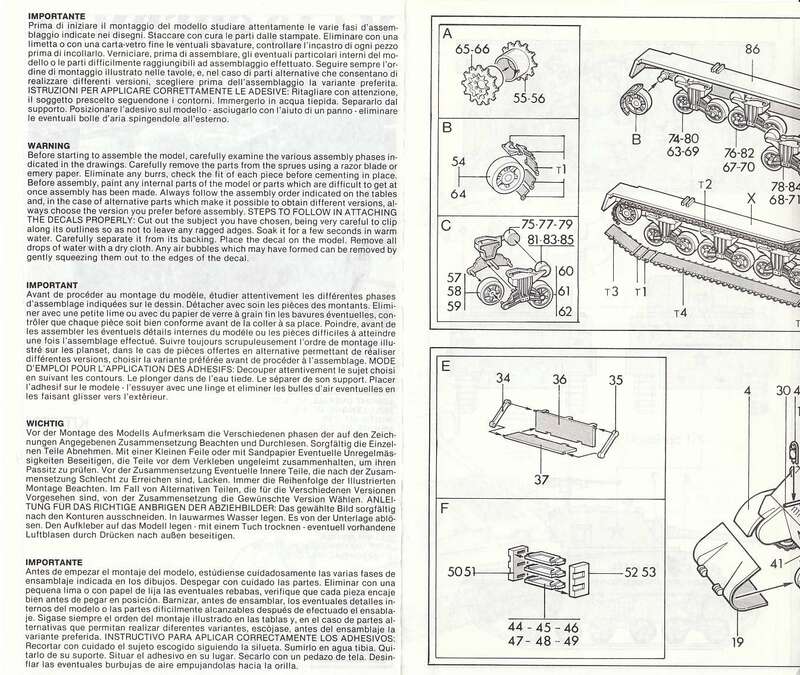 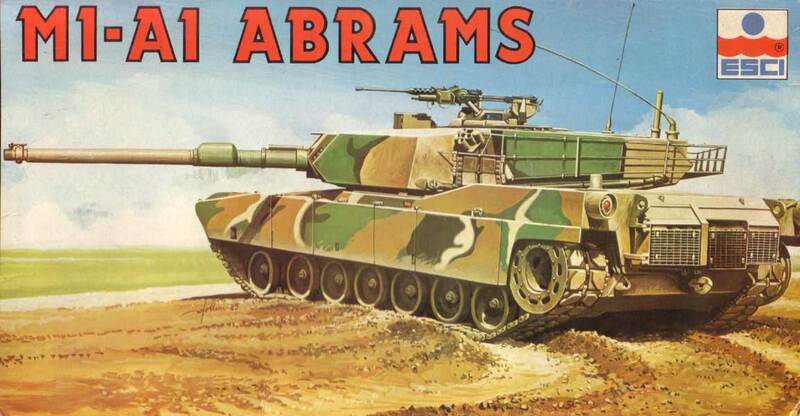 In 1986 the last 8000 series are released and for the first time modern armor is made by Esci. 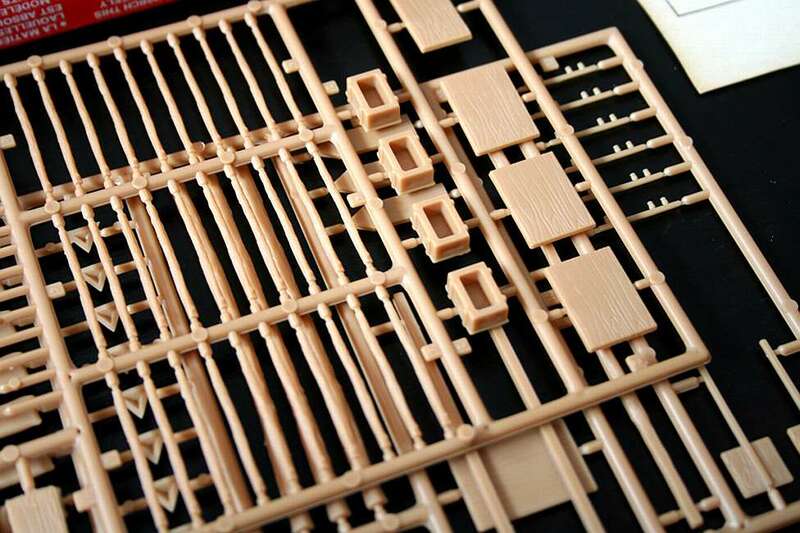 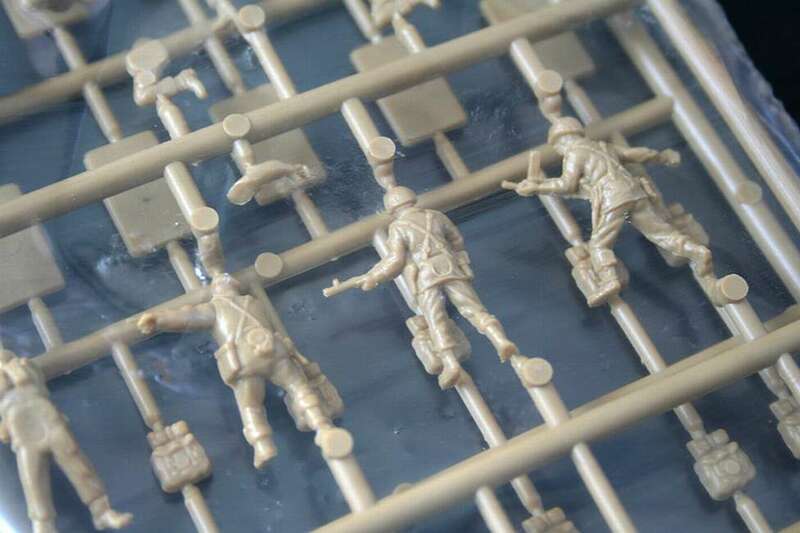 Also for the very first time the tracks are moulded in hard plastic !! 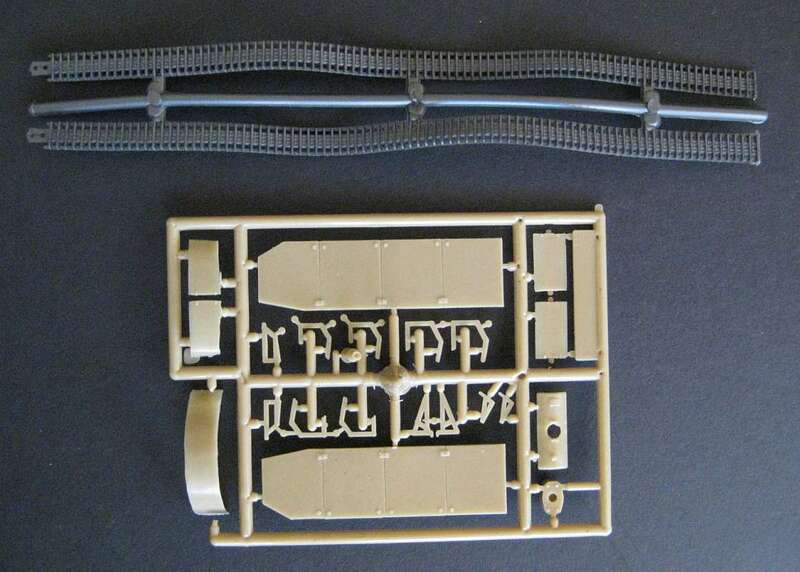 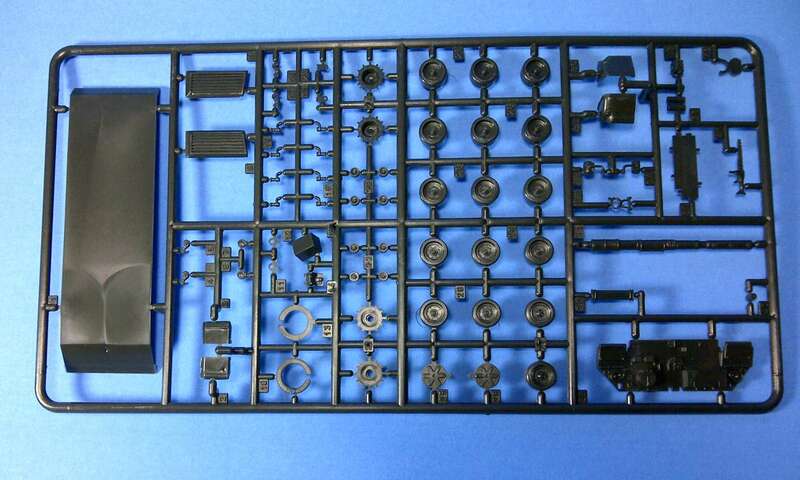 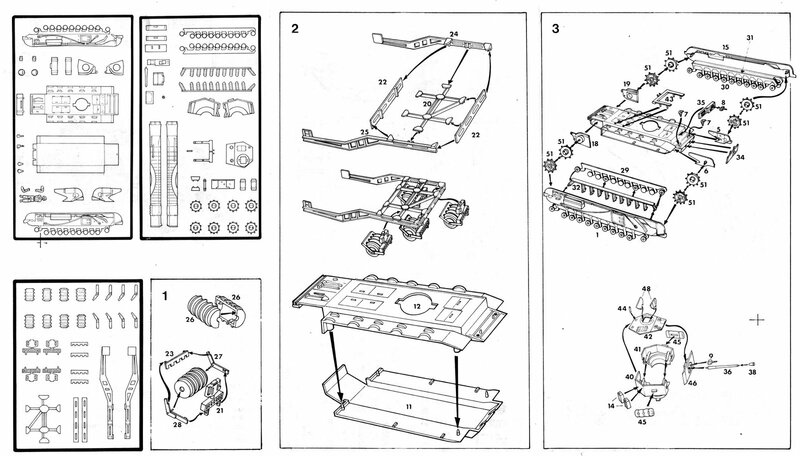 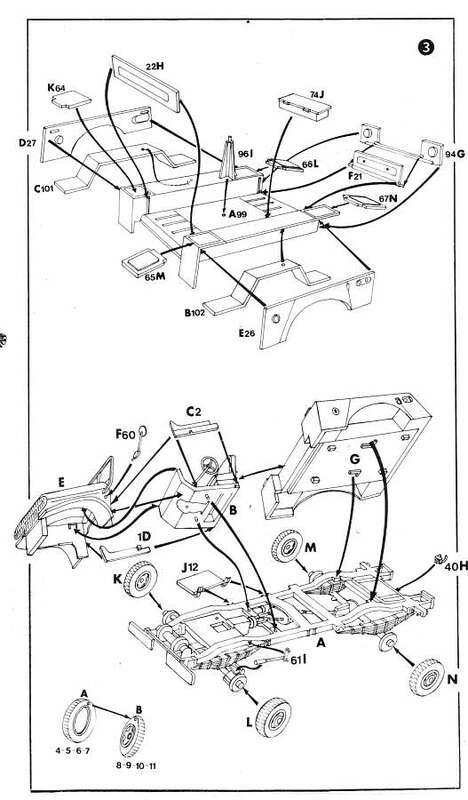 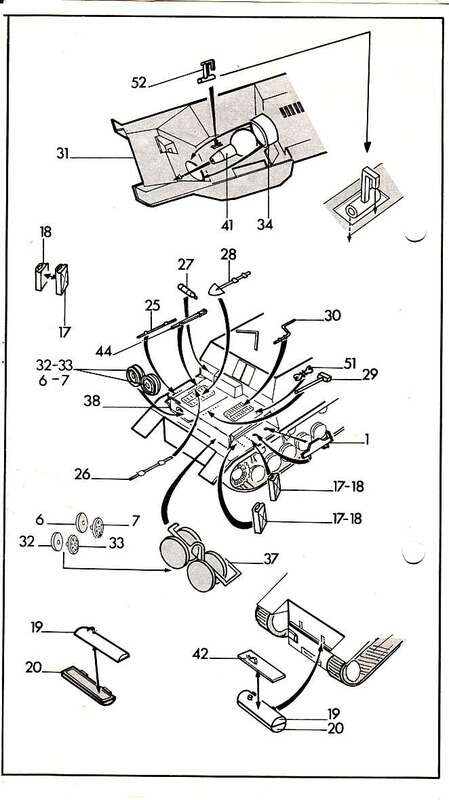 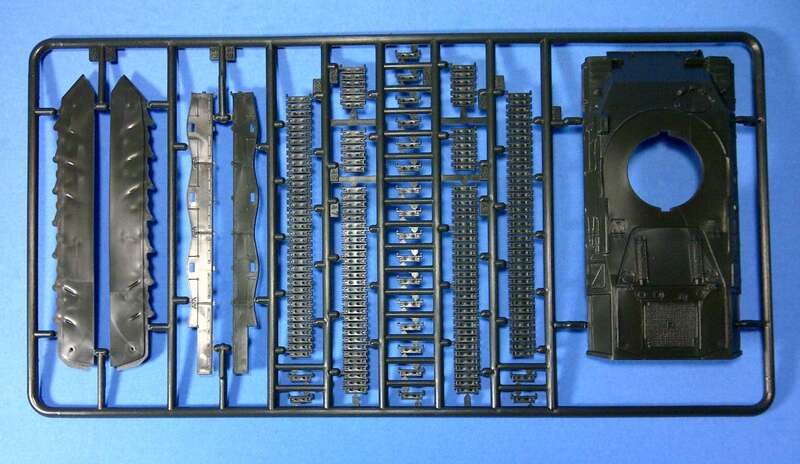 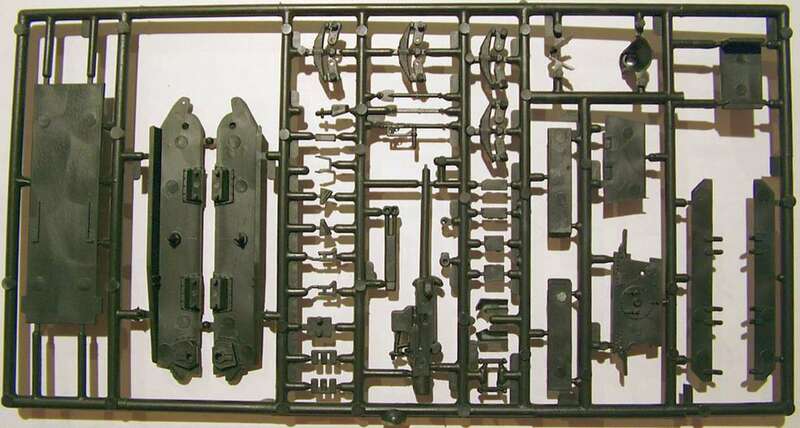 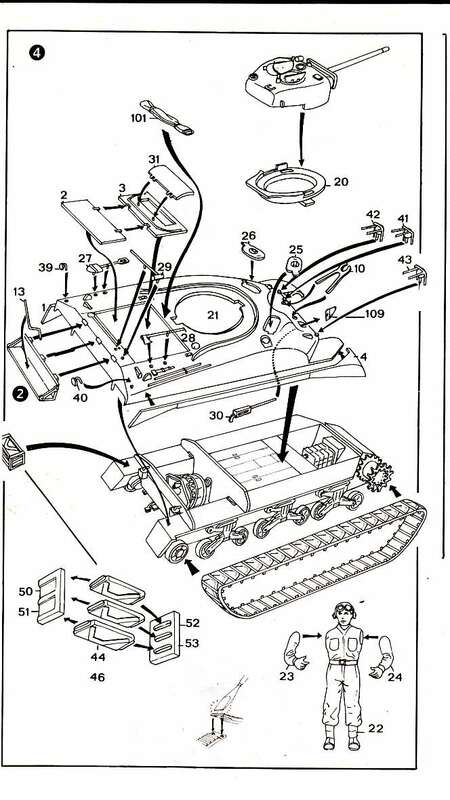 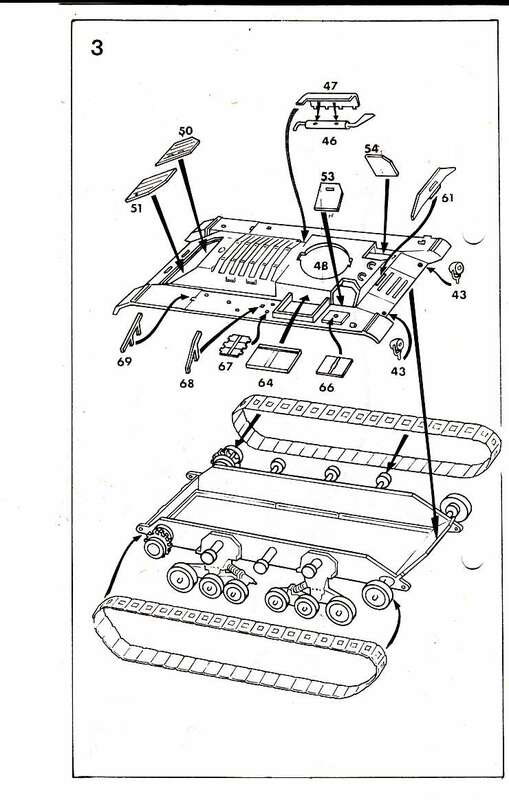 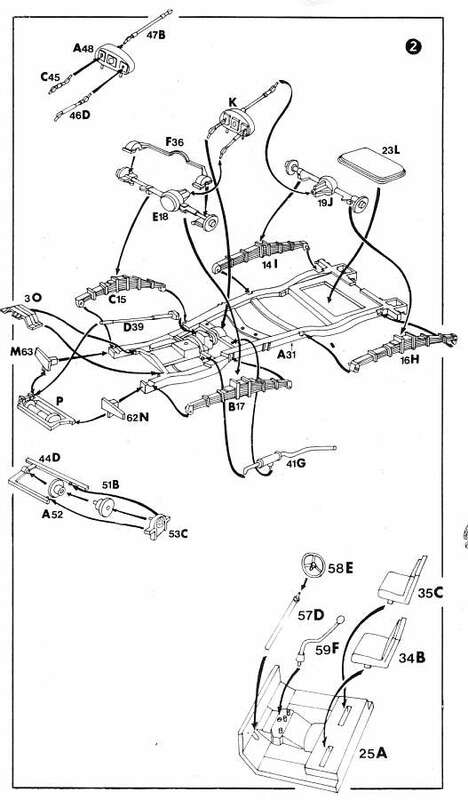 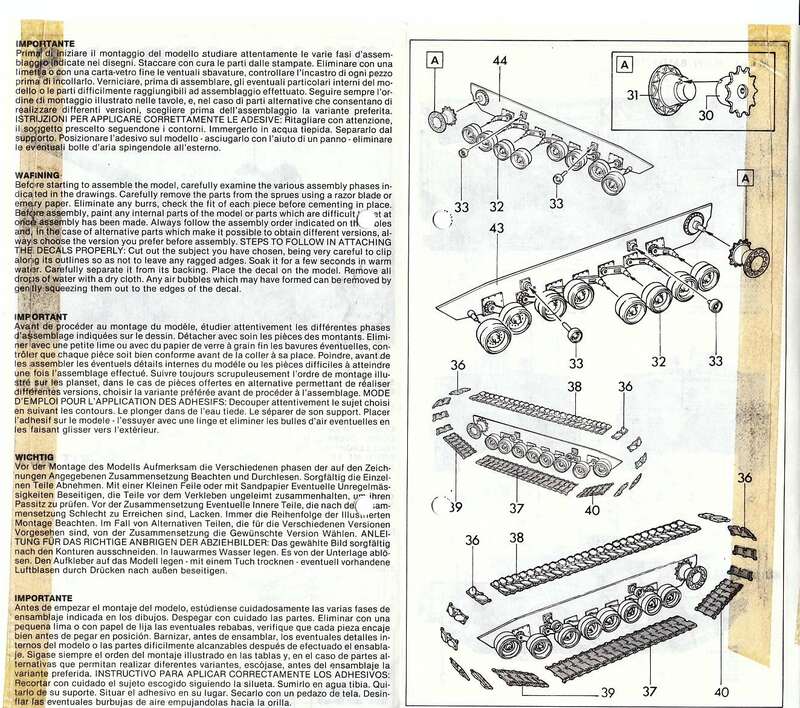 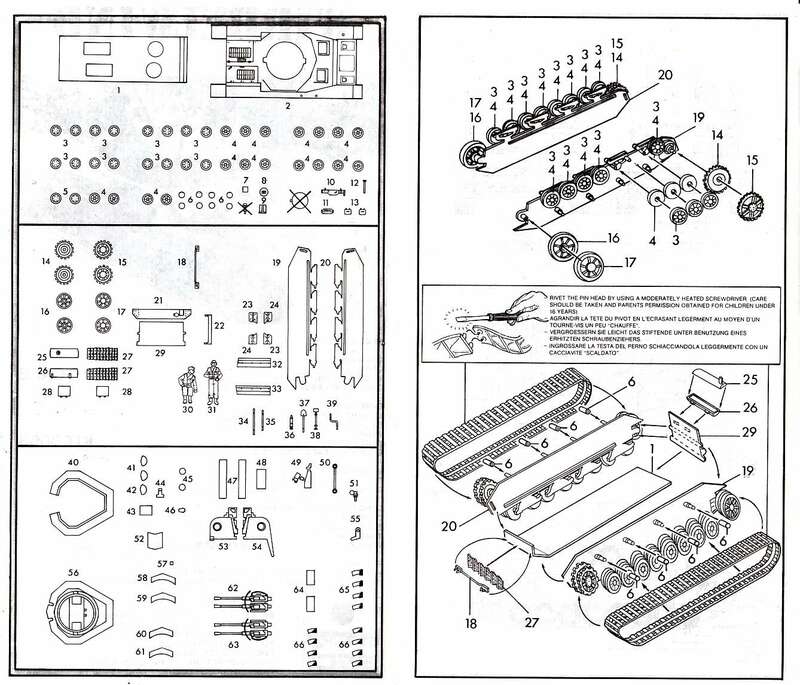 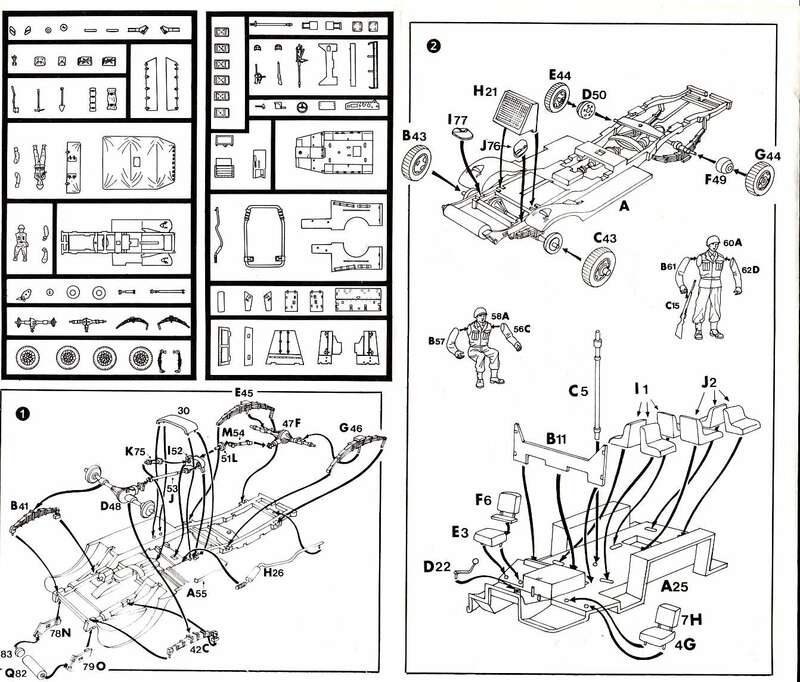 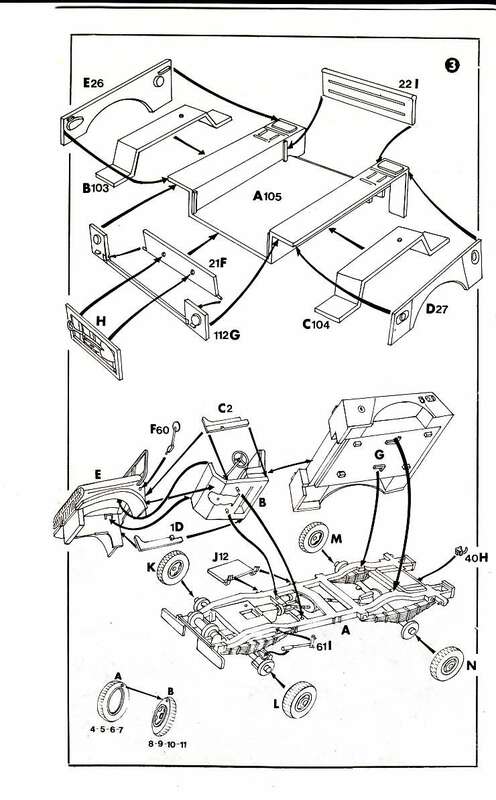 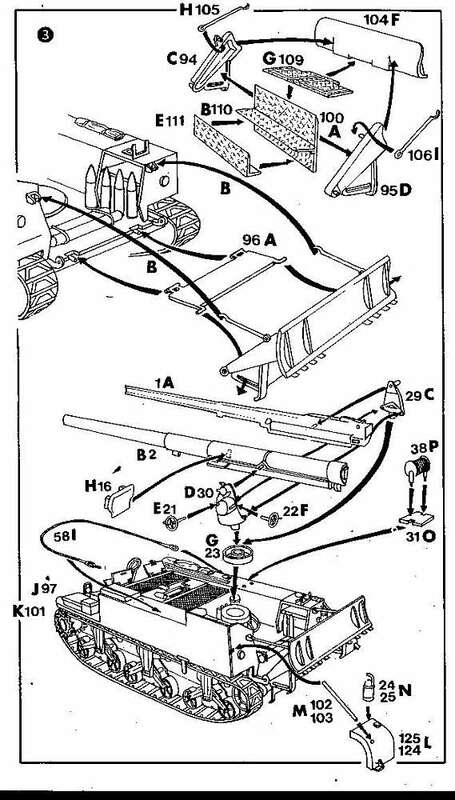 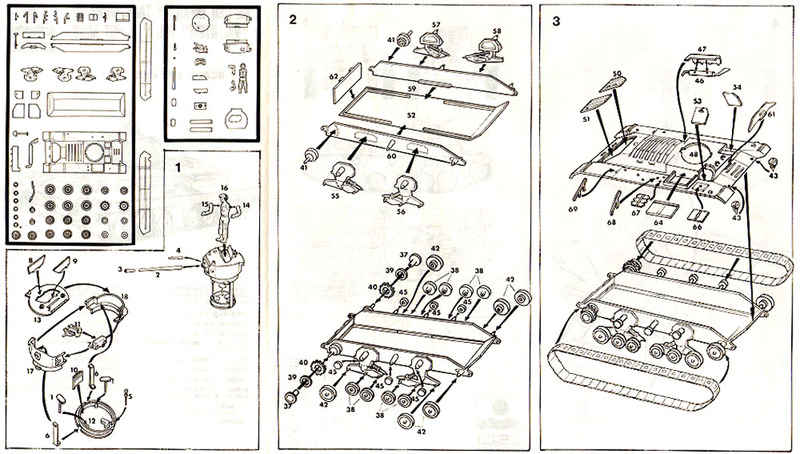 A new standard is set but the larger number of parts because of the tracks takes its toll. 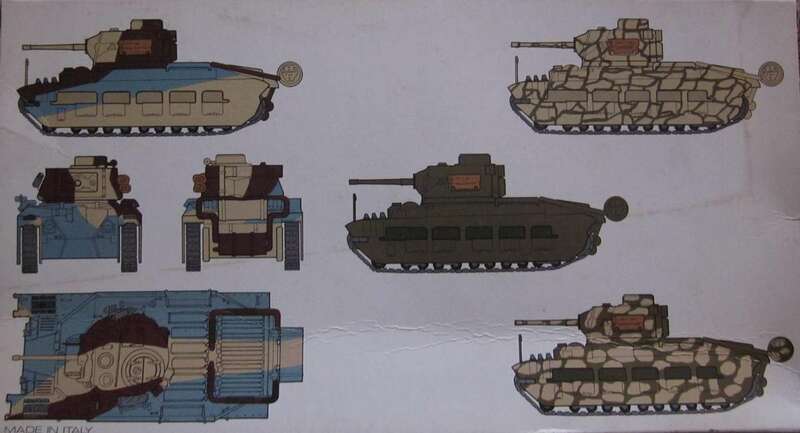 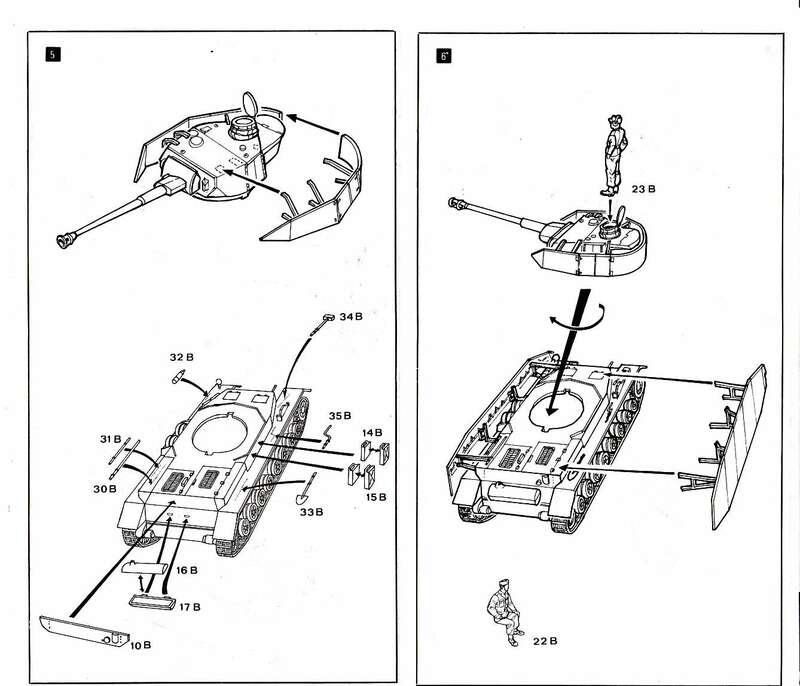 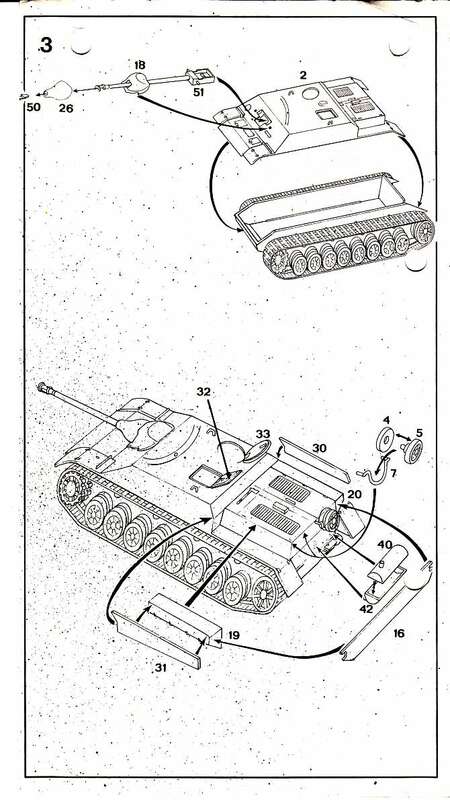 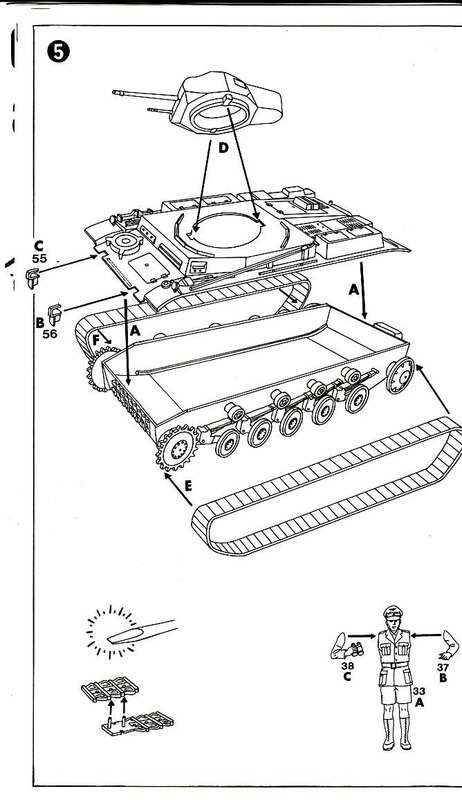 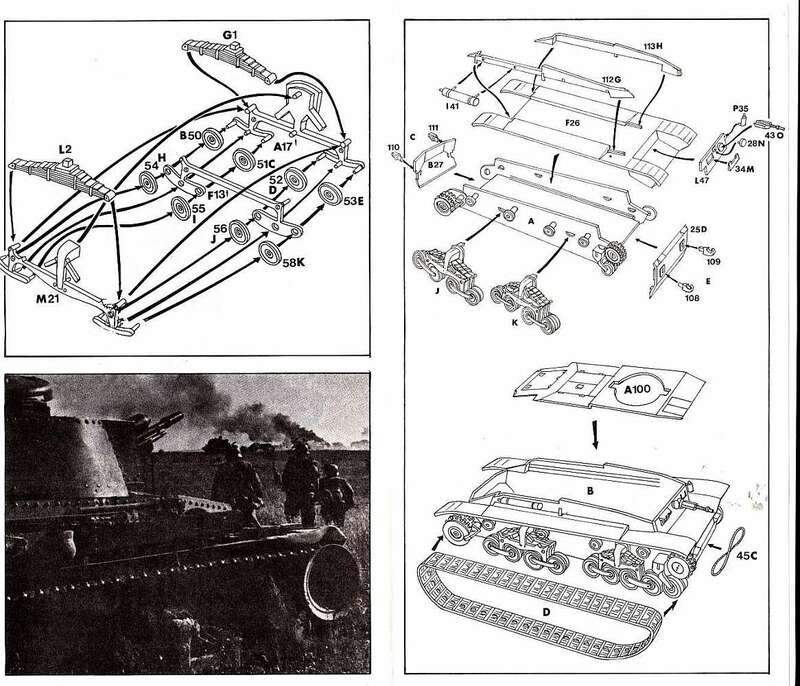 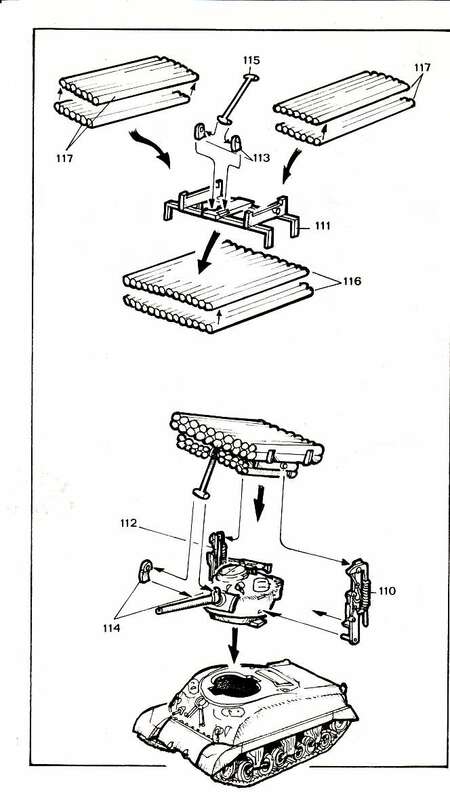 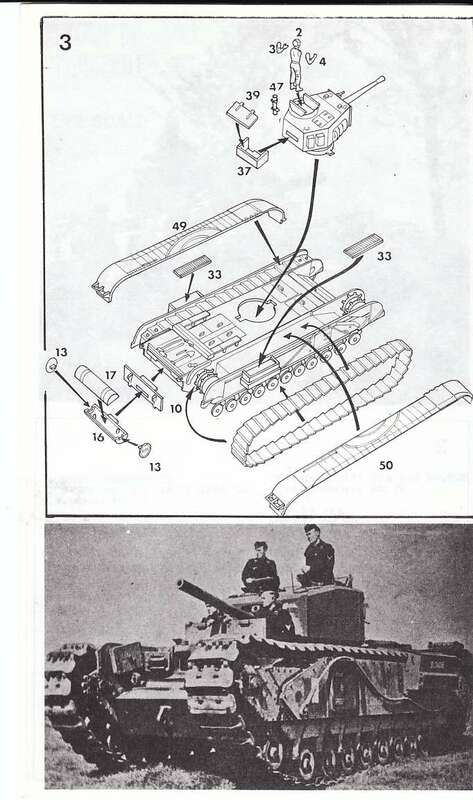 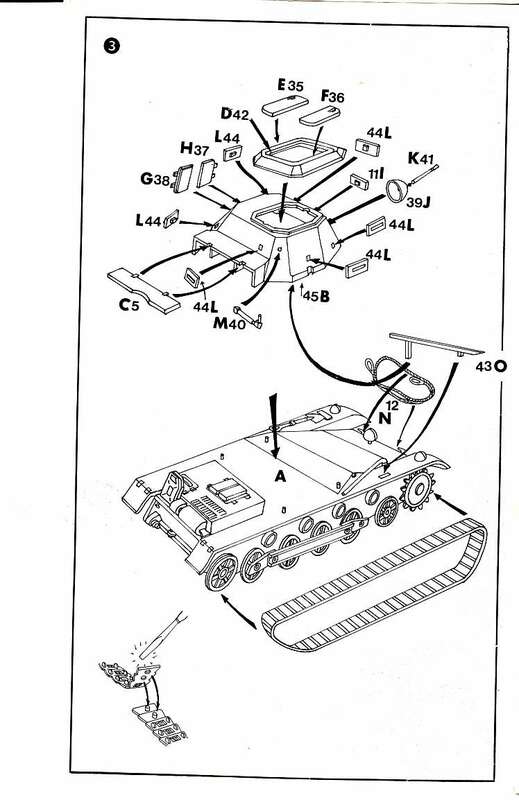 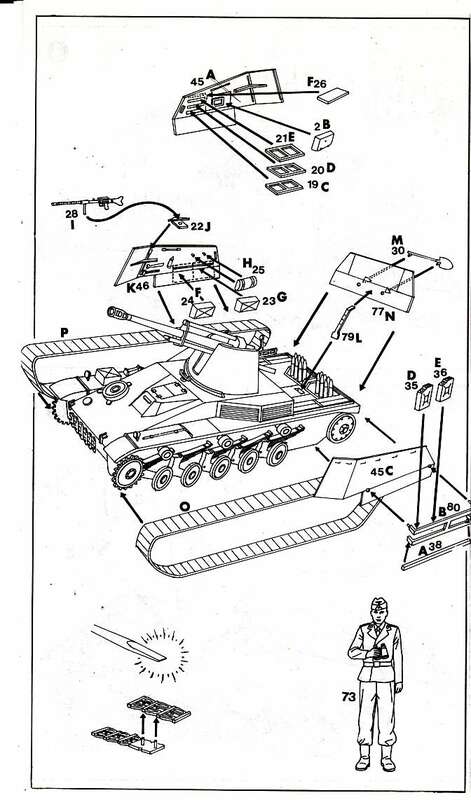 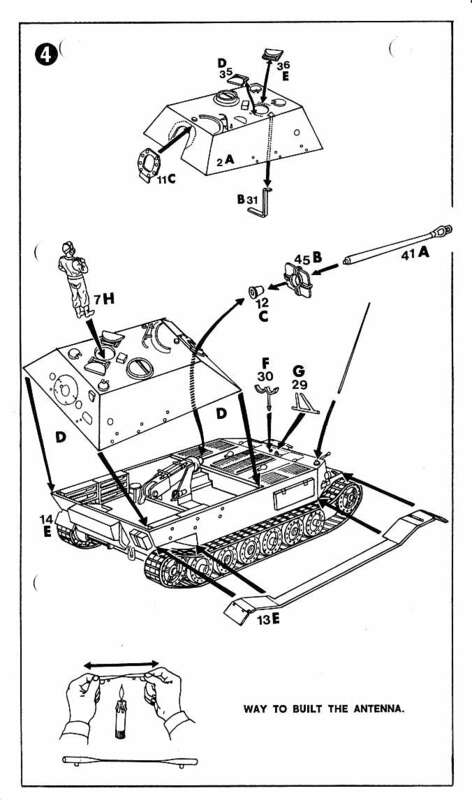 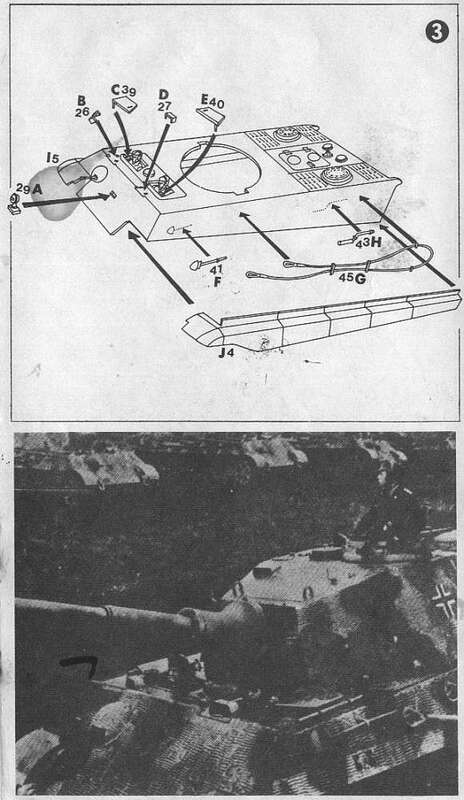 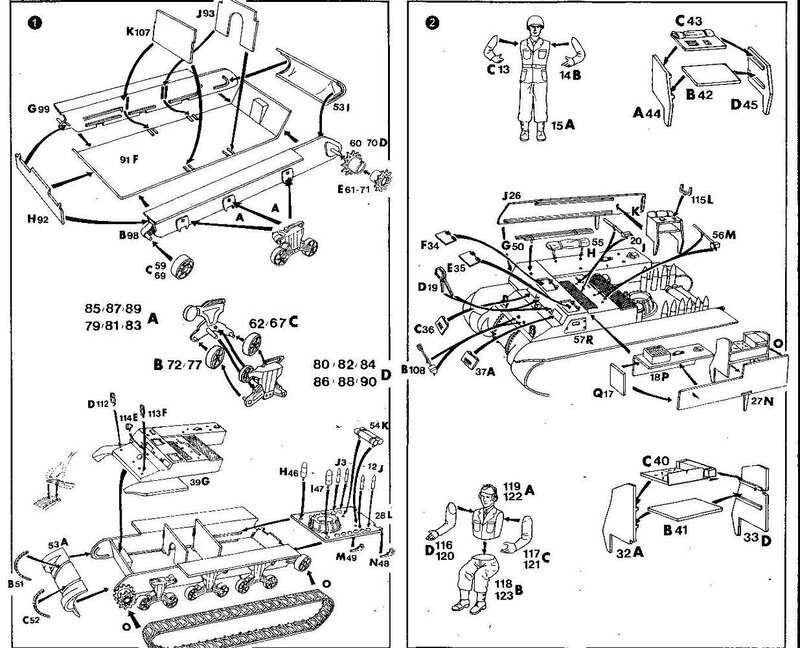 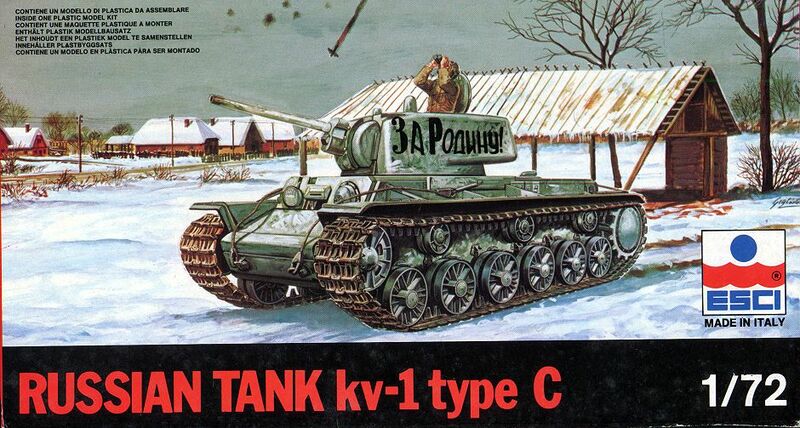 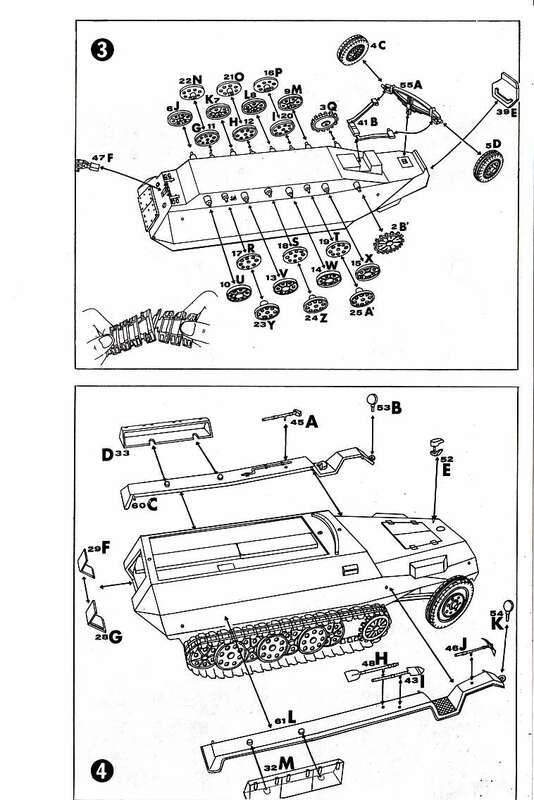 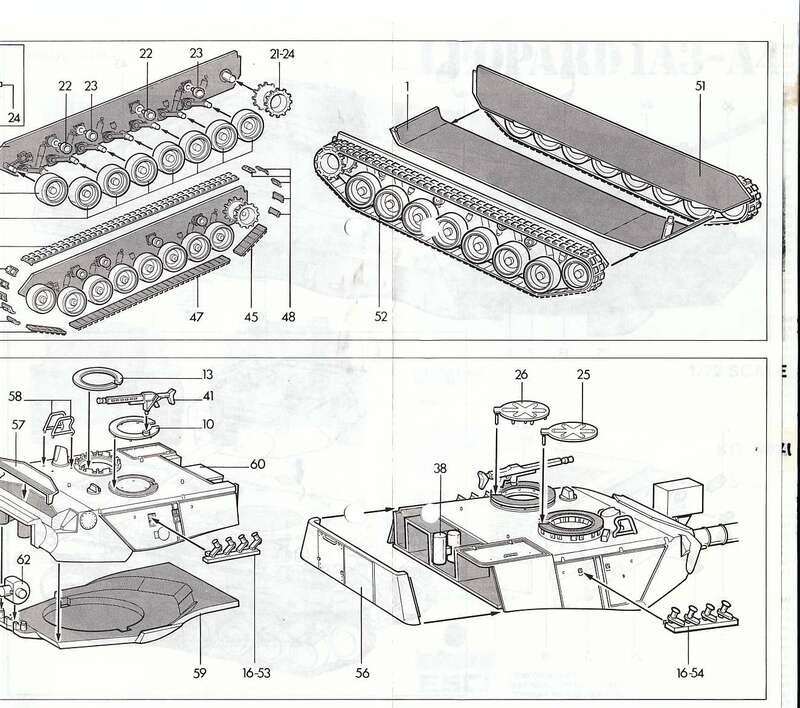 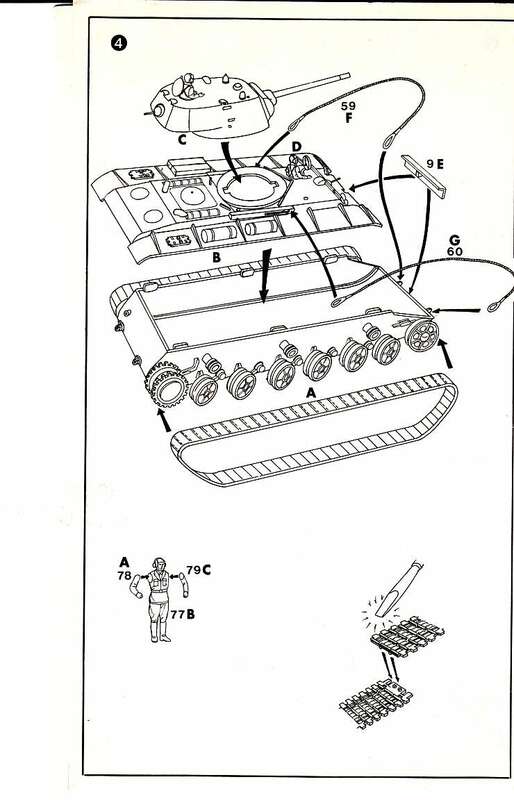 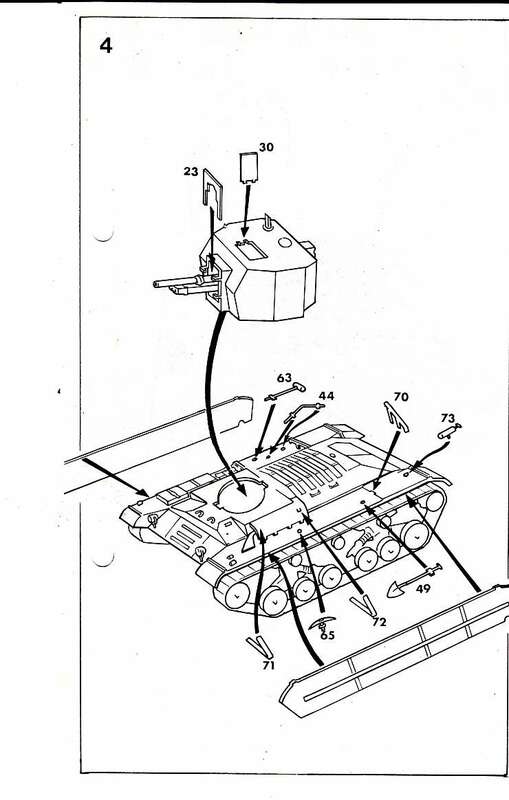 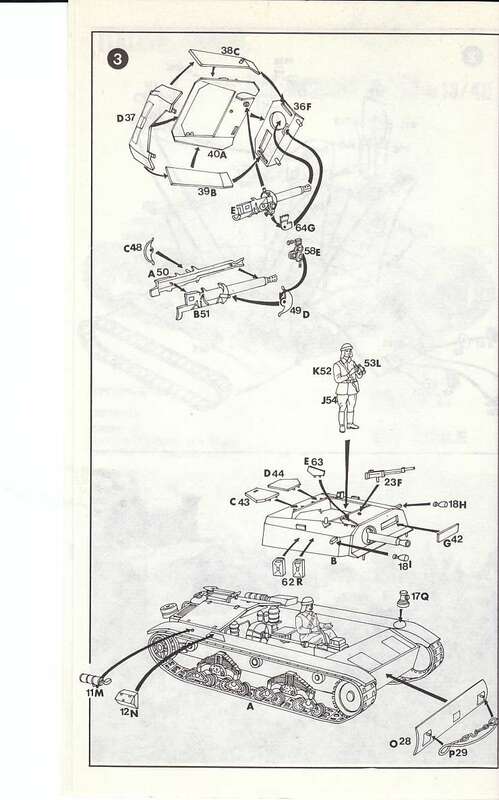 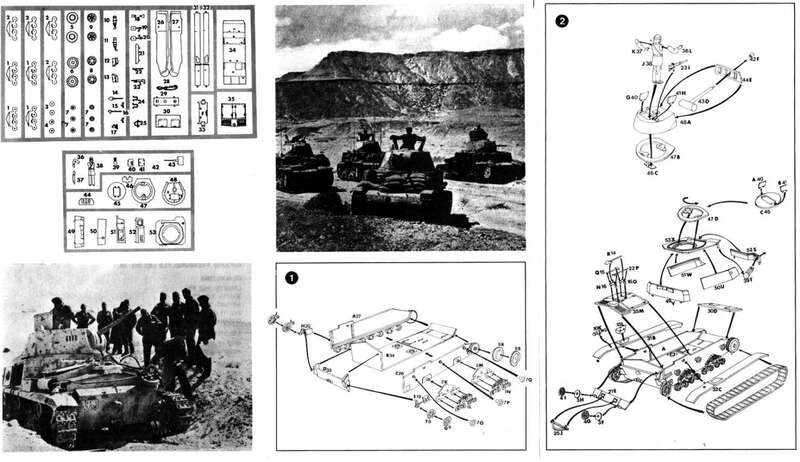 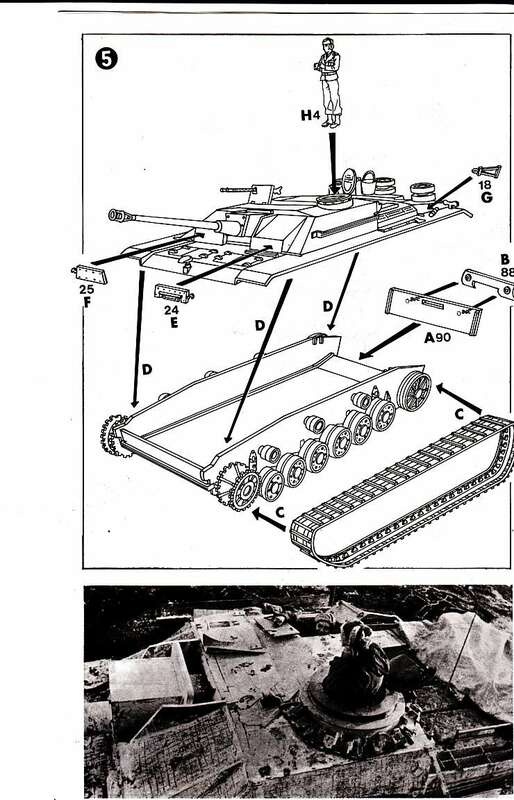 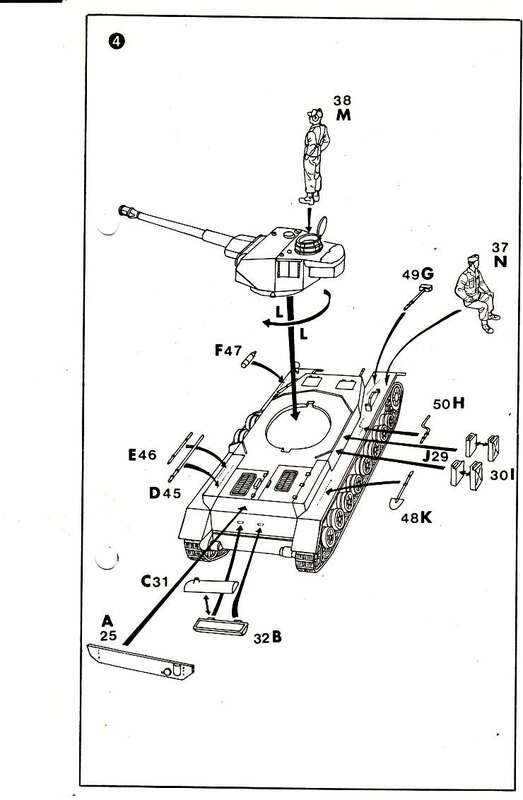 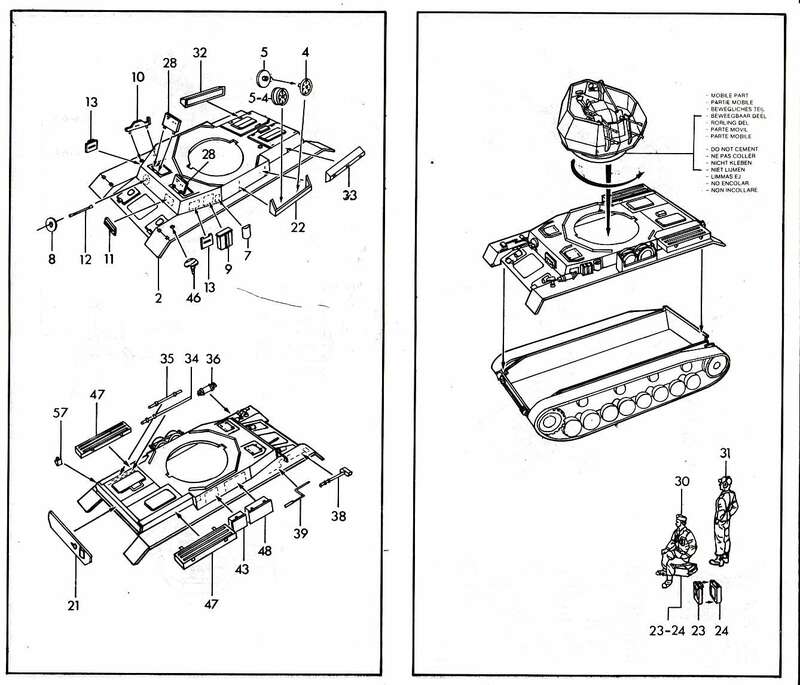 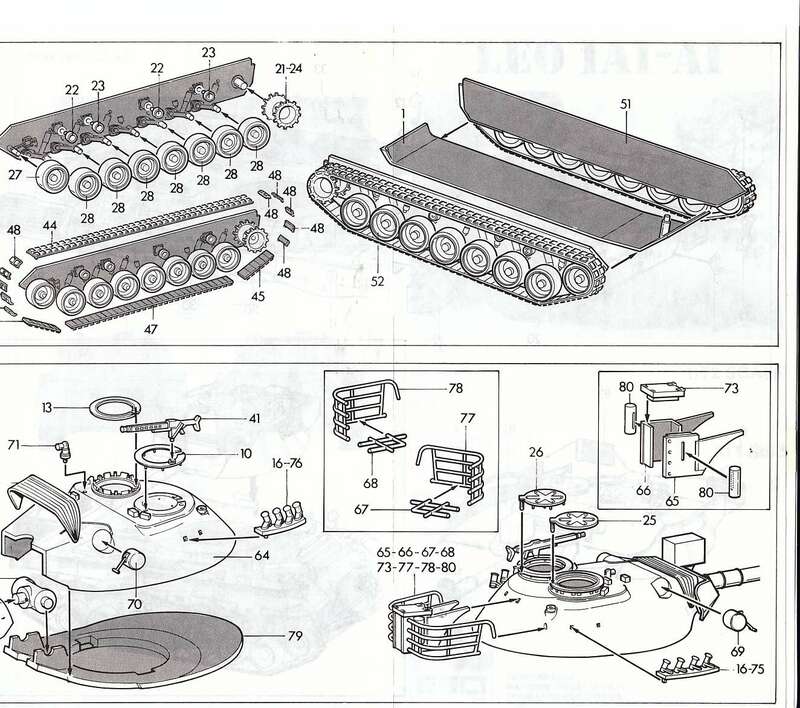 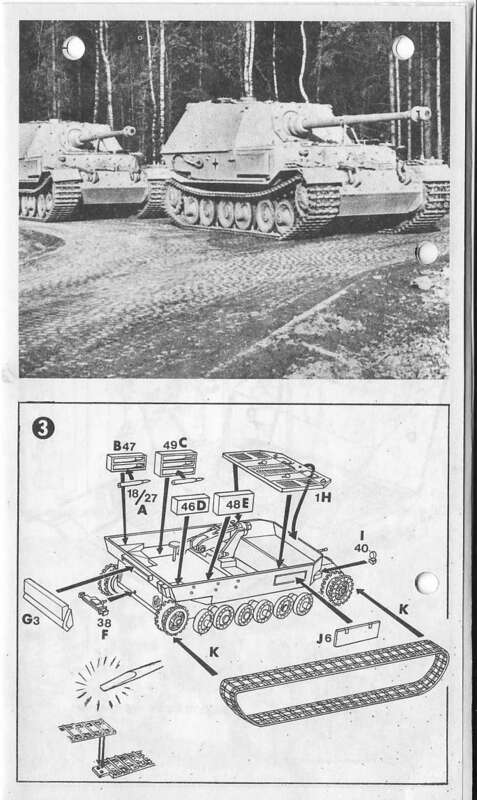 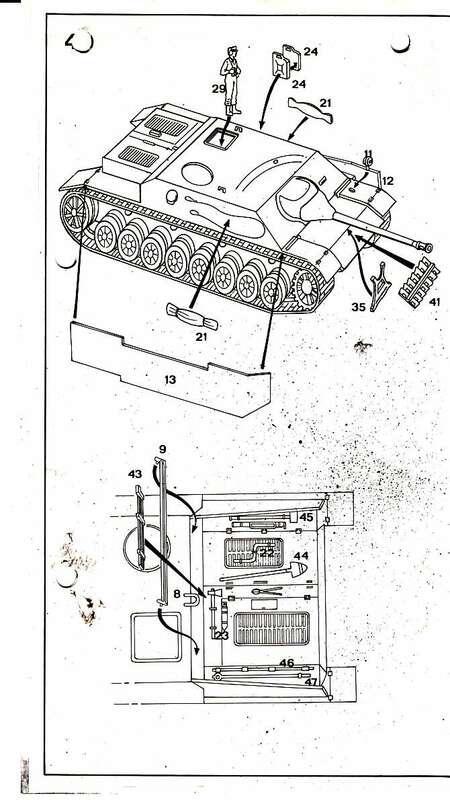 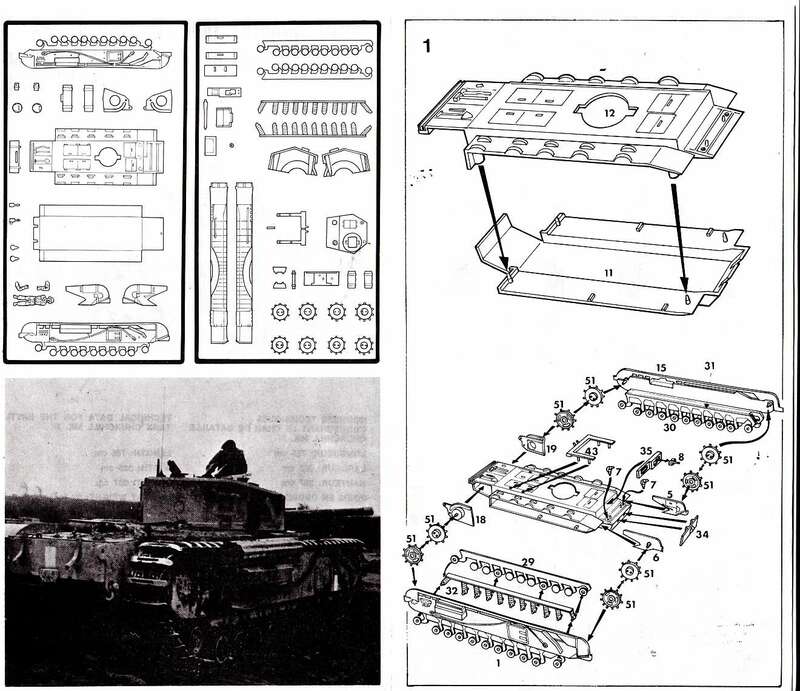 the boxes are still the same small, thin size and roadwheels of the tanks are made in one part, not split in two. 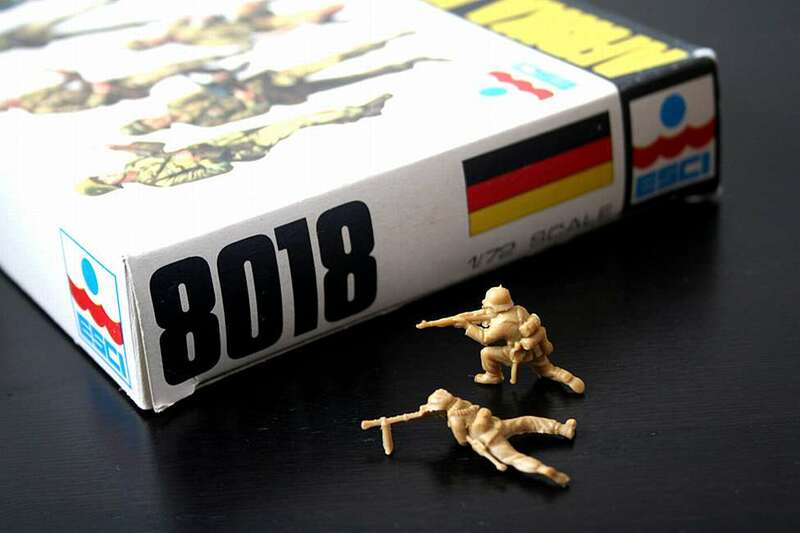 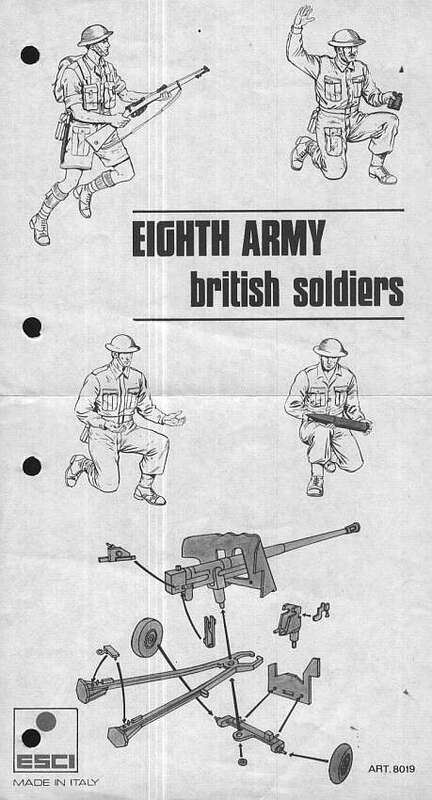 This will persist well into the nineties.... Kitnumbers 8069 to 8073 also have a slightly different boxart : the famous black-band kitname is dropped and on one side of the box nations flags are printed to show decal variation. 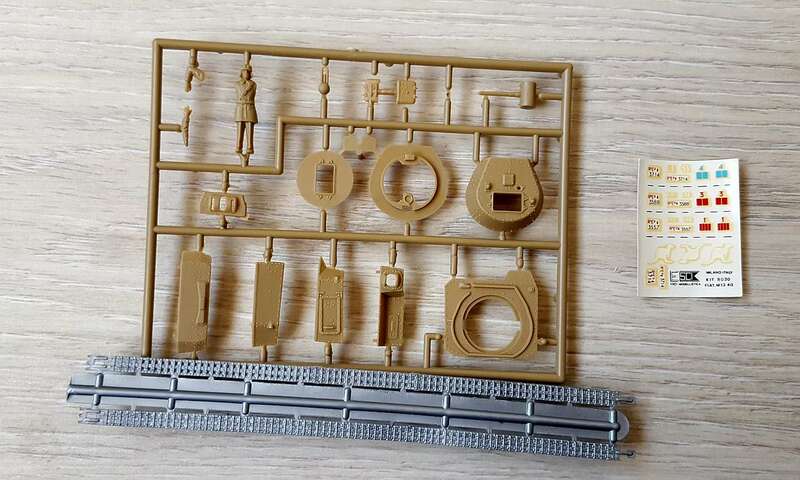 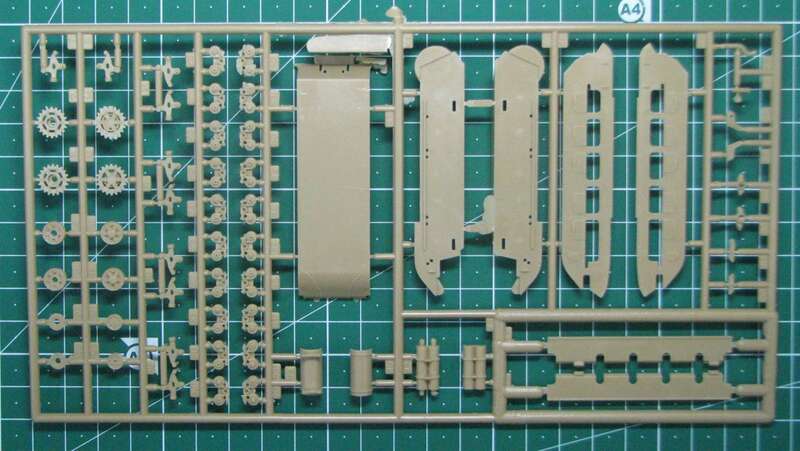 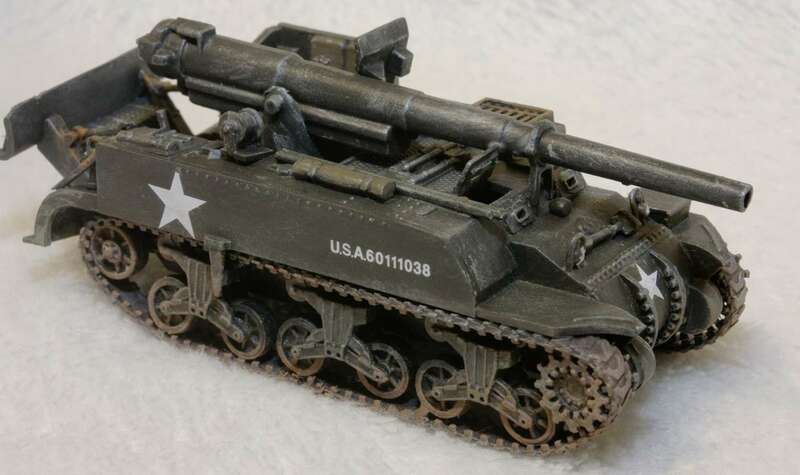 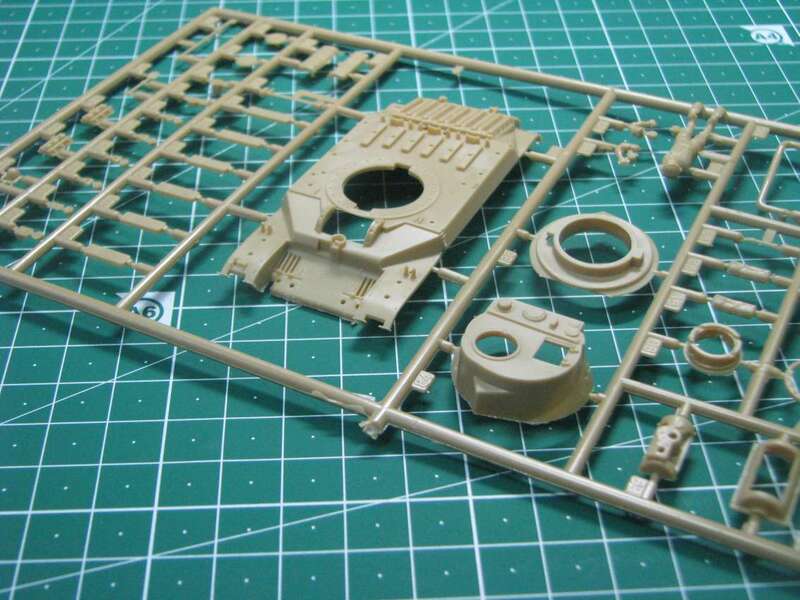 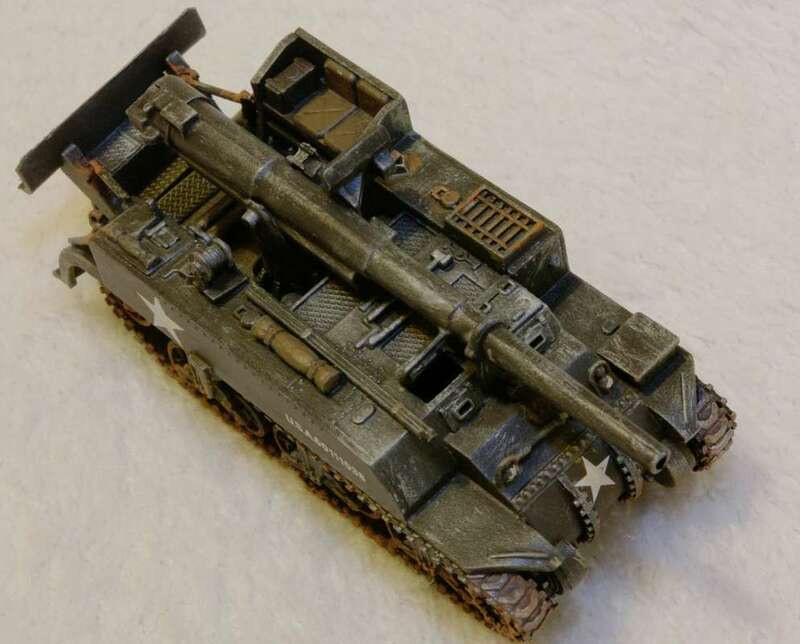 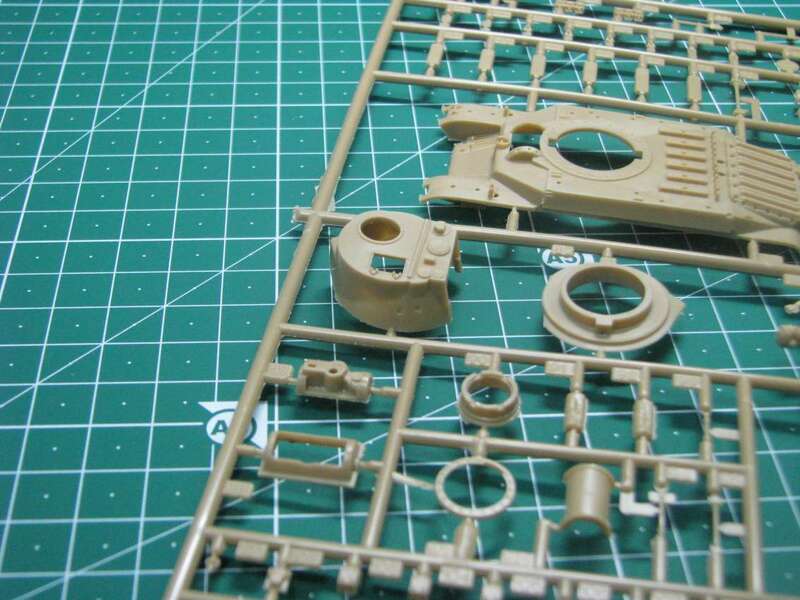 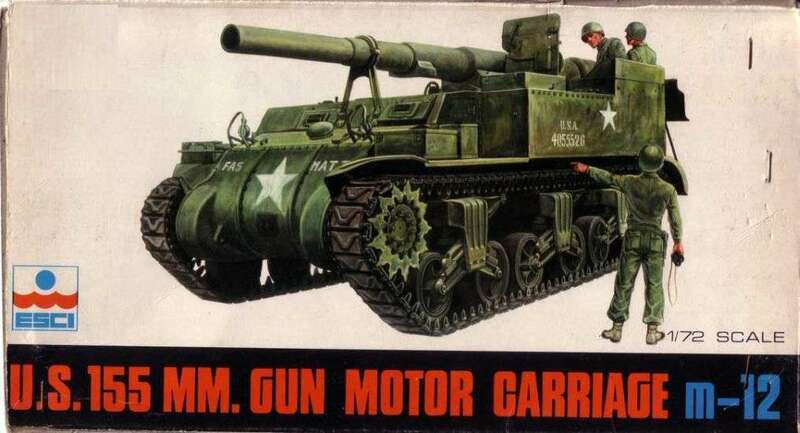 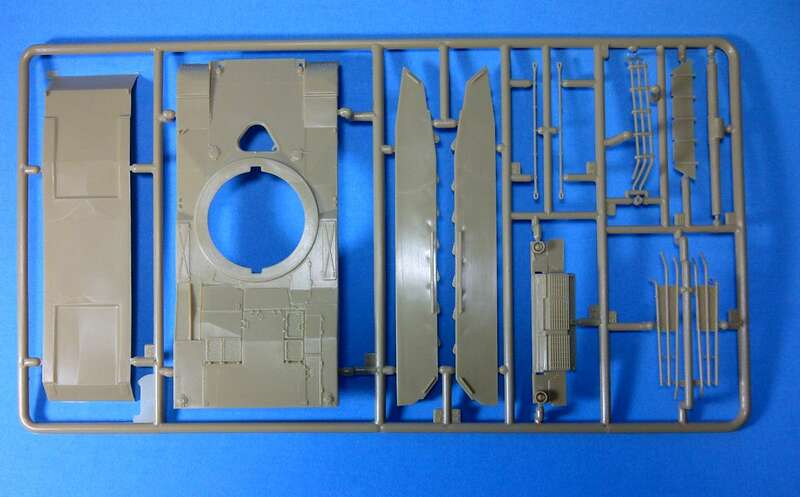 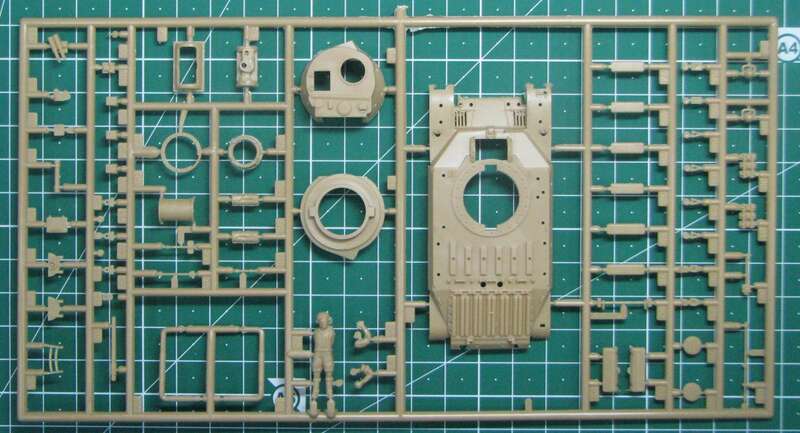 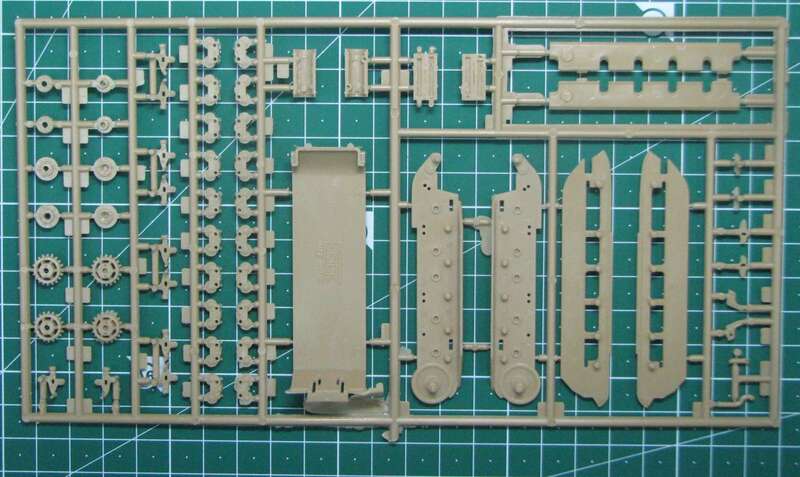 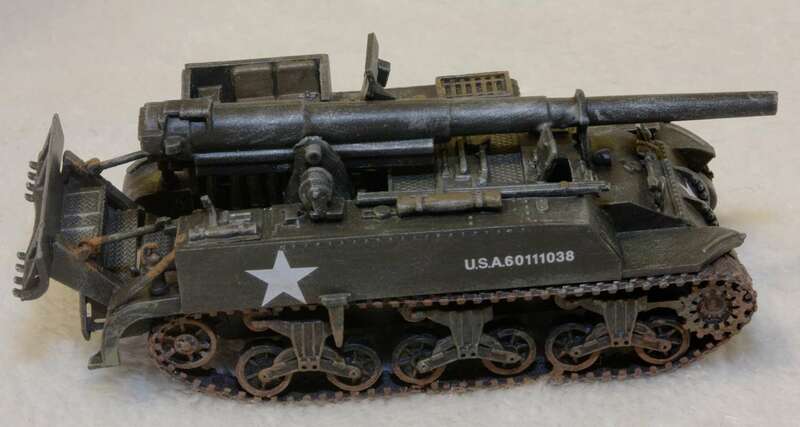 Kit 8059 - M4A1 Sherman "Galliope"
Kit 8073 - Leopard 1A1A with "extra-armour"